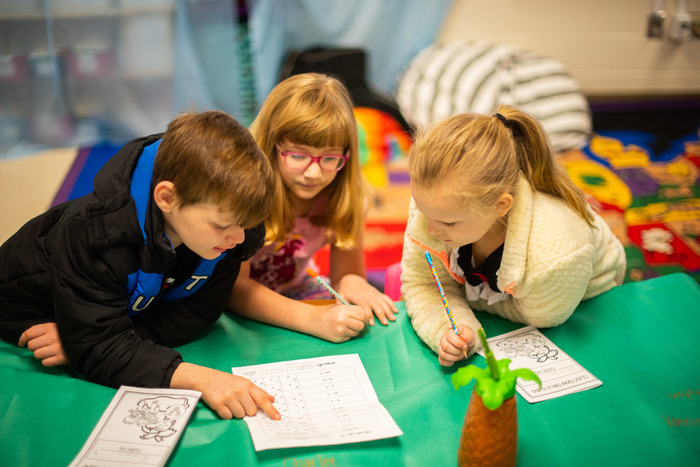 Anderson School District Three will be holding the employee/retiree preventive work site screening on June 7, 2019. 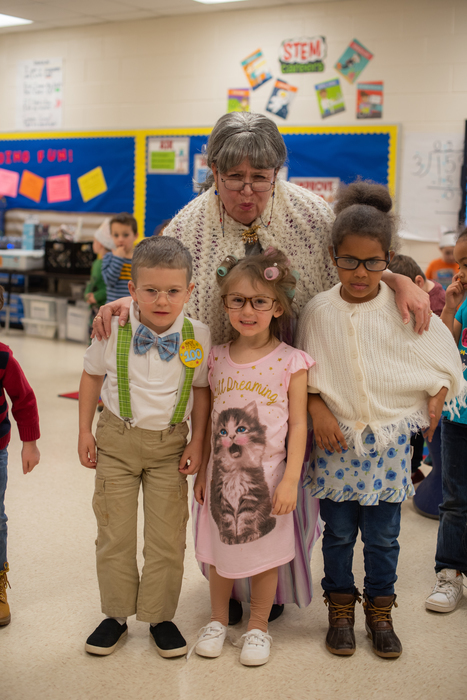 If you are an interested Anderson Three retiree please contact Mary Constantine at 348-6196 by May 10, 2019 to see if you are eligible to participate. Congrats to Rayanna Cape and Sydney Broadwell, recipients of the Corey White Diversity Award! 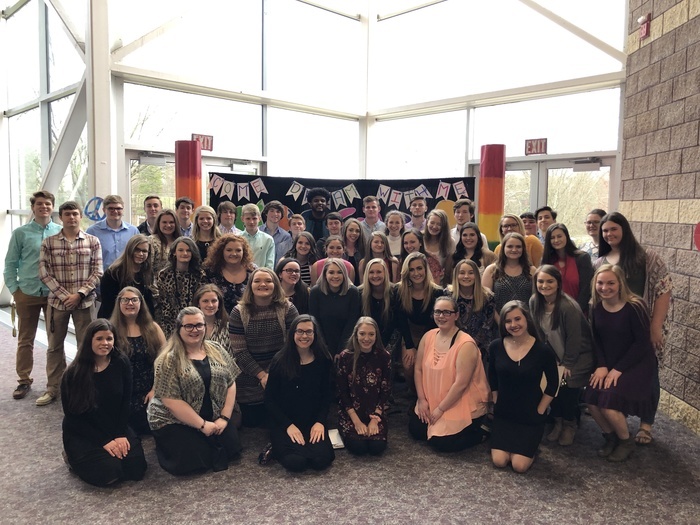 These students are great examples of leadership and life choices that exemplify advocacy for diversity and acceptance among all people of Anderson County. No School for April 22nd! 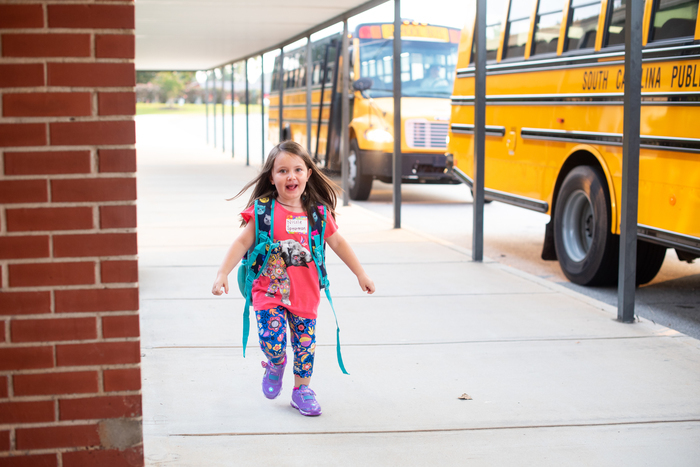 Students will return on a normal schedule on Tuesday, April 23rd. We hope you had a restful and enjoyable Spring Break! 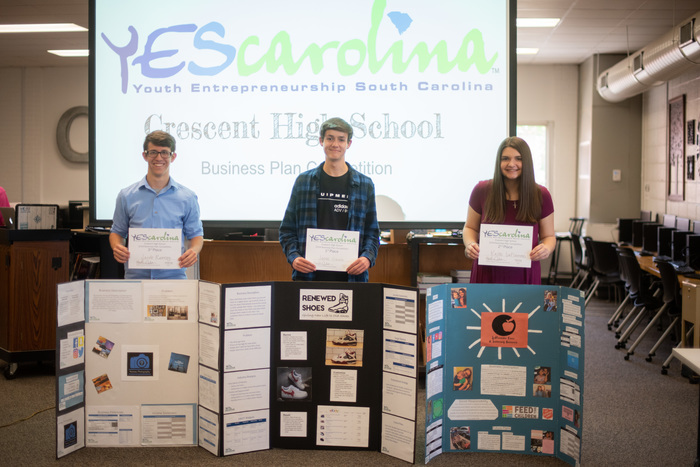 Entrepreneurship students at CHS competed in the Yes Carolina School Business Plan Competition. 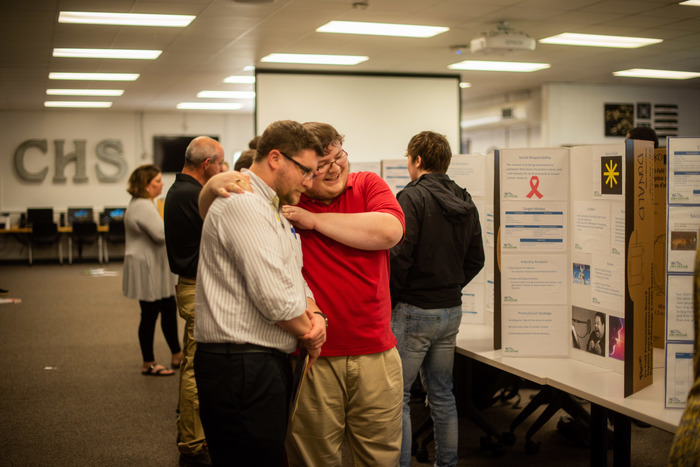 Students created business models and were judged by local entrepreneurs and professionals. 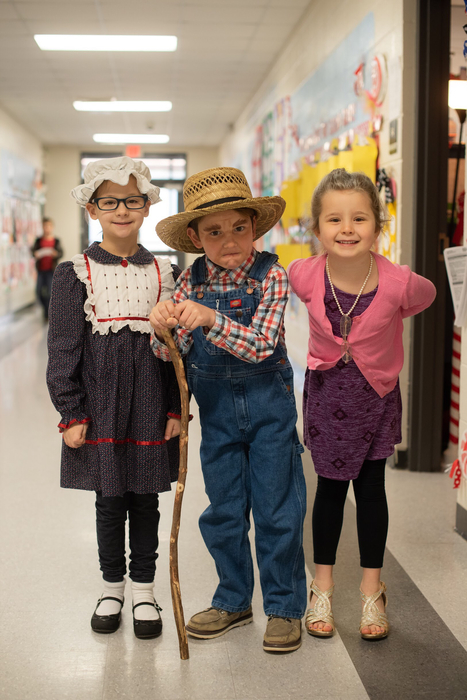 1st Place went to Jesse Sauve with Renewed Shoes, 2nd Place went to Kalee LaFlamme with LaFlamme Care & Tutoring Services, and 3rd Place went to Jacob Ramsey with Ramsey Photography. 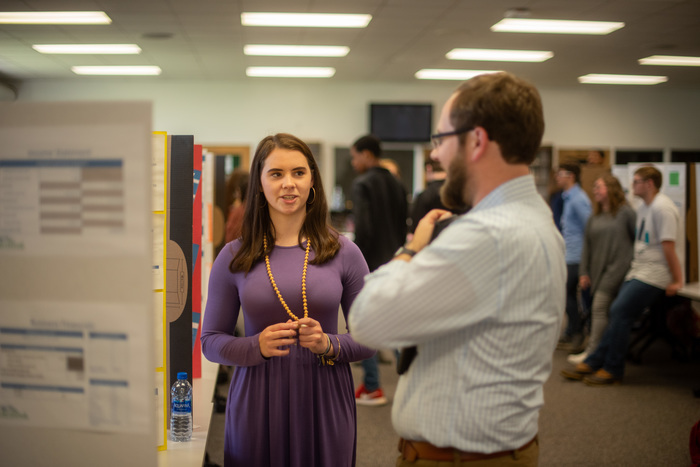 1st and 2nd Place winners will attend Charleston for the Yes Carolina State Business Plan Competition in May! 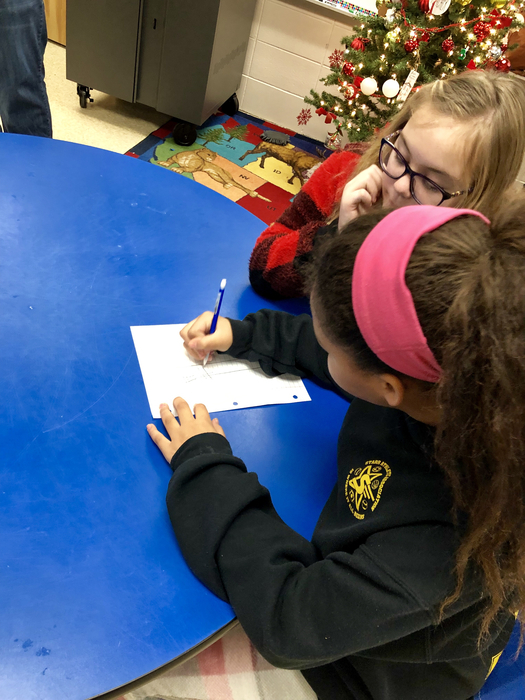 3rd Graders at Flat Rock use their math skills to complete challenges in order to break out of an escape room! 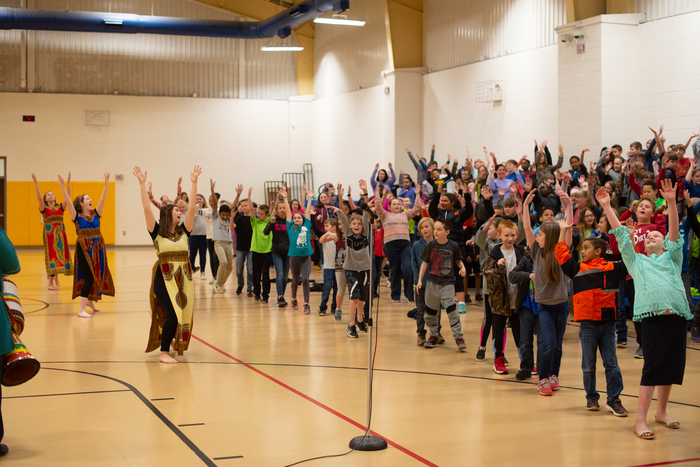 The Western African Drum and Dance Group from Anderson University performed for Flat Rock today. Students learned some rhythms and a few dance moves! Tiger Nation..... 2019 REGION I-AAA CHAMPIONS! 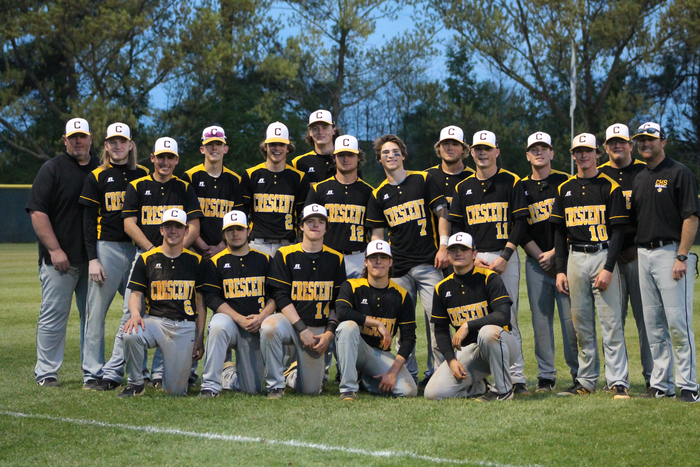 Way to go, Tiger Baseball! CONGRATS! SO PROUD of our players and coaches! Keep working and keep winning! 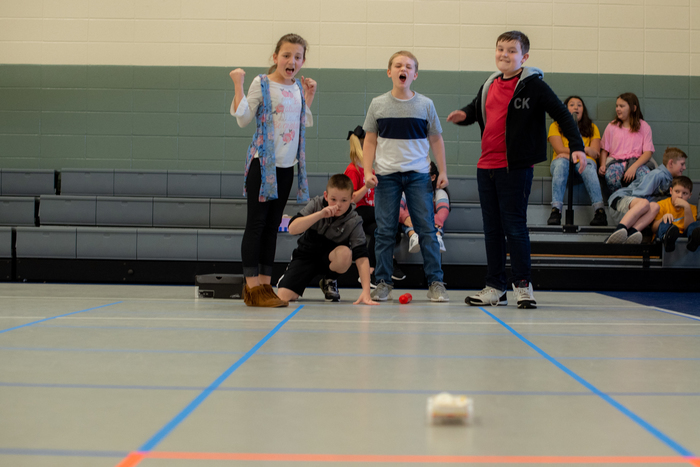 Iva and Flat Rock had a great time at today’s Area 14 Games! 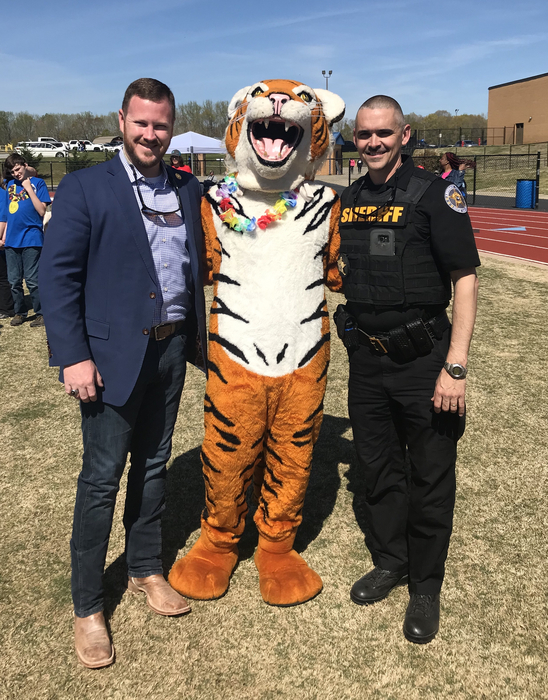 Flat Rock even got a photo with Anderson County Sheriff, Chad McBride, and Major, Bill Vaughn! 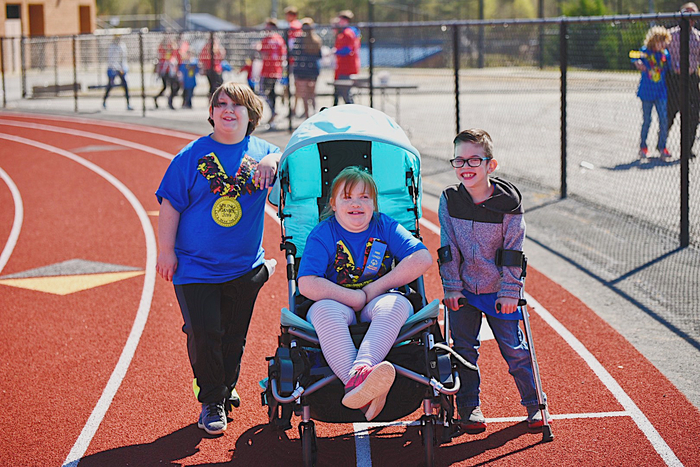 GREAT to see our Anderson 3 students here at the Area 14 Spring Games this morning! Over 800 athletes in attendance here today at BHP! SIMS takes first place in the spirit competition at today’s Area 14 Games! They also won the penny war out of all the schools with a total of $1,000! 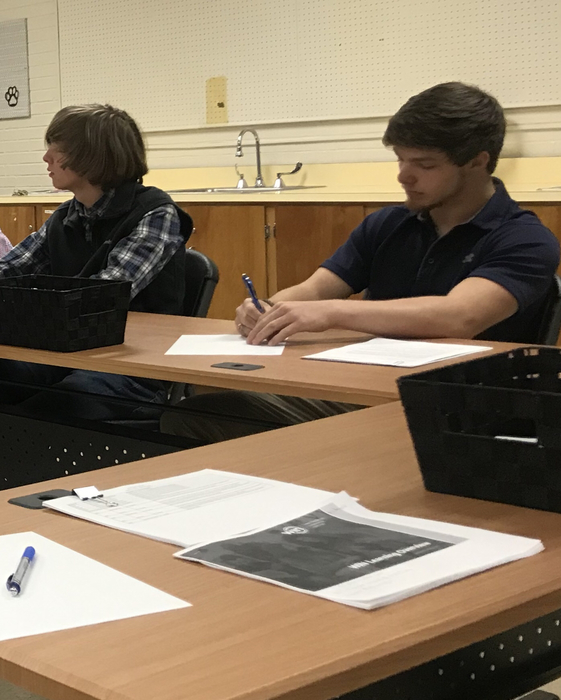 Mrs. Dana Grant, from AIT works with CHS students on the Michelin Apprenticeship application. 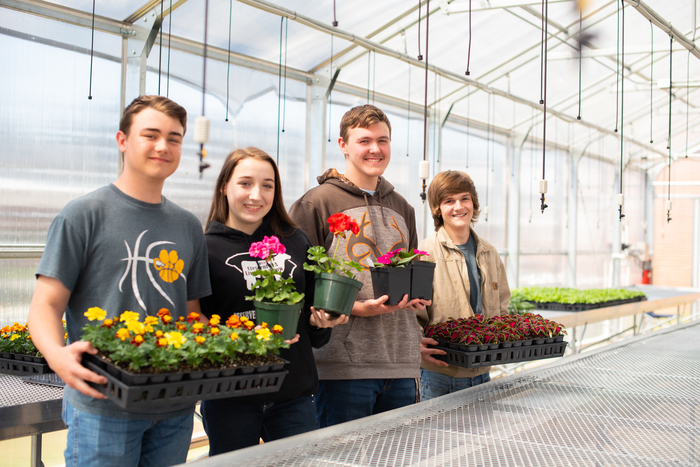 We are proud to promote the Crescent FFA Plant Sale, a staple of the FFA Program. The sale will happen April 2nd through 4th 9am to 3pm, April 5th from 3:30 to 6pm and April 6th from 9am to 1pm! 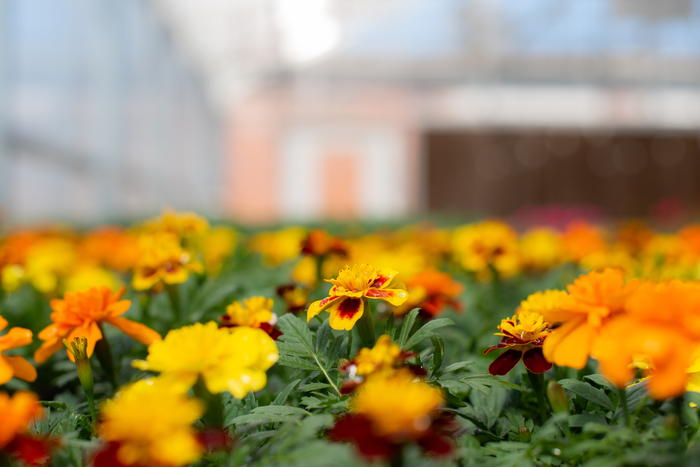 They have Geraniums, Marigolds, Petunias, Tomato Plants, and many more items! 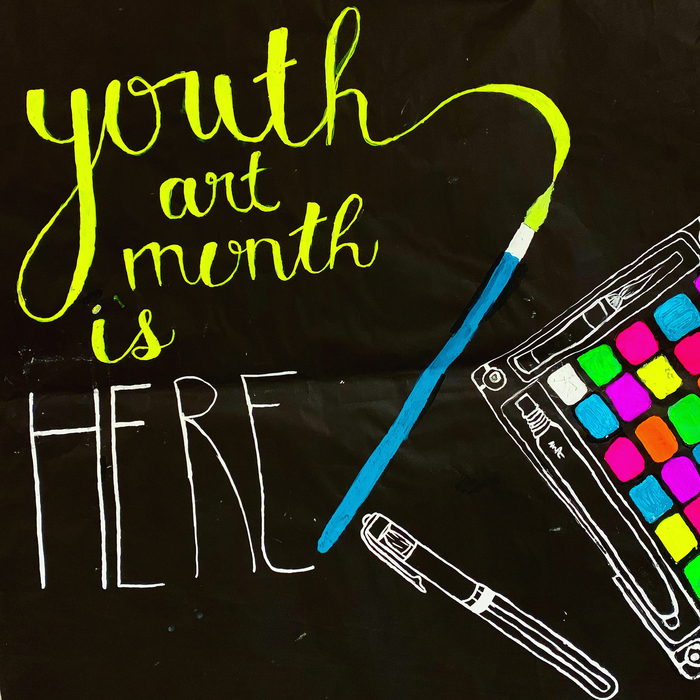 For Youth Art Month (YAM) we were able to show off some amazing artwork! 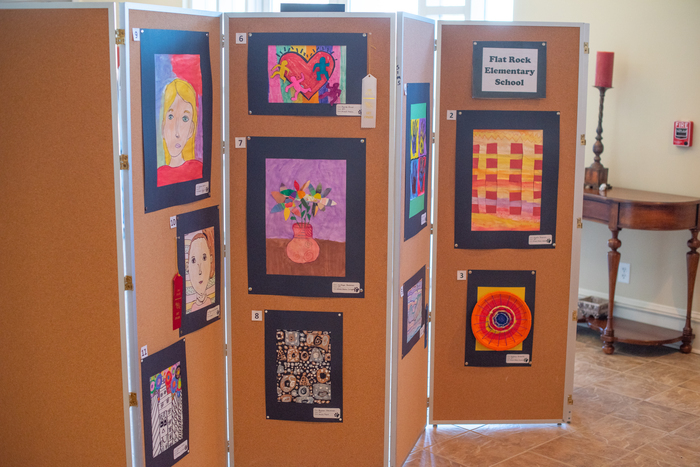 For a look at all of the the pieces up close, visit bit.ly/A3ArtShowcase for more images! What a difference two years makes! 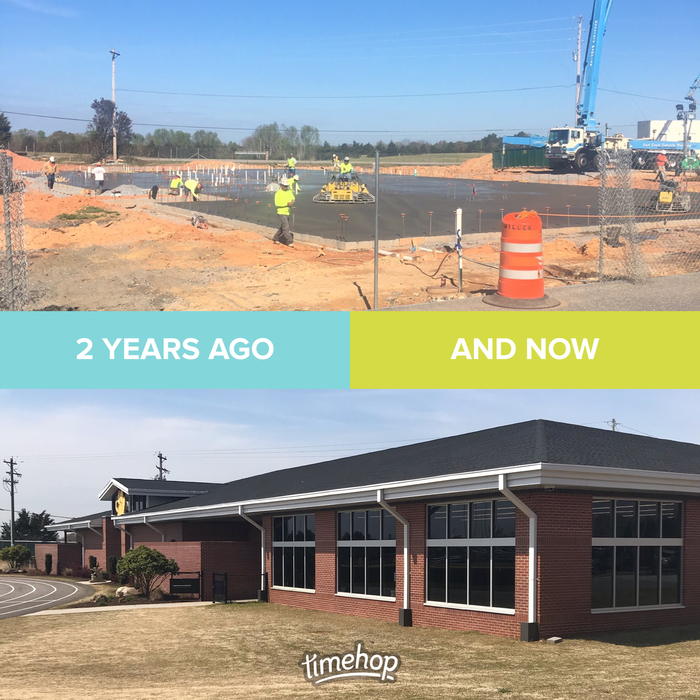 From two years ago to today and our Athletic Field House and Weight Room at Crescent! 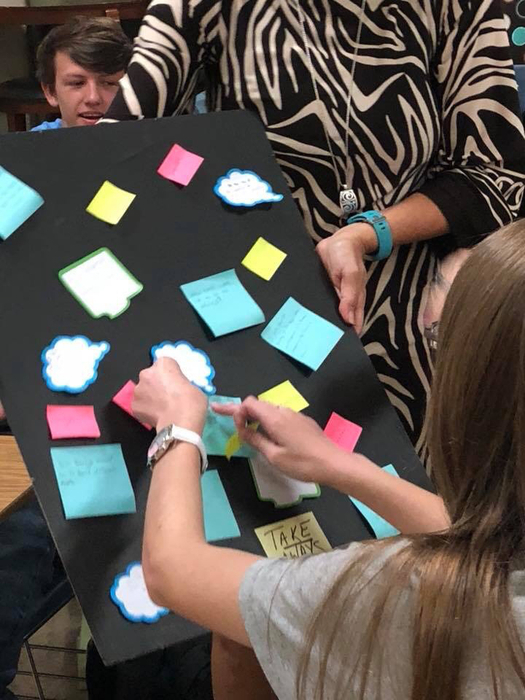 So thankful and appreciative for the initiatives to benefit our students in Anderson 3.....making a positive impact every day! It’s another important region HOME Friday night for Crescent Tiger Baseball and Softball! Crescent Softball hosts Powdersville at 6, and Tiger Baseball squares off against Pendleton at 6:30 tonight. Come out and support our Tiger teams at HOME this evening! CONGRATS to the Crescent Boys Track team.... victorious over West-Oak on Thursday night! CRESCENT VARSITY BOYS SOCCER!!! Picks up their 4th straight win tonight with another region win in penalty kicks over Pendleton! Tiger Proud of Crescent Soccer! 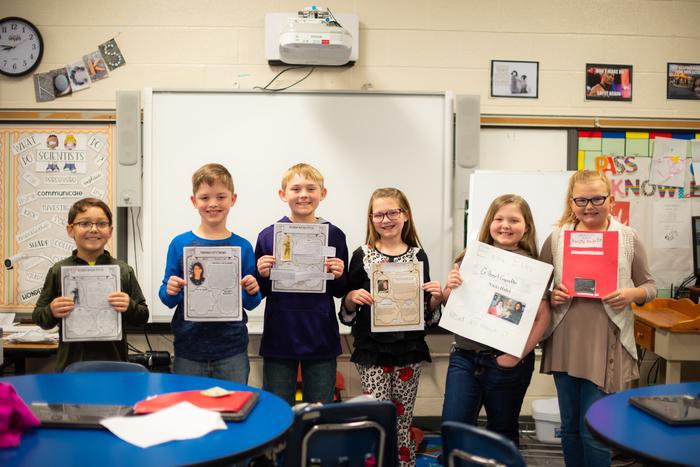 To celebrate Women's History Month, 3rd Graders at Starr Elementary researched influential South Carolina women using their Chromebooks! The presentations noted the numerous women who have made great impacts in not only SC but across the world. 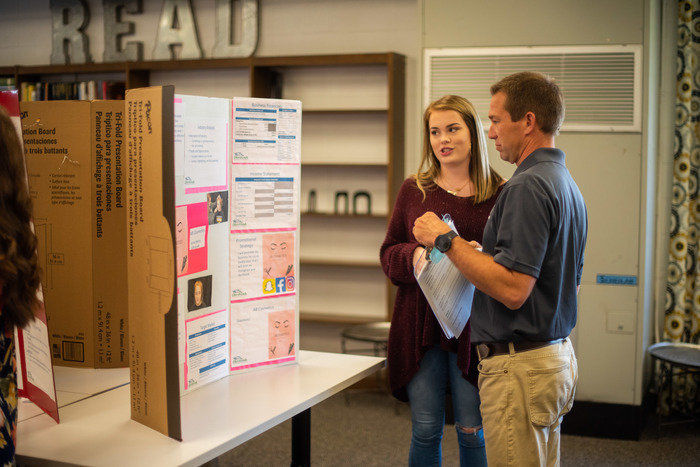 Saturday, the SIMS FFA Tool ID Team traveled to Lexington Technology Center for the SC state competition. 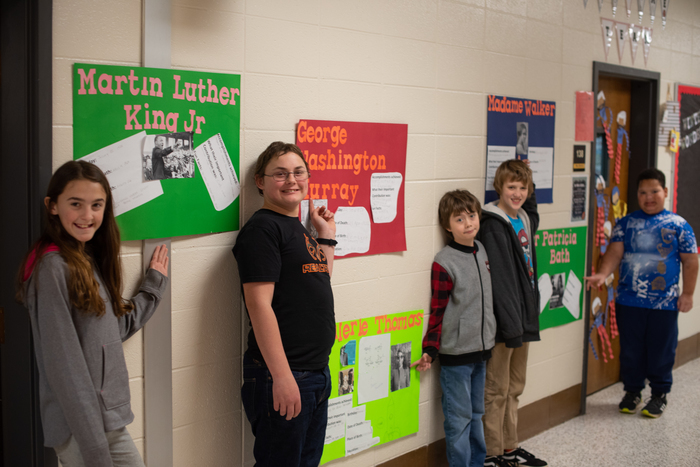 The team consisted of Jaxson Blanton, Brent Erwin, Karlie Whitaker, and Levi Bouknight. 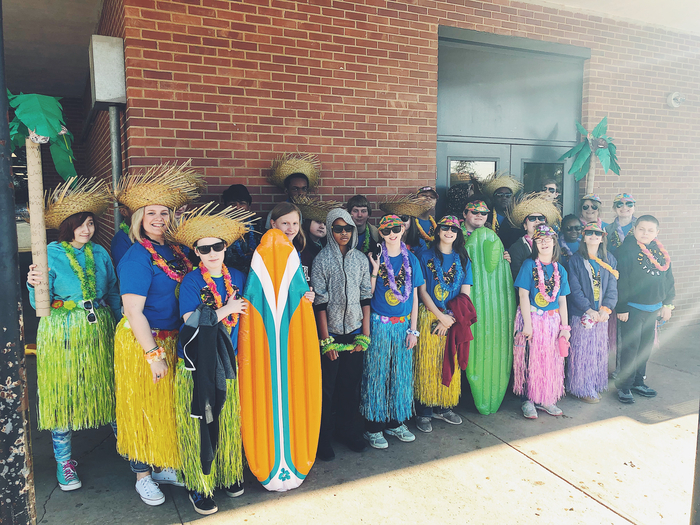 Our 7th graders placed 9th out of 19 schools with a total score of 275 out of 300. 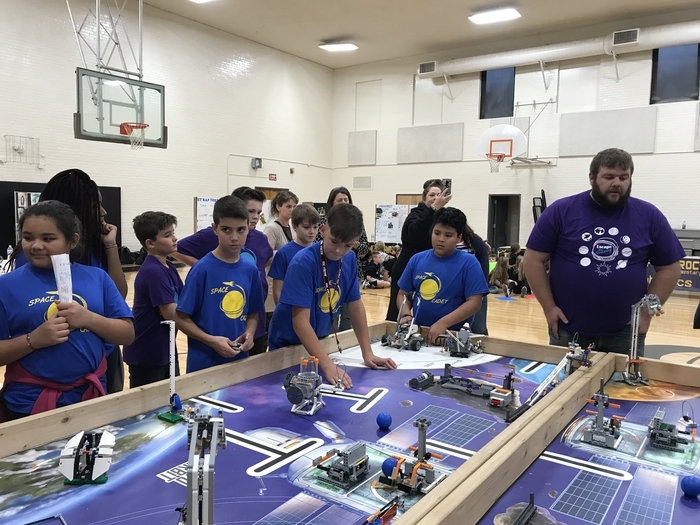 Starr-Iva was the highest ranked middle school team in the contest. 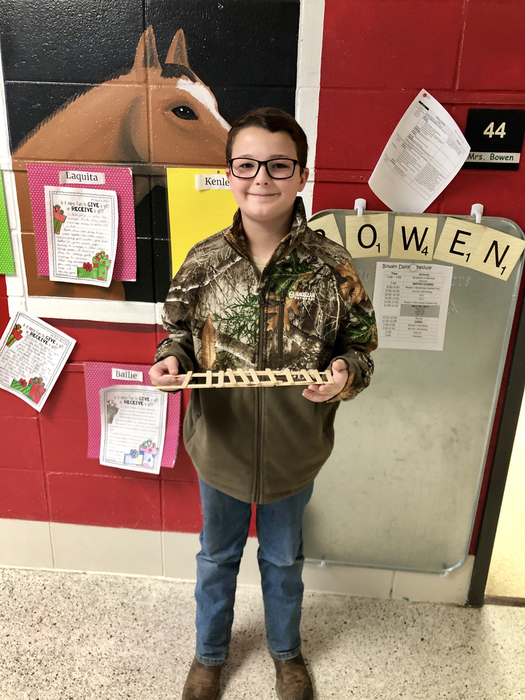 Jaxson Blanton had a score of 97 out of 100, putting him in a 7-way tie for 4th place. We are very proud of the way our middle schoolers competed so confidently against 75 other students, most of which were high schoolers. They conducted themselves well and were a pleasure to be around. Congratulations to these individuals! 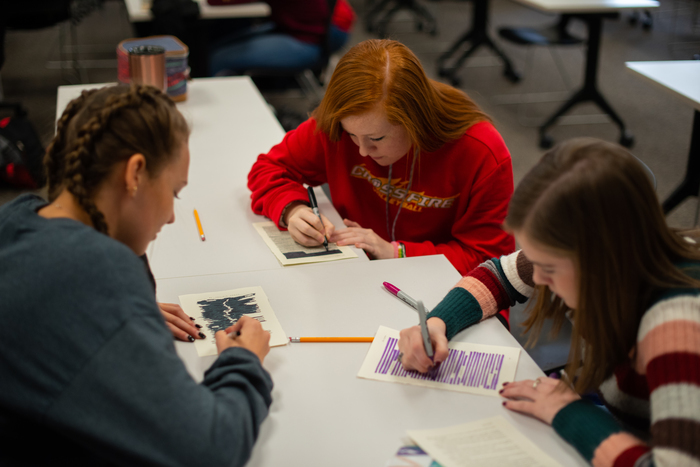 Mrs. Holbrooks students celebrated #WorldPoetryDay by creating Blackout poetry! Blackout Poetry recycles old books into works of art. 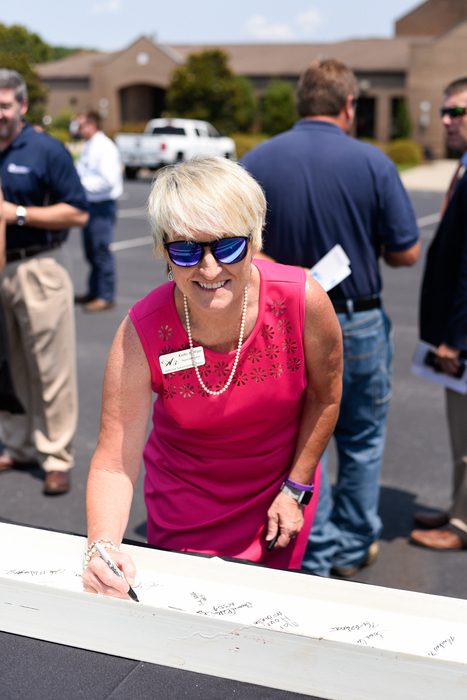 Christy Dodd and Deb Madden attended the grand opening of the Upstate Federal Credit Union at Michelin on Wednesday, March 20. 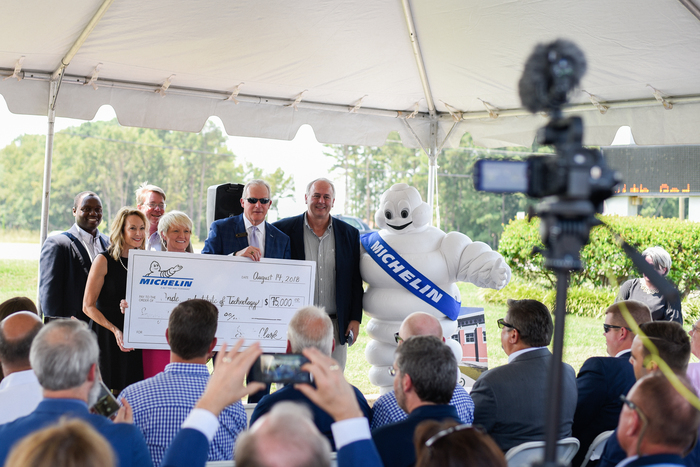 Michelin is a business partner with Flat Rock Elementary as part of Michelin’s Education Challenge program, and Upstate Federal Credit Union supports our schools in Anderson 3. Congratulations to both businesses on the grand opening, and thank you for the donation to Flat Rock! 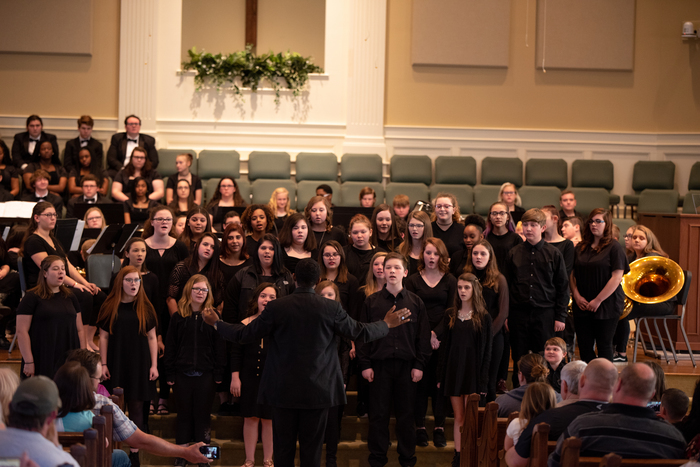 Chorus and band members from CHS and SIMS put on a fantastic performance at the A3 Fine Arts Showcase last night! 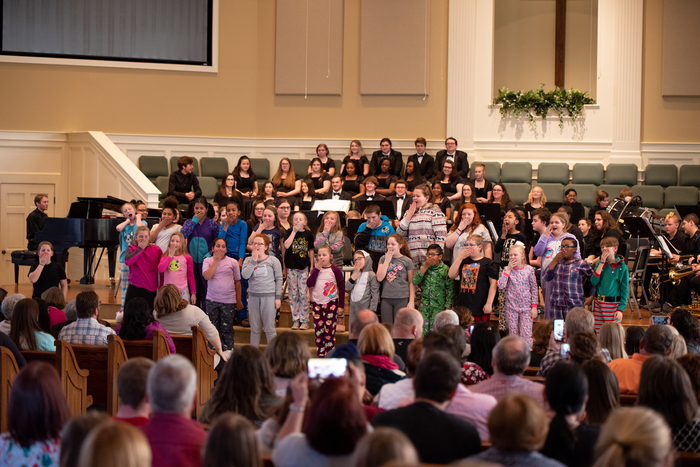 First Baptist of Iva was full of talent for the A3 Fine Arts Showcase! 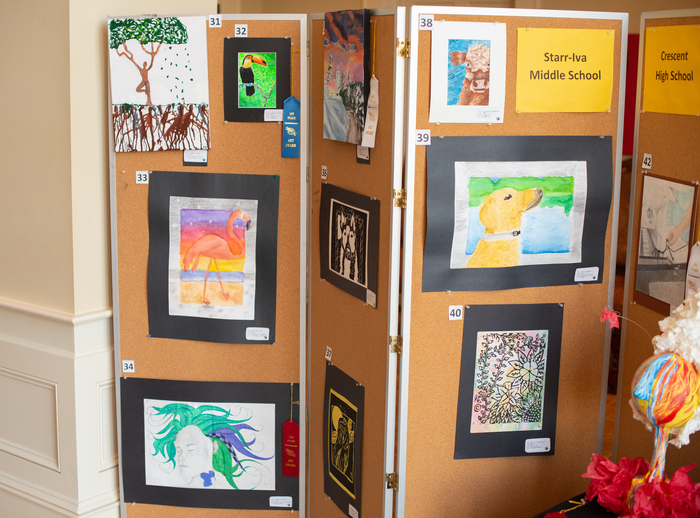 Students from every school demonstrated their artistic and musical abilities. 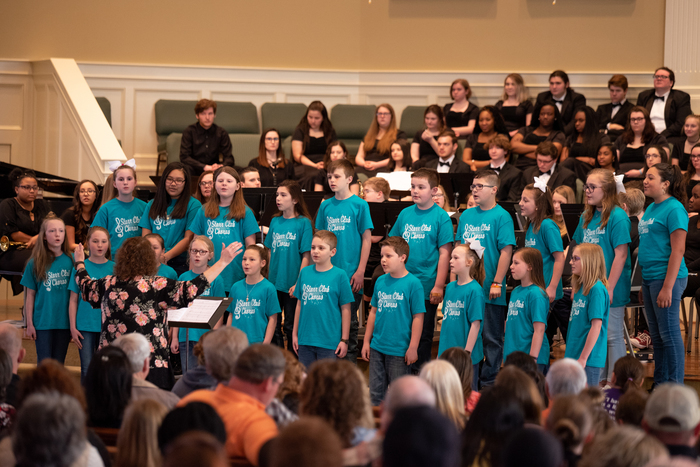 Here is a look at the Flat Rock, Iva, and Starr chorus members who all did an excellent job! Happy #firstdayofspring ! We stopped by the CHS Greenhouse to check out the progress of their plants for their annual plant sale and they look amazing! The plant sale will be the first week in April, more details to follow. 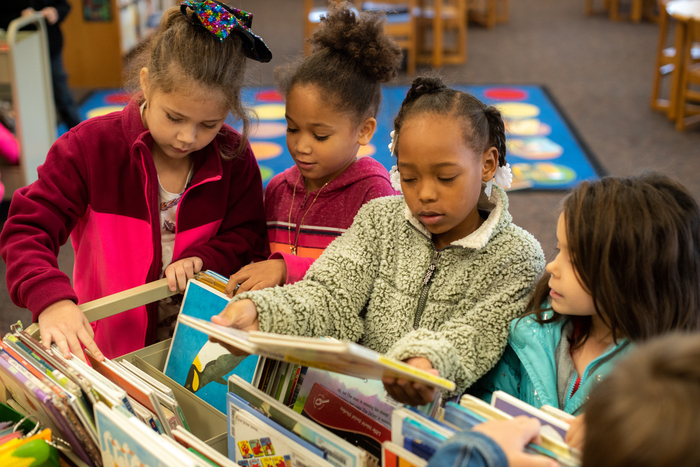 Today is #WorldStorytellingDay! This years theme is myths, legends, and epics. 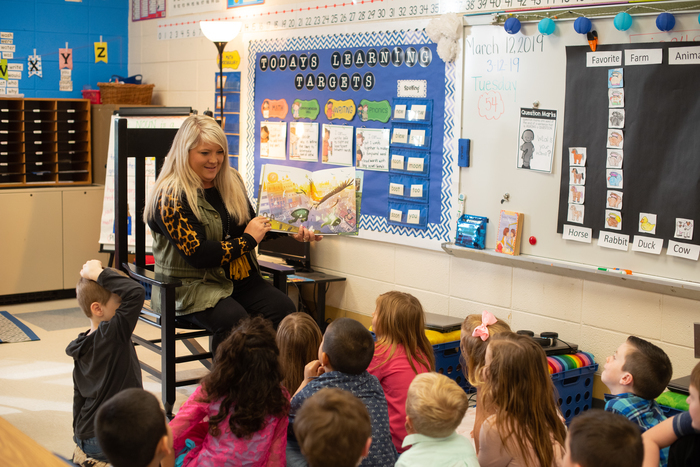 Don't forget to share a story with a child! 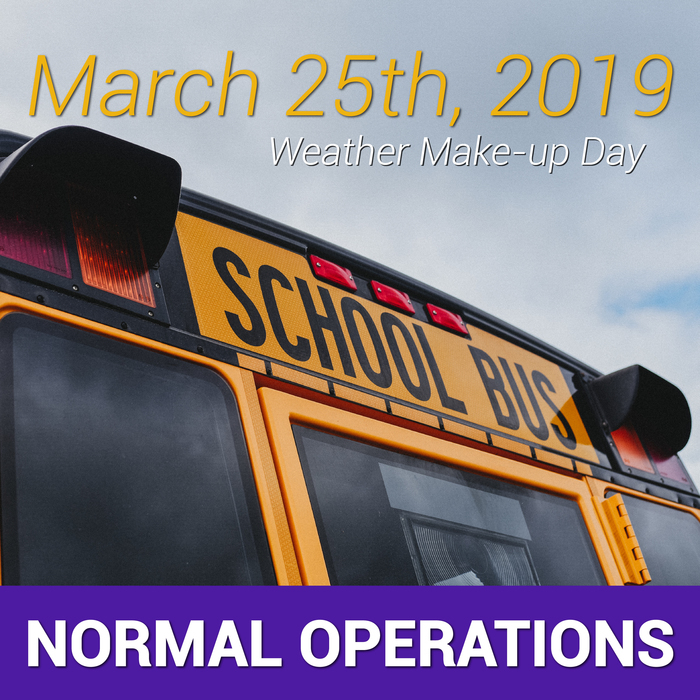 March 25th will be a Normal School Day. 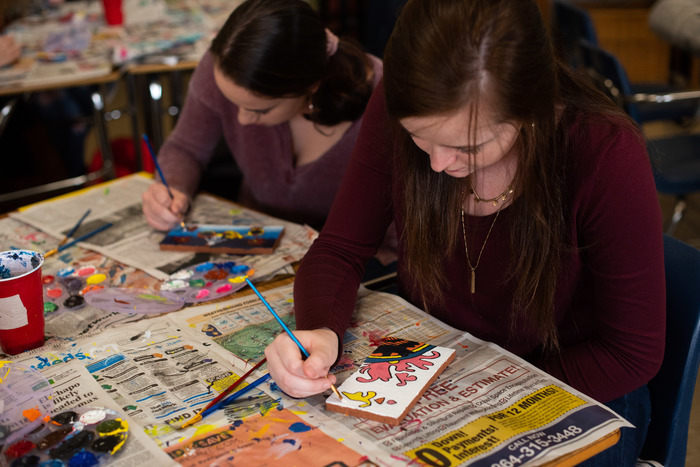 Dr. Moyer's Spanish 1 students decorated ceramic tiles with unique designs inspired by Mexican culture! 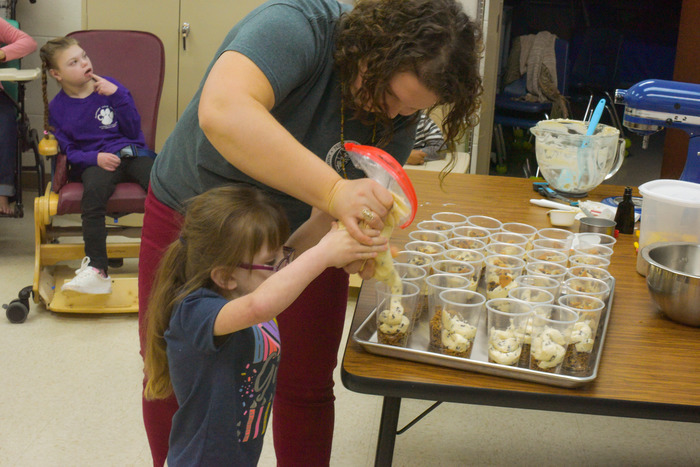 Every Thursday, Mrs. Christenbury's class prepares sweet treats for the faculty of Flat Rock. 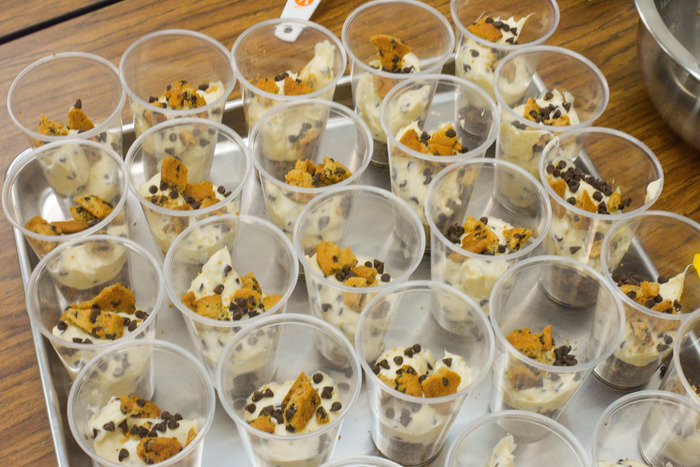 Last week, in honor of Pi Day, her class used their adaptive switches to help them mix up a delicious (Pi)e in a cup treat! 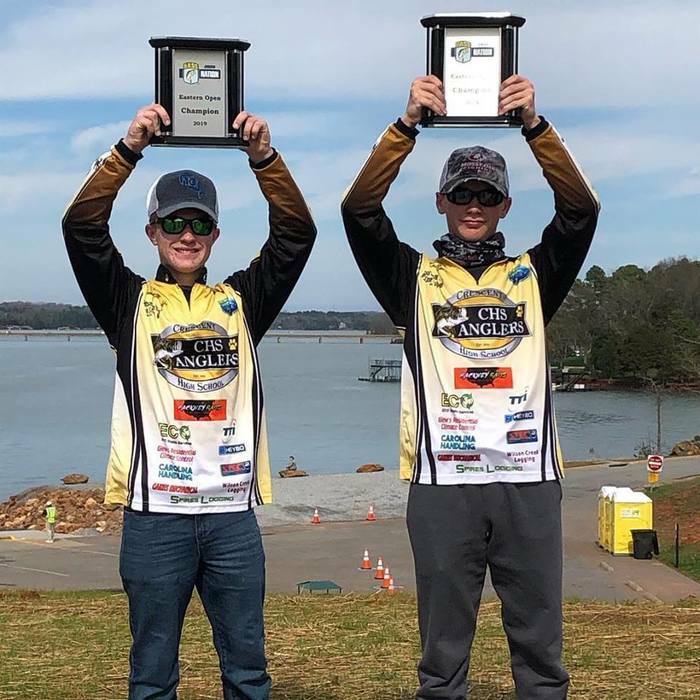 Our CHS Anglers fished this month for the Bass Master Eastern Open on Hartwell Lake. They competed with 88 other schools from 15 different states! 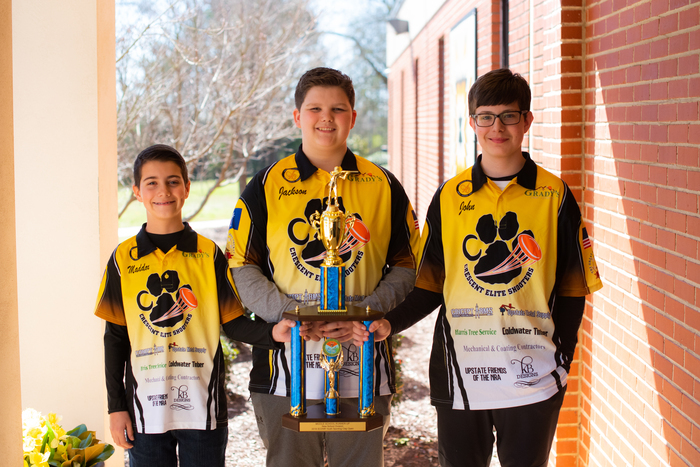 Our tigers achieved the following results: -Kaleb Butts and Luke McGuffin took biggest fish and 1st place for all middle schools. 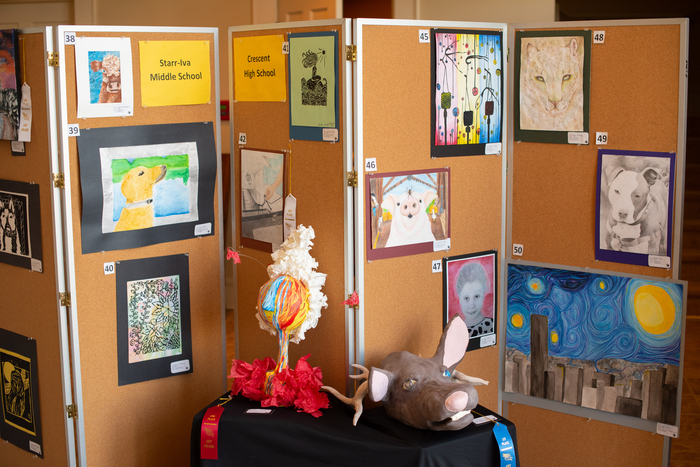 -Anna Kay and Elizabeth Pamphilon took 3rd place for all middle school teams. -Jacob Butts and Colin Sutherland came in 13th for all high school teams. Kaleb, Luke, Jacob, and Colin will advance to the nationals later this year in Kentucky to represent A3. 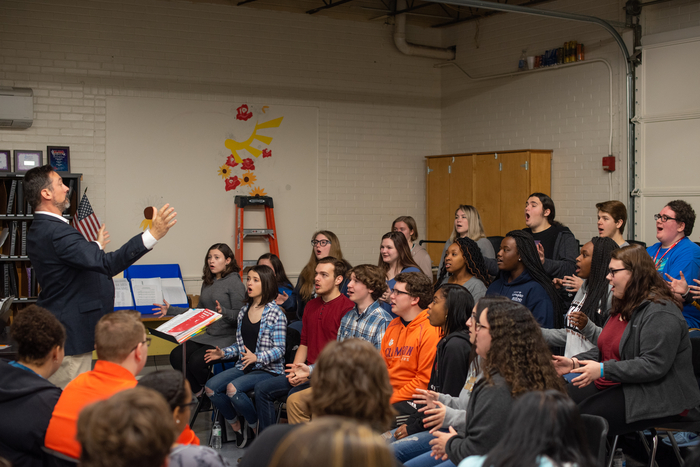 Dr. Christopher Hansen from Anderson University visited the CHS Chorale to work with them on pieces for the upcoming A3 Fine Arts Showcase. 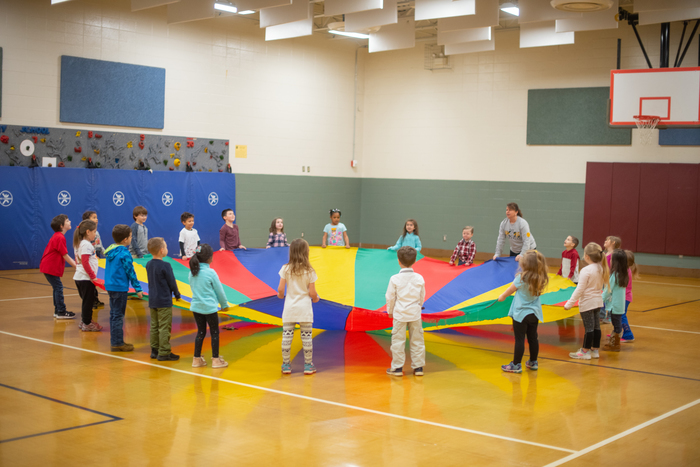 He gave them expert advice on their vocal technique and showed them how to improve their singing through a variety of warm ups and activities! TIGER SPORTS SCHEDULE UPDATE: JV Softball at West-Oak postponed for today. Will be made up MARCH 28. 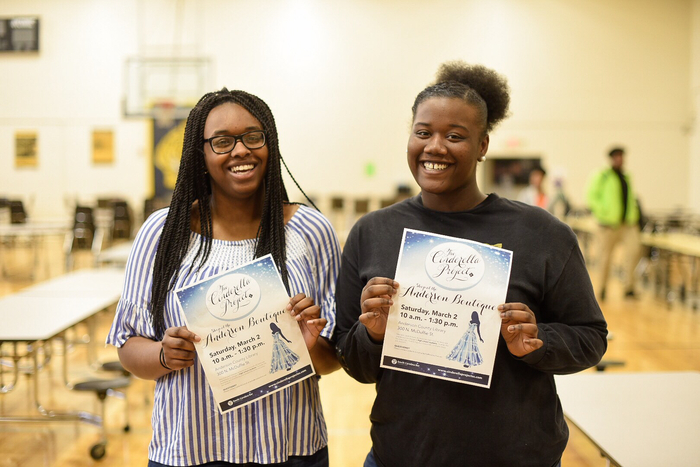 Crescent Student Government assisted with the Come Dream with me Prom sponsored by A Night to Remember. SGA made all of the large decorations, helped set-up, served food, and danced the night away! 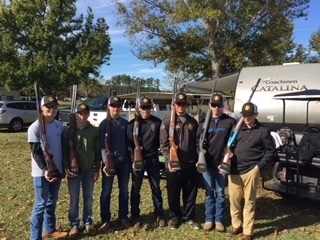 The CHS and SIMS shooting teams had great finishes at the recent SCDNR Governor’s Cup Sporting Clay event​. Three teams scored big titles in the event. 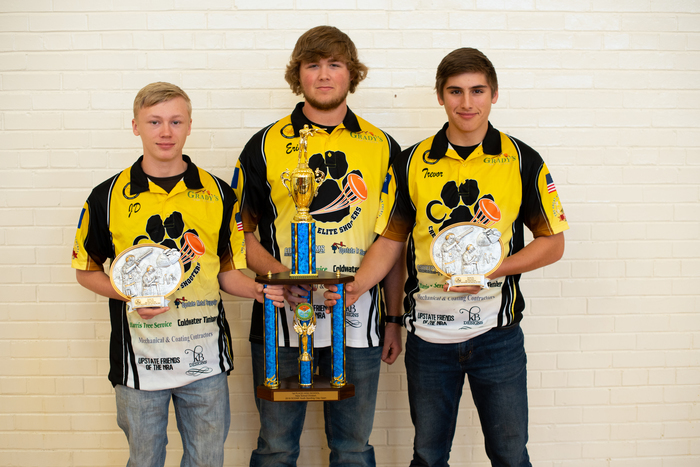 From CHS: 1st place New Team for SCDNR Governor’s Cup Sporting Clay event: JD Worley, Eric Brown, Trevor Kelly. 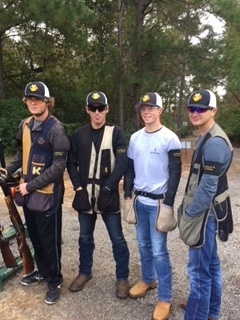 -2nd Place New Team for SCDNR Governor’s Cup Sporting Clay Event: Torry Kelley, Logan Shaw, Sam Center From SIMS: 2nd Place New Team for SCDNR Governor’s Cup Sporting Clay Event: John Harbin, Jackson Taylor, Maddox Martin. 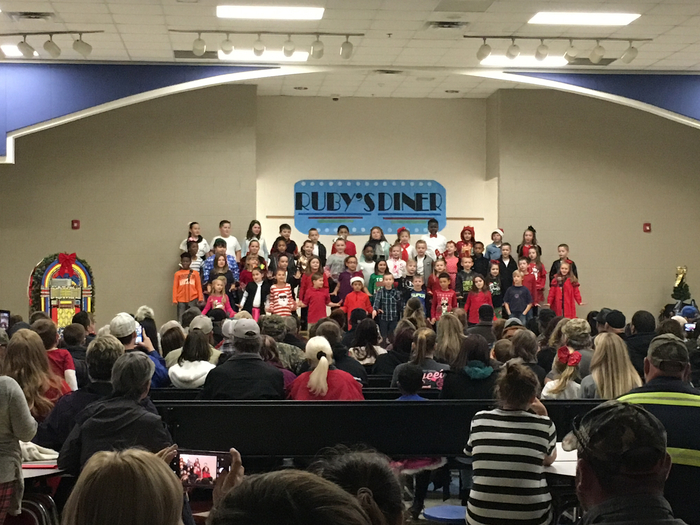 We are extremely proud of these students for their stellar performance! 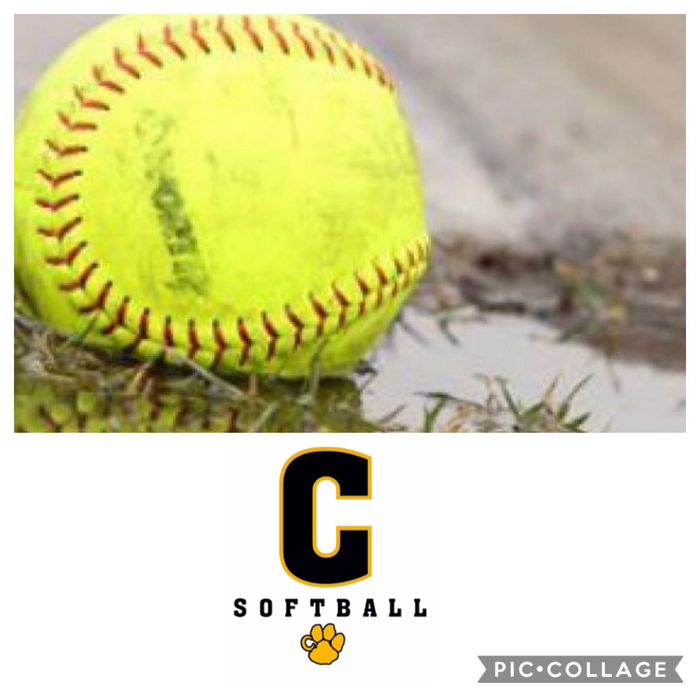 Rain forces postponement of the Lady Tiger Softball Tourney tonight. Will plan to resume tomorrow morning at 9 am. Lady Tigers scheduled to play at 10 am. Rain, rain GO AWAY! 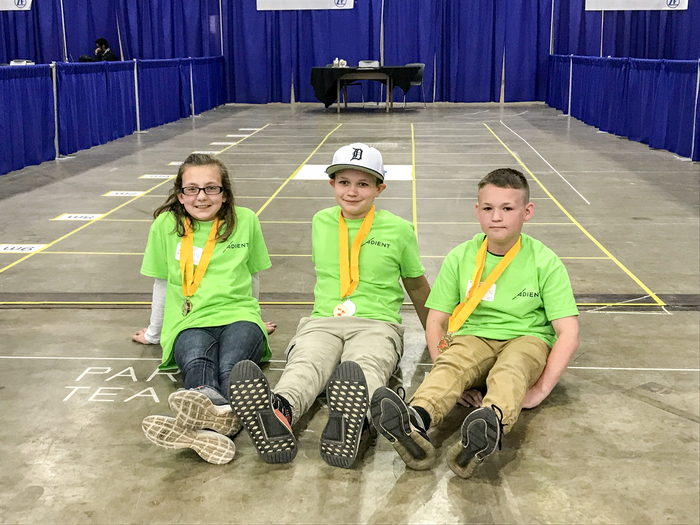 The Turbos - a Jet Toy team from Starr Elementary - came in 2nd place at the Regional Competition and qualifies for the National Competition in Detroit in April! 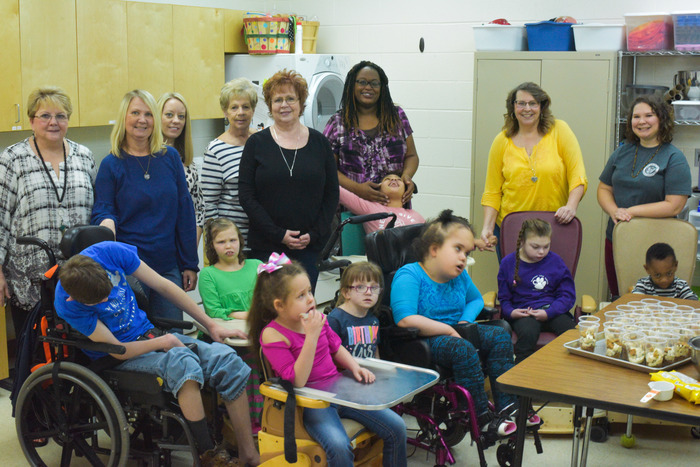 Anderson School District Three is holding a fundraiser for the March of Dimes. 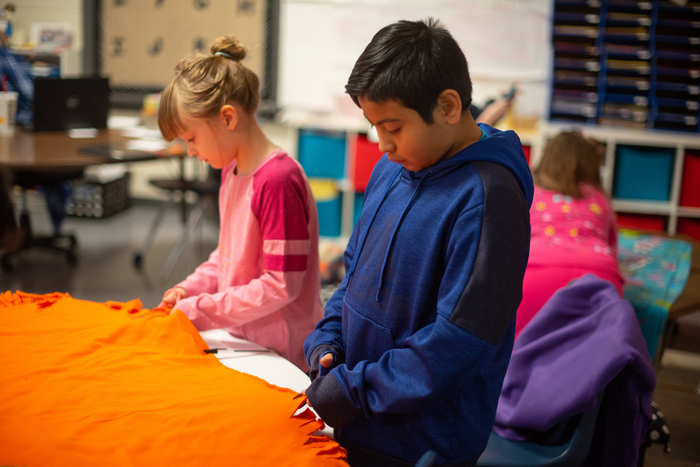 If you would like to purchase a shirt, please email smithc@acsd3.org or call Cheryl Smith at 348-6196 by Monday, March 11, 2019. The t-shirt is white and costs $15. Please add $1 for each X added to the size after XL. All proceeds from the shirt sale will be given to the March of Dimes. 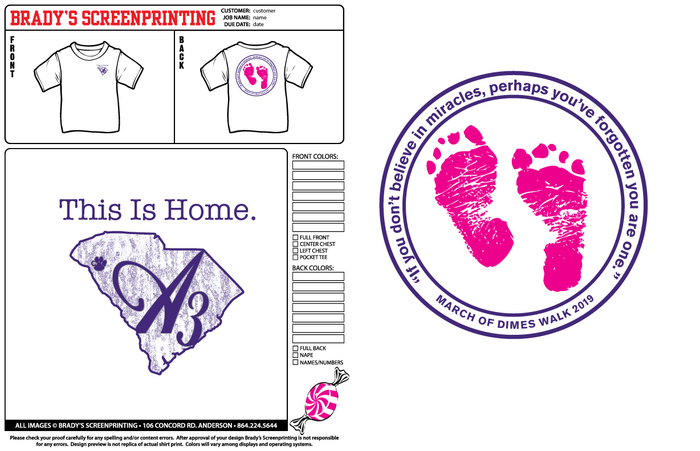 Wear your shirt and join faculty from Anderson Three at the March of Dimes walk on April 27, 2019. TIGER SPORTS SCHEDULE UPDATE: Varsity Baseball game at Palmetto WILL NOT BE PLAYED Wednesday. Makeup date TBD. 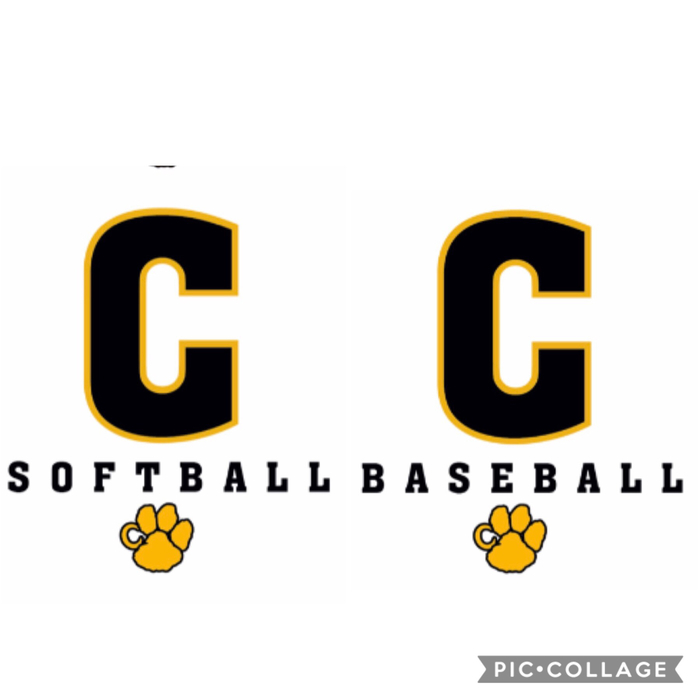 Crescent Lady Tiger Softball plays AT HOME today vs BHP! Tiger Fans.....just a reminder that the start time has been moved to 5 PM! GO TIGERS! The Month of March is also MIOSM! 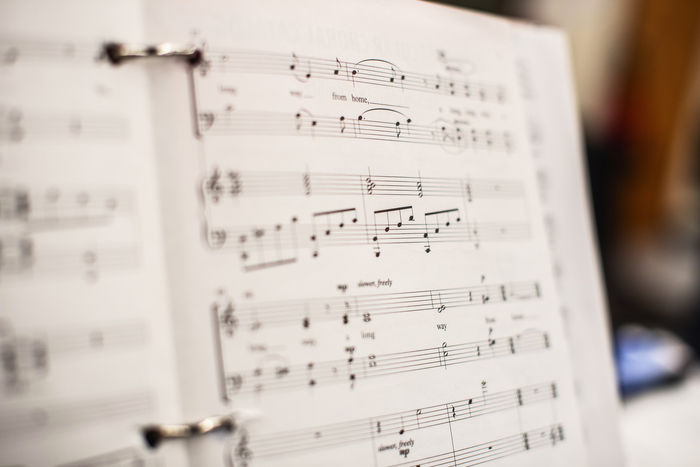 (Music in Our Schools Month) MIOSM celebrates music in schools with the theme this year of “All Music. All People.” We will be showcasing our talented student musicians this month as a part of this celebration! 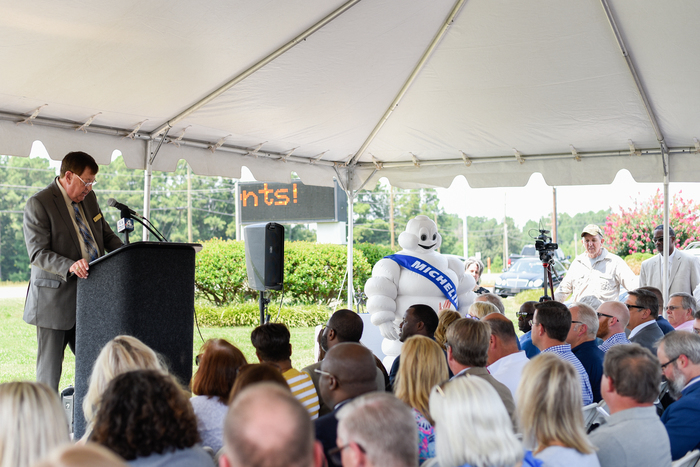 This week was #employeeappreciation and the district office would like to say THANK YOU to our amazing employees! 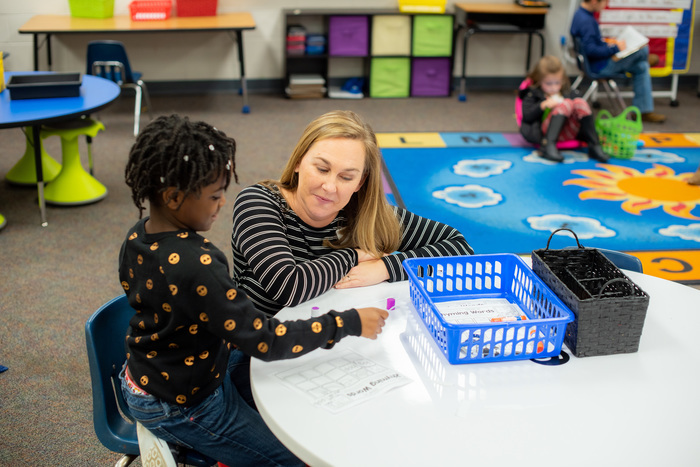 Anderson 3 would not be the same without the dedicated faculty and staff that work tirelessly to ensure our students receive the best possible education. We hope you enjoyed the BBQ lunch! 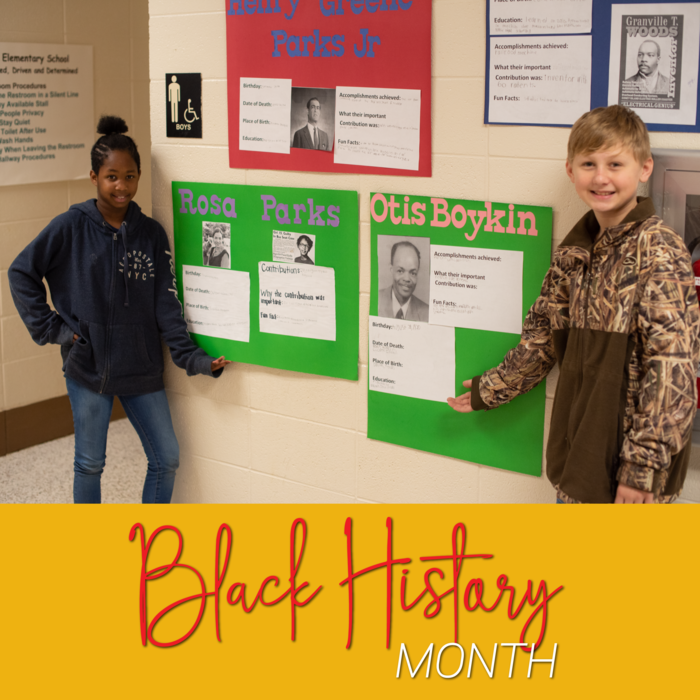 Students in Ms. Brock's class at Iva celebrated Black History Month by researching influential African American men and women! 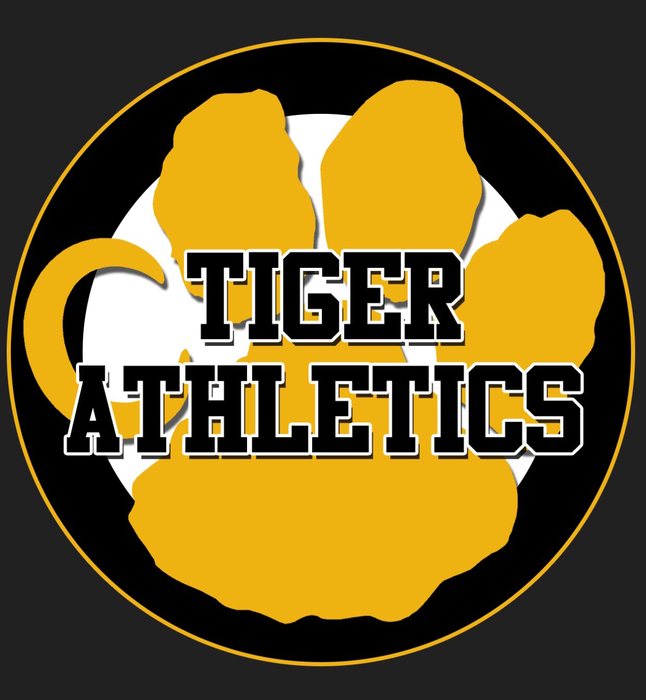 TIGER SPORTS SCHEDULE UPDATES: * Baseball games are CANCELED for today; will update on reschedule when available * Softball scrimmage at Hillcrest is CANCELED * Soccer is POSTPONED for today. 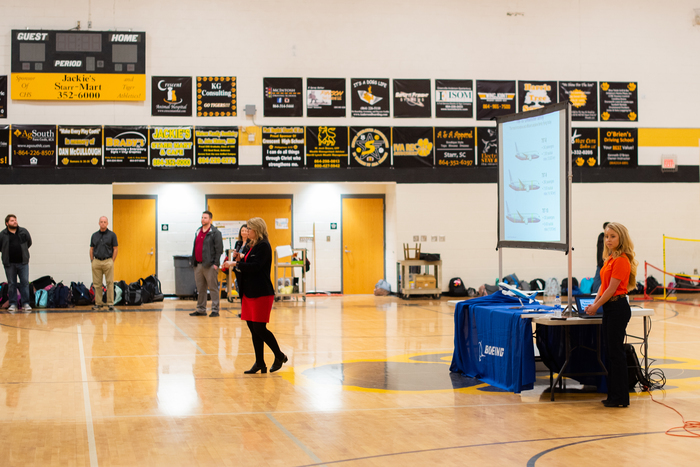 Boeing visited Crescent today to present career opportunities within the North Charleston Boeing facility. The commercial fleet of 787-8, 787-9 and 787-10 Dreamliners are all partially assembled and manufactured at the South Carolina facility! Victorious Tigers tonight!! * Crescent Varsity GIRLS SOCCER opened their season with a home victory over Dixie * Crescent Varsity BASEBALL defeated Dixie at home in Pre-Season Tourney action as well! WAY TO GO TIGERS! 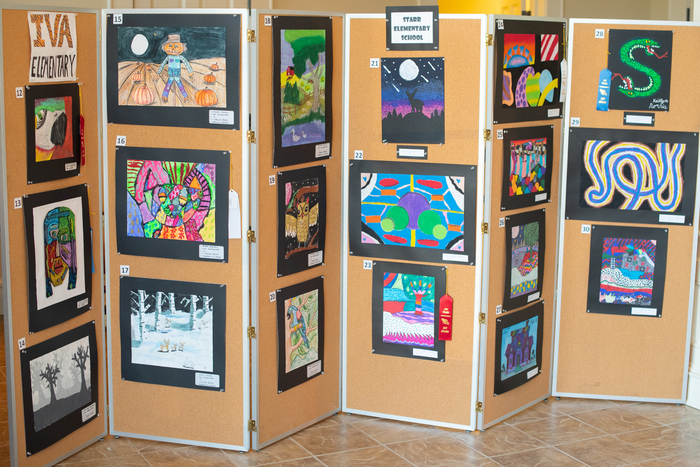 A3 Fine Arts Showcase. Students from every school will be participating in this event! Tiger Nation.....you are looking at a STATE CHAMPION!!!! CONGRATS to Crescent Tiger Senior Wrestler C.C. 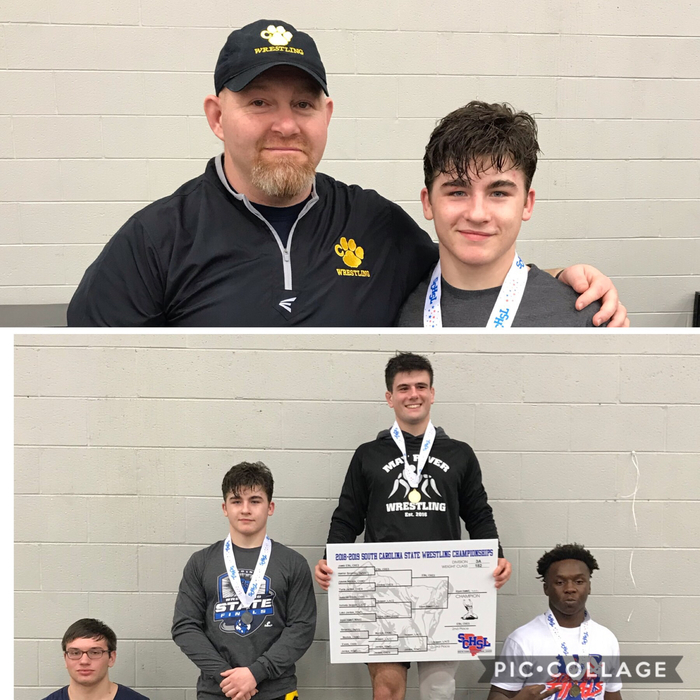 Spires.....2018-19 AAA State Champion! 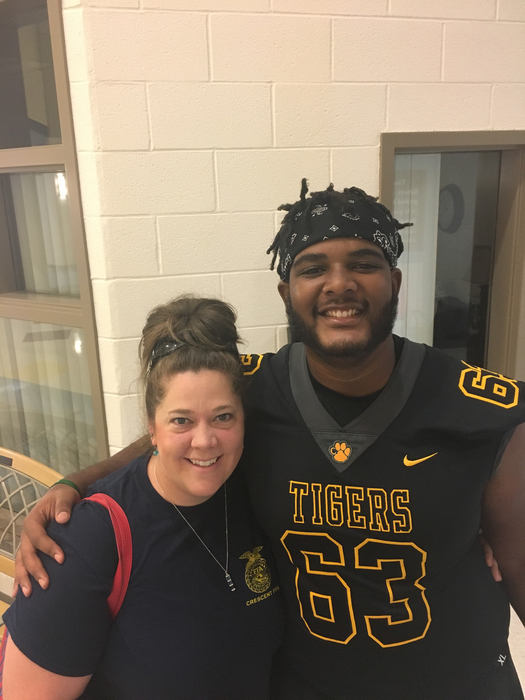 Tiger Proud of this young man as well! CONGRATS to Crescent Junior Wrestler Jamie Ellis...AAA State Runner-Up! 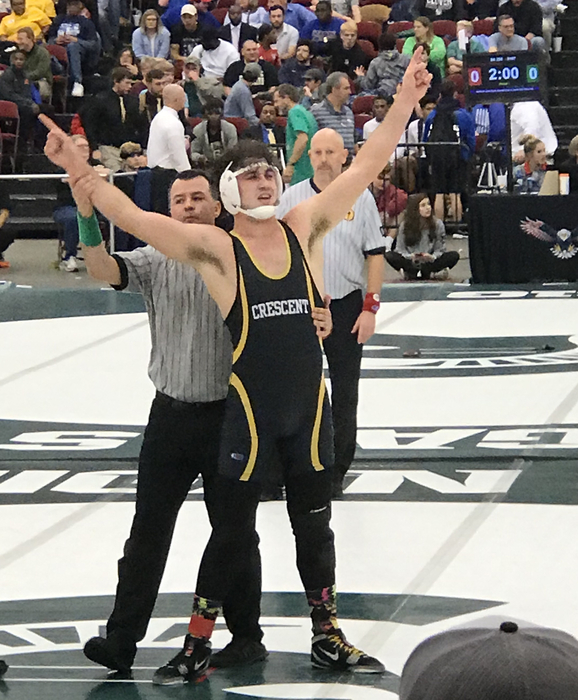 Crescent Senior Murphy McBride caps off an excellent high school wrestling career with a 3rd-place finish at the AAA State Meet today! Great job, Murphy! PROUD of this young man! CONGRATS to Crescent Tiger Sophomore Wrestler Camerien Ellis, AAA State Runner-Up! 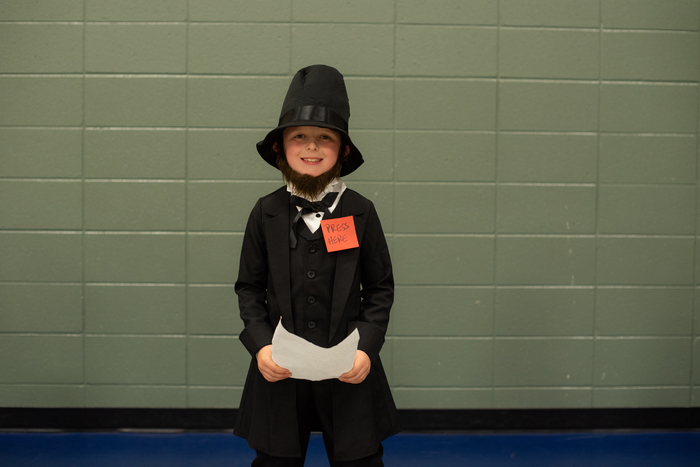 Students got into character at the Starr 2nd Grade Wax Museum to tell about the lives of important men and women throughout history! Camerien Ellis, Jamie Ellis, Murphy McBride, and C.C. Spires all got wins this morning, making it a 4-0 run for Crescent wrestlers in the AAA State Individual quarterfinals! 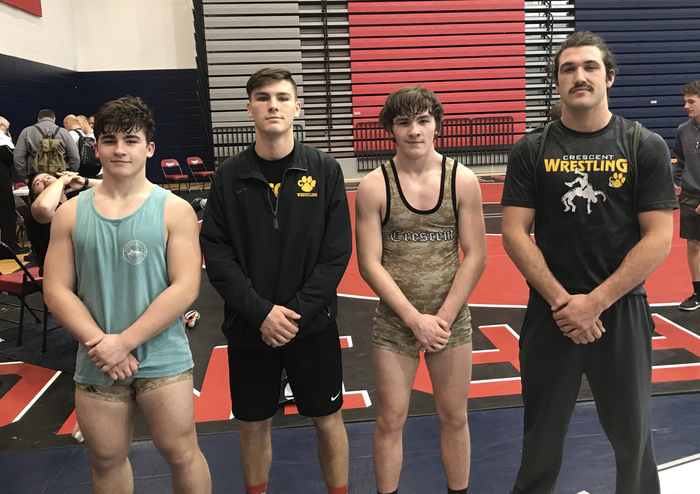 All four will be wrestling in the semifinals tonight at 6:30 at the Anderson Civic Center. Come out and support these wrestlers if you can! Good Luck to these young men as they compete for a State Championship this weekend! GO TIGERS! TIGER SPORTS SCHEDULE UPDATE: The 100 Inning Softball game scheduled for tomorrow has been canceled. No makeup date. **No other schedule changes at this time. GOOD LUCK to the following Crescent wrestlers who will be competing for AAA STATE CHAMPIONSHIPS at the Anderson Civic Center this Friday and Saturday! Jamie Ellis, Murphy McBride, Camerien Ellis, C.C. Spires.....GO GET ‘EM THIS WEEKEND! 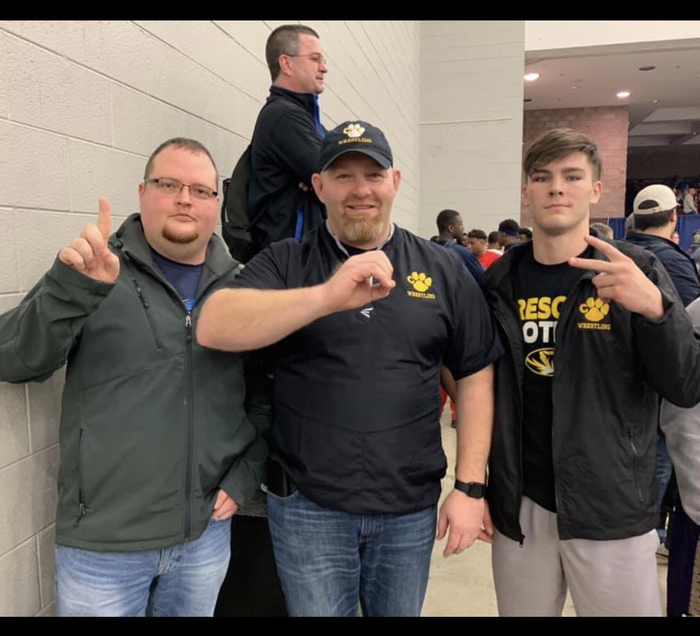 Good luck to these wrestlers and their coaches....TIGER PROUD of them! 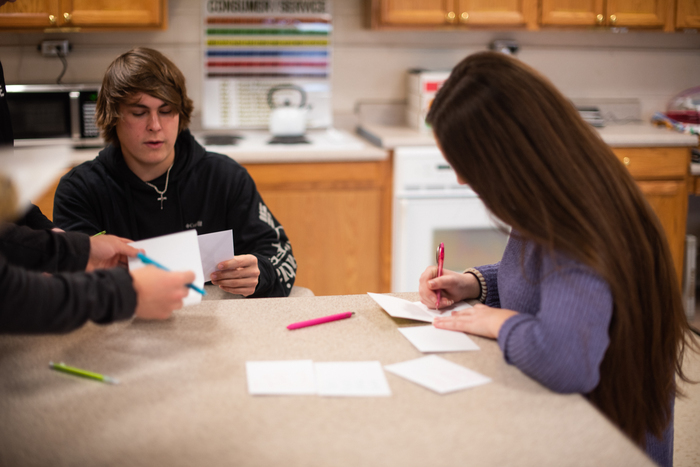 Crescent Teacher Cadets students bake cookies and write thank you notes for the school's staff where they will observing and assisting teachers for the rest of the semester! 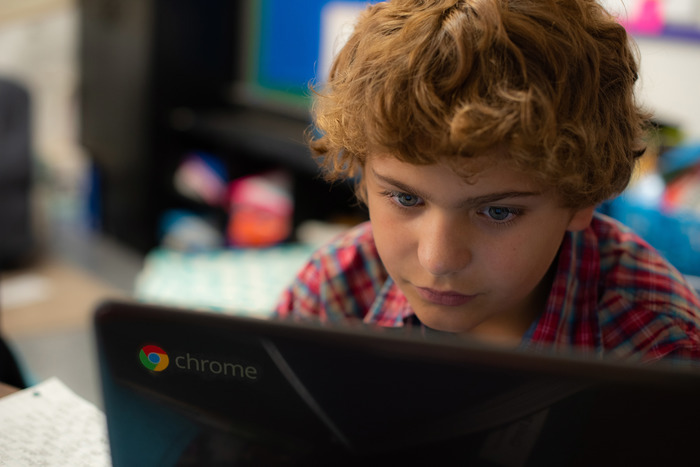 Chromebooks empower students to excel! 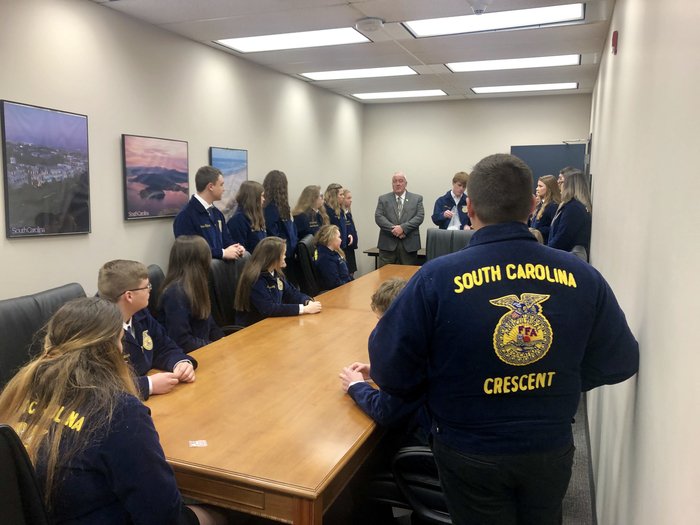 Crescent FFA was represented well today at the SC State House for FFA Legislator Appreciation Day! 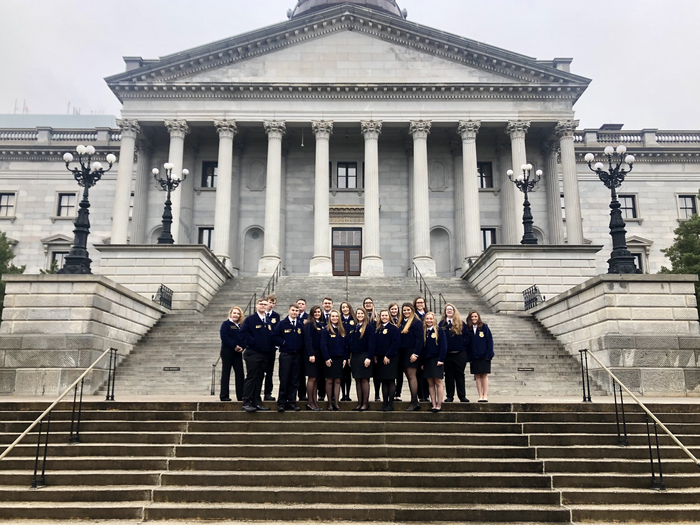 We had the pleasure of meeting Senator Michael Gambrell, being recognized by Representative Jay West on the House floor, and attending the legislative day ceremony with various legislators who serve on the Agriculture, Natural Resources and Environmental Affairs committee. With this group of young people, the future of agriculture is bright! CONGRATULATIONS to Crescent Tiger Senior Wrestlers Murphy McBride and C.C. Spires - selected as North/South All-Stars! C.C. and Murphy will be participating in the Best Western North/South All-Star Classic in North Myrtle Beach March 1 and 2! Proud of these two young men! CONGRATS to the following 2018-19 All-Region I-AAA Basketball selections from Crescent! Girls Basketball: Courtney Baldwin Boys Basketball: Ra’Quan Groves TIGER PROUD of these student-athletes! 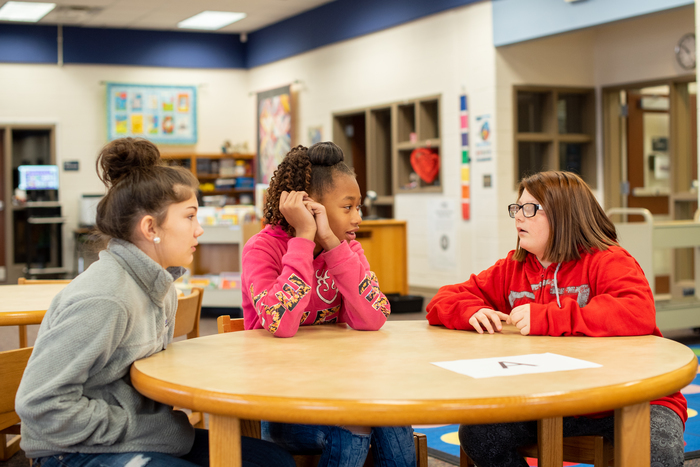 The Flat Rock Elementary Battle of the Books Upperclassmen Championship happened this past Friday as the two best teams from the 3rd, 4th, and 5th grade bracket battled it out to see who had the most book knowledge! 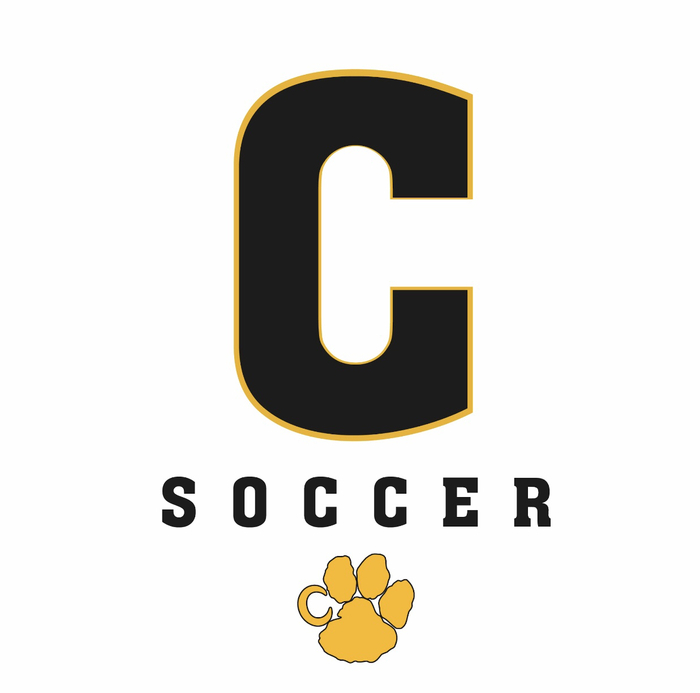 Soccer scrimmage scheduled for TOMORROW at Elbert County has been CANCELED due to field conditions. No makeup date at this time. Will update on any other schedule changes as they occur. 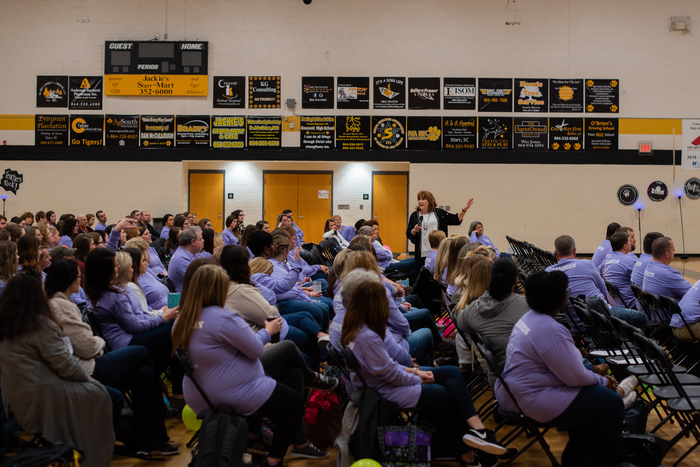 Dr. Debbie Silver, former Louisiana Teacher of the Year, a best-selling author, and a highly acclaimed national and international speaker, opens up as the keynote speaker at the 2019 A3 Instructional Fair. 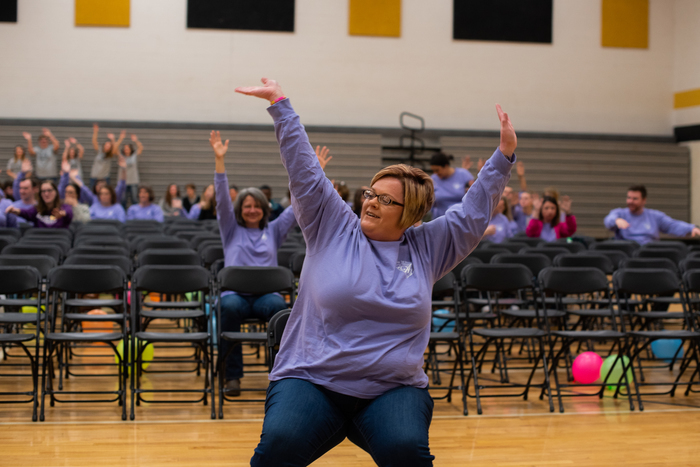 The 2019 A3 Instructional Fair is off to a fun start! 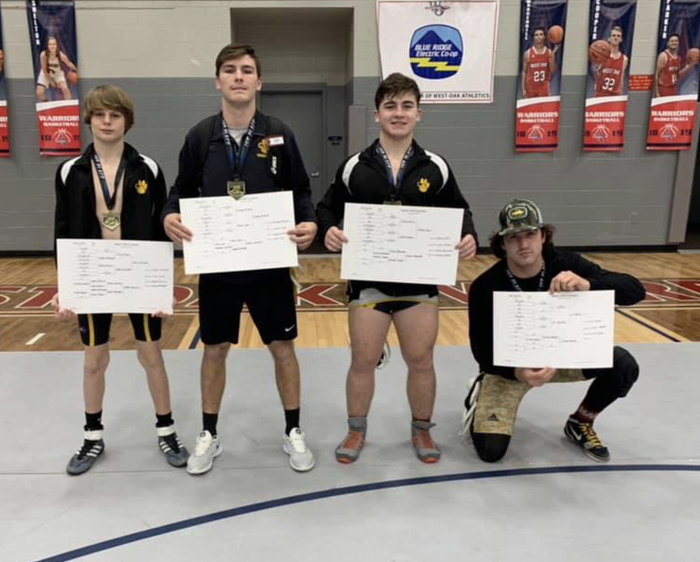 CONGRATS to our four Wrestlers who qualified for the Individual State CHAMPIONSHIPS next weekend at the Anderson Civic Center! 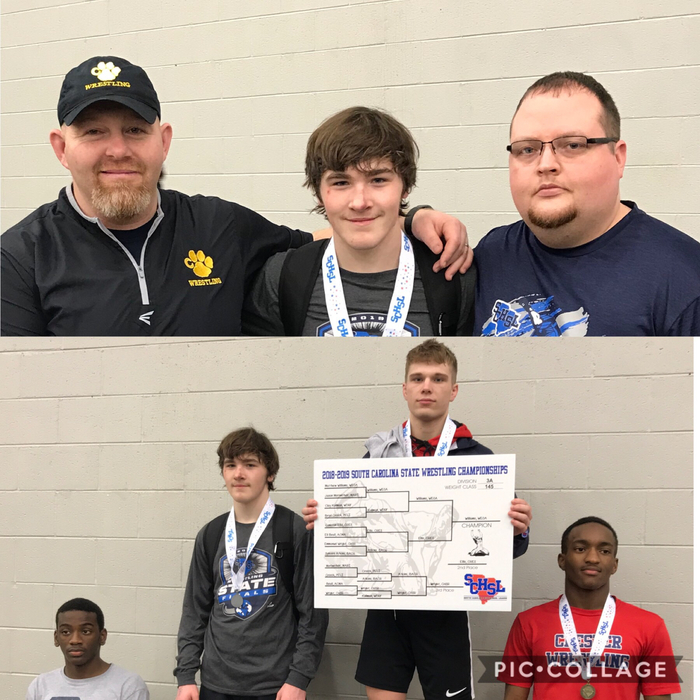 Jamie Ellis - Upper State CHAMP CC Spires - Upper State CHAMP Camerien Ellis - 2nd Upper State Murphy McBride - 3rd Upper State TIGER PROUD of ALL our wrestlers who competed this weekend! 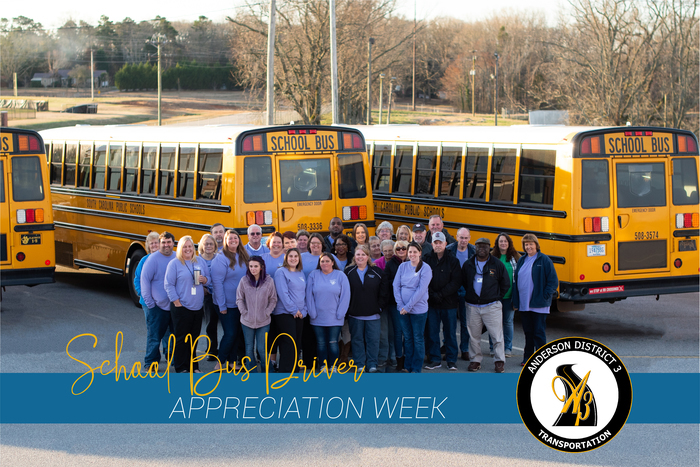 This week we celebrated not only our bus drivers but everyone who helps them to safely transport our students to and from school every day. 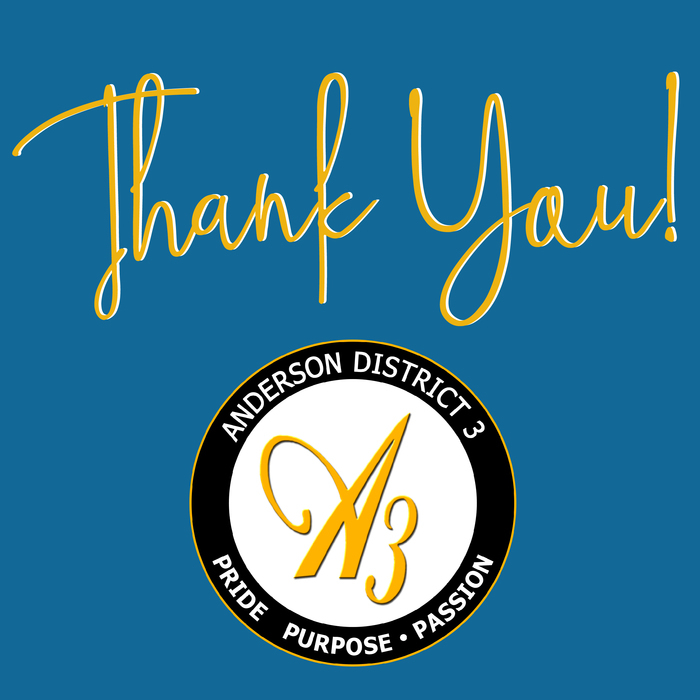 Thank you for your dedication to providing safe, reliable, and efficient transportation to the students of Anderson School District Three. 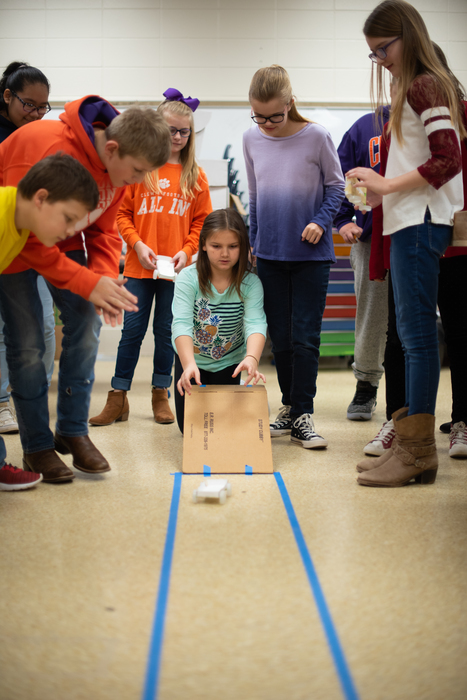 5th-grade students battle it out at the Starr Jet Toy competition! 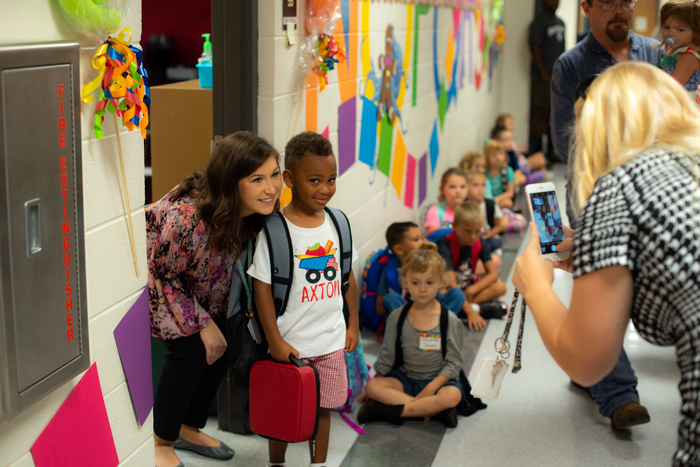 Professors and representatives from the Clemson College of Education toured all 5 of Anderson 3's schools Wednesday to observe all the great things happening in Anderson 3! 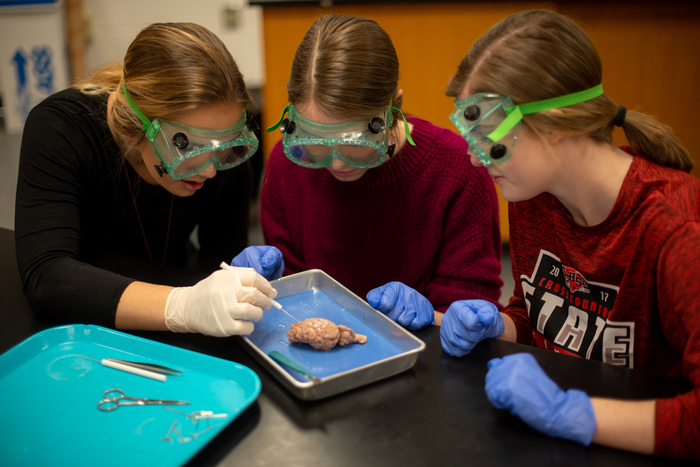 Human Anatomy and Physiology students at Crescent dissected sheep brains to identify parts of the brain! 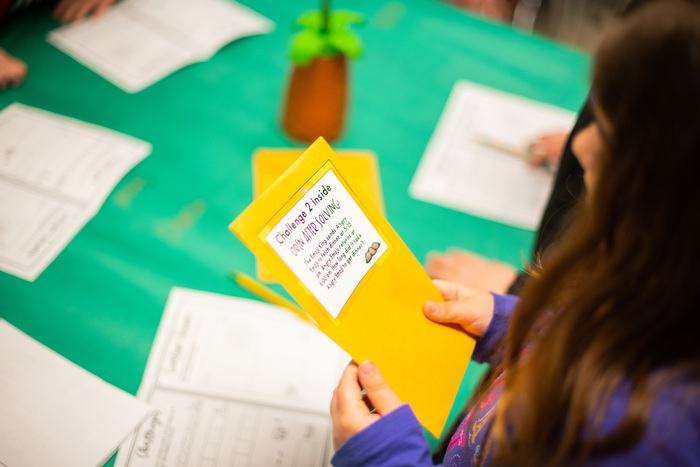 Good Hope Presbyterian Church recently donated $533.00 to the Weekend Snackpack Program. 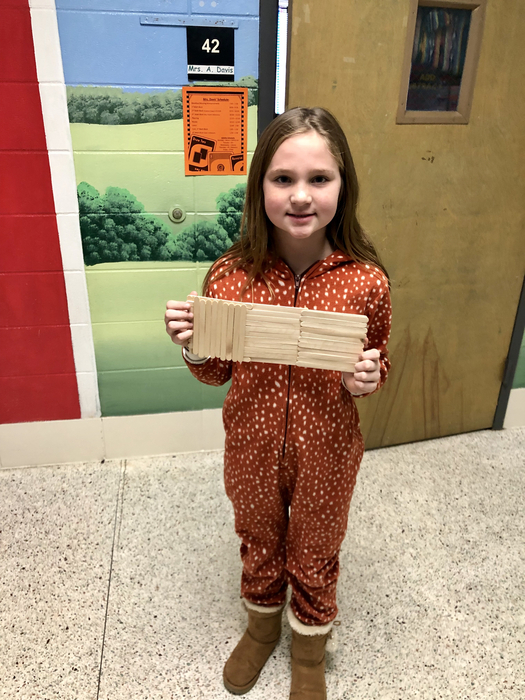 This donation was matched by an anonymous donor and will benefit the students of Flat Rock and Iva Elementary! 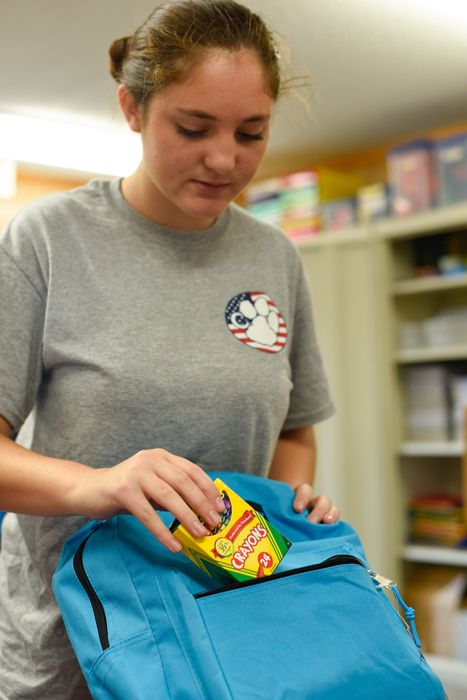 Starr Baptist Church also supplies approximately 20 snackpacks each week to the students of Starr Elementary. Anderson Three is blessed and truly thankful for the love and support of our schools from the Starr and Iva communities. 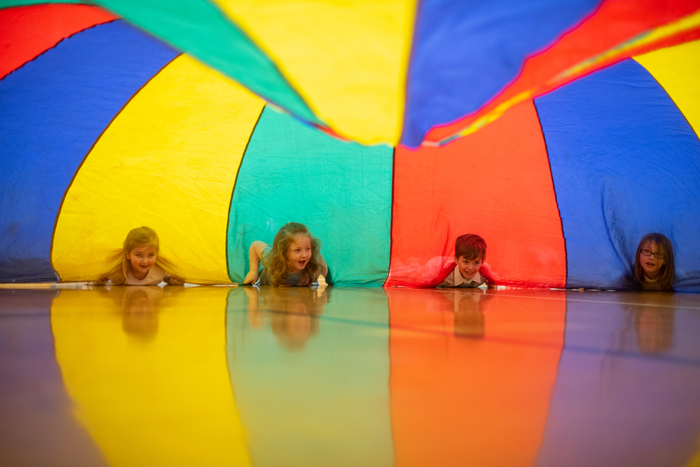 Was parachute day your favorite day? 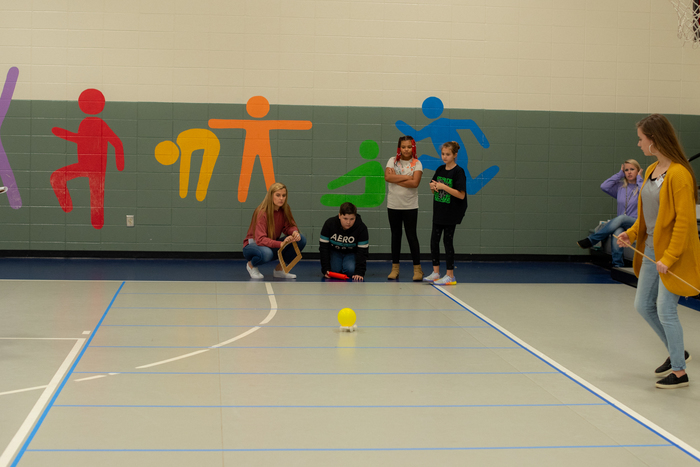 I think these Iva students found a new favorite gym activity! 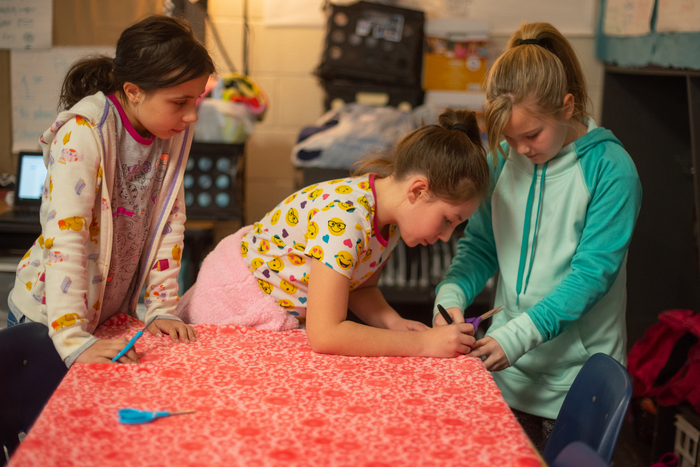 Mrs. Phifer's 3rd Grade class at Starr researched how to create no-sew fleece blankets using their Chromebooks, and followed steps to create the blankets for the Anderson County Animal Shelter! We know of some animals that will be com-fur-table! 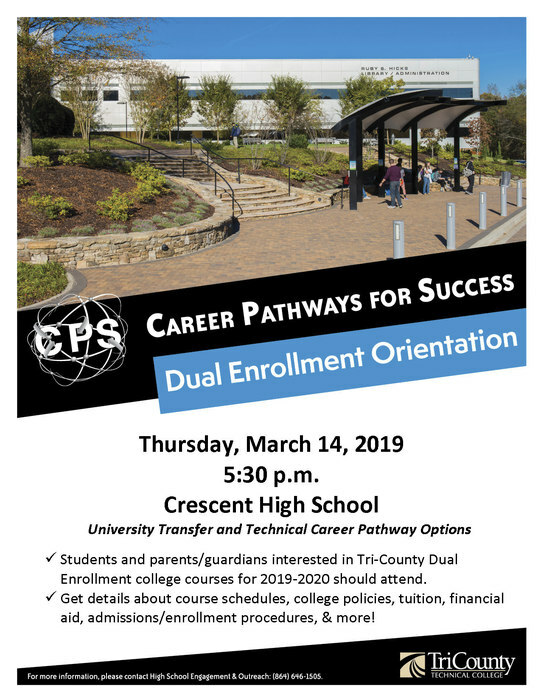 Tri-County Technical College will be hosting an informational meeting on Thursday, March 14 at 5:30PM. 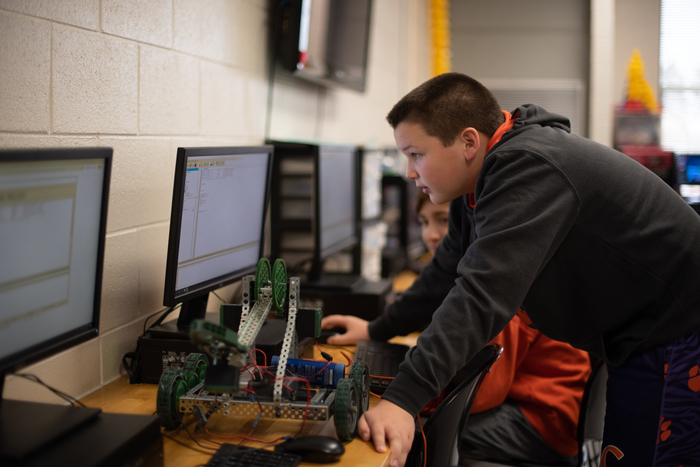 There will be a meeting in the Media Center for students who are interested in University transfer credits and a meeting (same time) in Mr. Haynie's classroom for students who are interested in Career Pathways in Mechatronics, Welding, and HVAC programs. SIMS Loves A3 Bus Drivers! 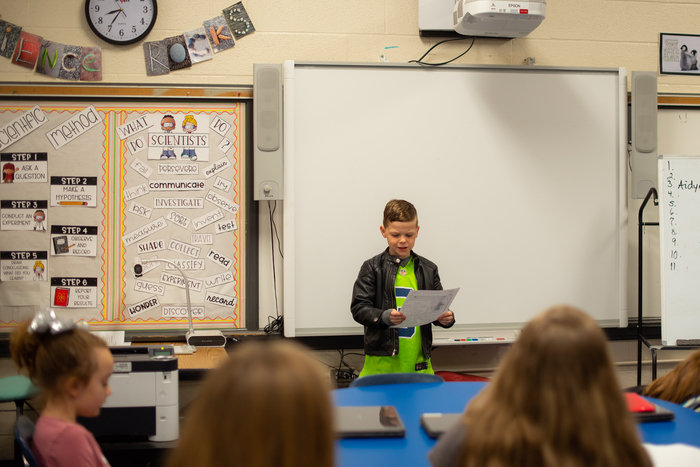 Flat Rock also started battle rounds for Battle of the Books as 3rd - 5th grade teams began competing to see who could come up with the most book titles and authors when given clues from a stories plot! Let the Games Begin! 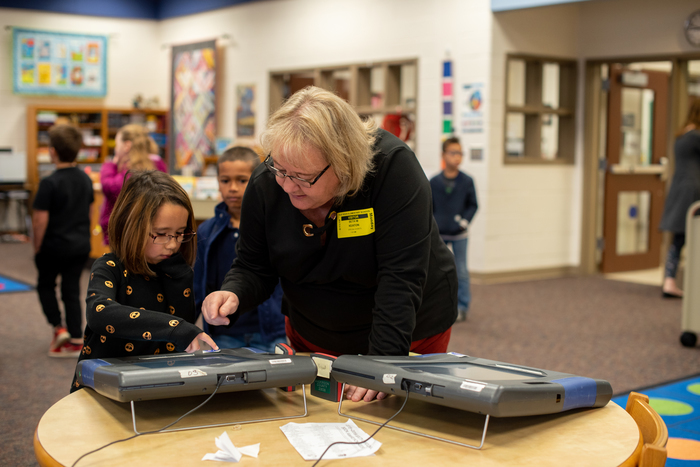 Battle of the Books began today at Flat Rock as the Anderson County Elections Office set up voting machines for students to vote for their pick for best book! 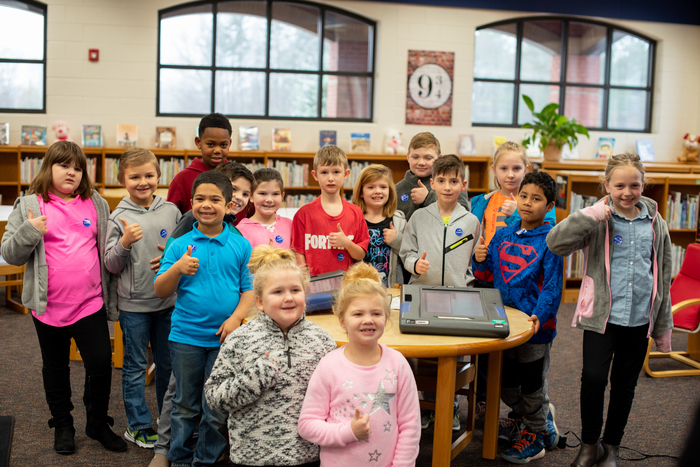 Students were able to see what its like to vote in a real election! Thank you, AC Elections Office! Come join us for a night of fun! 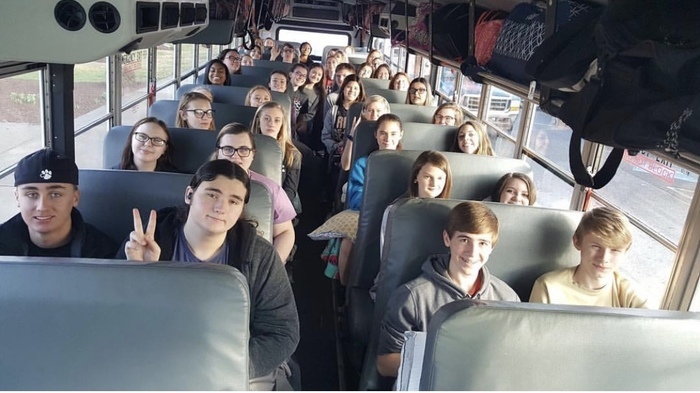 Good luck to our Betas as they compete at the SC Beta Convention! The National Beta Club, founded in 1934 in Spartanburg, is the largest independent, non-profit, educational youth organization in America. 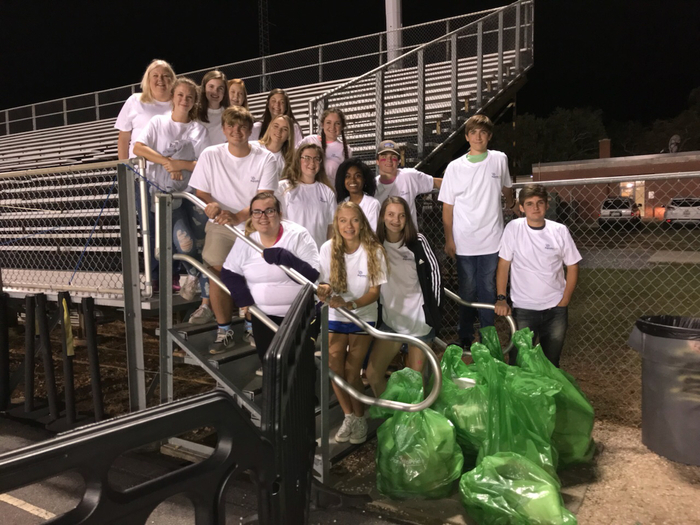 Founded at Iva High, CHS Beta Club is one of the nations oldest clubs! 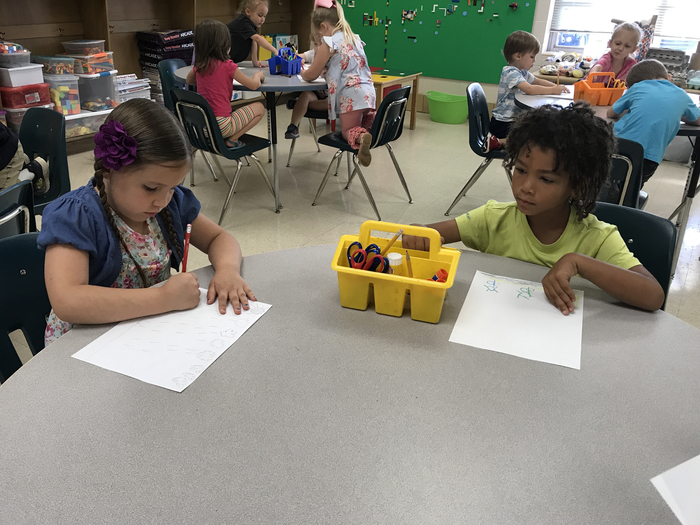 K-5 students in Mrs. Mapp's class working hard to visually represent different animals of the Arctic region! 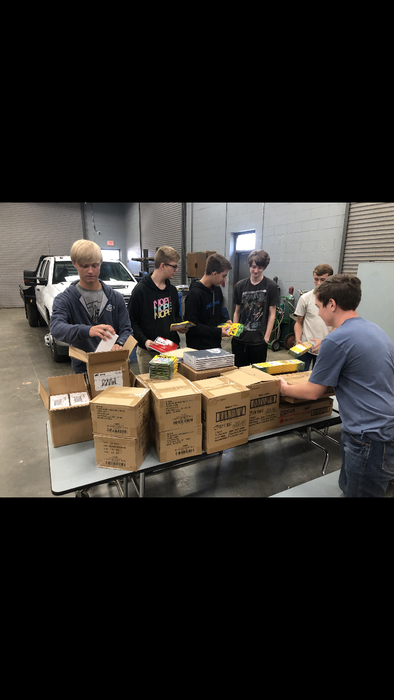 CHS Equipment Operations students learn how to operate various types of equipment. 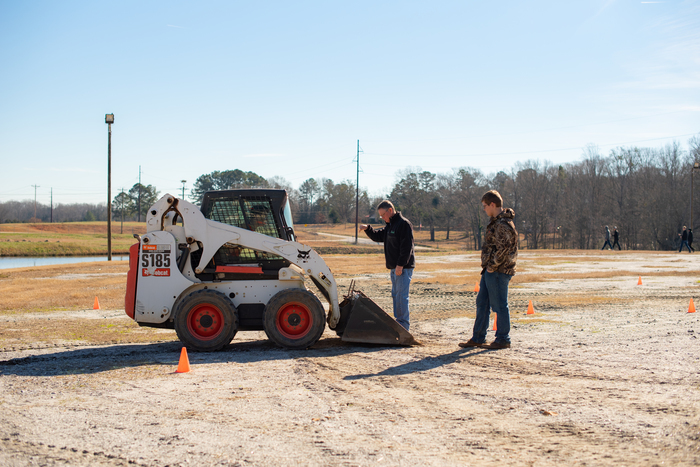 We recently caught up with Mr. McGill's class doing skid-steer training at the agriculture arena. Happy #nationalperiodictableday ! 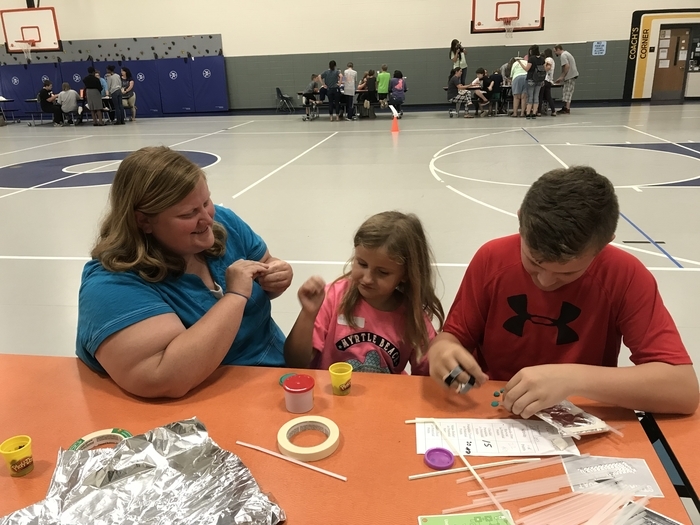 Our STEAM fair yesterday was a BLAST! Congratulations to Crescent seniors Dawson Merk and Mason Johnson as they continue their academic and athletic journeys as student-athletes. Dawson will continue his journey as a student athlete at The Citadel (Charleston, SC). 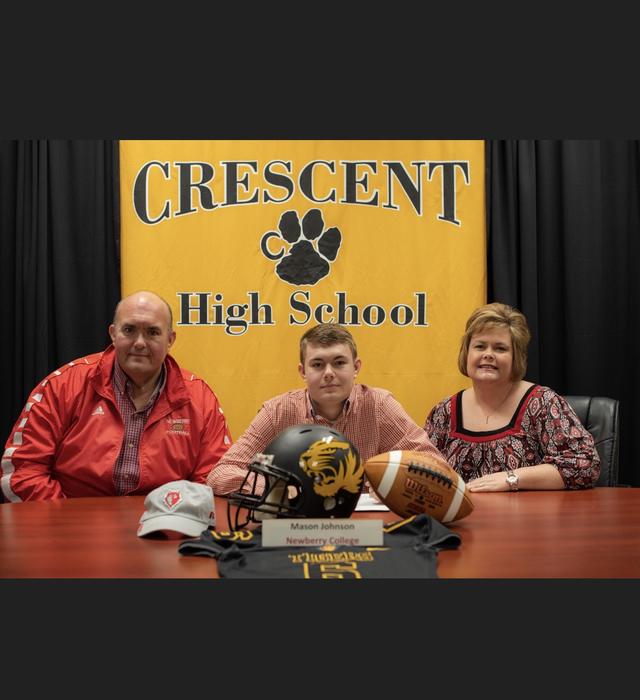 Mason will join the Wolfpack of Newberry College. 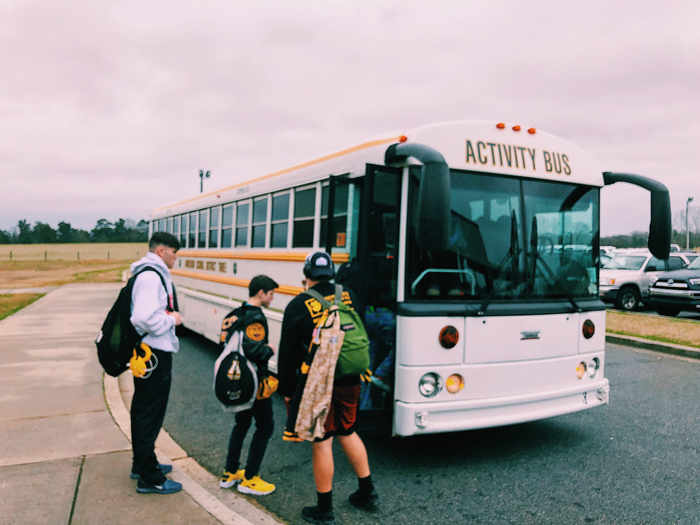 Good Luck and safe travels to the CHS Wrestling team as they head to Indian Land for the Upper State Championship! CRESCENT TIGER WRESTLING!!! Advances to the UPPER STATE CHAMPIONSHIP with a win tonight over Chester! Tigers will travel to Indian Land on Wednesday! 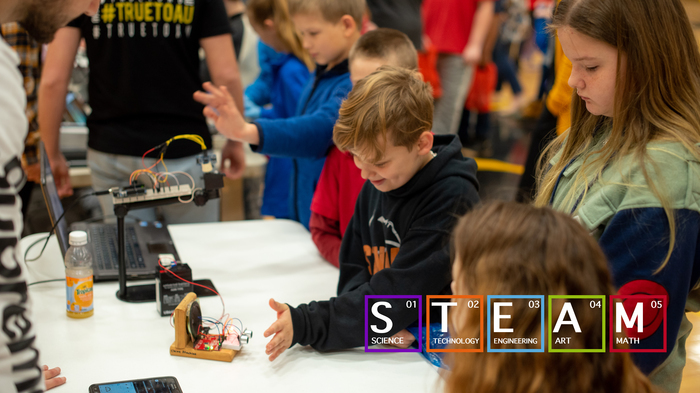 Due to large numbers of sickness, Flat Rock Elementary will not have our family STEAM night on Tuesday, February 5th. Thank you for your understanding. 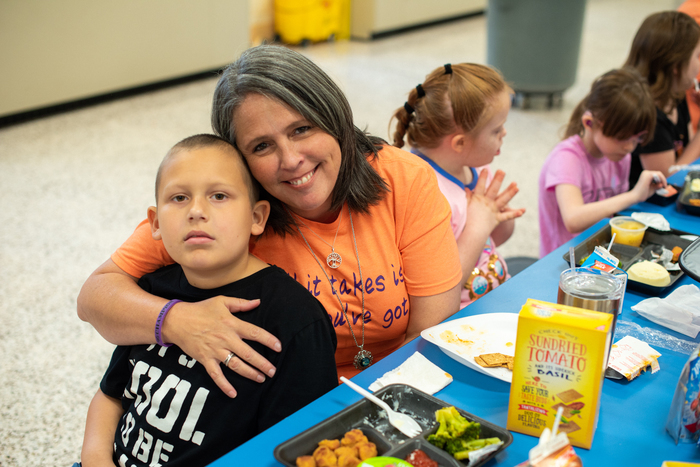 We want to keep our students and families healthy during this season. The Crescent High School Prom will be held on May 25th in the CHS New Gym. Congratulations to Mason Johnson. He has committed to Newberry College. While at Newberry, Mason will be playing football. Congrats Mason on this great accomplishment. We look forward to your success as a student-athlete at Newberry College. Your CHS family is so proud of you. 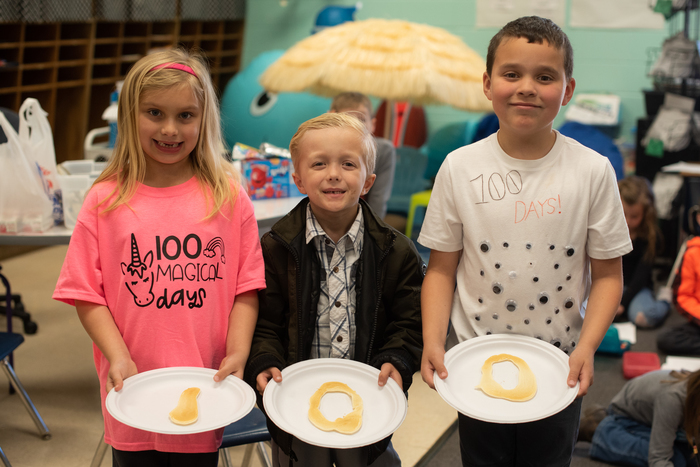 First grade at Iva Elementary cooked 100 pancakes after reading "The Wolf's Chicken Stew" and K-5 managed to fit 100 things on their shirts! 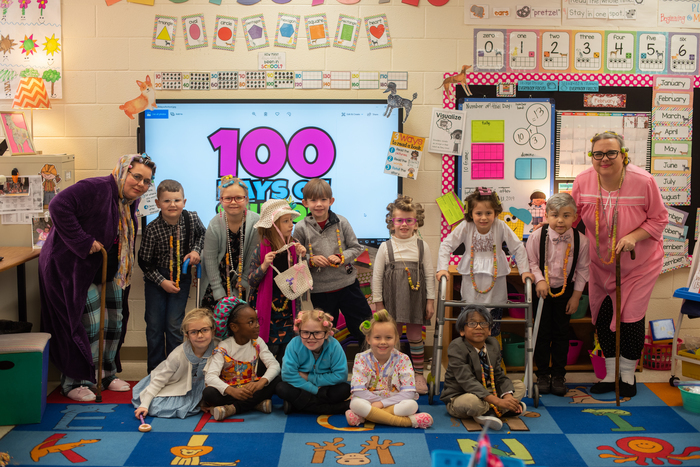 Flat Rock was feeling a little fragile today on the 100th day of school! TIGER NATION, please share...... With the HOME playoff Wrestling match on Monday, the JV Basketball game vs West-Oak will be played at Starr Iva Middle School. Girls will start at 5:30, Boys to follow. GOOD LUCK to both of our teams! Thanks for getting the word out! CRESCENT TIGER WRESTLING hosts Chester Monday night AT HOME in the 3rd Round of the Upper State Playoffs! Action starts at 6 PM. We need a BIG CROWD of Tiger fans there to support our wrestlers and coaches. Per SCHSL rules, only High School League passes are accepted, and admission is $6. PLEASE SHARE, we hope to see you Monday night! CRESCENT TIGER WRESTLING gets the Round 2 win over Broome today! Advances to the 3rd Round on Monday AT HOME! Action starts at 6 pm vs Chester High. 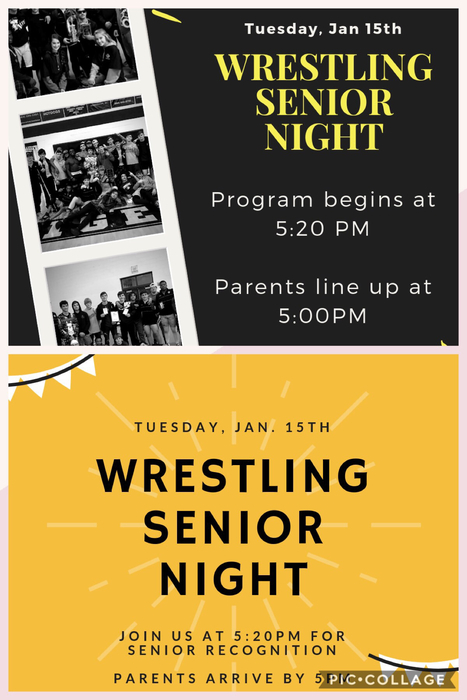 Come out and support our Tiger Wrestling Monday night! GO TIGERS!!! Crescent Tiger Wrestling defeats Camden in Round 1 of the Upper State Playoffs this morning! 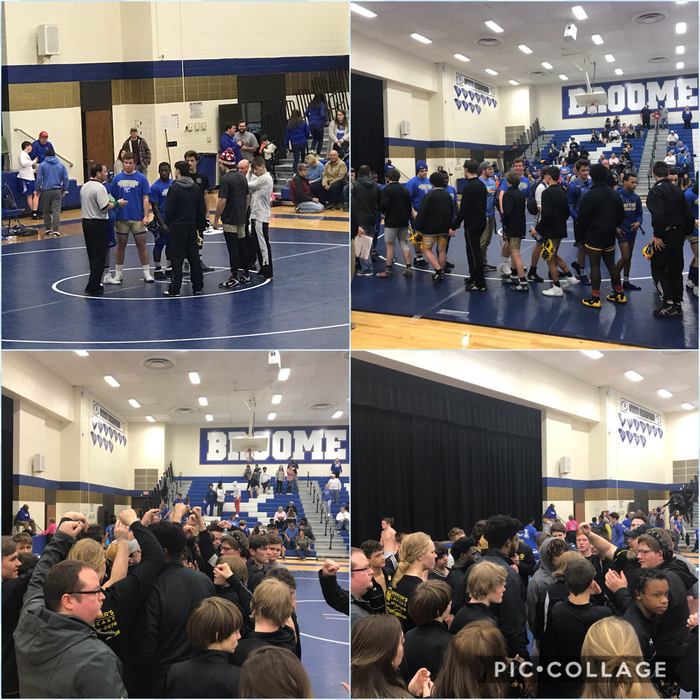 Up next is Broome in Round 2. That match begins shortly. GOOD LUCK TIGERS! 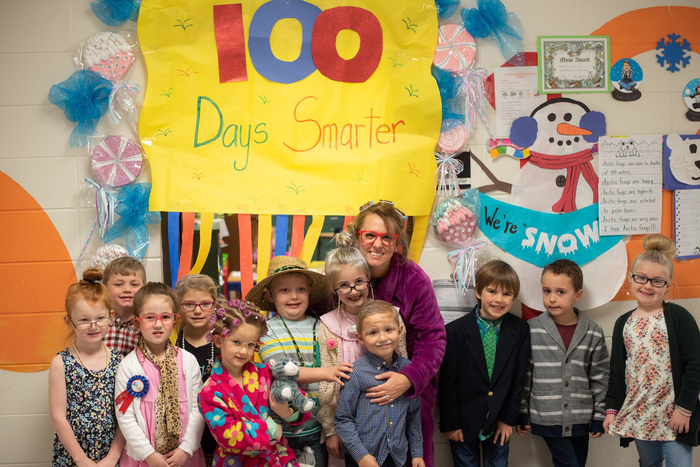 We are 100 days smarter at Starr! 2 out of 2 Tiger fans agree, there’s no better place to be on a Friday night than sitting court-side in the Tiger gym. PLAYOFFS!!! 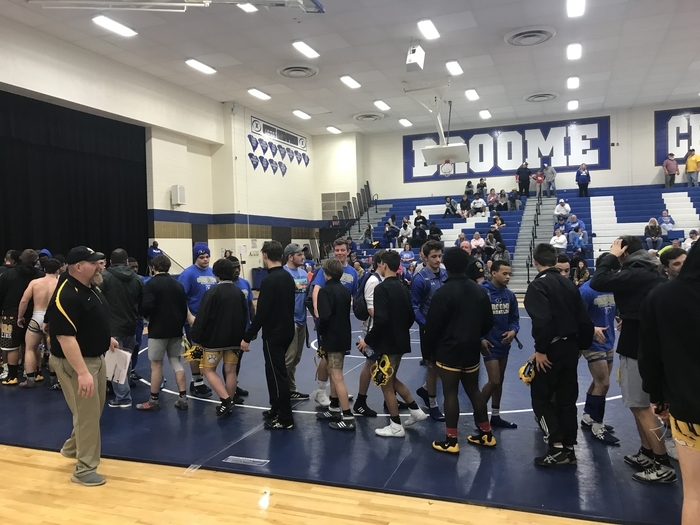 Crescent Tiger Wrestling opens the Upper State Playoffs on the road for Rounds 1 and 2 at Broome High School tomorrow. Actions starts at 11 am. GO TIGERS! 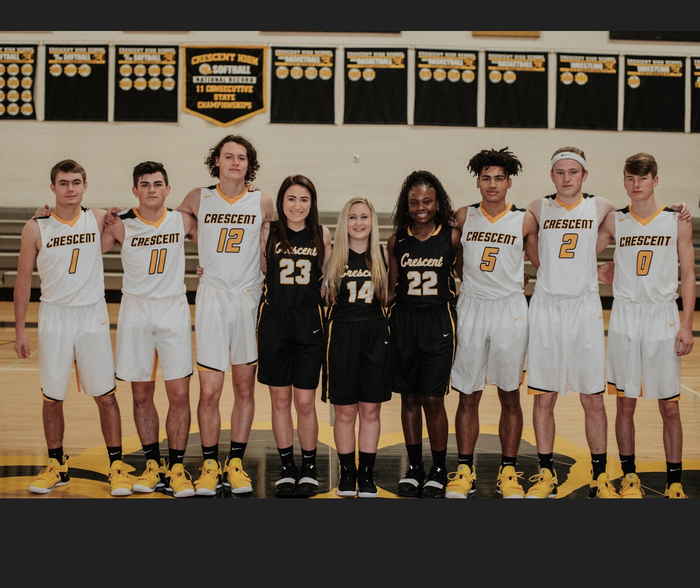 Friday night is SENIOR NIGHT for Crescent Tiger Basketball! Tigers will host Seneca....Girls at 6, Boys to follow. Come out and support our Tigers as we honor our seniors. 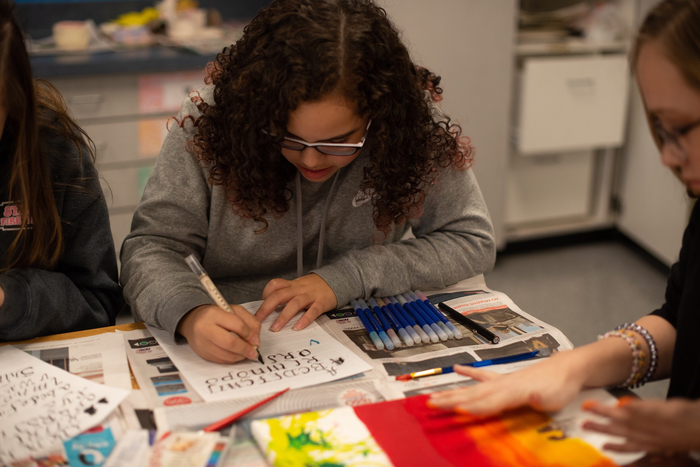 The art of calligraphy being practiced in the art room at SIMS! 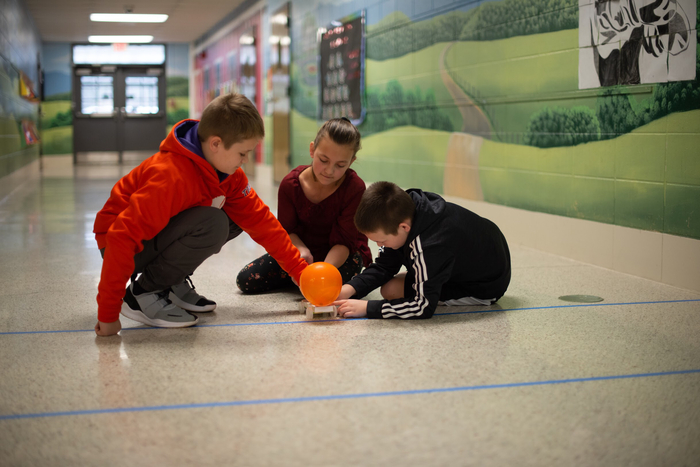 As Jet Toy continues across the district, we witnessed some amazing prototypes being tested at Starr! Congratulations to Dawson Merk. 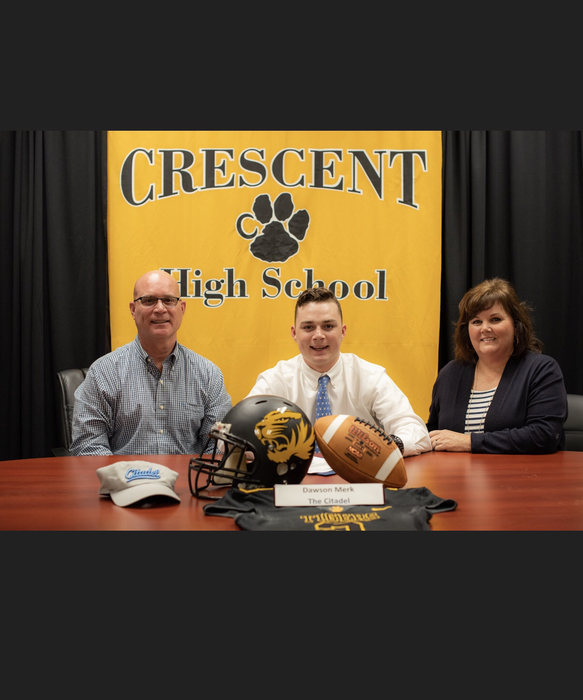 Dawson will be attending the Citadel where he will also be playing football. This is a huge accomplishment! Congratulations Dawson! We are proud of you and look forward to hearing great things as you continue your educational journey as a student athlete at the Citadel. 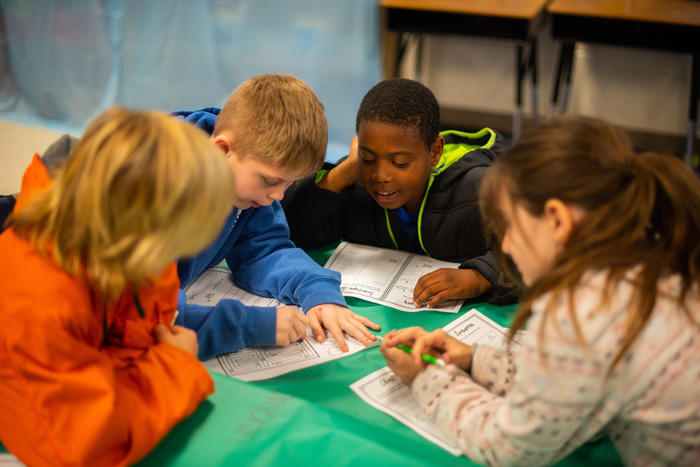 3rd grade at Flat Rock discussed the states of matter on Thursday. 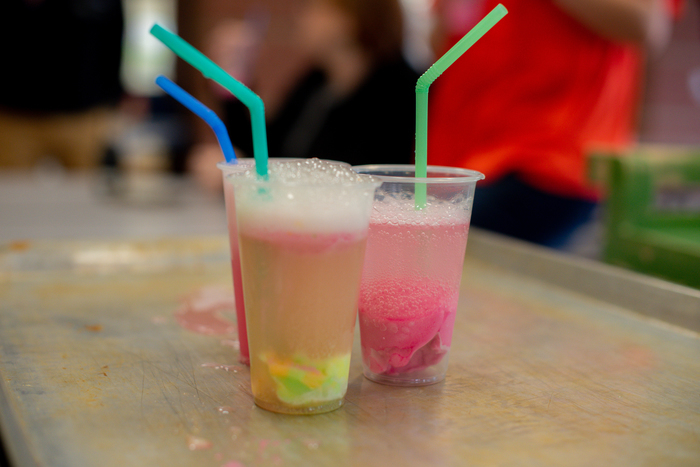 By using sherbet as a solid, and Sprite as a liquid they created a gas by pouring the Sprite over the sherbert. 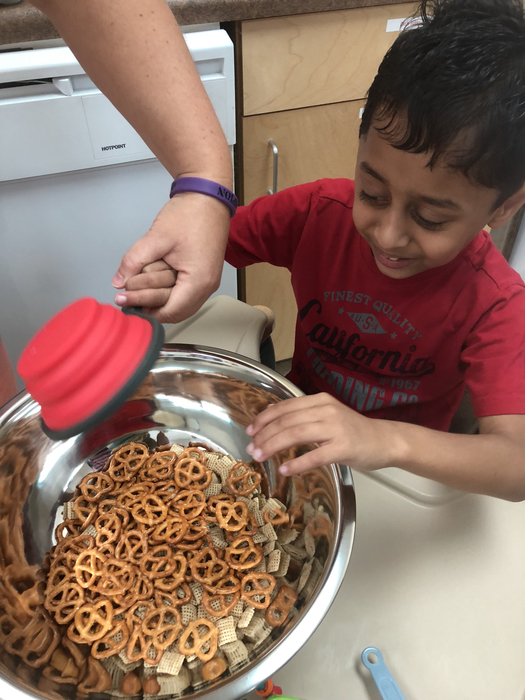 It made for an educational and delicious experiment! 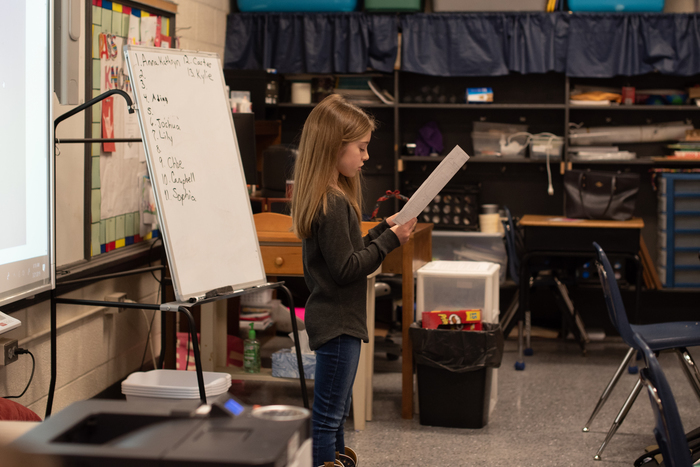 Congratulations to our classroom spelling bee winners and our school winner- Lindsay Frith! First runner up was Jozie Stone. Crescent Tiger Basketball is AT HOME on Tuesday in another important region game for both teams! Girls play at 6, Boys to follow. Come out and cheer on our Tigers! 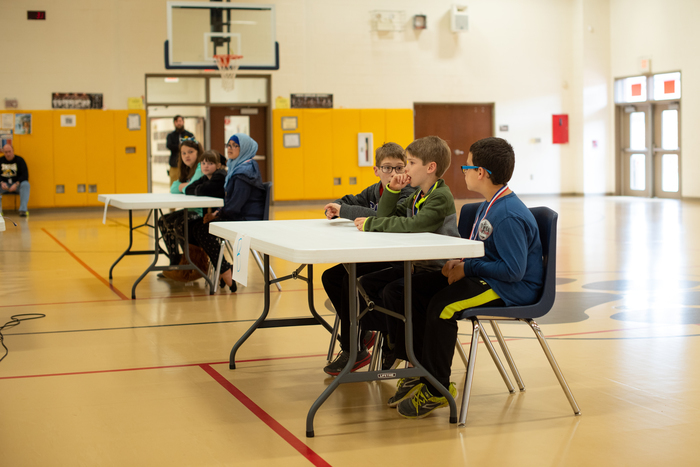 Just a reminder that the SIMS school spelling bee will be held tomorrow morning (Tuesday, Jan. 22) at 8:45 in the library. 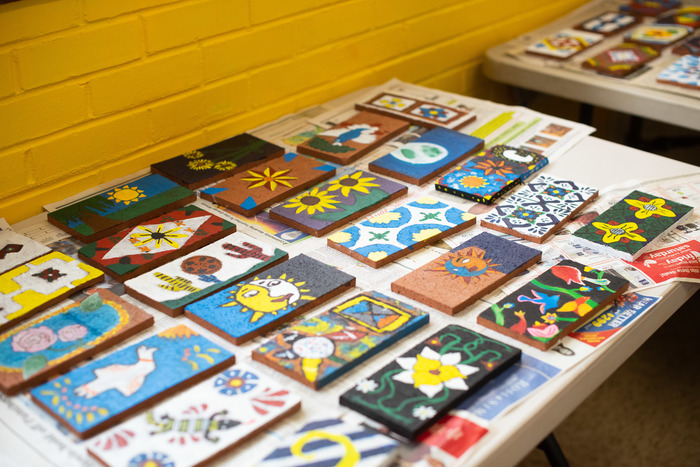 January is board member appreciation month, and we are so very thankful for our board members! 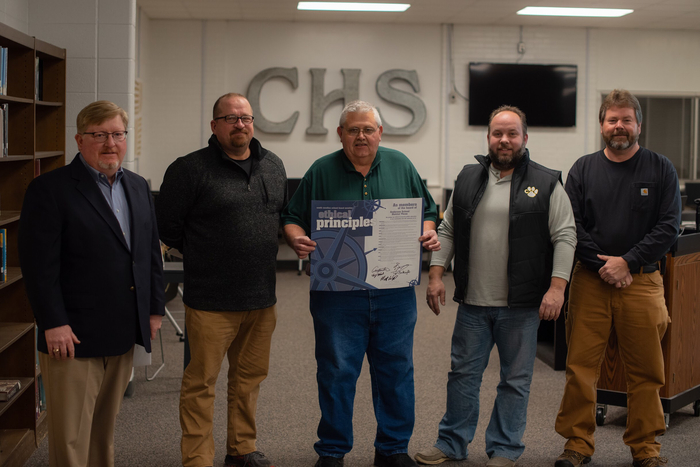 Thank you, Curtis Wiles, Danny Owens, Larry Holbrook, Tripp Bouknight, and Marty Watt for your hard work and dedication to the students of Anderson School District Three. 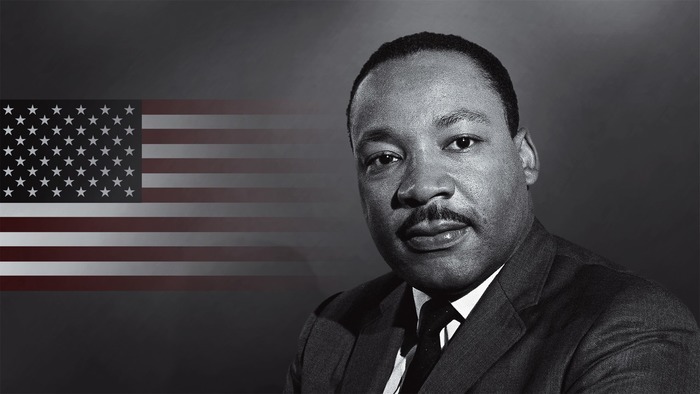 Schools and offices will be closed on Monday, January 21st for Martin Luther King, Jr. Day. 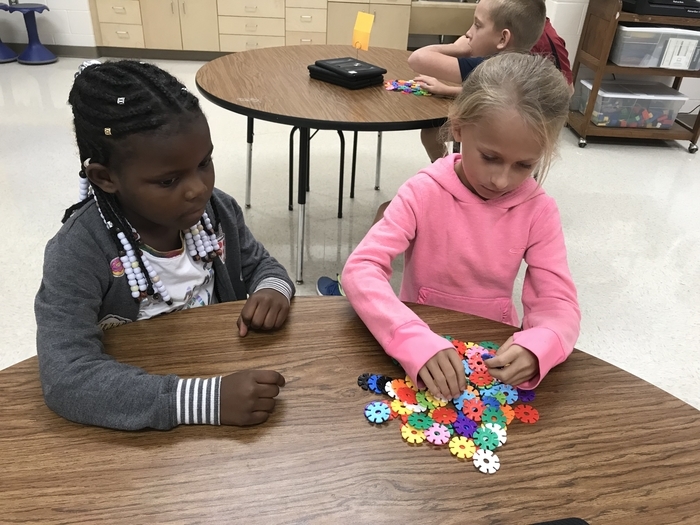 Mrs. Herron's K-5 class at Flat Rock studied characteristics of winter and completed a winter snowflake STEM project. 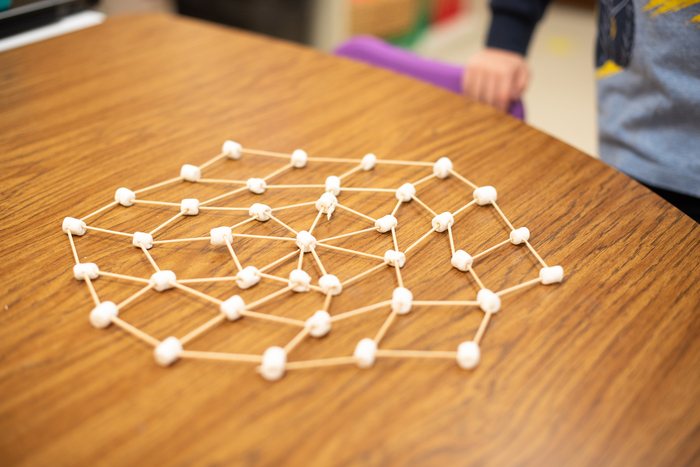 They identified 2-D shapes within a snowflake as they connected toothpicks and marshmallows! It was SNOW much fun! 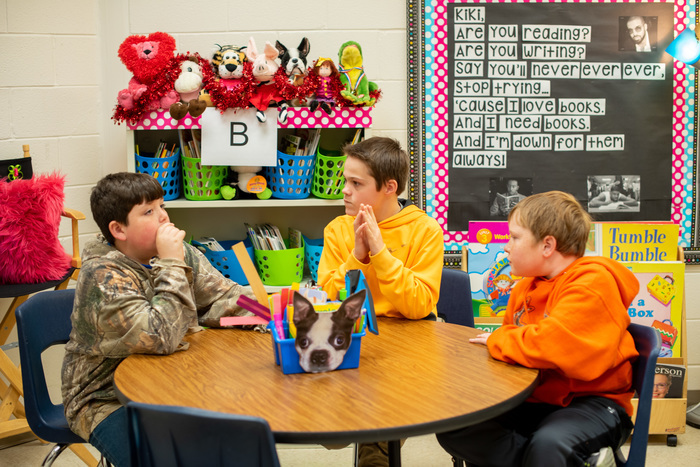 SIMS Spelling Bee will be held on Tuesday, January 22 at 8:45 A.M. in the library. BIG night at CHS tomorrow night as Crescent Wrestling hosts West Oak, Eastside, and Westside! It’s Senior Night as well.....come out and support our Tigers! BE THERE! Crescent Tiger Basketball has a triple header AT HOME against region rival Pendleton on Friday. JV boys will play at 5, and the Varsity Girls and Boys will follow at approx. 6:30. It’s also Basketball Alumni Night! Let’s pack the gym for this important region contest for our Varsity teams! GOOD LUCK TIGERS! CRESCENT WRESTLING gets a BIG region victory over Powdersville! Also defeats Carolina High to make it a 2-0 night! CONGRATS TIGERS! Crescent Tiger Winter Online Store opens soon! STORE OPENS ON MONDAY, JANUARY 14. Check out the pic for a preview of the items that will be available. A link to the store will be sent out on Monday.....order between January 14-28! GO TIGERS! Congratulations to Nicholas Frost, our 2018-2019 Iva Elementary Spelling Bee Champion! 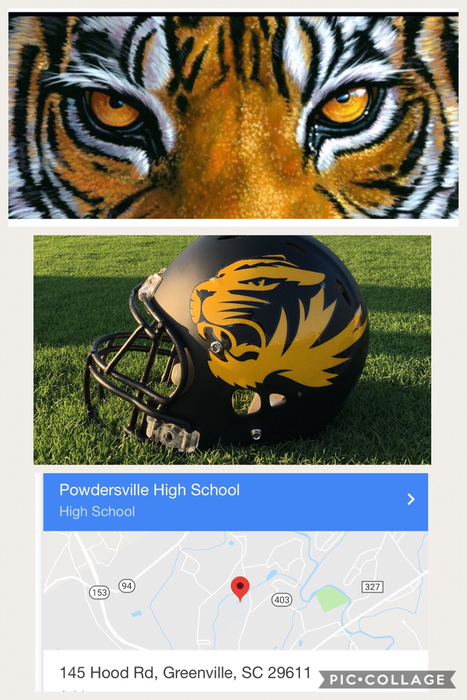 Tiger Nation.....come out Thursday night to support our Wrestling Team in a HUGE match vs region opponent Powdersville as well as Carolina High School. We need a big, supportive crowd of Tiger fans there! Action starts at 6:00 pm. See you there! 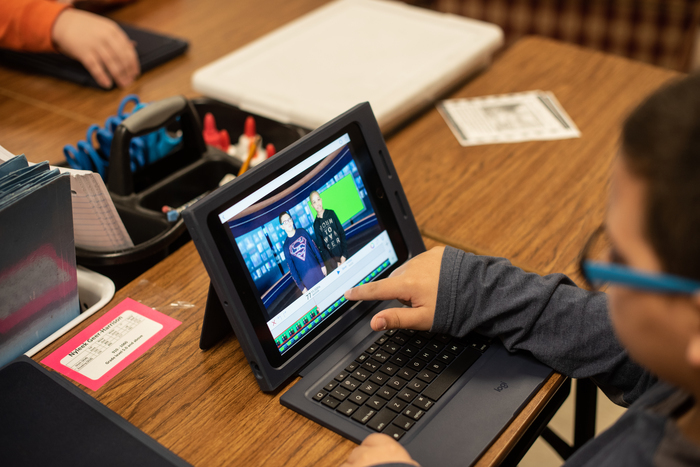 Mrs. Dutton's 4th grade class at Flat Rock used iPads paired with a green screen to create weather reports for cities across the US! 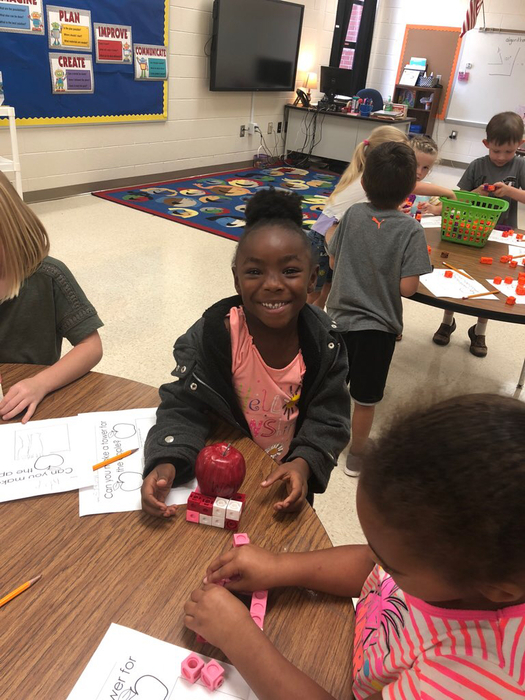 This week students in Mrs. Fowler's class at Starr Elementary began designing and building prototypes for the Jet Toy Challenge! 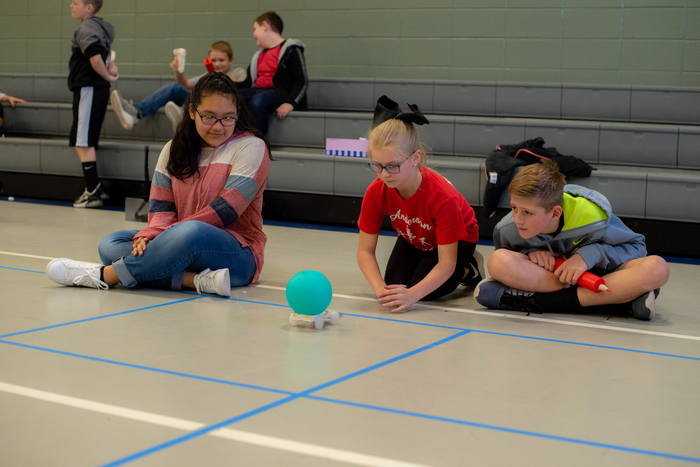 At Starr-Iva, students in Mrs. Cape's 7th-grade robotics class worked to code VEX robots! 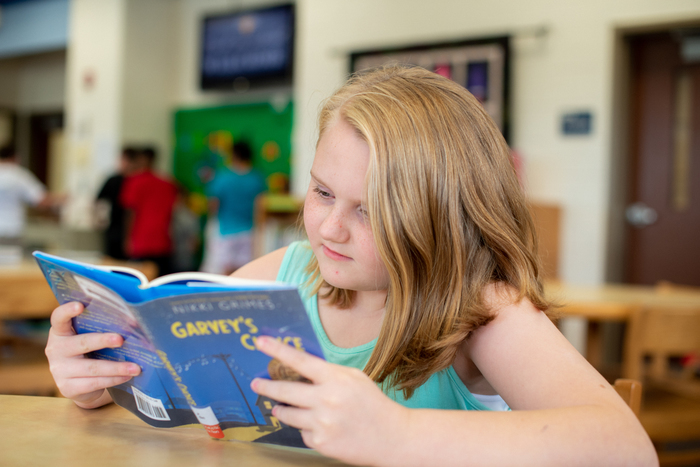 Picking out new books is always the best part of library day! 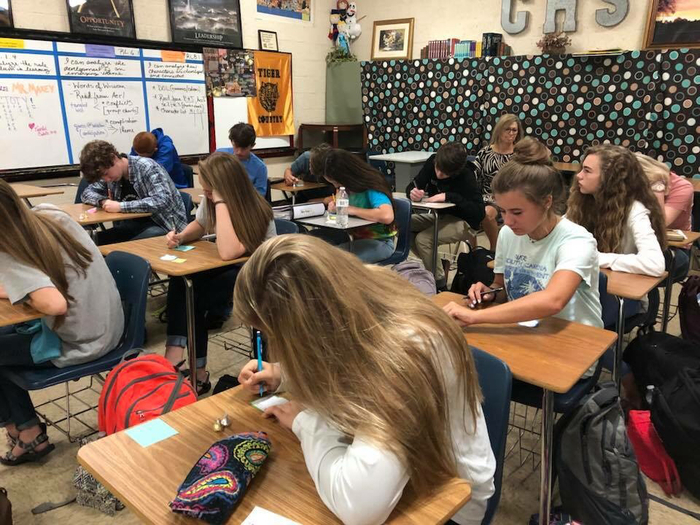 Jimmy Armstrong, Assistant Executive Director of Instruction for the New Anderson Institute of Technology, reviewed course offerings with 9-11th grade students today at Crescent High School. 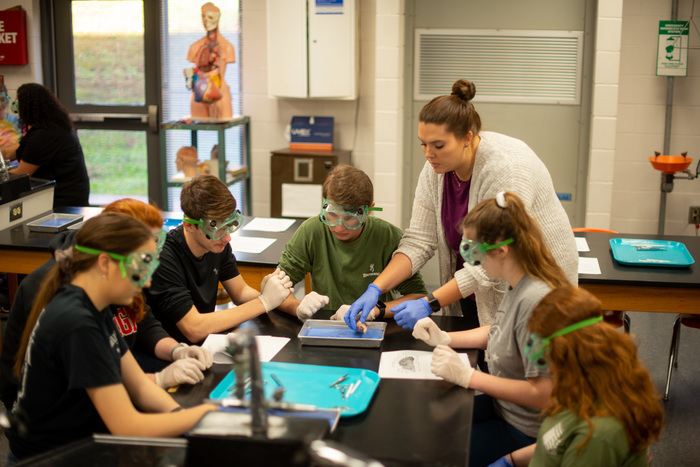 CHS students will begin enrolling at AIT in the fall of 2019. 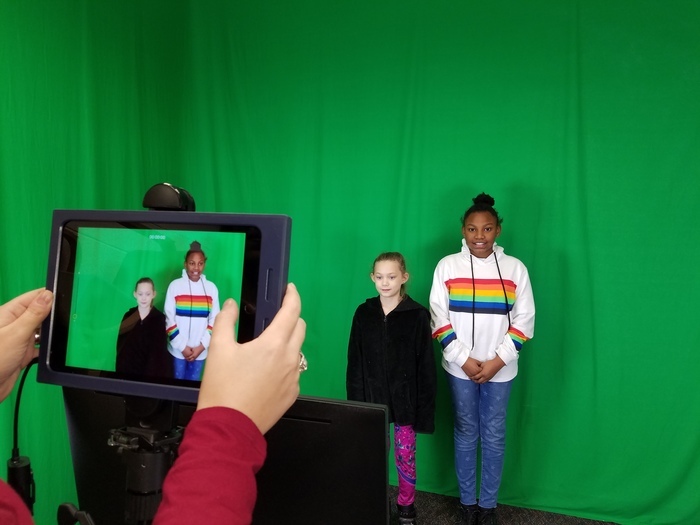 4th grade students at Flat Rock Elementary create meteorologist news reports using the green screen. 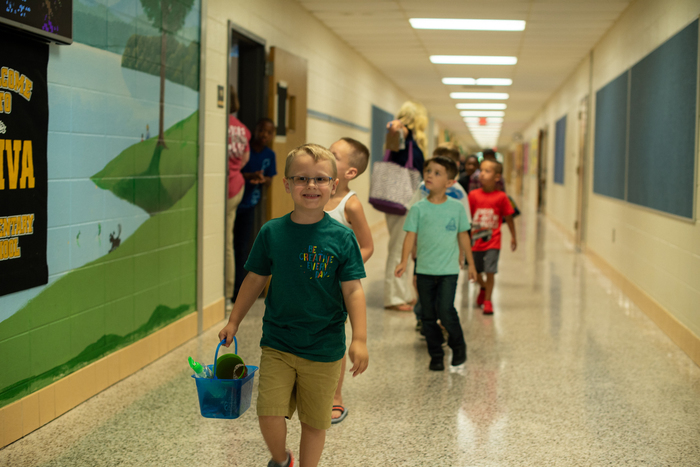 Anderson District 3 is now posting vacancies for the 2019-2020 school year. 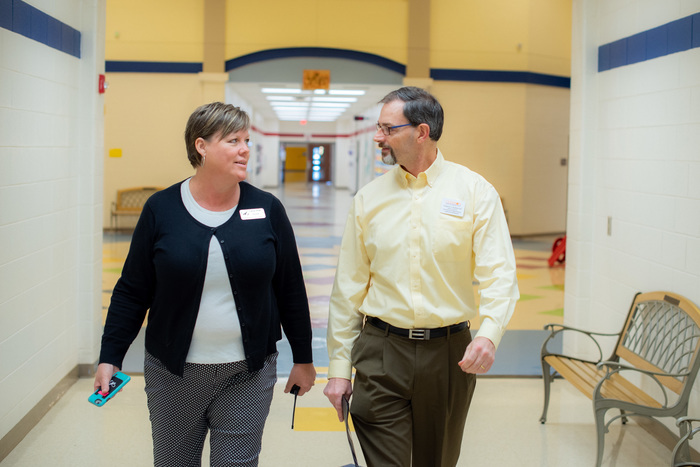 Recently added to the list are the principal positions at Crescent High School and Iva Elementary School, a guidance counselor position, business teacher, and science teacher positions at Crescent High School. 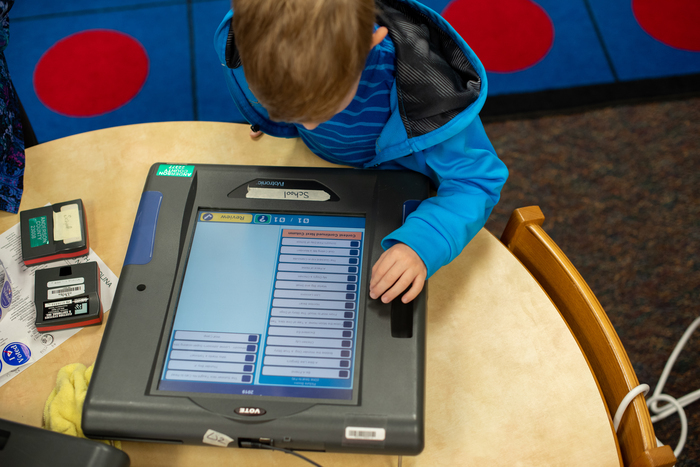 For more information, refer to our website at acsd3.org. 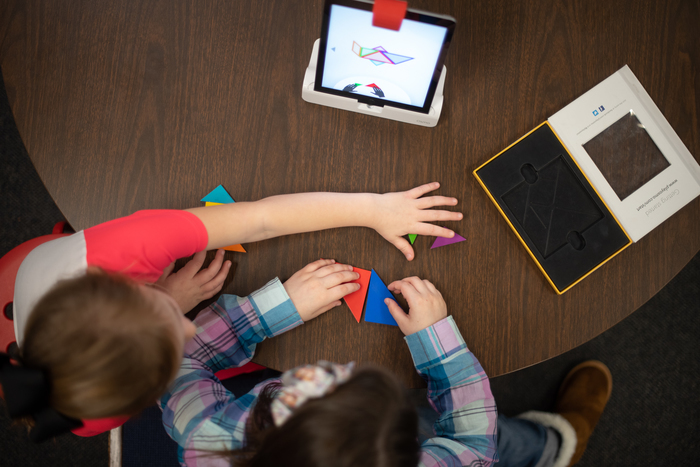 Students at Iva Elementary use the Osmo to transform iPads into a hands-on STEM learning tool. Crescent Varsity Boys Basketball defeated Anderson Christian Friday night to finish on top and undefeated in the 2018 Christmas at Crescent Tourney! CONGRATS Tigers! Crescent Varsity Wrestling goes 5-3 for the weekend at the Smoky Mountain Duals in Pigeon Forge to finish in 7th place out of 30 teams, competing VERY WELL against some of the strongest high school wrestling programs across the Southeast. Way to go Tiger Wrestling! 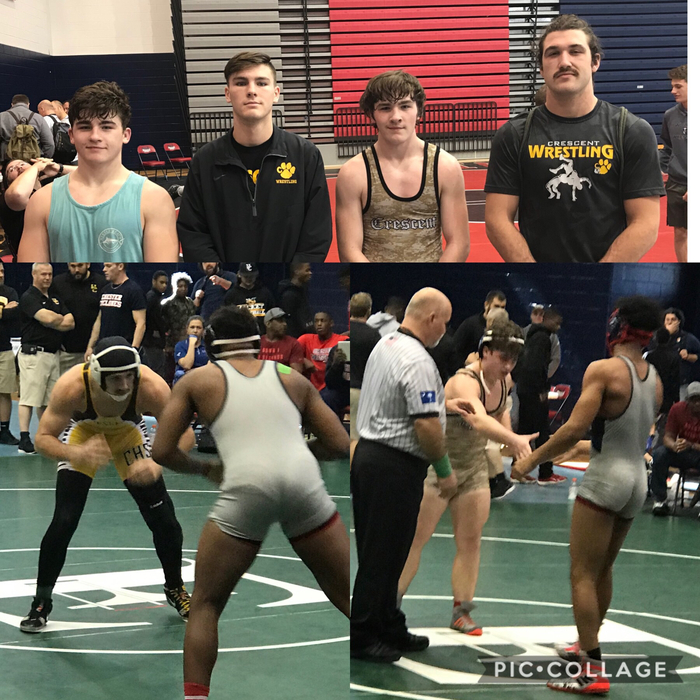 Day 2 of the Smokey Mountain Duals Rounds 2 & 3: Crescent loses to West Forsyth (GA) 48-30 but defeats Jackson County (GA) 42-36. Go Tigers!! Crescent Tiger Boys Basketball defeats Ware Shoals tonight in the Christmas at Crescent Tourney! Will play Anderson Christian tomorrow night in the Championship round on the boys side. Our Varsity Girls will play TWO games tomorrow in the round-robin format of the Girls Tourney. Schedule for Friday is below! 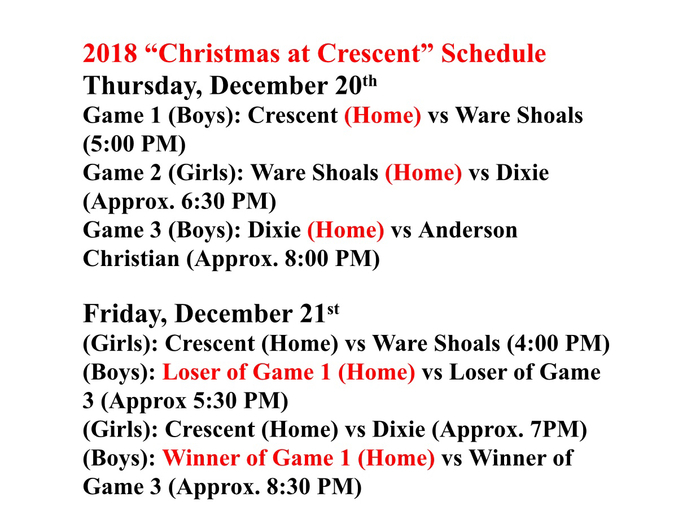 CHRISTMAS AT CRESCENT Friday, December 21st: (Girls): Crescent vs Ware Shoals (4:00) (Boys): Dixie vs. Ware Shoals (5:30) (Girls): Crescent vs Dixie (Approx. 7:00) (Boys): Crescent vs Anderson Christian (Approx. 8:30) COME OUT AND SUPPORT TIGER BASKETBALL! 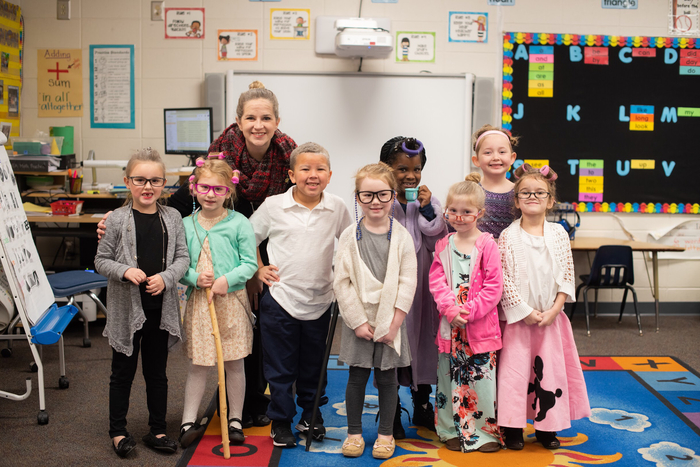 4 Year/5 Year Kindergarten Registration is Wednesday, January 23, 2019 between 8:00 AM and 12:00 Noon. 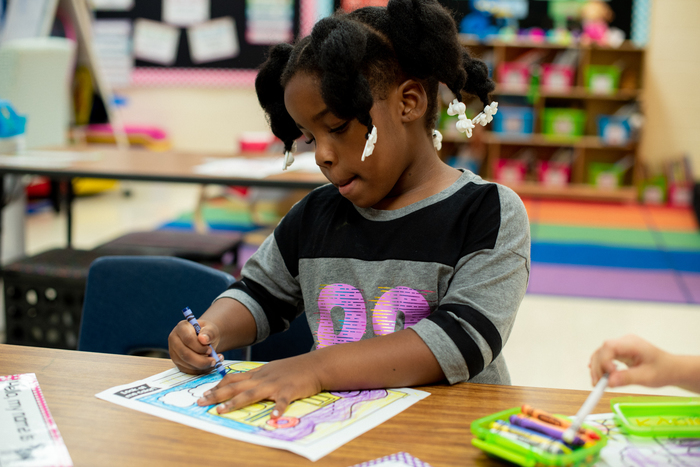 Register at the elementary school your child is zoned to attend: Iva Elementary School, Flat Rock Elementary School, or Starr Elementary School For questions, call the Parenting Office 864-352-3513 *Children must turn 4 years old on or before September 1, 2019 to attend K4 next school year and 5 years old on or before September 1, 2019 to attend K5 next school year. 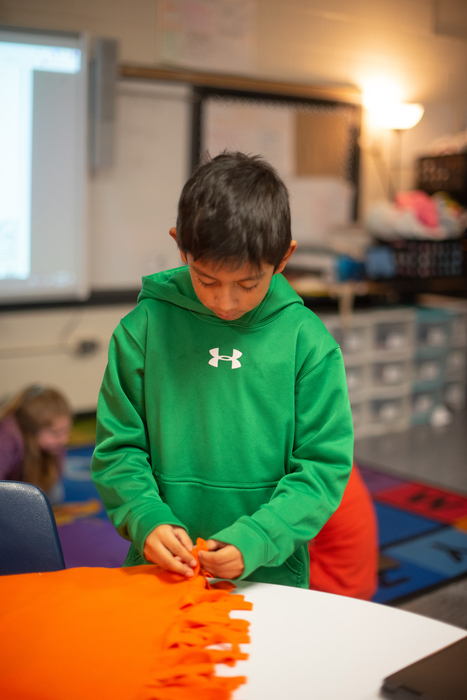 Starr Elementary 5th graders are designing and building bridges today... in their pajamas! 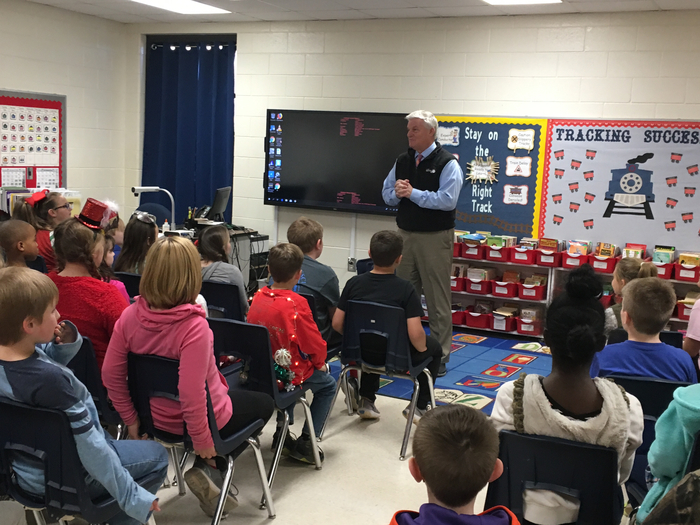 Flat Rock Elementary fourth graders have enjoyed spending time with WWYF4 meteorologist, John Cessarich. 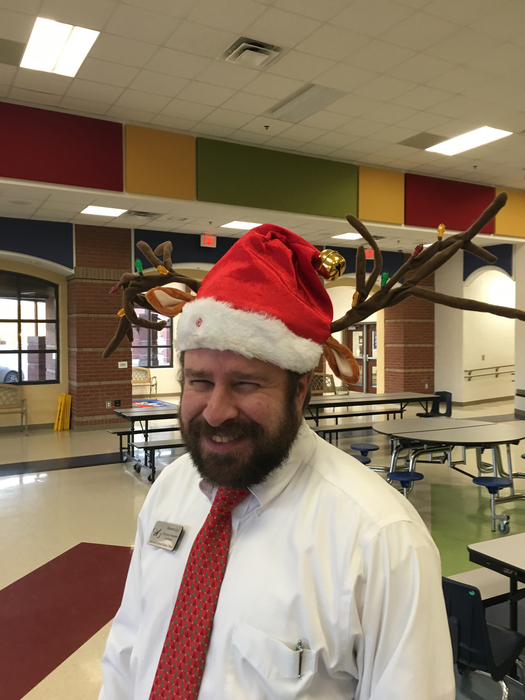 Mr. Bibb came to wish the students at Flatrock Elementary a Merry Christmas! Come out and support our Crescent Tiger Girls and Boys Basketball teams this Thursday and Friday at the Christmas at Crescent Tourney...... Schedule is here! CONGRATS to Crescent Varsity, JV, and Starr Iva Wrestling on a GREAT day and weekend! 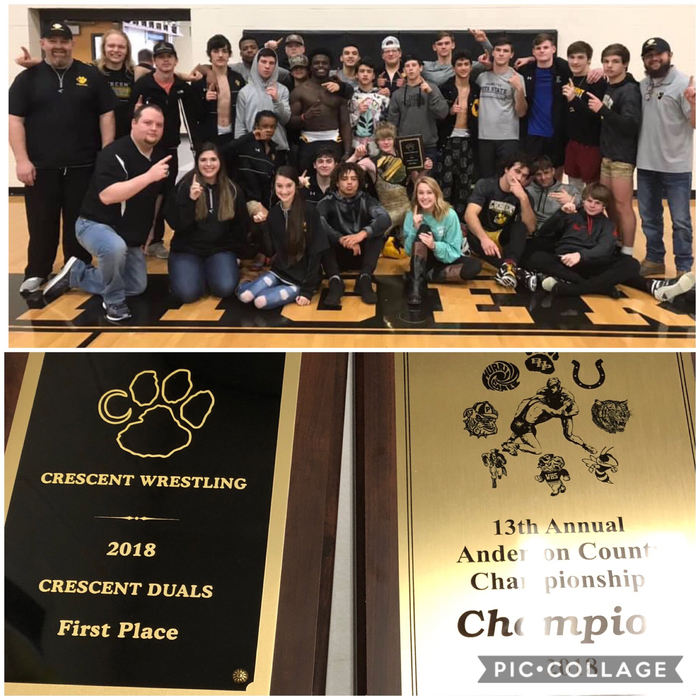 Crescent Tiger Wrestling went 5-0 on the day to follow up last night’s win at the Anderson County Championships by winning the Crescent Duals today! Also, at the BHP qualifier today, our Middle School team qualified 13 wrestlers with four 1st place finishers, while our JV team qualified 5 with two first place finishers! Tiger Proud of our Wrestling teams this weekend. The present and future is bright! Crescent Tiger Basketball Girls and Boys teams BOTH get wins on the road at Dixie tonight! Proud of our Tigers! CONGRATS ! Full house at Flat Rock tonight! 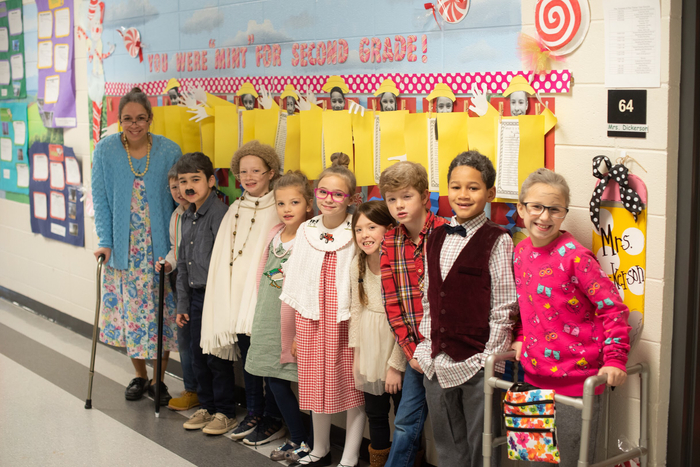 Our third graders are awesome! Crescent Tiger Wrestling goes on the road to Woodruff tonight! GOOD LUCK to our Middle School, JV, and Varsity teams! 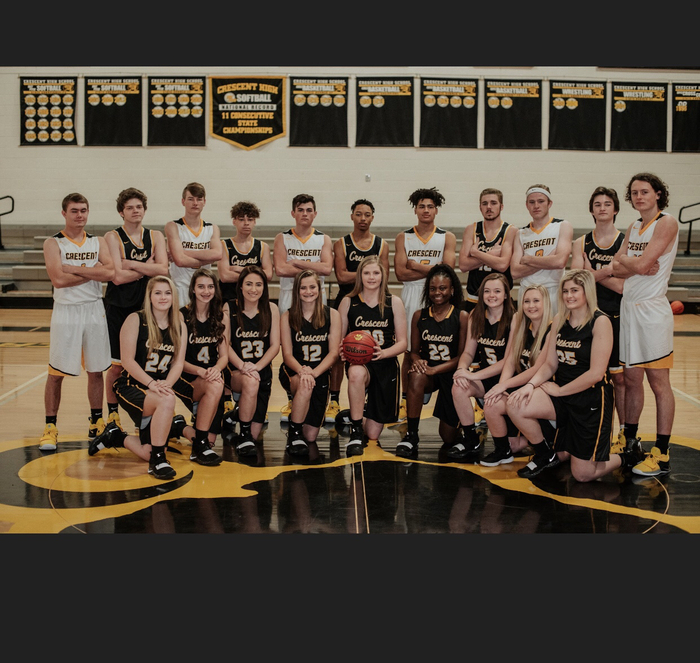 GOOD LUCK to Tiger/Cub Basketball today! * JV and Varsity Boys host Anderson Christian starting at 5:00 pm * Starr Iva Girls and Boys host Dacusville starting at 5:30 Hope to see you there! Crescent Varsity Boys Basketball gets the 55-52 win over Walhalla tonight! GO TIGERS! Substitute training scheduled for tomorrow, December 11th, has been cancelled due to the two hour delay. If you received an invitation to attend you will be contacted with a make-up date as soon as possible. Anderson School District 3 will be on a 2 hour delay Tuesday, December 11th. 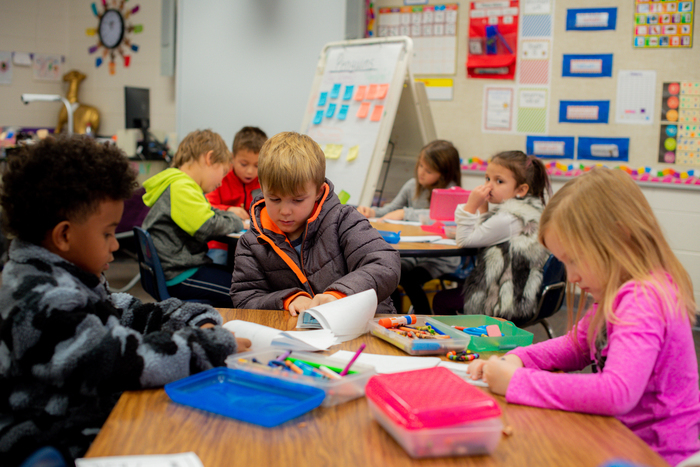 The Board of Trustees will meet tonight, Monday, December 10, at 6:30 at the district office. Please note the change in location for the meeting. Due to the winter weather and dangerous driving conditions, all schools in Anderson 3 are closed on Monday, December 10, 2018. Stay safe and warm. The Iva Christmas Parade has been cancelled today. Tiger Nation....get in the spirit of the season tonight! 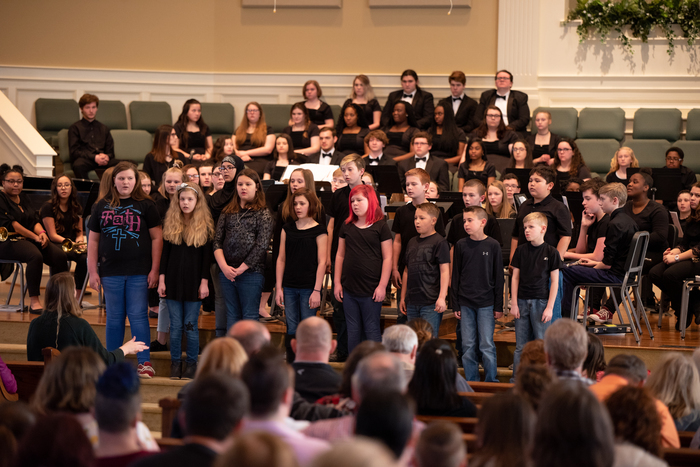 The Winter Concert, featuring the Starr-Iva and Crescent band/choral groups, is TONIGHT at First Baptist Church of Iva. The concert will begin at 6 PM. Come see and hear some of the talent in our district! TIGER PROUD of Crescent Tiger Basketball tonight! Girls and Boys teams both get victories over Dixie at home! GO TIGERS! Crescent Tiger Basketball is AT HOME tonight vs Dixie! JV Boys will start at 5, and the Varsity Girls and Boys doubleheader will follow. Come out and support TIGER BASKETBALL! 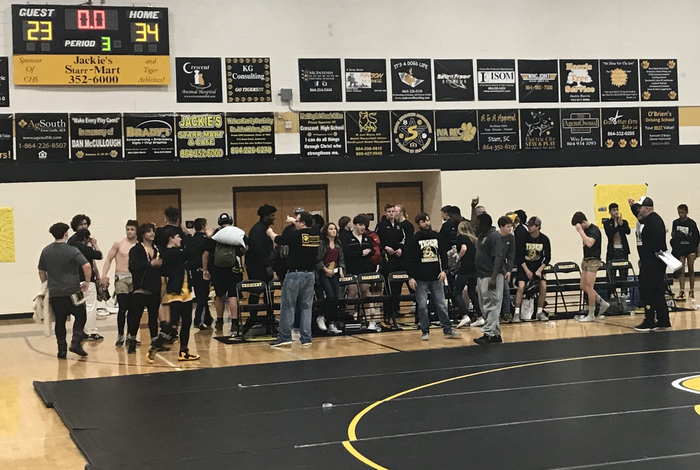 Crescent Tiger Wrestling gets wins tonight over BHP, Greer, and Greenwood! Way to go TIGERS and CONGRATS! 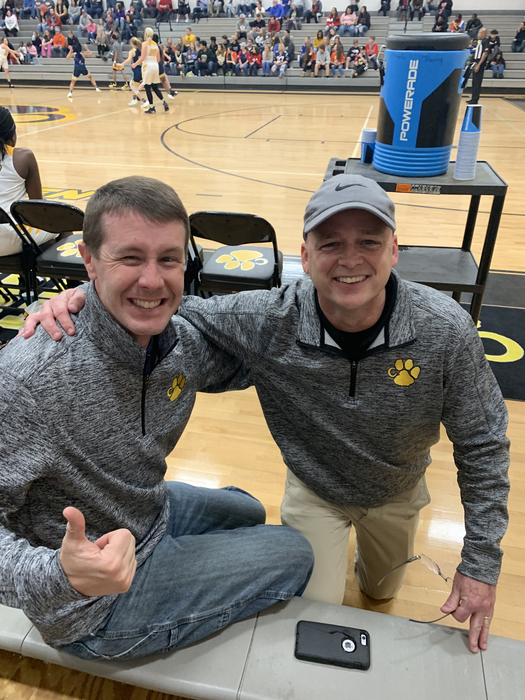 Great to have Crescent Coach Anthony Martin and former CHS/current BHP Coach Chris Strickland competing with their teams at Crescent tonight! 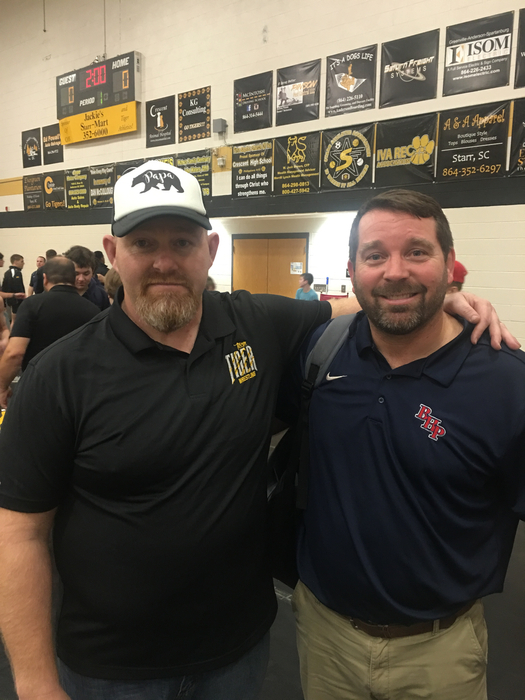 Two high quality men with outstanding wrestling programs! 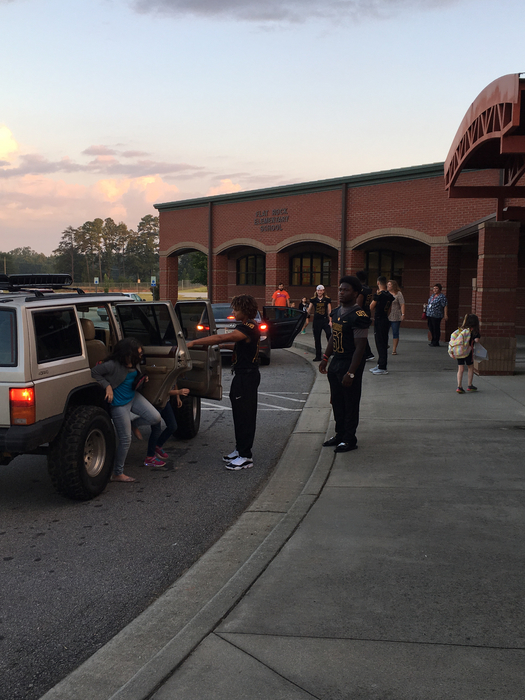 Flat Rock was proud to have our CHS wrestlers help greet our students this morning. CRESCENT WRESTLING opens the HOME season on Tuesday night as they host BHP, Greer, and Greenwood! Come see some exciting, outstanding competition! Matches start at 6 pm, BE THERE! 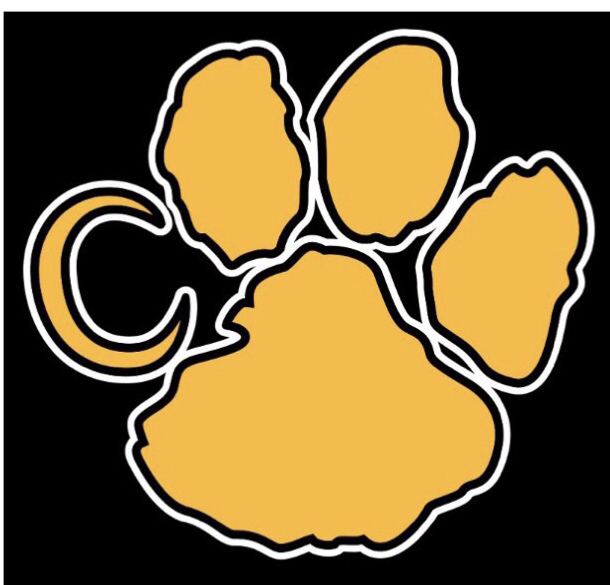 CONGRATS to Crescent Tiger Boys Basketball... decisive victory over Ware Shoals tonight! JV Boys and both Varsity teams will be back at HOME against Dixie on Wednesday. JV Boys will start at 5, Girls and Boys games will follow. See you there, Tiger Nation! Crescent Lady Tiger Basketball..... VICTORIOUS on the road at Ware Shoals tonight! 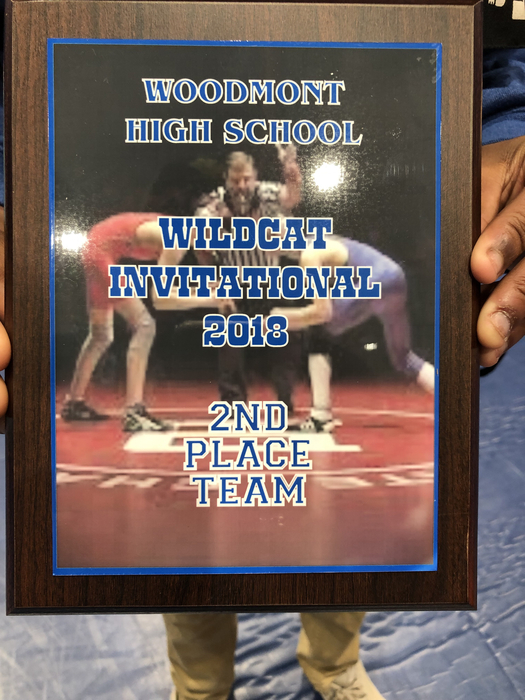 Crescent Tiger Wrestling Places 2nd overall at a competitive Woodmont Invitational this weekend! Individual Results below... Jamie Ellis 1st CC Spires 1st Isaiah Hubbard 3rd Murphy McBride 3rd Justin Tillman 3rd Alex Donald 4th Aquan Whitlock 4th Cade Williams 4th Jaheim Bowman 5th Cameron Grubbs 5th CONGRATS as well to Tiger Senior Murphy McBride who won his 100th career match today! CONGRATS to Crescent Lady Tiger Basketball....50-46 winners over Ware Shoals tonight! 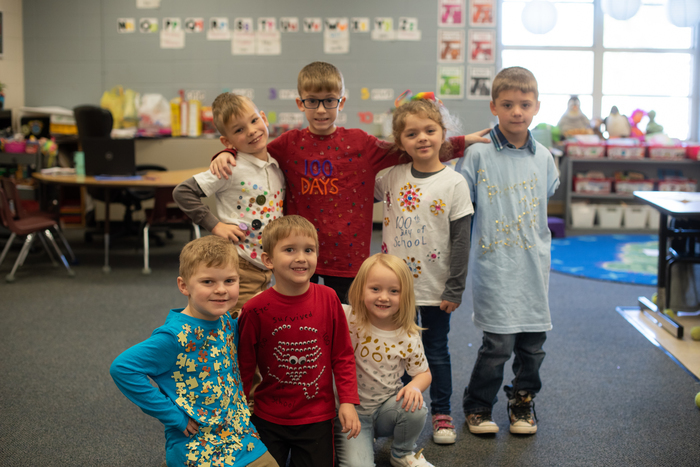 This is a reminder that Flat Rock Elementary School will have a pajama day tomorrow, November 30th. There is no cost to participate in this event. Tiger Basketball Schedule Changes for this Week! * Thursday, November 29 - there will be NO JV game vs Ware Shoals on Thursday; the Varsity Doubleheader will start at 6:00 pm ****The JV Boys/Varsity doubleheader originally scheduled for Friday (Nov. 30) vs Dixie will now be played on WEDNESDAY, DECEMBER 5. Same start times. GO TIGERS! GOOD LUCK today to Crescent Tiger Basketball! Both the JV and Varsity Tigers open on the road at Walhalla....JV Girls and Boys start at 5:30, Varsity Girls and Boys start at 6. 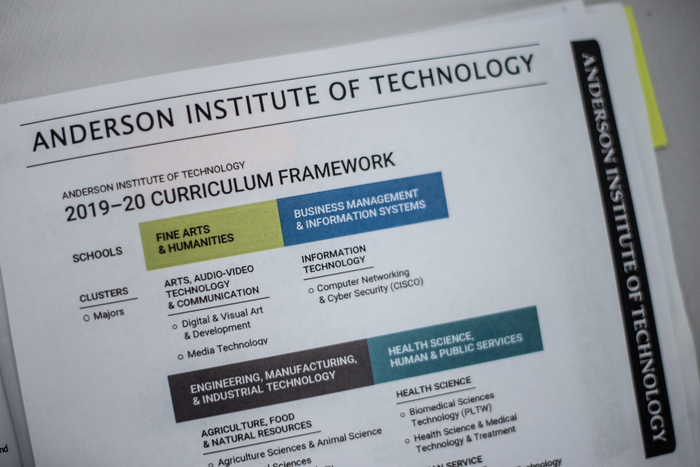 CHS will host an informational meeting on Wed. Nov. 28 at 5:30 in the commons area for parents and students who would like to learn more about the Anderson Institute of Technology. This is an exciting time for students in our community - please make plans to attend! 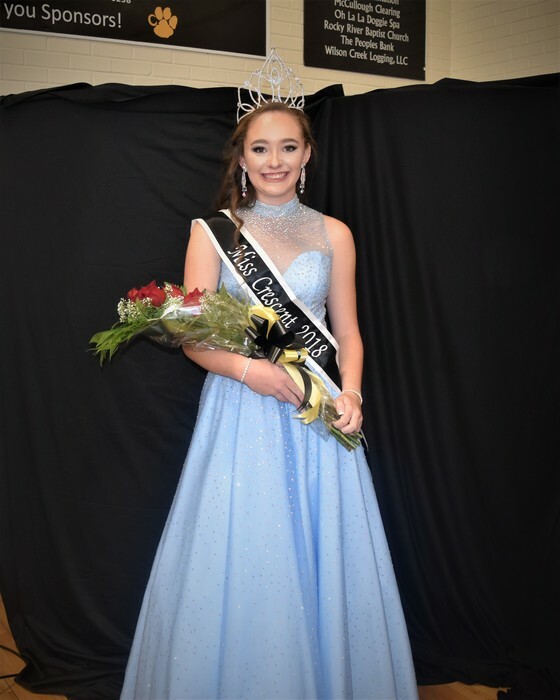 Congratulations to Miss Crescent 2018, Lauren West! 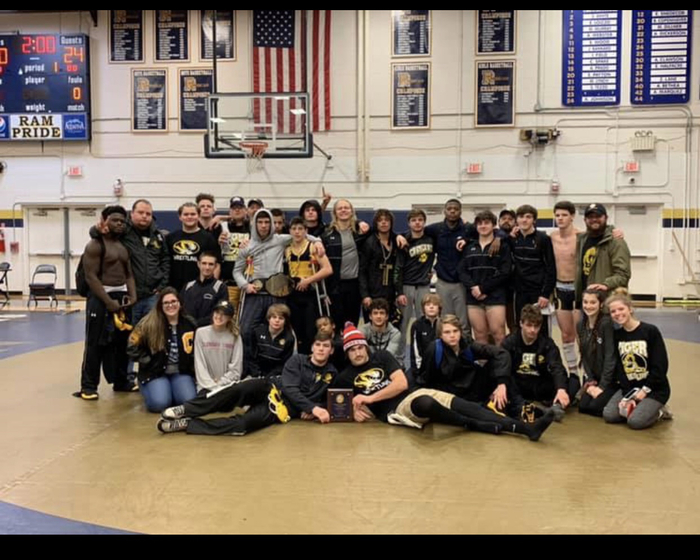 Crescent Tiger Wrestling WINS the Franklin County Preseason Duals... second year in a row! Great way to roll into the regular season next week! GO TIGERS! Starr Iva Lady Cubs with the win over Honea Path tonight! Great job girls! 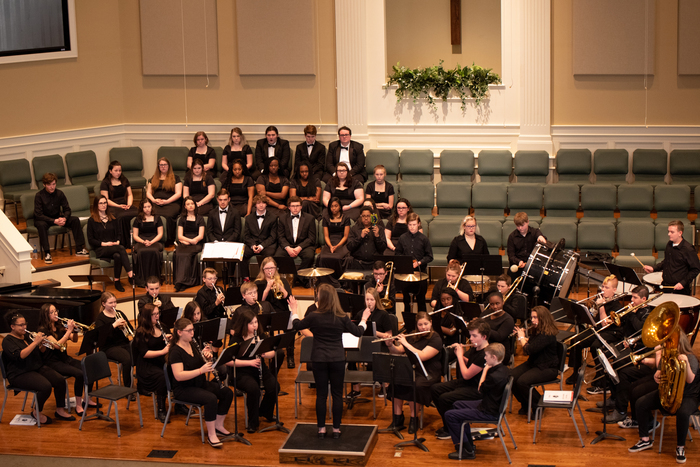 The Winter Concert, featuring band and choral groups from SIMS and CHS, will be Thursday, December 6 at 6 PM at First Baptist Church of Iva. 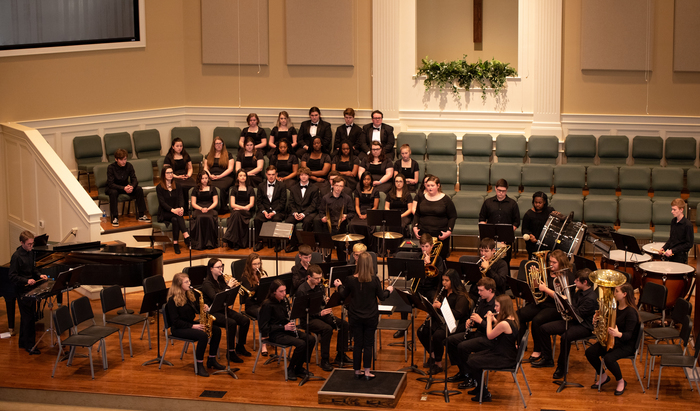 We look forward to showcasing our middle and high school musicians and hope you can join us! 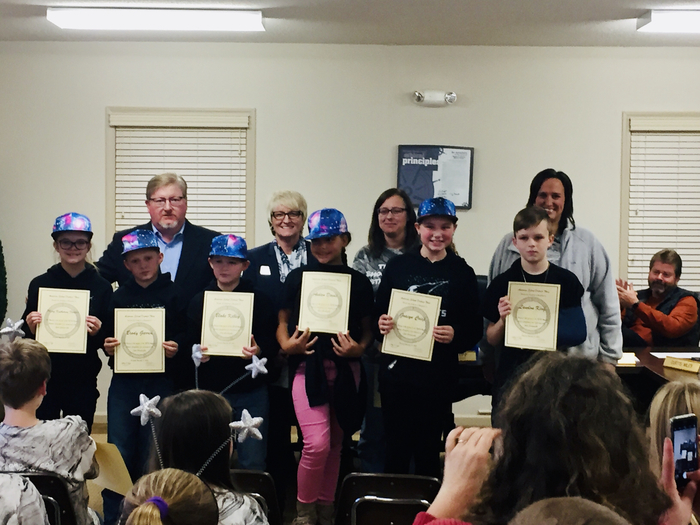 Starr Elementary robotics teams earned commendations from the Anderson 3 Administration and Board Members for their excellent showing at the Tri-County Robotics Competition . 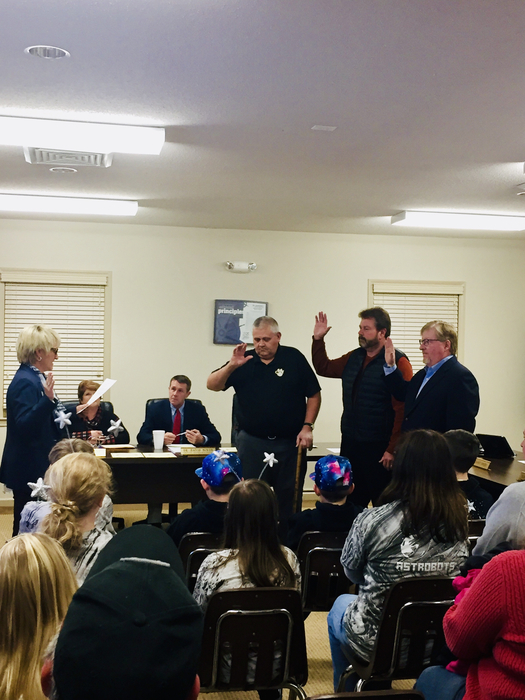 Larry Holbrook, Marty Watt, and Curtis Wiles were sworn in tonight to serve on the Anderson 3 School Board for another 4 year term. Parents and community members got a sneak peak into a day in the life of a 6th grade band and/or chorus student tonight at the 6th grade concert. 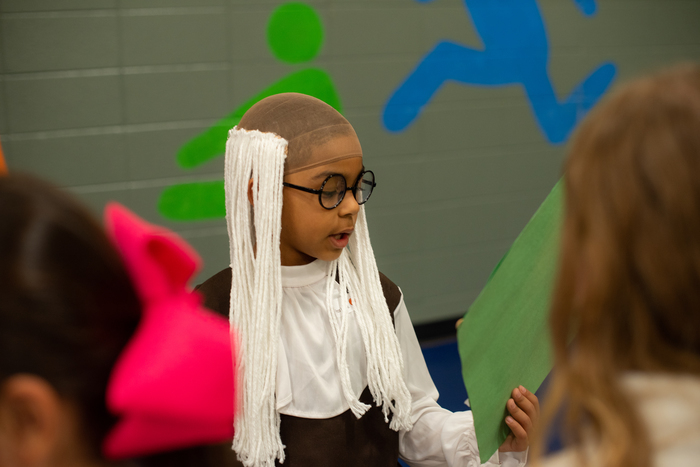 Students demonstrated how and what they're learning about music. It was truly impressive! Great job, Ms. Terry and Mr. Holliday! 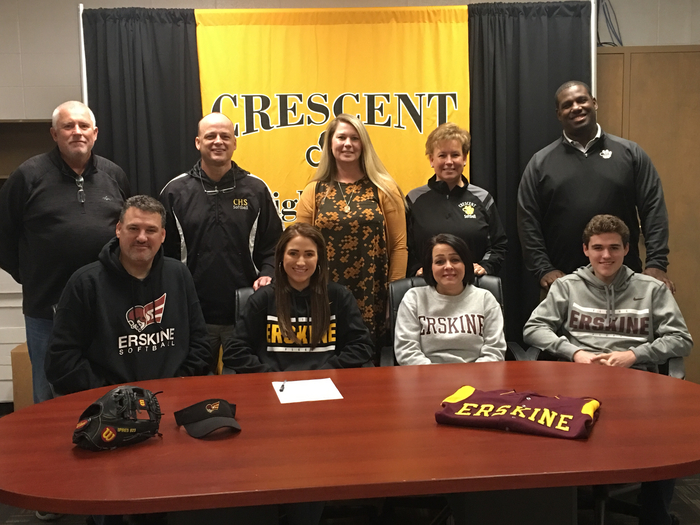 CONGRATS to Crescent Tiger Senior Katie Spires.... Erskine-bound for Softball!!! 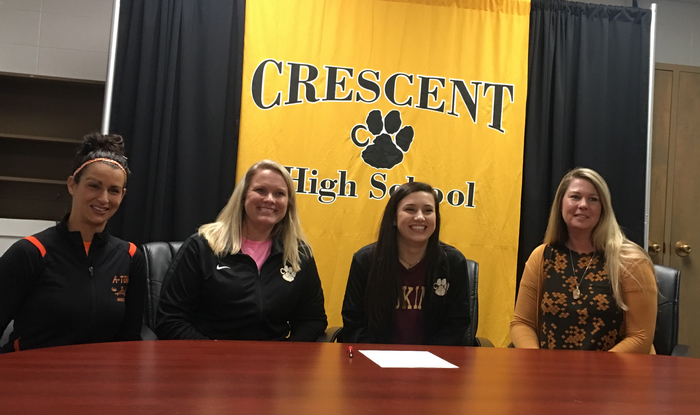 CONGRATS to Crescent Tiger Senior Lucy Bryant.... Erskine-bound for Beach Volleyball!!! CONGRATS as well to Mackenzie Hayes on being selected as All State in Volleyball! 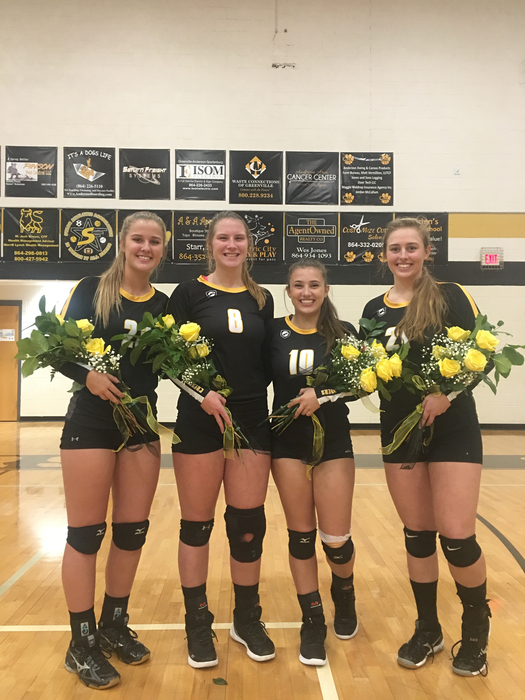 LOTS of Post-Season Honors for Lady Tiger Volleyball! * Region I-AAA Player of the Year - Mackenzie Hayes * Region I-AAA Coach of the Year - Kristin Fouts * All-Region - Kamryn Dove, Ivey Gray, Mackenzie Hayes * FCA All-Star Selection - Lucy Bryant The Lady Tigers finished their season with an overall record of 23 - 4. They finished 2nd place in region I-AAA behind the AAA State Champions Powdersville. This was the second year in a row that Mackenzie and Coach Fouts were chosen as Player and Coach of the Year! Congrats to these young ladies and coaches! 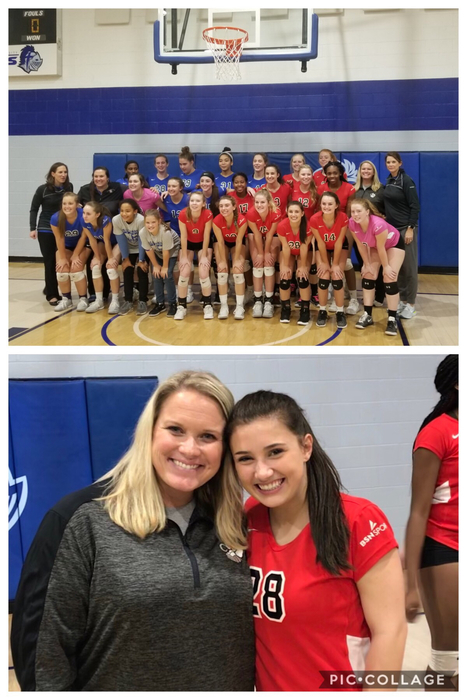 Tiger PROUD of Lady Tiger Volleyball senior Lucy Bryant and Coach Kristin Fouts....All Star Player and Coach at the FCA All Star contest last night! 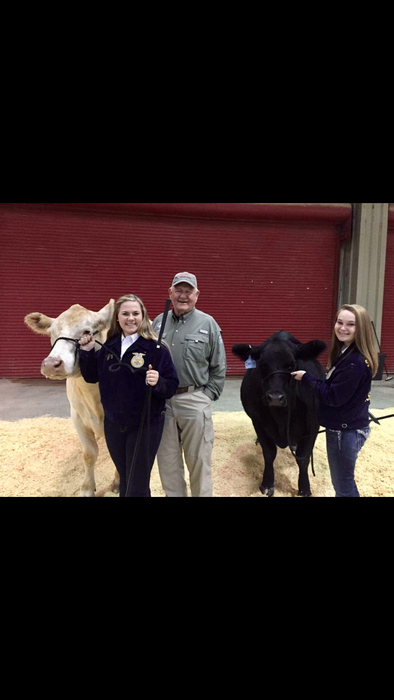 Friday, Crescent FFA Officers, Emily Wilson and Hannah Wooten, received a once in a lifetime opportunity! 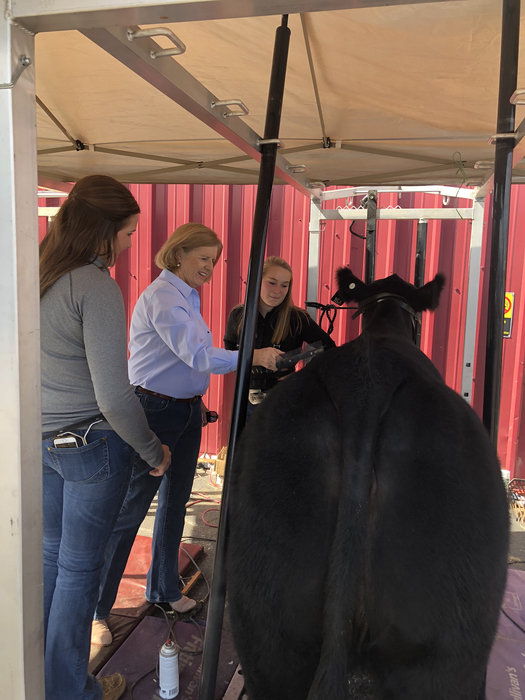 They had the pleasure of meeting the US Secretary of Agriculture, Sonny Perdue, at Clemson’s T Ed Garrison Livestock Arena where they were able to speak with him about their livestock projects. Way to put Crescent Ag on the map! 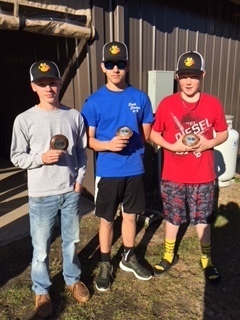 JD Worley, Logan Shaw, and Clayton Woods finished in 2nd place in the JV division at the first Super Sport shoot for SCTP/4H. 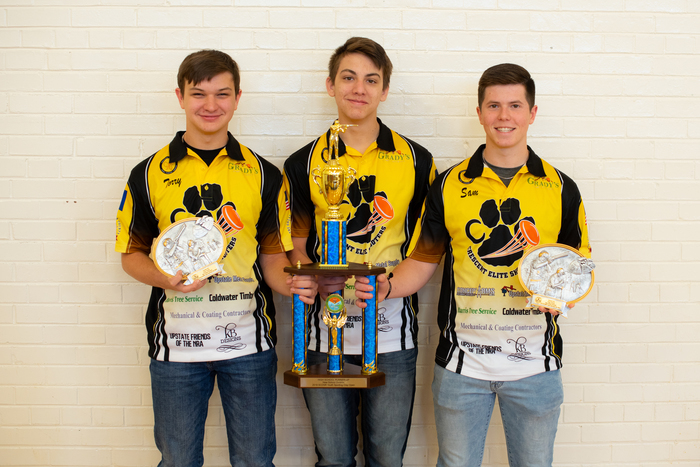 Congratulations to these young men, their sponsors, and the Elite Shooting Team for a successful weekend. 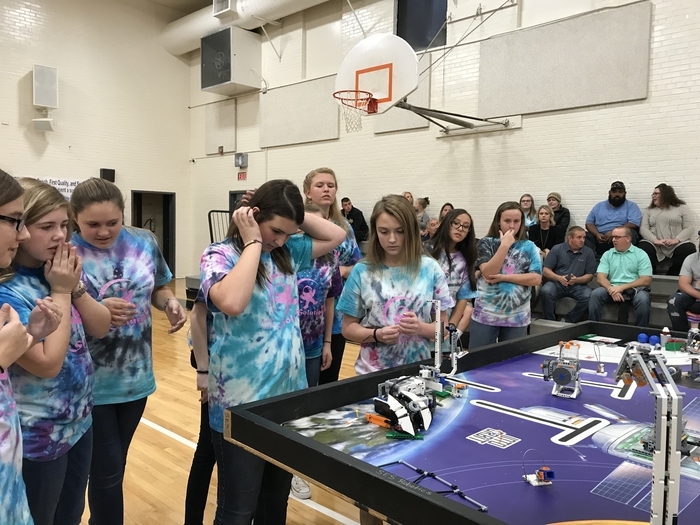 Anderson 3 Robotics teams represented our district well in the Tri-County Qualifying Tournament. 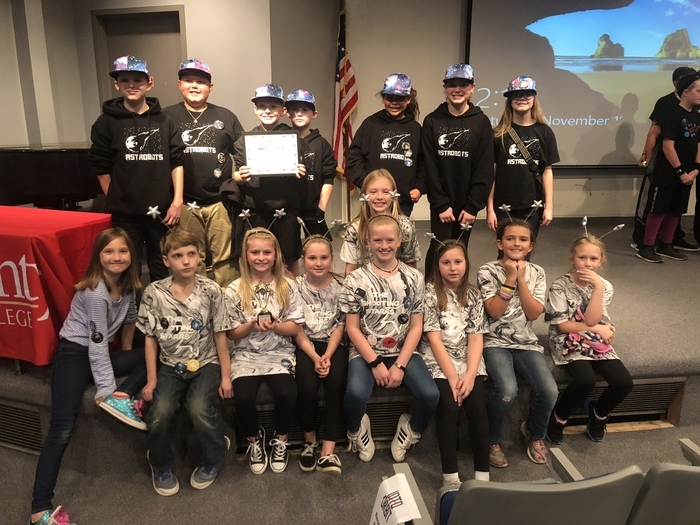 The Shooting Starrs brought home the “Rising Star Award” and the Starr Astrobots are HEADING TO STATE!! GOOD MORNING, TIGER NATION! 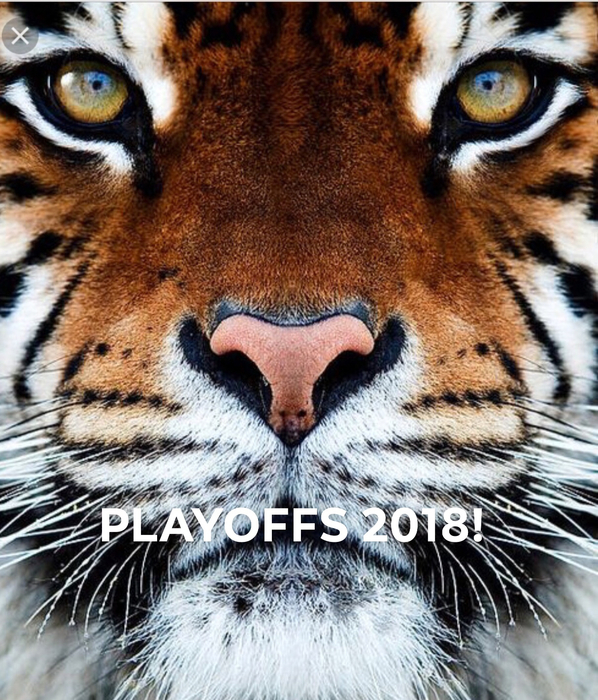 Crescent Tiger Football opens the playoffs on the road TONIGHT at Indian Land! 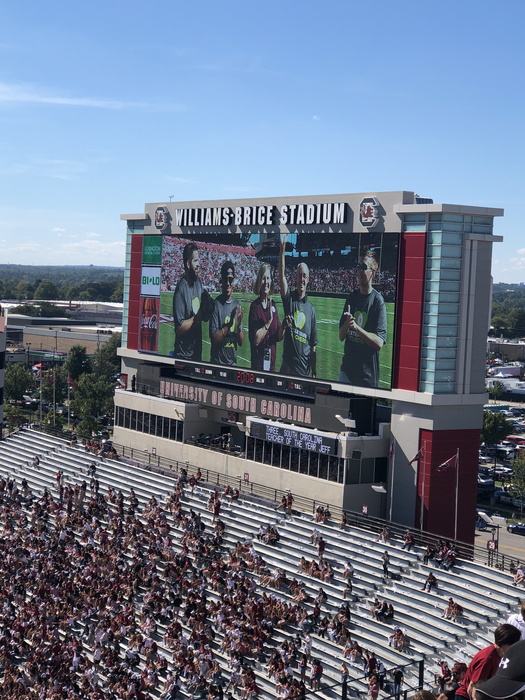 Kickoff is at 7:30. GOOD LUCK to Tiger Football! GOOD LUCK to the Crescent Competitive Cheer Team as they compete today in the State Qualifier at Mid-Carolina High School! Be GREAT, Tiger Cheer! FOOTBALL GAME DATE AND TIME CHANGE: The football playoff game at Indian Land has been moved to THURSDAY NIGHT at 7:30. 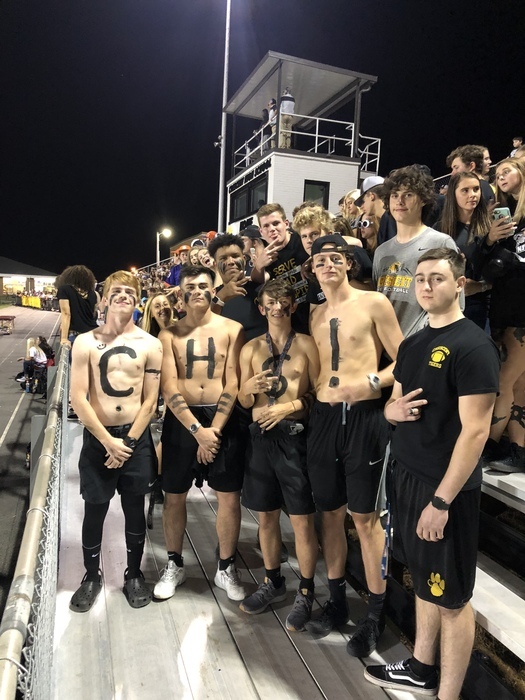 Admission for playoff games per the SCHSL is $8.00. Lets go do this, Tiger Nation! 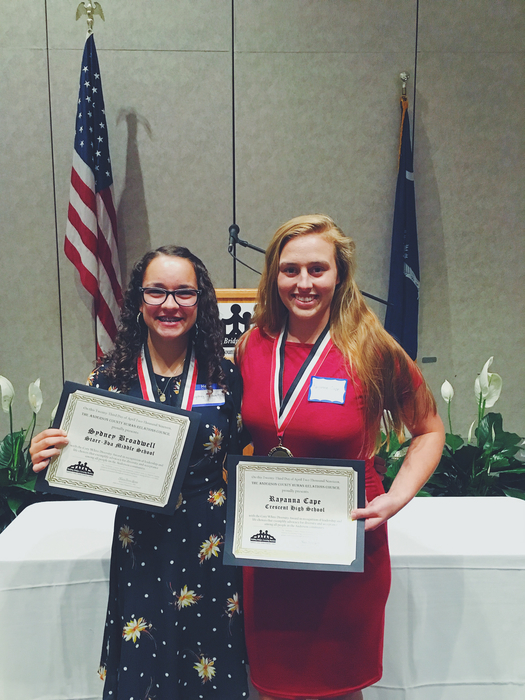 CONGRATS to Crescent Tiger seniors Rayanna Cape and Murphy McBride.... Crescent High’s recipients of the 2018 Wendy’s High School Heisman! 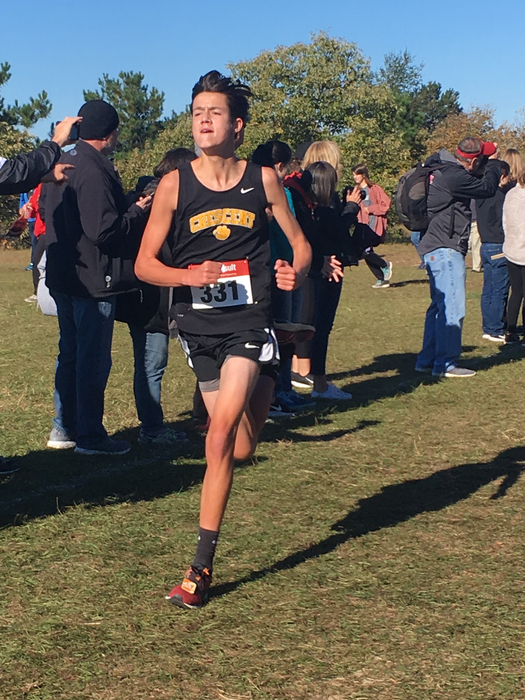 GOOD LUCK to Crescent Tiger Cross Country runner Sophomore Jesse Sauve.....competing at the AAA State Meet in Columbia this am! 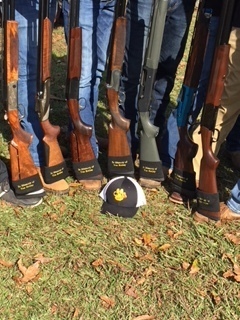 The Crescent Elite clay shooting team recently participated in the 4H/SCTP Trap Qualifier. 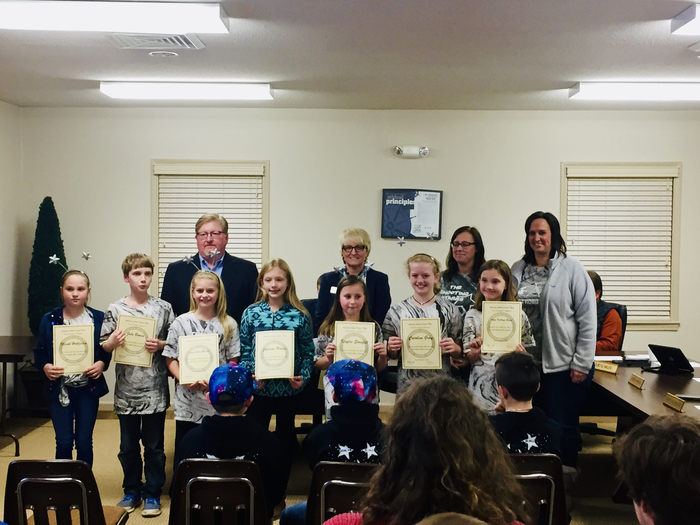 This is the first year Anderson School District Three has had a clay shooting team. The next competition will be December 1st at the Backwoods Quail Club, Georgetown SC. Good luck to these students and advisers. A strong season comes to an end tonight as Crescent Tiger Volleyball falls on the road at Chapman in the AAA State Playoffs.... CONGRATS to these young ladies and coaches on another successful season! GOOD LUCK on the road tonight to Crescent Lady Tiger Volleyball! 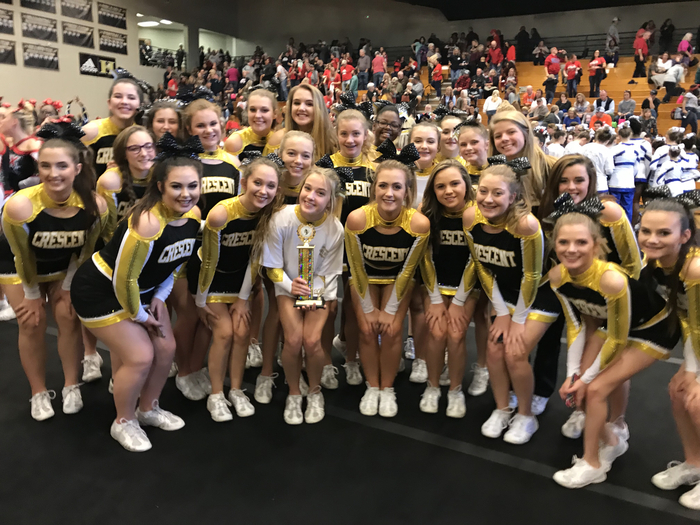 PROUD of our Competitive Cheer Team for placing at the TL Hanna competition yesterday! Crescent High School: Picture Day is Monday, October 29th for all underclassmen. 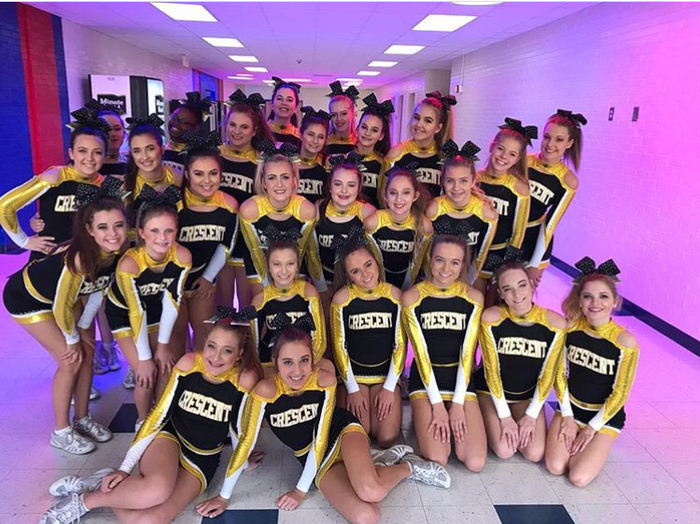 The Crescent Competitive Cheer team will be competing at TL Hanna High today! Good Luck to Tiger Cheer! 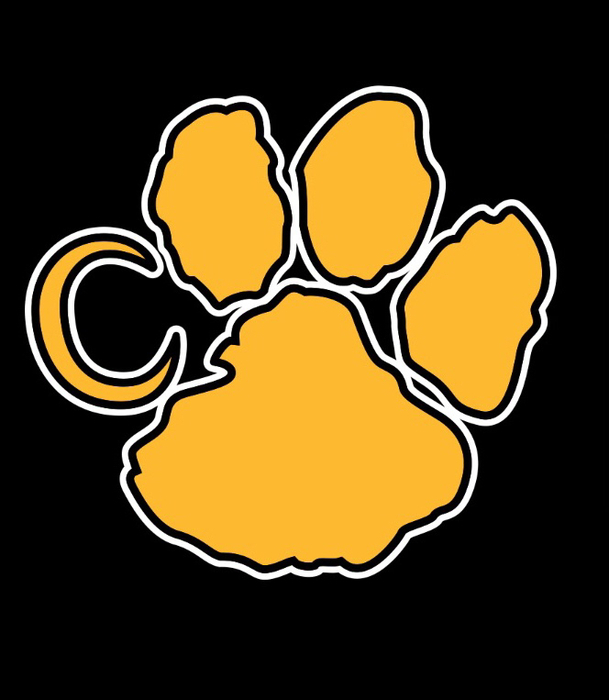 GOOD LUCK to Crescent Tiger Cross County as they are competing today at Southside High in the Upperstate Meet! 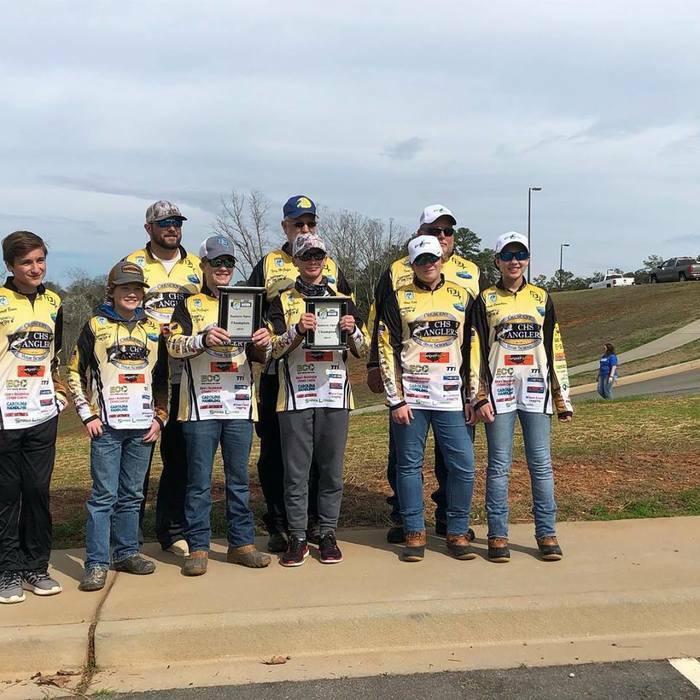 Congratulations to SIMS Anglers for their first place finish in the middle school division of the Troll Championship PBC "Dorman" Classic held at Lake Hartwell on Oct. 20. 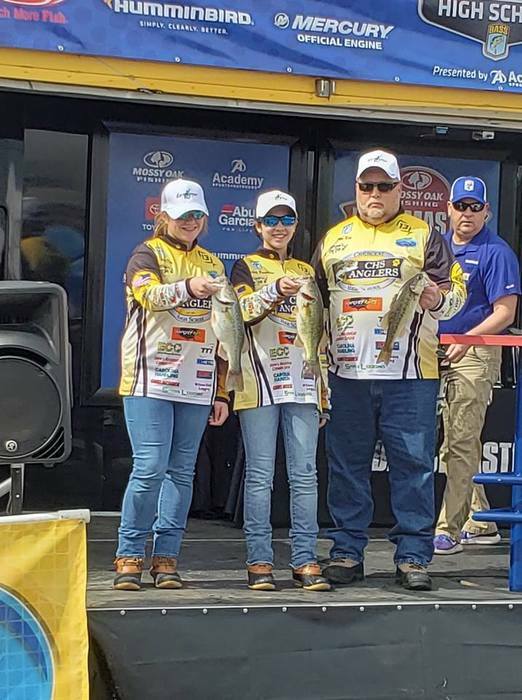 This is the second year in a row that SIMS Anglers have had a first place overall finish at this event!! 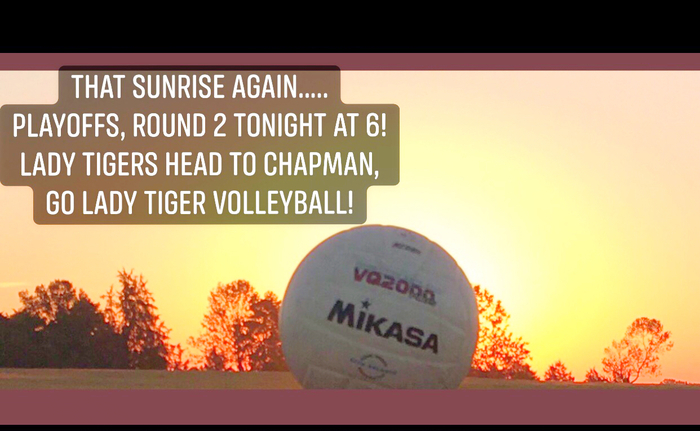 That sunrise indicates a Lady Tiger Volleyball PLAYOFF GAMEDAY MORNING! Crescent Volleyball hosts Keenan at home tonight in the first round of the AAA playoffs! Match starts at 6:00 pm. BE THERE! 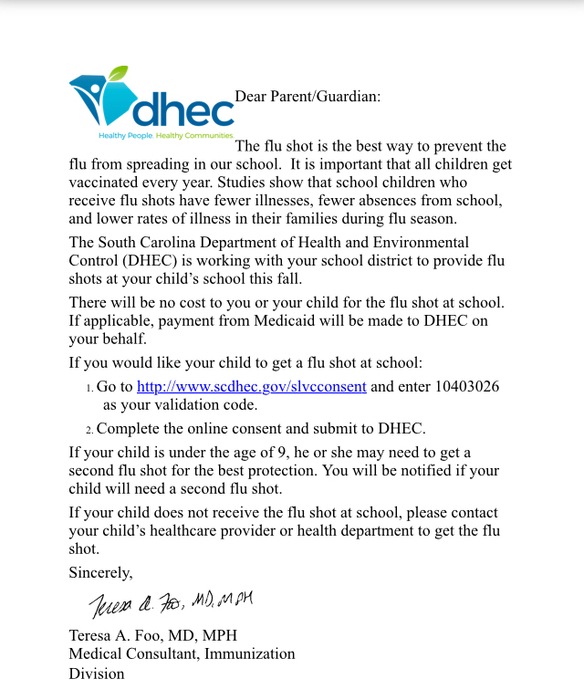 The deadline to register your child for the flu vaccine clinic at Flat Rock is this Thursday, Oct 25. 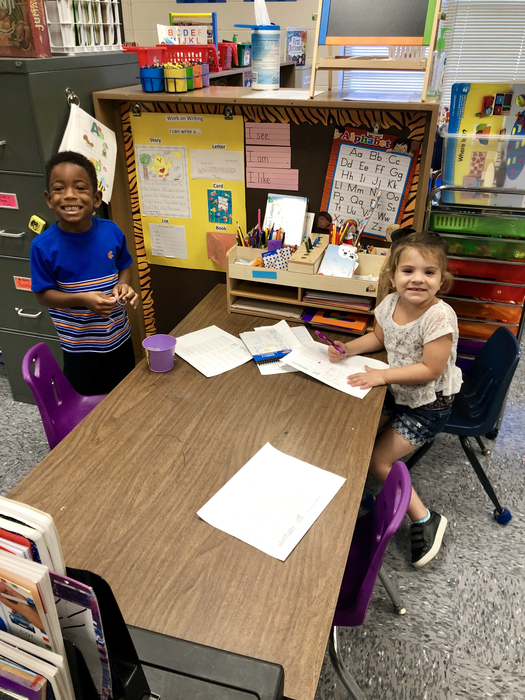 We will have a table setup with computer access during Family Literacy night tomorrow so that you can register your child or you can take home a paper form to return by Thursday. Consents will not be accepted after October 25. Thanks much to our Crescent Tiger Band! 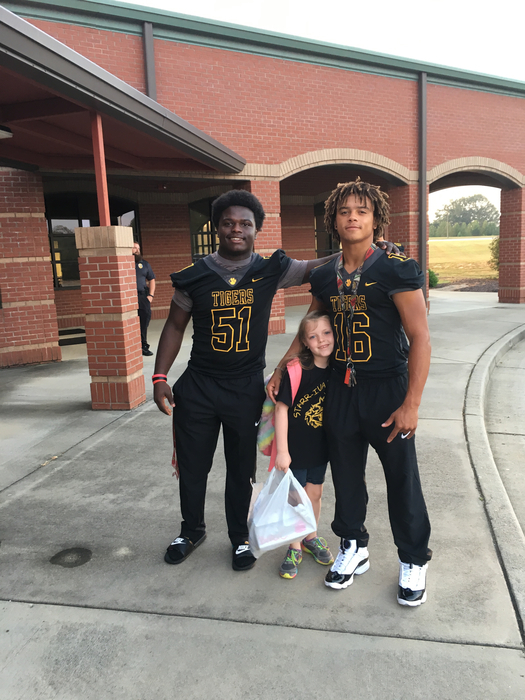 They help make Football Fridays GREAT! 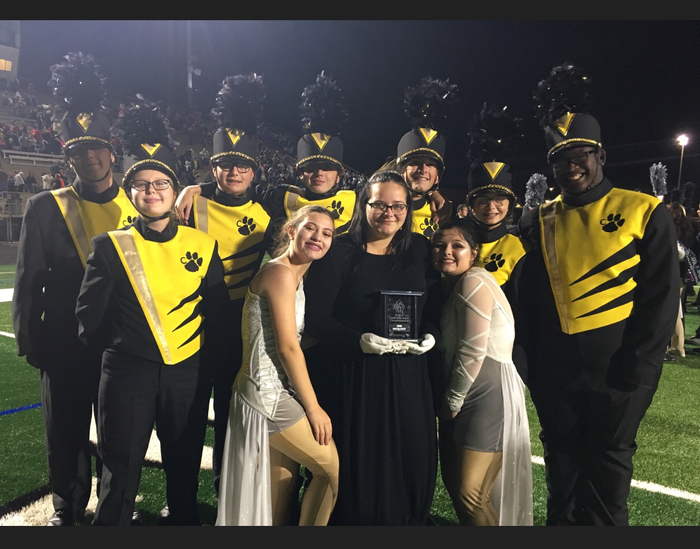 On Saturday, the Tiger Band wrapped up the competitive season at the Upper State Championships and earned an Excellent Rating, improving their overall placement two slots from last year. 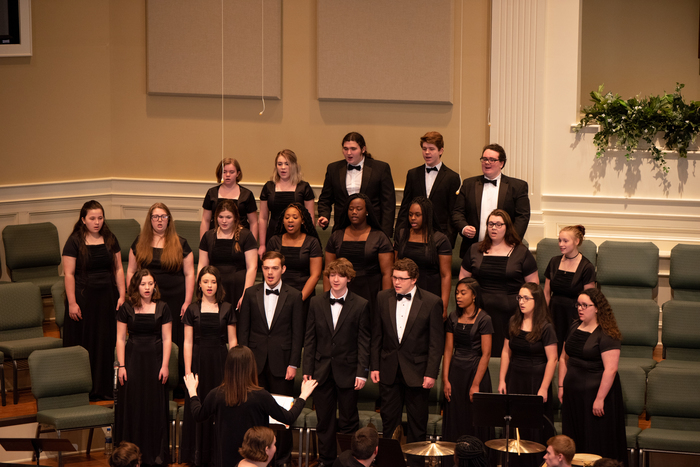 Other highlights from this season include third place finishes at Byrnes and Chesnee, as well as Best Colorguard in their division at Byrnes. PROUD OF TIGER BAND! 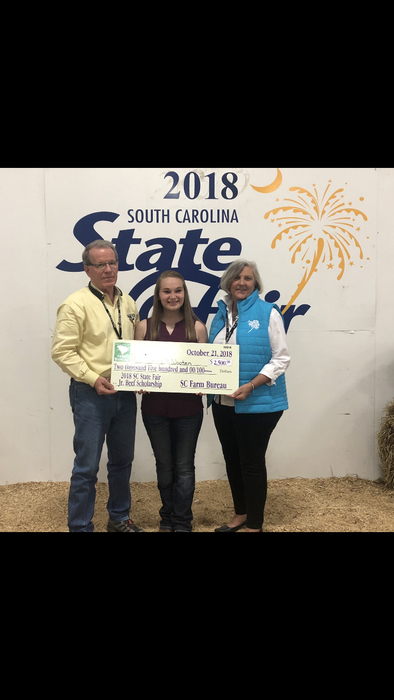 Super proud Crescent FFA President, Hannah Wooten, as she received the 2018 SC State Fair Jr. Beef Scholarship of $2500! 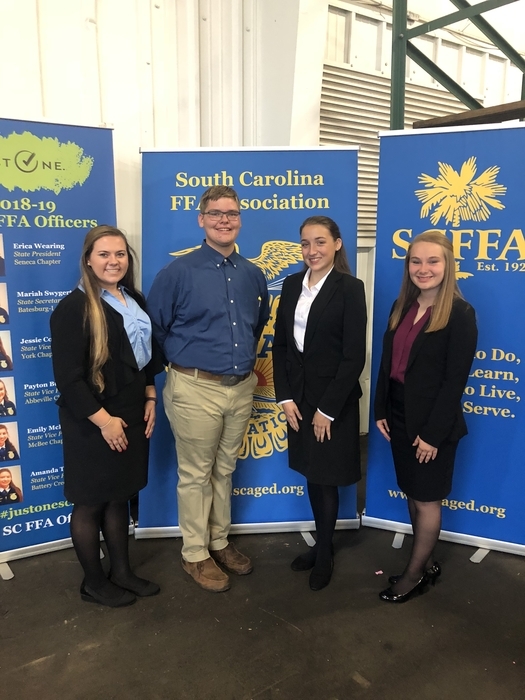 Hannah, along with Nick Bowman, Emily Wilson, and Michaela Herring, competed against other SC Juniors where they evaluated a judging class, participated in showmanship, completed a test, wrote an essay, and concluded with an interview. 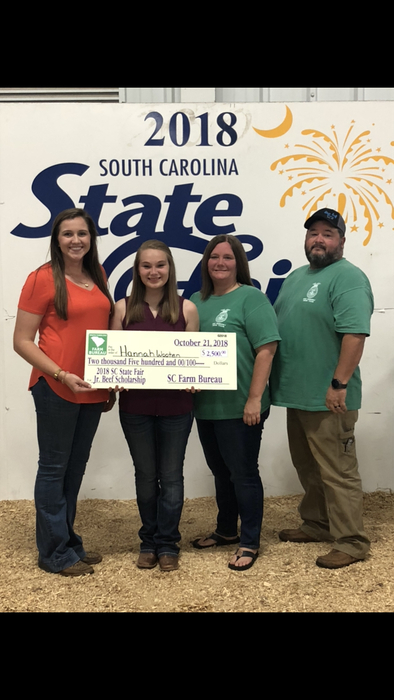 Congratulations to Hannah Wooten for this great accomplishment! 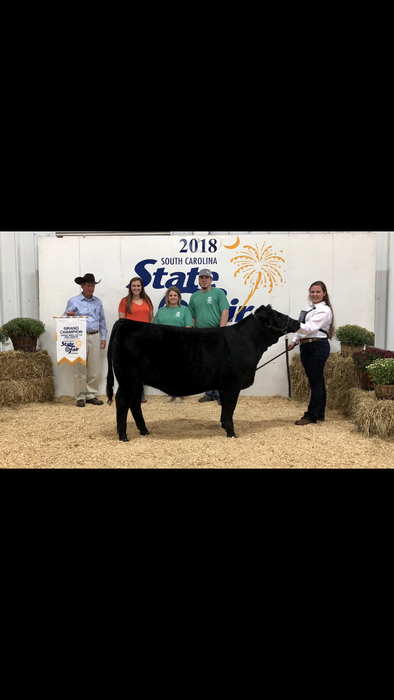 The Crescent Show Team finished out their show season with a bang in the Junior Show at the SC State Fair. 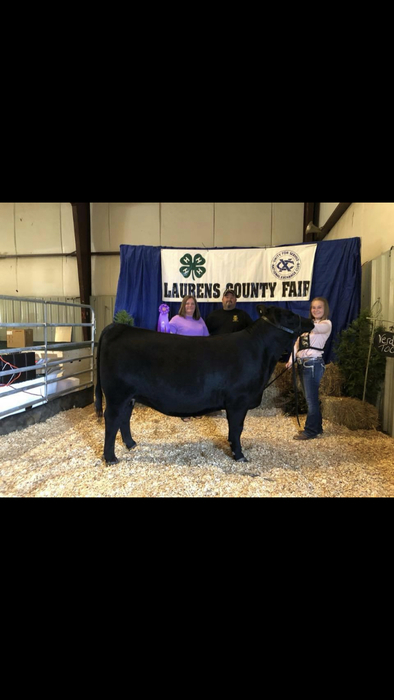 Hannah Wooten won Grand Champion in the Crossbred Show, Michaela Herring won Grand Champion in the Simmental Show, and Emily Wilson won Grand Champion in the Sim Angus Show. 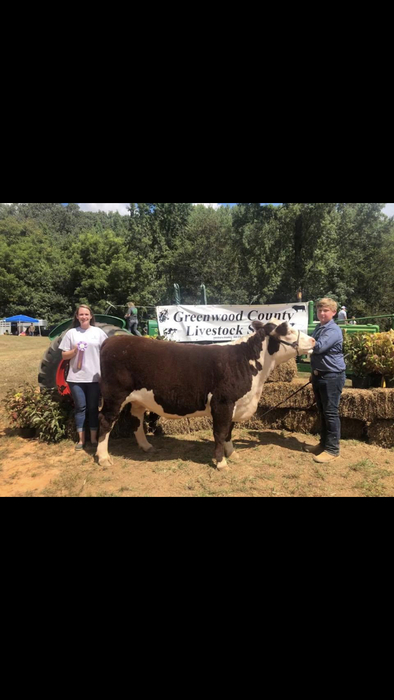 Brent Erwin won Reserve Grand Champion in the Junior Division of the Hereford Show. 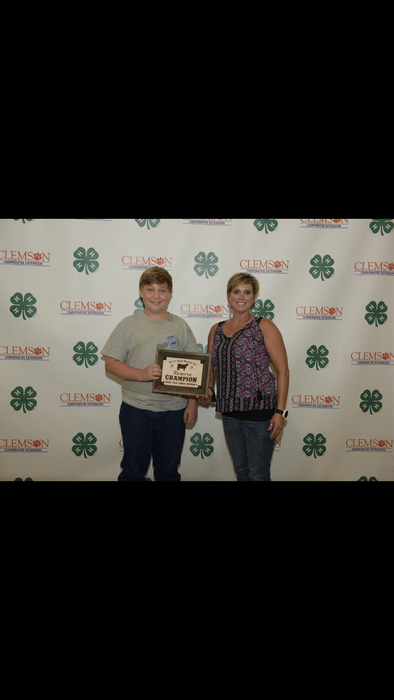 Several students also placed in the top of their showmanship classes. 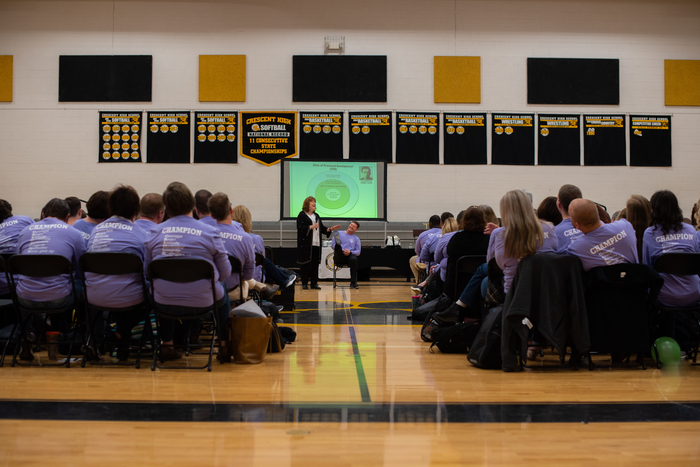 Special thanks to everyone who helped make all of our successes this year possible! Enjoyed speaking with Superintendent of Education, Molly Spearman, today at the SC State Fair! 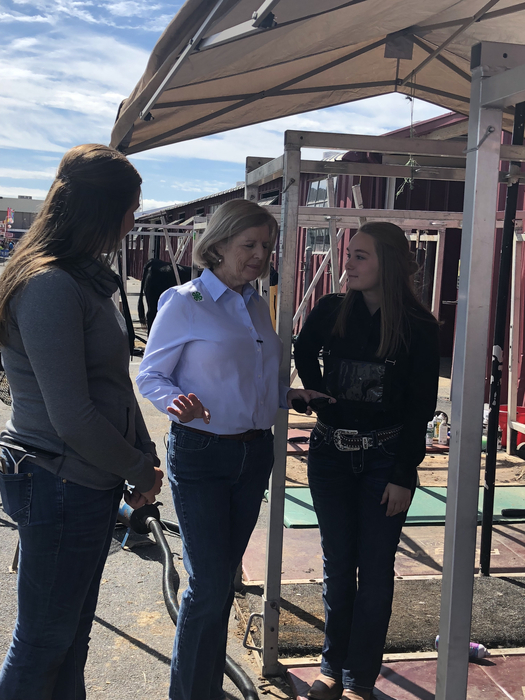 She shared about her personal experiences showing livestock as a child and the impact it had on her life with Crescent FFA President, Hannah Wooten. 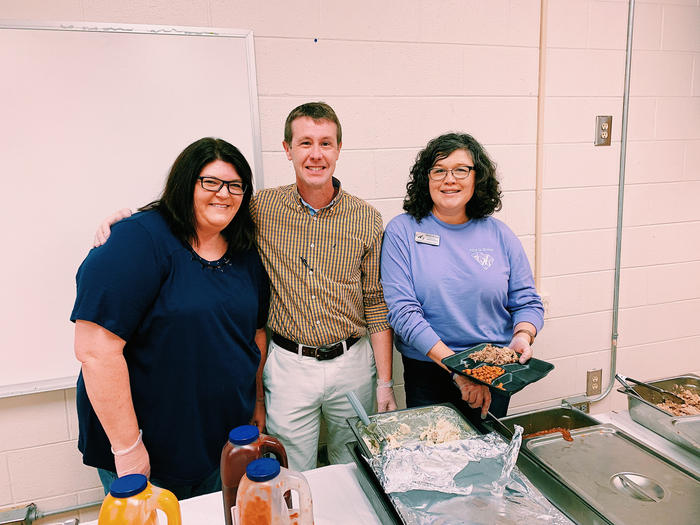 Grateful for Mrs. Spearman and her willingness to share how organizations such as the FFA helped foster her leadership skills! 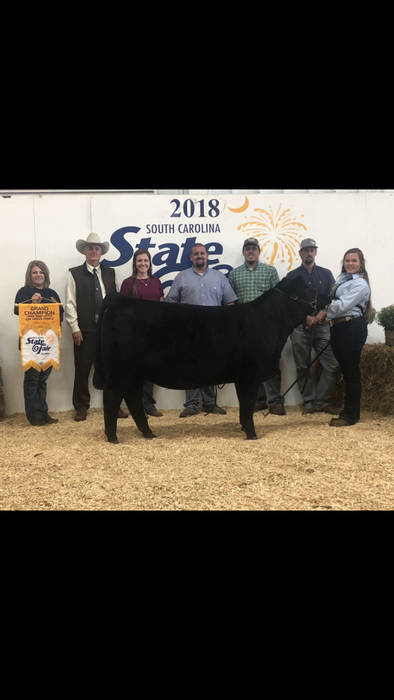 It was a great first day for the Crescent Show Team at the South Carolina State Fair! 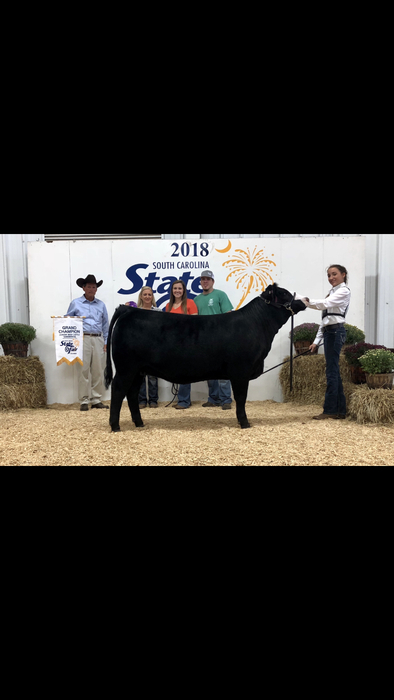 Michaela Herring started out the day winning Grand Champion in the Open Simmental Show. 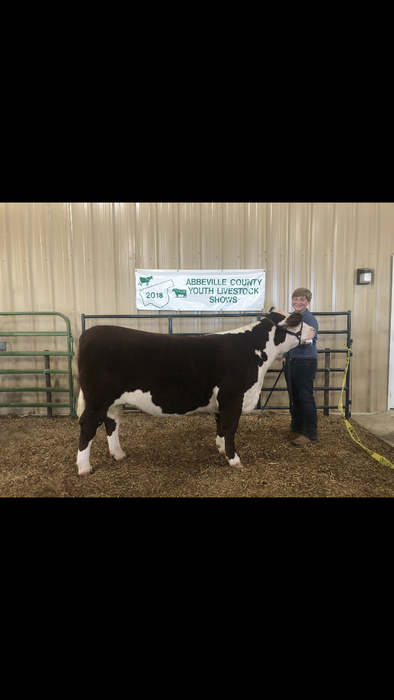 Brent Erwin won Grand Champion in the Spring Yearling Division of the Open Hereford Show. 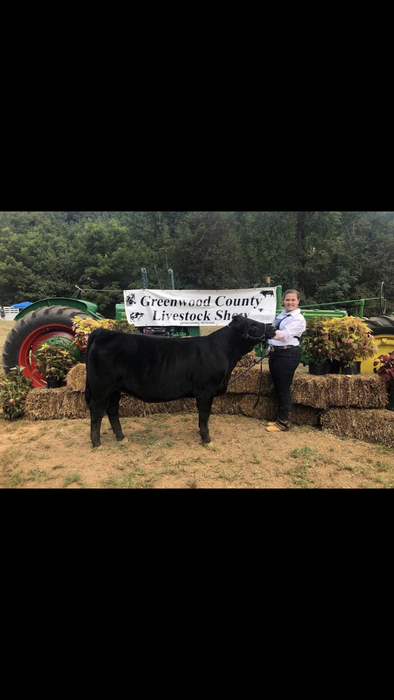 Hannah Wooten won Grand Champion in the Senior Division of the Open Crossbred Show. 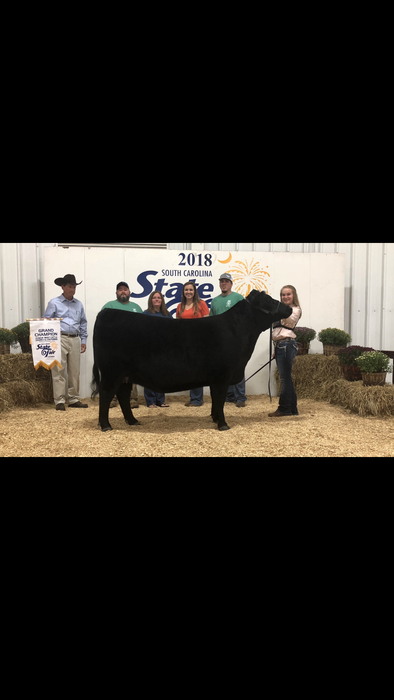 Emily Wilson also won Grand Champion in the Open Sim Angus Show. Crescent Tiger Band is also competing in their final competition today at Boiling Springs High School! VERY PROUD and APPRECIATIVE of how hard these young people and their directors work! GOOD LUCK to our CROSS COUNTRY teams as the compete this morning at Nettles Park in Pendleton and to our COMPETITIVE CHEER squad as they travel to Dorman this afternoon! 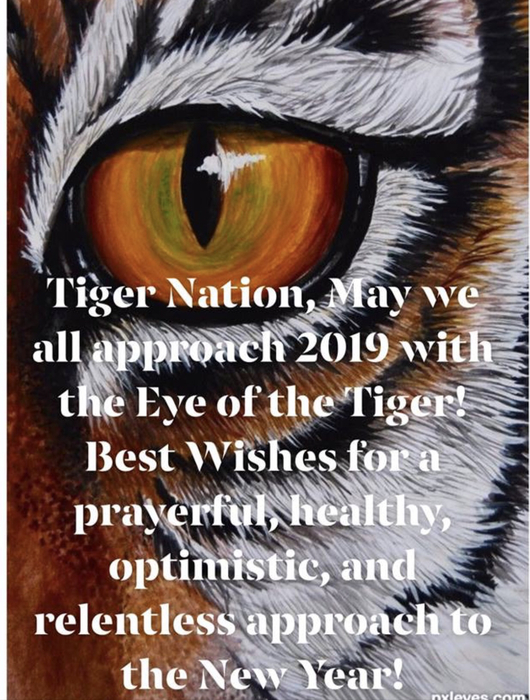 Do GREAT, Tigers! HAPPY FRIDAY, Tiger Nation! Crescent Tiger Football goes on the road to Seneca tonight for another region matchup! Kickoff is at 7:30. SEE YOU THERE, GO TIGERS! 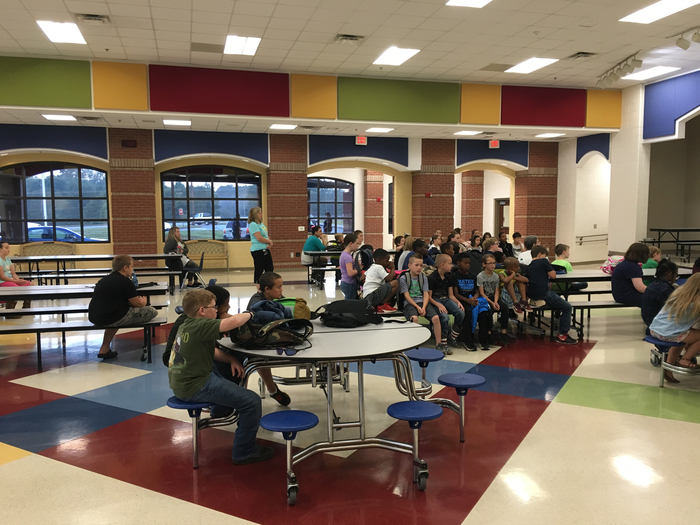 GOOD LUCK to Starr Iva Cubs Football as they travel to Belton Middle tonight! Kickoff is at 5:30, go get ‘em Cubs! Crescent JV Football hosts Seneca AT HOME on Thursday! Kickoff at 6:00 pm, come out and support our JV Tigers! 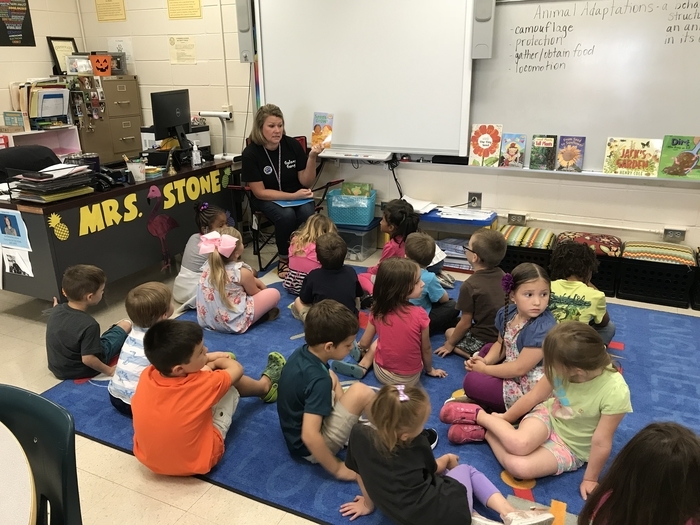 Flat Rock Elementary will host our annual Fall Family Literacy Night on Tuesday, October 23rd at 6:00 pm. 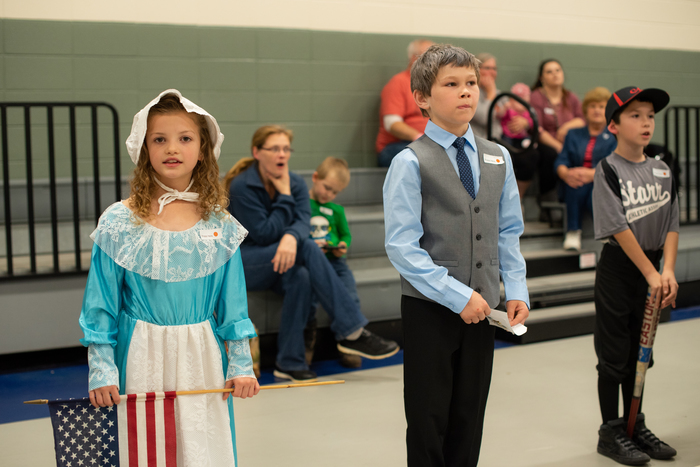 Our third, fourth, and fifth grade students will perform. 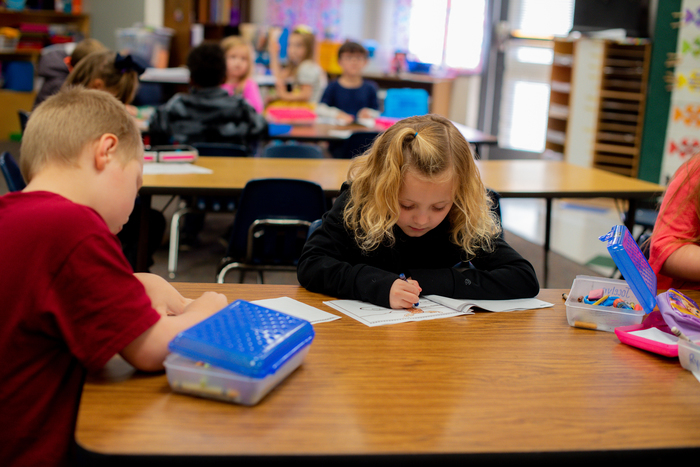 All parents/guardians are invited to attend the School Improvement Council and Title I meetings at 5:30 pm before the program begins. We look forward to sharing this evening with our school community. 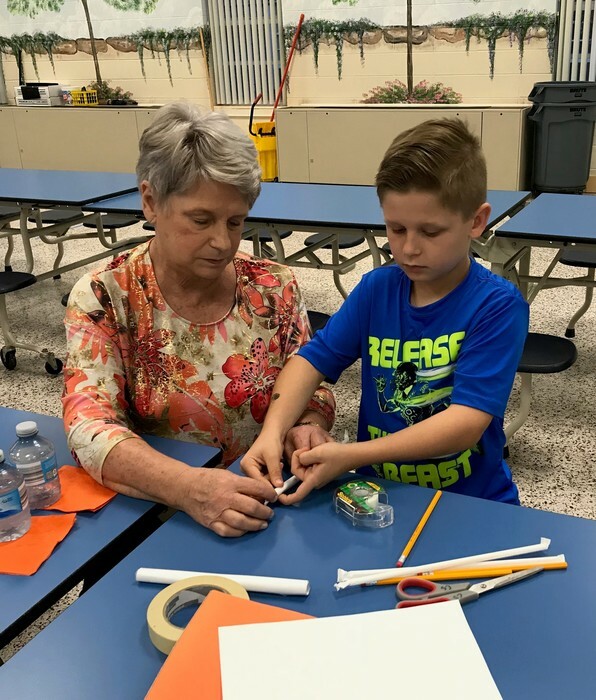 Starr Elementary celebrates Family STEM Night! Tiger Cross Country heads to Liberty High to compete in the Region I-AAA Meet today. GOOD LUCK to our Girls and Boys teams! Starr Iva Cubs Football gets the victory over Honea Path tonight! GREAT JOB CUBS! Crescent Lady Tiger Volleyball wraps up the regular season on the road tonight at Dixie. GOOD LUCK to our JV and Varsity Volleyball teams! GOOD LUCK to Crescent JV Football as they travel to Pendleton tonight! Kick off is at 7pm! Starr Iva Cubs Football hosts Honea Path at CHS tonight at 6! This is a makeup game for the rainout last Thursday. 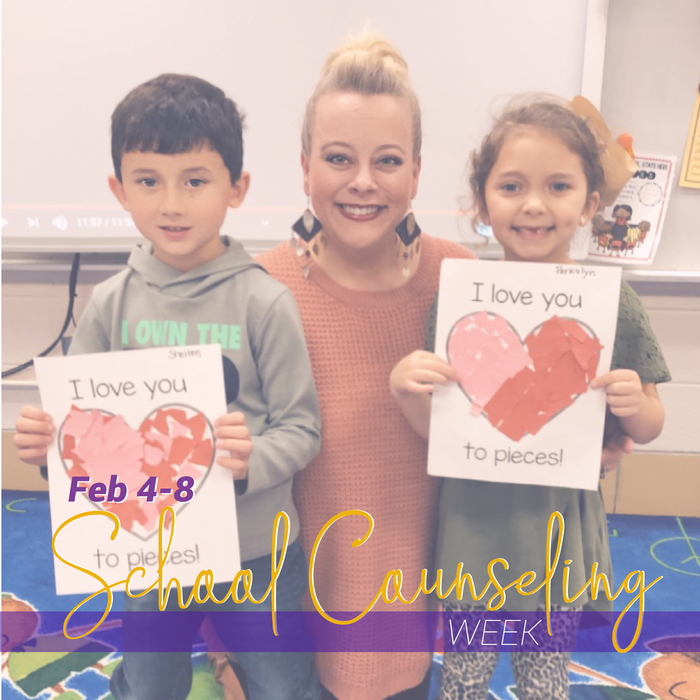 Good Luck, CUBS! 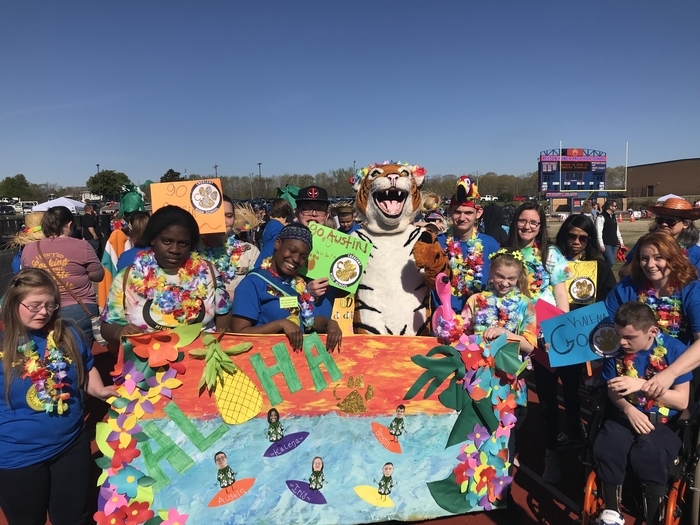 Congratulations to Iva Elementary for winning the golden shoe award at the 9th annual Tiger Trot! We were so happy to see so many of our students come out and have FUN at the Color run! It’s a FOOTBALL FRIDAY GAMEDAY, Tiger Nation! Crescent Tiger Football is back HOME tonight vs Pendleton for a BIG region showdown! Kickoff is at 7:30, SEE YOU THERE! 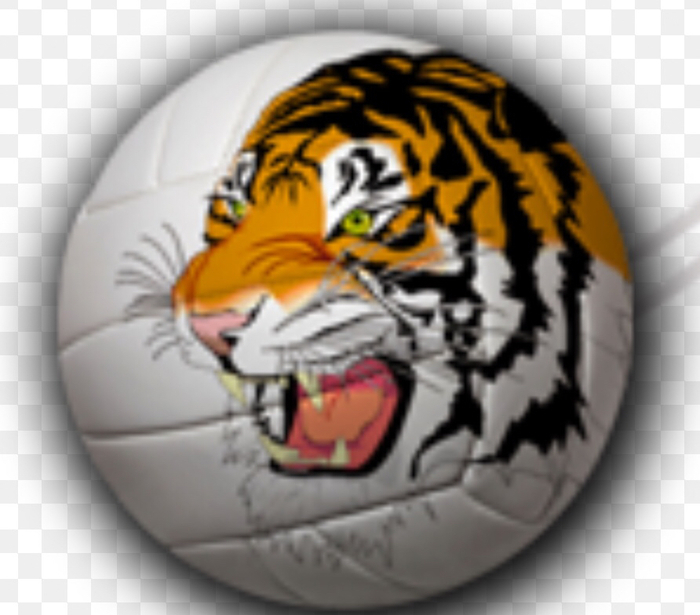 CONGRATS to Crescent Lady Tiger Volleyball....both the Varsity and JV teams get victories over West Oak tonight! Next up is Dixie on Monday. Playoffs start (and the Varsity Lady Tigers will be AT HOME) on October 24! 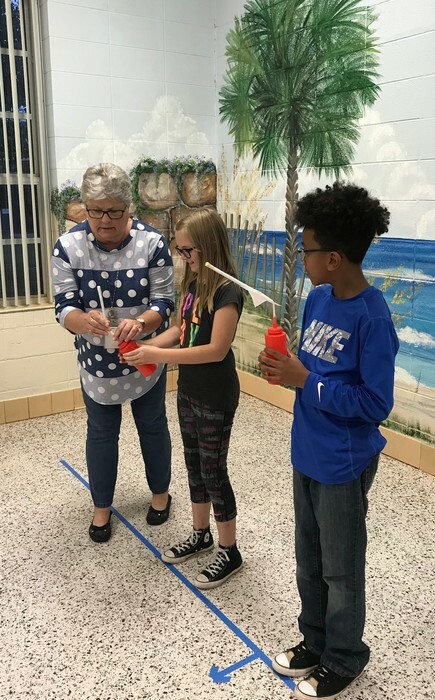 Iva Elementary fourth and fifth-graders aimed for the stars at this week's STEM Family Night! 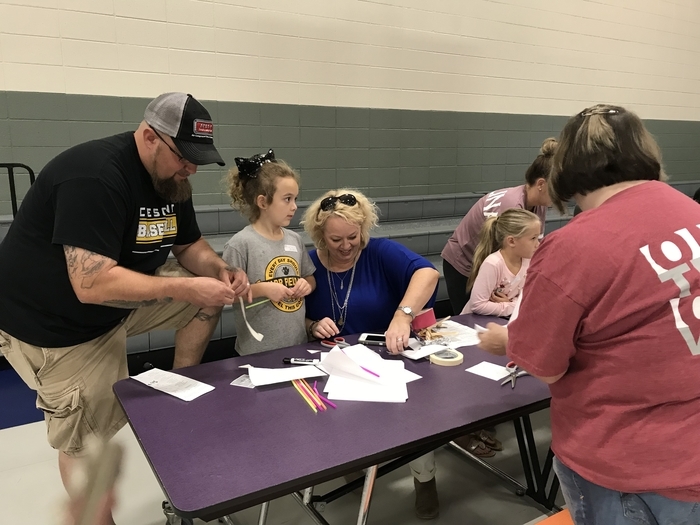 Students worked with their families to design and construct rockets. CRESCENT/SIMS GAME UPDATES FOR TODAY: * JV Football game at Pendleton is POSTPONED TO MONDAY. Same start time. * Starr Iva Football game at home is POSTPONED TO MONDAY. Same start time. * JV/Varsity Volleyball at West Oak will be PLAYED TONIGHT AS SCHEDULED. GO TIGERS AND CUBS! Anderson School District 3 will be operating on a 2-hour delay today, Thursday, October 11th. WYFF has incorrectly stated that all Anderson County districts are closed tomorrow. At this time, all Anderson County districts are open except Anderson 5. 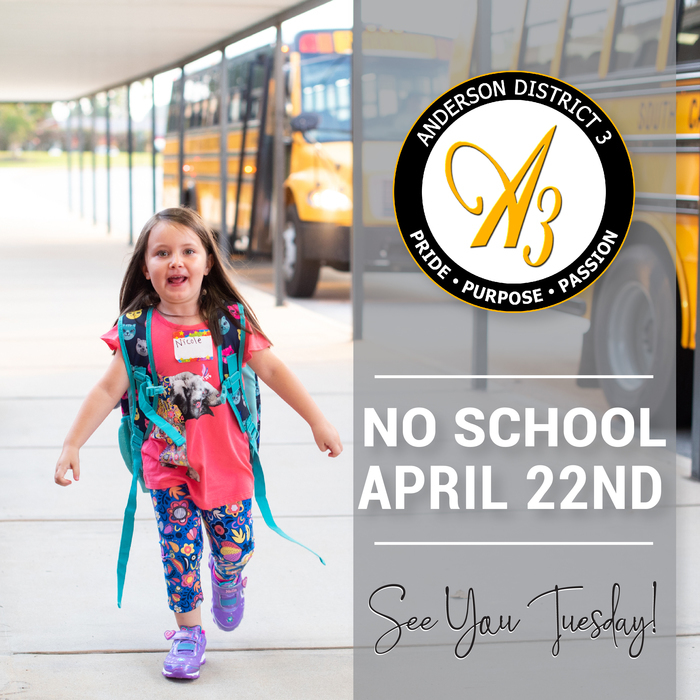 The other districts, including Anderson 3, plan to be on regular schedule tomorrow. 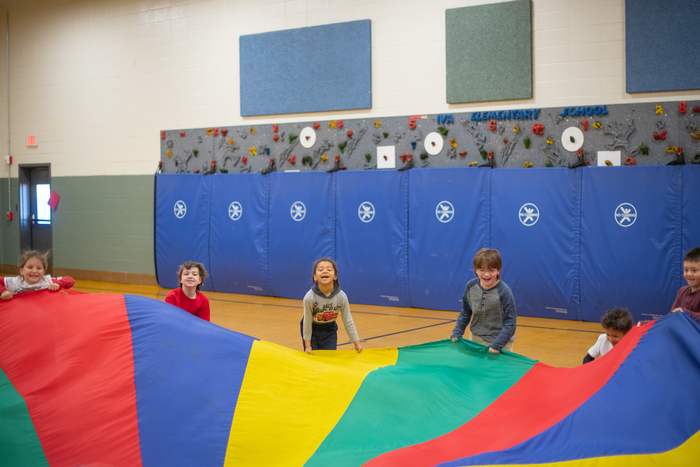 The superintendents continue to monitor weather conditions and will have a conference call Thursday morning at 5 a.m. Any changes based on weather conditions will be announced after that call. 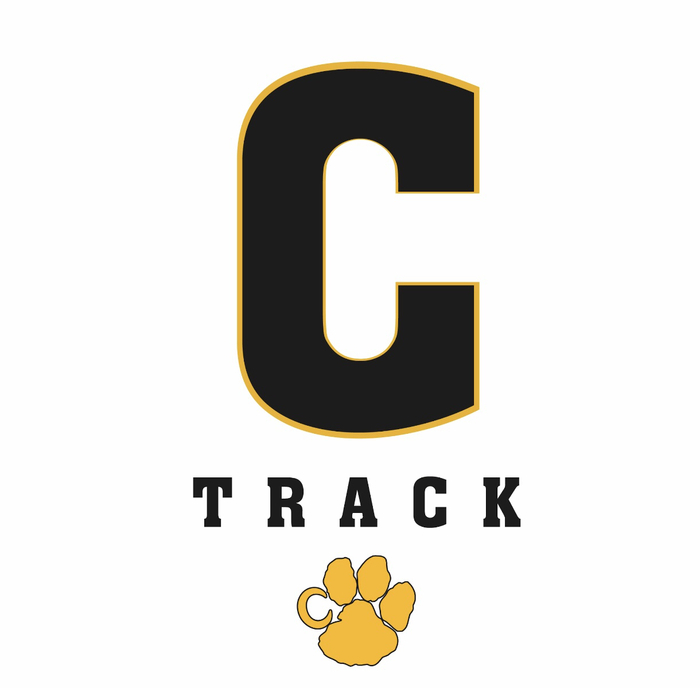 Tiger Cross Country is at HOME today vs. Abbeville, BHP, and Dixie.... competition starts at 5 pm! Good Luck to both the Girls and Boys teams! Crescent Lady Tiger Volleyball gets the win over Seneca tonight in another important region contest! JV takes two as well! Special CONGRATS to our four seniors. PROUD of you Katelyn, Cailee, Lucy, and Rayanna! 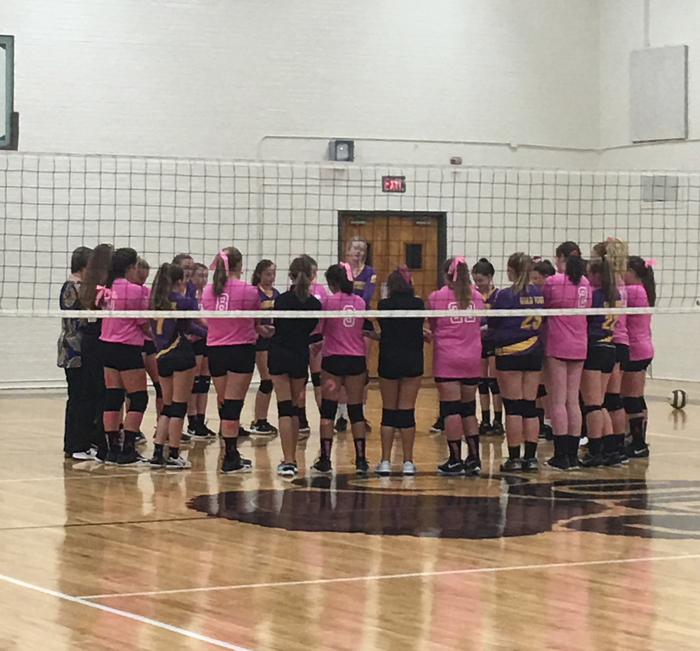 Love this moment before the CTeam Volleyball game here at Starr Iva tonight....Lady Tiger CTeam taking on Dacusville! Food Drive benefitting Salvation Army and Haven of Rest October 9-12. Donation boxes located in the front office at CHS! Please bring nonperishable foods! GOOD LUCK to CTeam Volleyball as they host Dacusville at Starr Iva tonight! Match starts at 5:30!! Crescent Lady Tiger Volleyball hosts Seneca tonight. It’s SENIOR NIGHT and another important region contest! Hope you can make it to cheer on our Lady Tigers and help honor our seniors! JV starts at 5:30, Varsity will follow. GO TIGERS! Competitive Cheer competed at BHP today! Proud of the effort by all our kids and coaches, and a big shout out to the crowd that came out to support the team today! Crescent Tiger Football gets the region win over Liberty tonight by a score of 28-14! CONGRATS TIGERS! Our Tigers will be back AT HOME next Friday against Pendleton in a big one. Make plans NOW to pack our house with Tigers! At the half, Crescent Tiger Football leads Liberty 21-7. 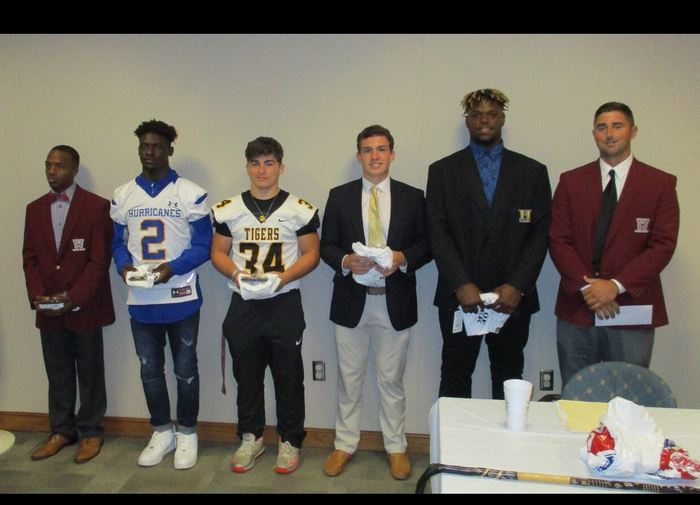 CONGRATS to Crescent Tiger Jamie Ellis....Anderson Touchdown Club Defensive Lineman of the Week AND Independent Mail Athlete of the Week! #GOTIGERNATION!! 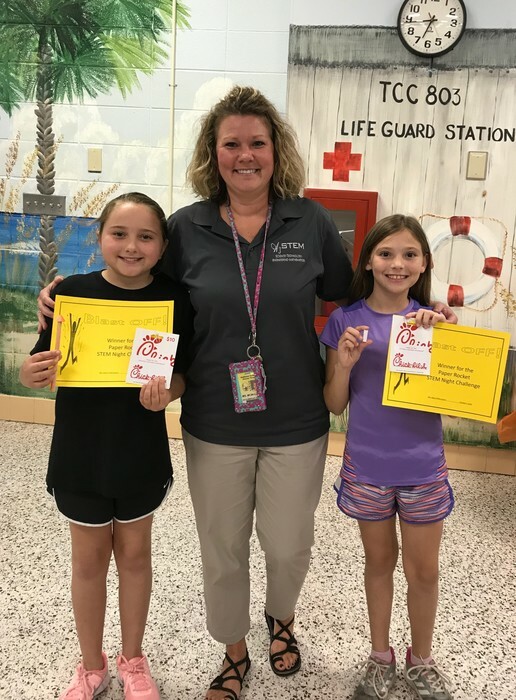 Congratulations to our weekly IXL winners! Keep up the good work. Another Football Friday! 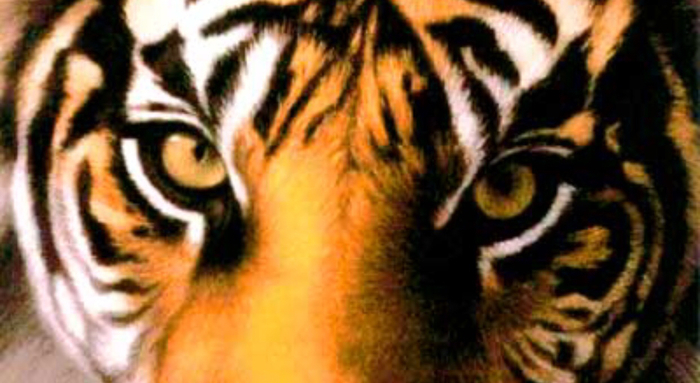 Crescent Tiger Football travels to Liberty tonight.... let’s fill their stadium with Tiger Fans! Kickoff is at 7:30. See you there, Tiger Nation! Crescent JV Football gets the win over Liberty tonight! Way to go, JV Tigers! Crescent Lady Tiger Volleyball gets the win over Pendleton tonight! CONGRATS !!!! CONGRATS to CTeam Volleyball....victorious over Gray Court on Wednesday night! 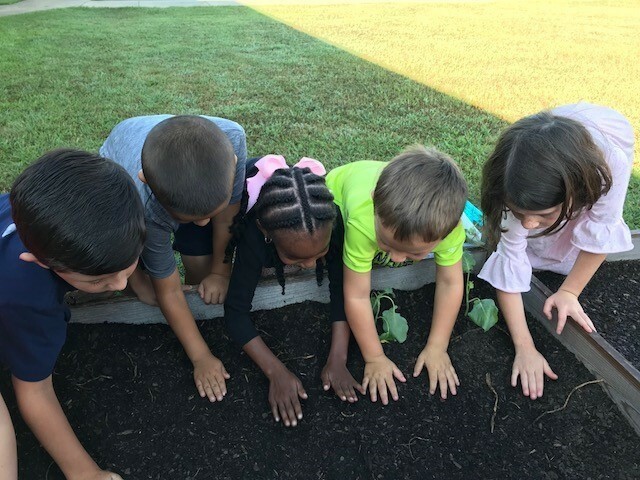 Kindergarten students at Flat Rock are using their Science skills by planting fall lettuce in their garden. It’s a busy Volleyball Thursday! Lady Tiger Volleyball travels to Pendleton for a region match tonight. JV at 5:30, Varsity will follow soon after. Also, CTeam Volleyball is at HOME vs West Oak this afternoon. Action starts at 5:30. GOOD LUCK to Lady Tiger Volleyball! 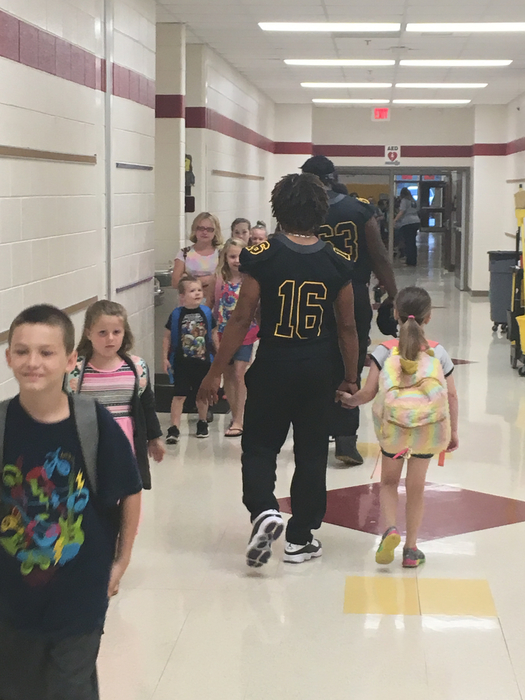 GOOD LUCK to our Crescent Tiger JV and Starr-Iva Cubs Football teams today! JV is at HOME vs Liberty at 6, and our Cubs travel to West Oak. GOOD LUCK TIGERS AND CUBS! Crescent Lady Tiger Volleyball gets another region victory over Liberty tonight! They will travel to Pendleton on Thursday... CONGRATS Lady Tigers! Our students love IXL! 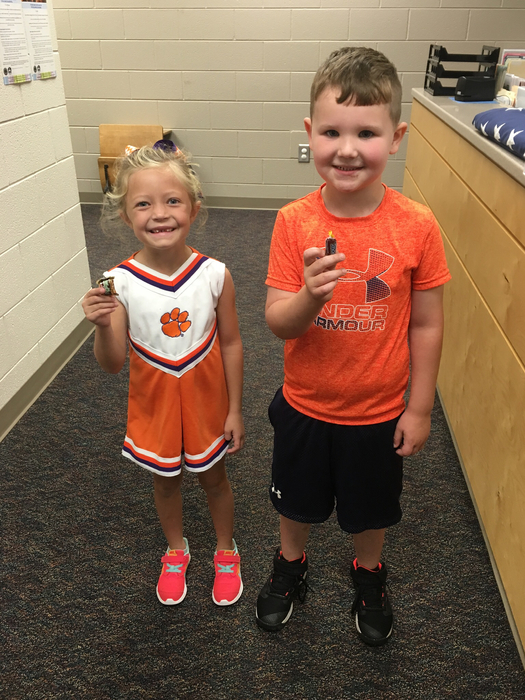 Parker and Harper were our K5 winners last week. 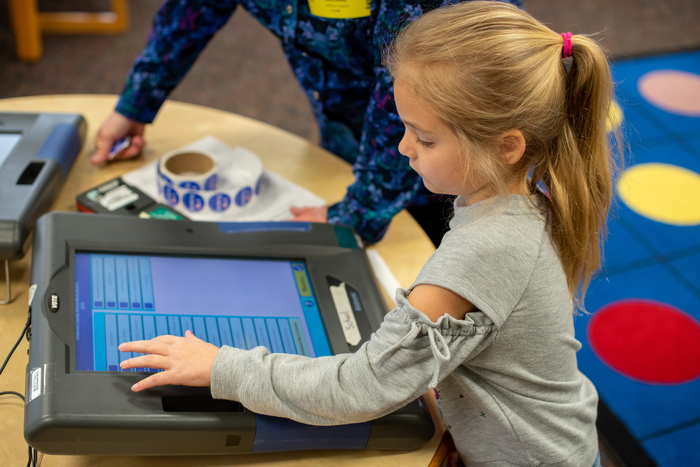 This computer based program reinforces standards and skills being taught in our classrooms. Ask your children about it. GOOD LUCK to CTeam Volleyball as they travel to Liberty Middle on Tuesday......match starts at 5:30! Crescent Lady Tiger Volleyball hosts Liberty on Tuesday! Come out and support your Lady Tigers. Varsity starts at approximately 7 pm, and will follow the 5:30 JV match. GOOD LUCK to both teams! GO TIGERS! 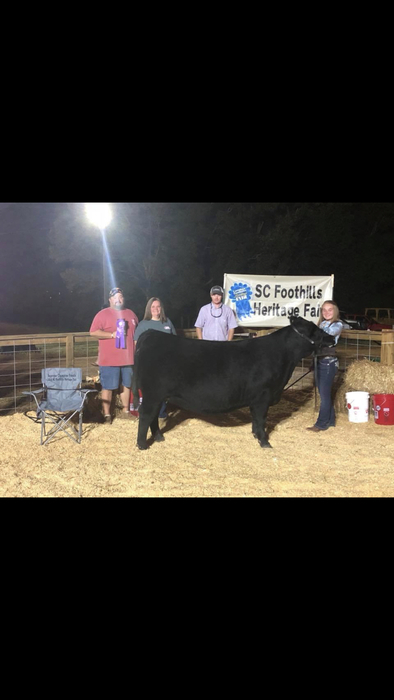 It was an awesome Friday night for the Crescent Show Team at the SC Foothills Heritage Fair! 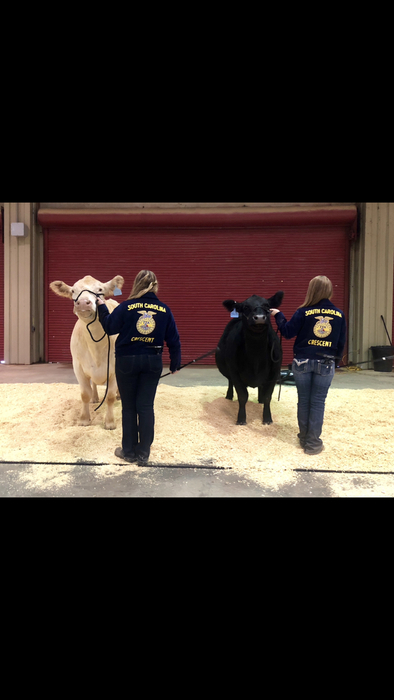 Emily Wilson won first place in Intermediate Showmanship, and Hannah Wooten won first place in Senior Showmanship. 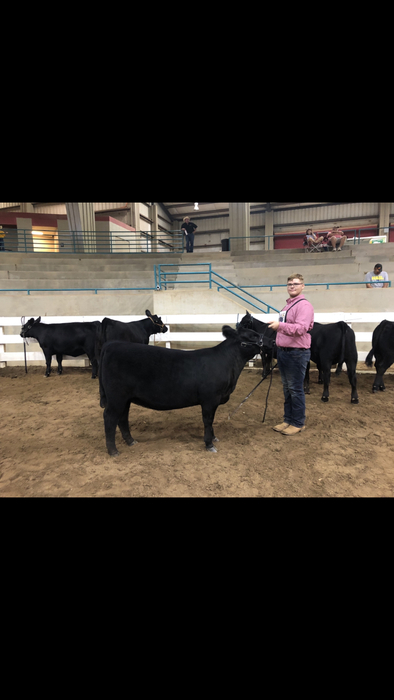 Nick Bowman won his class in the British Show, and Michaela Herring won Reserve Grand Champion in the Continental Show. 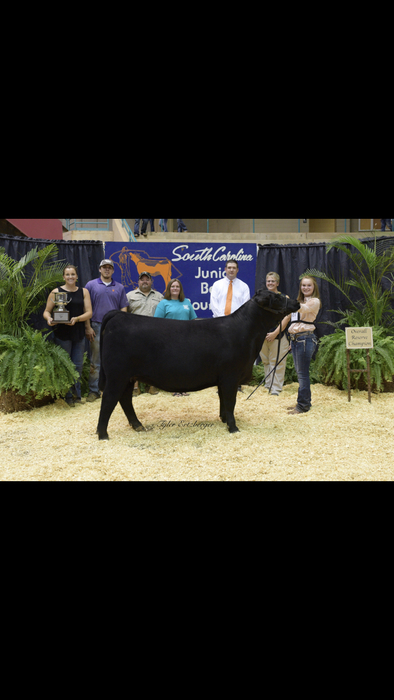 Hannah Wooten won Grand Champion in the Crossbred Show where she then went on to win Overall Supreme Champion Female. So proud of the success that these hard working students have had over the past few months! Crescent JV Lady Tiger Volleyball takes 1st Place at the Dixie Tourney today!! GREAT JOB.......CONGRATS ! The Crescent Tiger Competitive Cheer Team opens their season this morning at Easley High. These young ladies and coaches have worked hard to get ready for the season. GOOD LUCK to Competitive Cheer! The JV Lady Tiger Volleyball team is competing in the JV Tournament at Dixie High today. Good Luck to our Lady Tigers! Crescent Tiger Football scratches out a 26-8 win tonight over Powdersville! Tigers start region play with a victory! CONGRATS TIGERS!!! Tiger Nation.....ROAD TRIP!!! 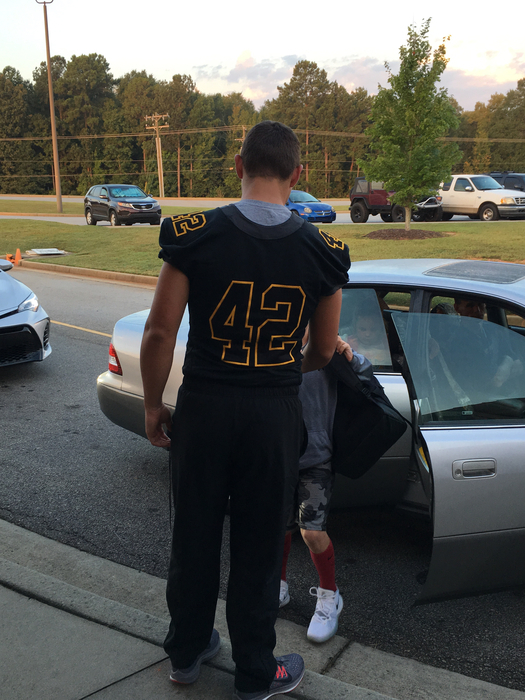 Crescent Tiger Football goes on the road to Powdersville tonight for the first region contest of the year. Kickoff is at 7:30, see you there! Address is in the pic below. As we introduce the 4th and final inductee for the 2018-19 Crescent/New Deal Athletic Hall of Fame Class, we recognize and honor Coach John Franks. From 1987-1990, Coach Franks’ football teams went 34-13 and fell just shy of the state championship game in 1990. Coach John Franks passed away in 2001. 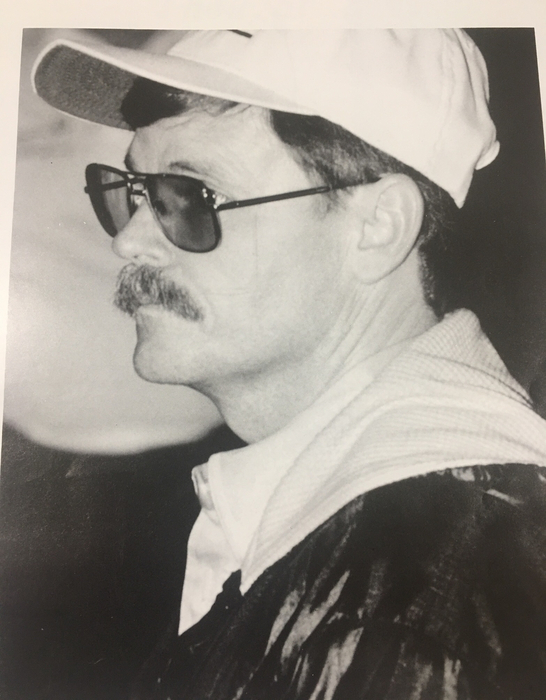 Coach John Franks (Football Coach, AD - 1987-1991): In his time as Head Football Coach at Crescent, Coach John Franks’ teams experienced much success. He has the highest winning percentage of any football coach in Crescent history. Under his leadership, Crescent won the Skyline Conference Championship in 1990 and was runner-up in 1989. While he was coach, Crescent won at least ten games in a season twice, in both 1989 and 1990, and his 1990 team has the most wins of any Crescent football team with 12 victories. Coach Franks was the Skyline Conference and Anderson Touchdown Club Coach of the Year in 1990, and his 1990 team fell just short of the State Championship game, losing in a very close contest at Crescent. Coach Franks suffered a debilitating stroke that tragically cut short his coaching career. Coach John Franks passed away in 2001. CTeam Volleyball hosts Riverside on Thursday! Action starts at 5:30. GOOD LUCK to our CTeam Lady Tigers! It’s also a football Thursday at CHS! Starr Iva hosts Liberty Middle at 5:30, and the JV Tigers host Powdersville at approximately 7 pm. GOOD LUCK Cubs and Tigers! Crescent Lady Tiger Volleyball hosts Powdersville in a huge region match AT HOME on Thursday. Come out and support our Lady Tigers! JV will start at 5:30, and the Varsity will follow. See you there! 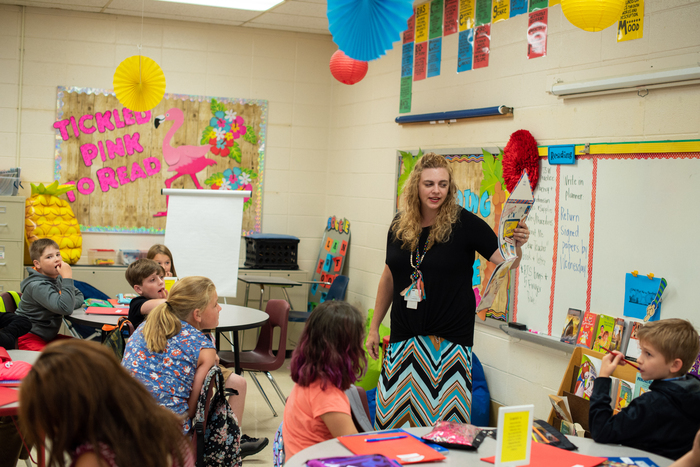 Amanda Pinson was selected to participate in the United Way Young Philanthropists Academy. 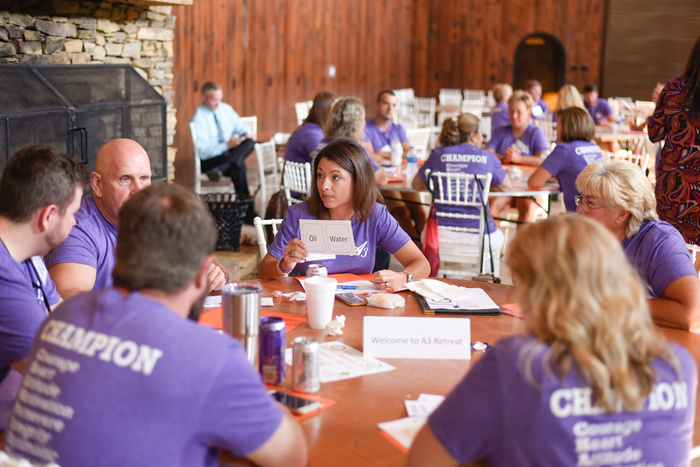 This group of young leaders aged 40 and under are focused on raising the quality of life for all in Anderson County through philanthropy and action. 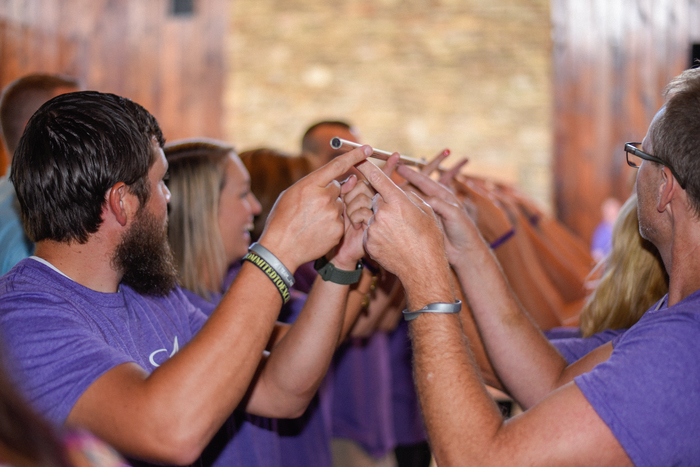 Members expand their social and professional networks with year-round opportunities to meet other young leaders committed to our community. 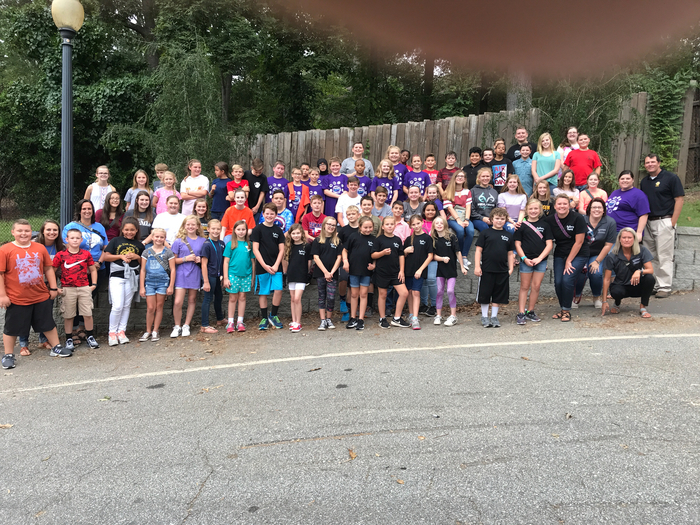 On September 25th, the group went to DCEC and helped out in the classrooms and visited with the children. 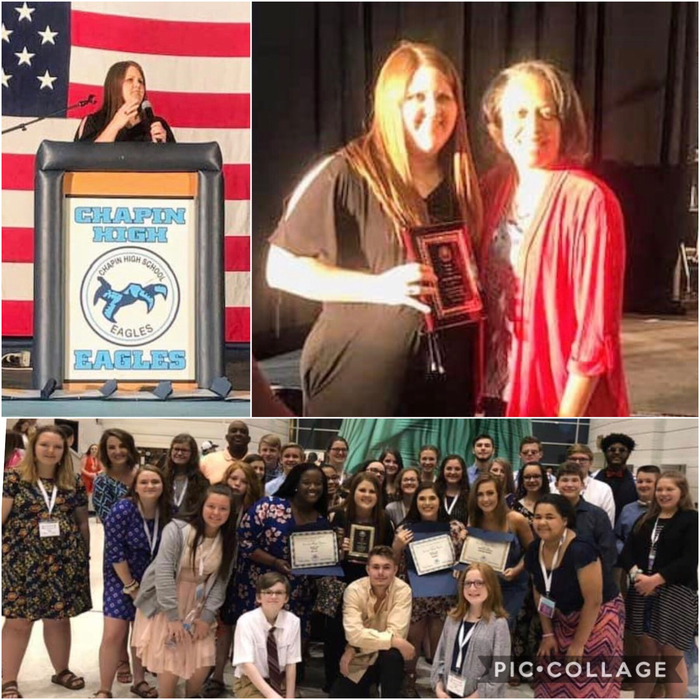 We are so proud of Amanda and her representation of Anderson School District Three. 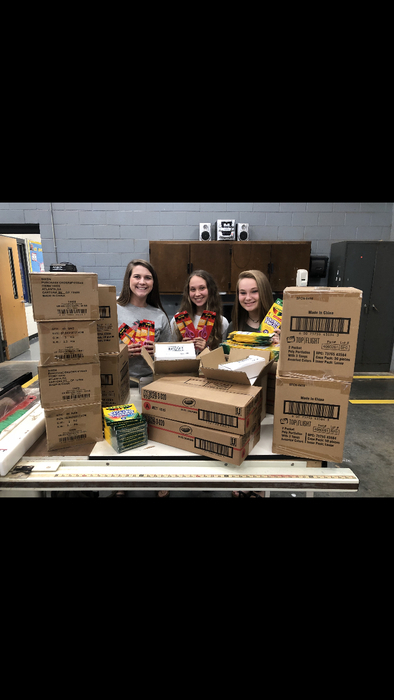 The Crescent FFA is proud to help Anderson Three Elementary schools! Thank you AIMS! 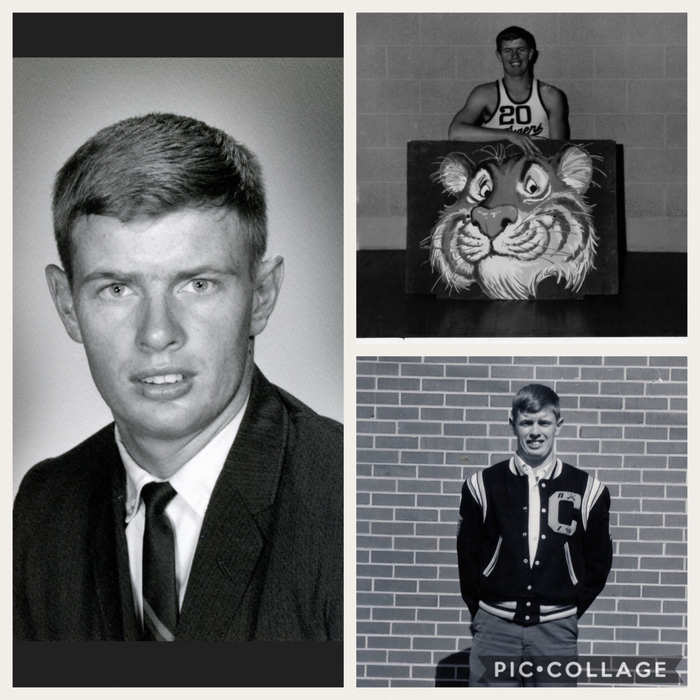 Tiger Nation, meet our next inductee for the 2018 Crescent/New Deal Athletic Hall of Fame Class....Mitch Wilson, CHS Class of 1980! Mitch joins his Mom, Patsy Latham Wilson (‘58), who is a member of the 2017-18 Class..... making them the first family duo in the Hall of Fame! 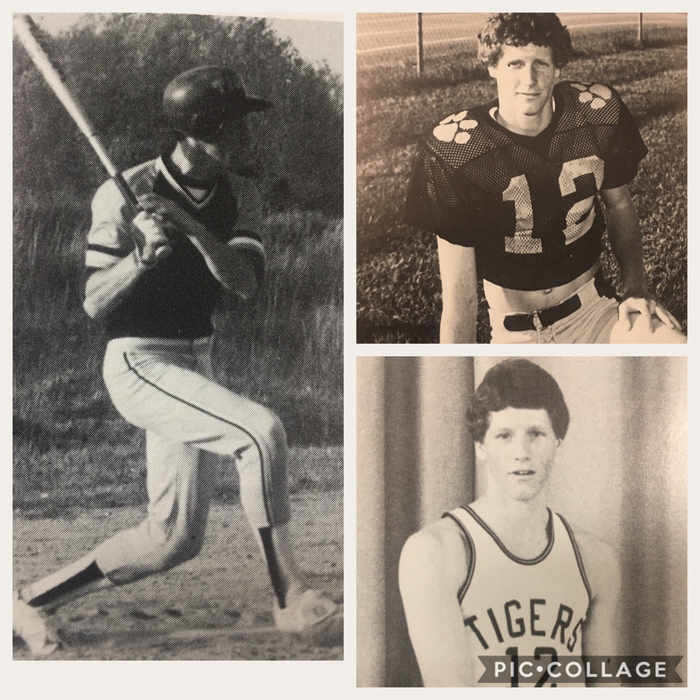 Mitch Wilson – Class of 1980: Mitch Wilson was a three-sport standout at Crescent High School in baseball, football, and basketball. 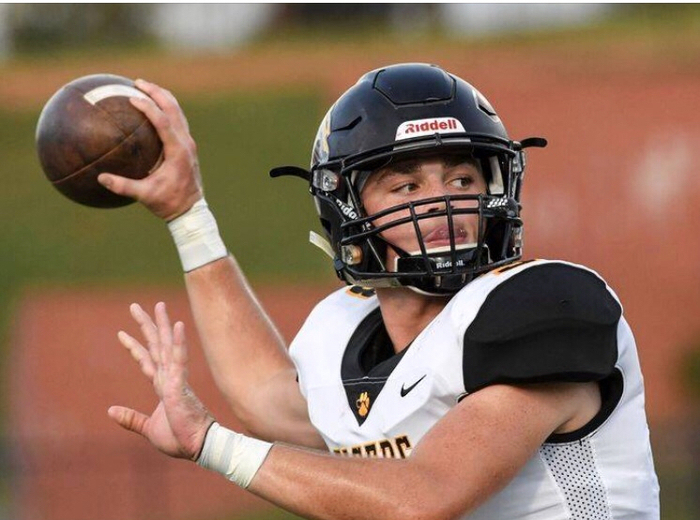 He was starting quarterback and a three-year letterman in football, and received the Most Improved Award his senior year. In basketball, he lettered for three years, and was selected to the All-Conference and All Tournament teams his senior year. As a baseball player, Wilson was a 4-year starter, made the All-Conference team twice, and was the team MVP during his senior year. A leader as well among the student body, Wilson served as Student Body President and received the Crescent Award his senior year. Upon graduation from Crescent, Wilson played baseball for four years at Clemson University, and was part of the ACC Championship team at Clemson in 1981. CONGRATS to 2018-19 CHS/New Deal Athletic Hall of Fame inductee, Mitch Wilson! 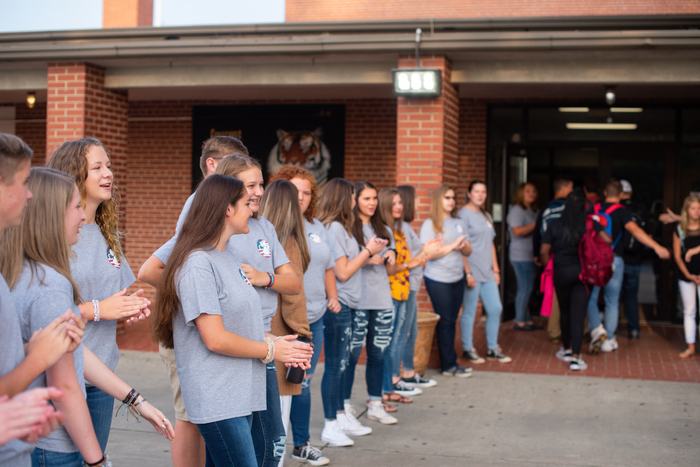 Thank you to our volunteers who led our See You At The Pole event this morning! 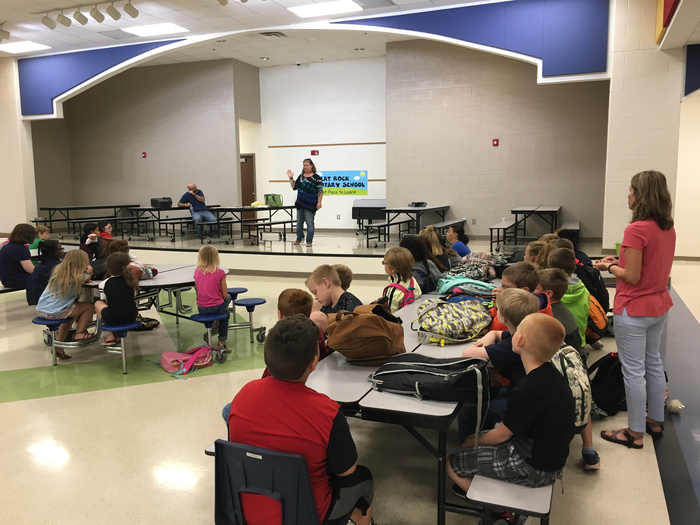 Thank you to the faculty and staff of Flat Rock Elementary School for a great drill after school today. 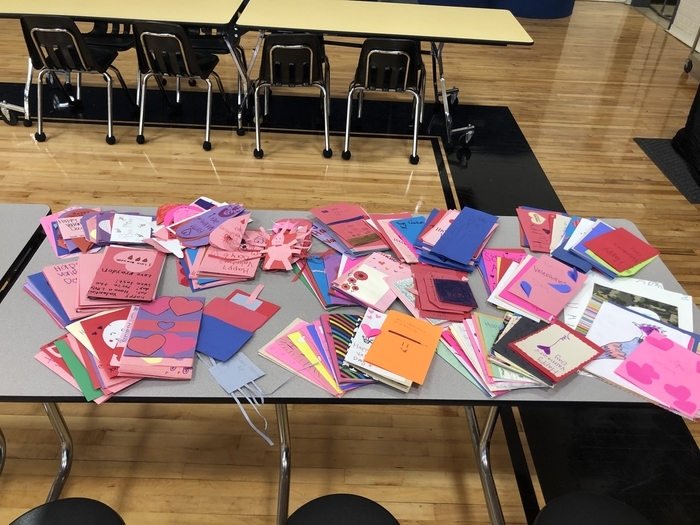 A big thank you to our custodians, paraprofessionals, and cafeteria workers who stayed late to participate. 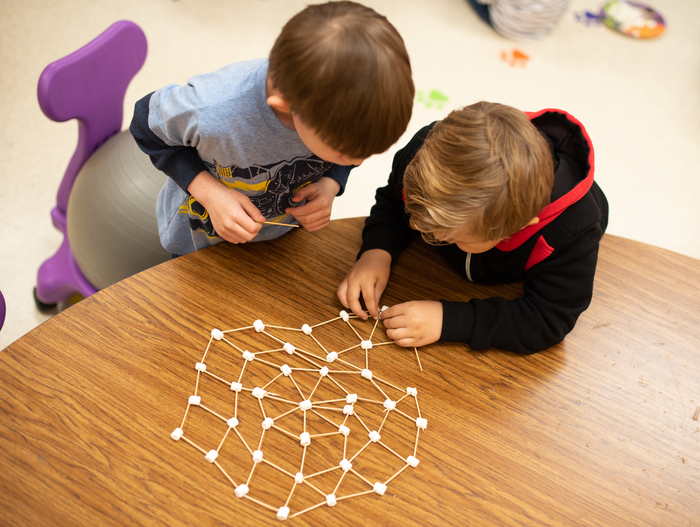 Our school is committed to excellence! 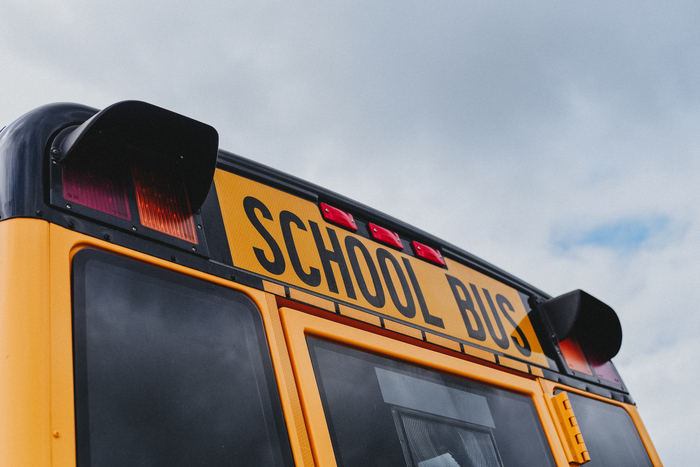 An Anderson District 3 school bus was involved in an accident this afternoon. One student made a precautionary trip to the hospital. Parents of those involved were immediately contacted. GOOD LUCK to CTeam Volleyball as they travel to BHP today! Start time is 5:30. GO TIGERS! 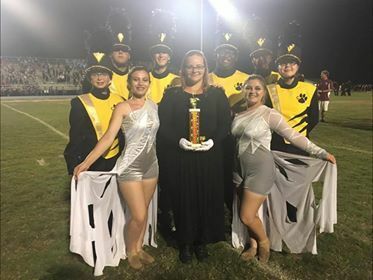 Congratulations to the Crescent High School Band and Color Guard who placed 4th in their division at a competition this past Saturday! The team will compete at Byrnes High School this coming Saturday. 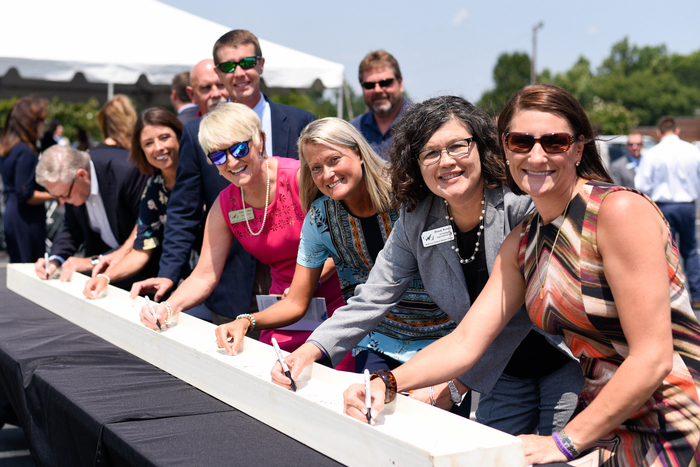 Anderson District 3 would like to thank the following for their sponsorship of the 2018-19 Hall of Fame program: Upstate Federal Credit Union, Complete Turf, Davis Plumbing, ABM Industries, First Baptist Church of Iva, WCTEL, and Autech. 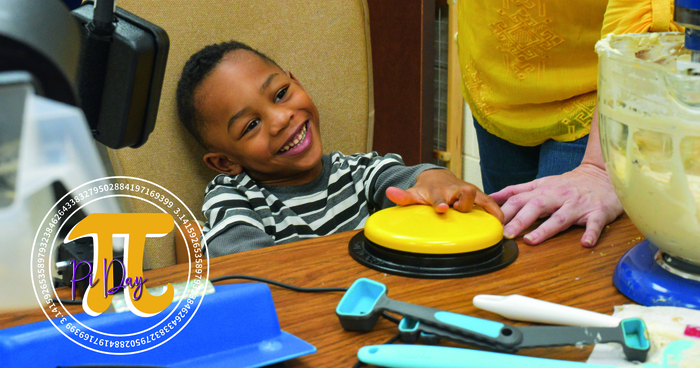 We appreciate your continued support for the Starr and Iva communities. As we continue with our salute to and introduction of the Crescent/New Deal Athletic Hall of Fame inductees for 2018-19, we say a huge CONGRATS to three-sport athlete George Gray, Crescent High Class of 1965! 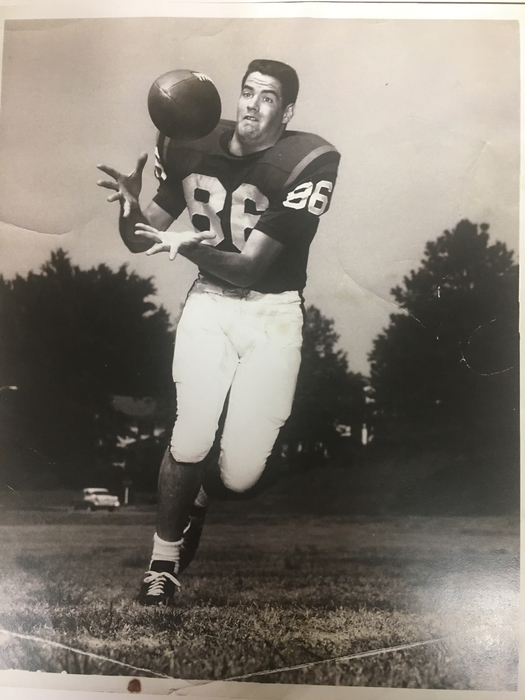 George Gray – Class of 1965: Referred to by one of his former coaches as “...one of the greatest athletes I ever had the pleasure to coach,” George Gray was a three-sport star at Crescent in basketball, football, and baseball. In football. As a football player, he was All-Conference for two years, participated in the North-South All Star Game, and was MVP his senior year. As a standout in basketball at Crescent, Gray played in three state championship contests and on four conference championship teams. He was also captain of the basketball team and held the state record for steals in a state championship game for over three decades. 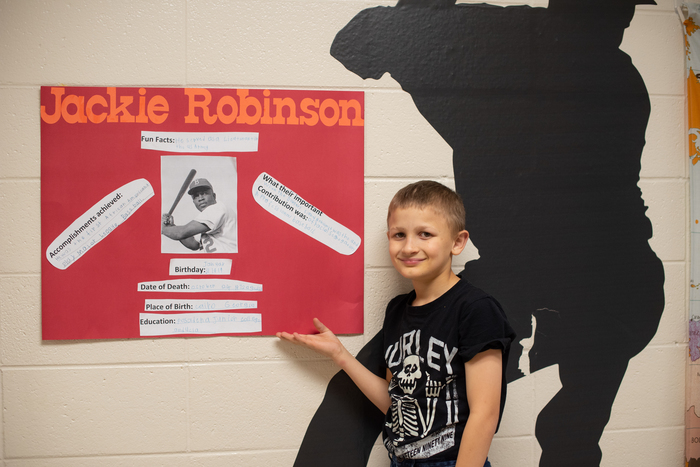 He received the “I Dare You” Award for character and leadership upon graduation from Crescent in 1965, and lettered in both basketball and baseball at Anderson College. Gray also served as a youth coach at the Anderson Area YMCA for many years, and was a YMCA Ambassador in 2008. CONGRATS to George Gray, Class of 1965! Crescent JV Volleyball gets the 2-0 victory over West Oak tonight, making it a perfect night for Tiger Volleyball! CONGRATS to Crescent Lady Tiger Volleyball..... region victory over West Oak tonight! 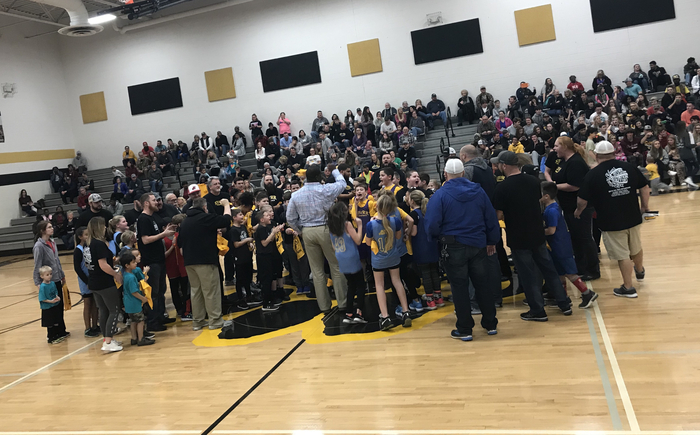 Our Lady Tiger players and coaches LOVED hosting our future Tigers for Rec Night! GO TIGERS!!! CTeam Volleyball gets the win over Riverside tonight! CONGRATS ! 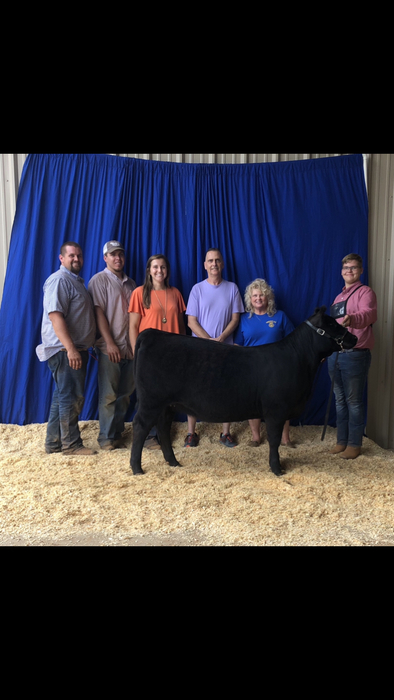 The Crescent Show Team had another great weekend at the Anderson County Livestock Show! 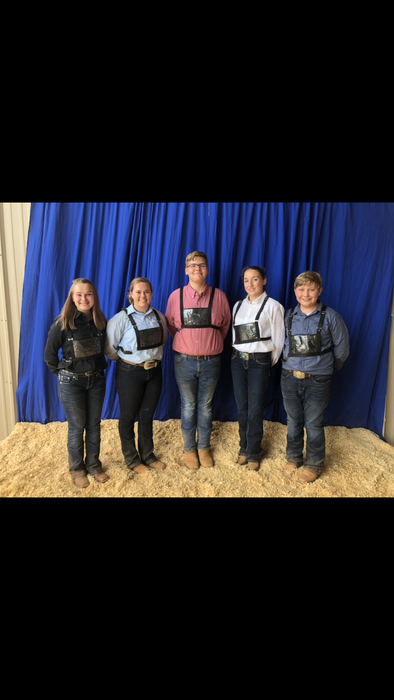 Several students placed in the top of their showmanship classes. 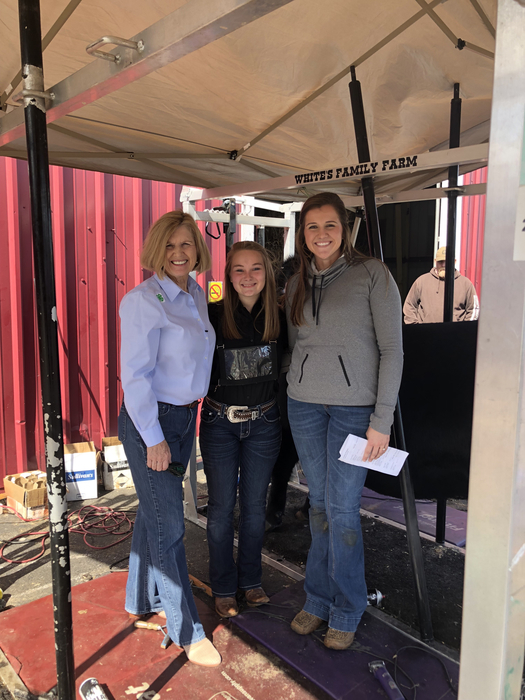 Hannah Wooten won a $300 Anderson County Cattlemen’s Scholarship. 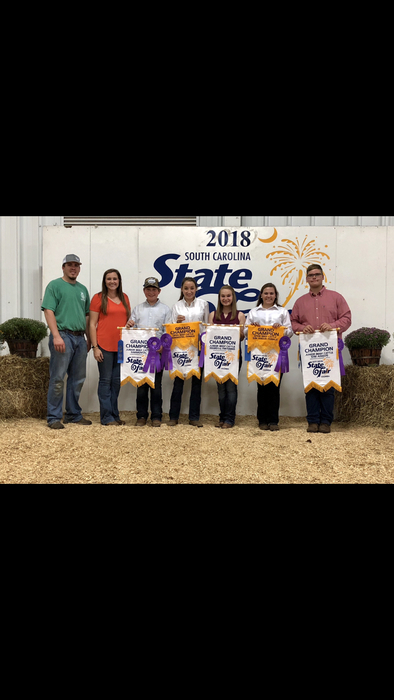 Brent Erwin, Michaela Herring, and Hannah Wooten each took home first place in their respective breed shows. 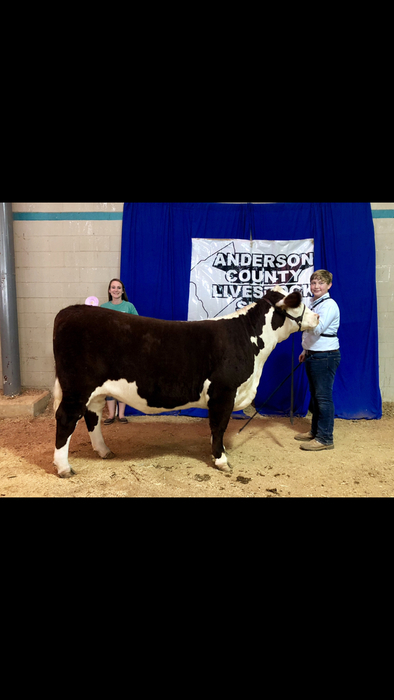 Brent also won Reserve Grand Champion Hereford! A3 Robotics attend performance at the Peace Center to see a live performance from astronaut Terry Virts. Crescent Lady Tiger Volleyball hosts West Oak in another region match tonight. JV starts at 5:30, Varsity to follow. It’s also Rec Volleyball Night, come out and support our current and future volleyball players! As we introduce our newest Crescent/New Deal Athletic Hall of Fame inductees this week, CONGRATS to Danny Jackson, Class of 1964! Coach Jackson is married to Marian Miles Jackson (‘64), and his two children Jeff (‘91) and Anna (‘94) are both CHS graduates as well! Learn more below: Danny Jackson – Class of 1964: As a student-athlete and coach at Crescent, Danny Jackson participated in six state championship contests and was on two state championship teams. 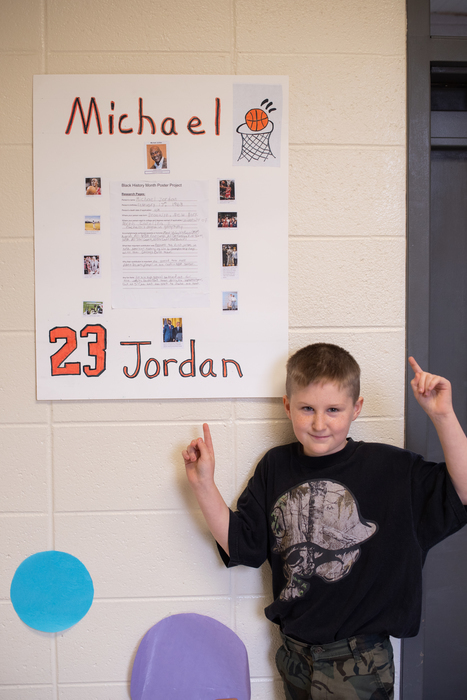 A three-sport star in football, basketball, and baseball, Jackson was on basketball teams that played for three state championships. He was All State, North-South All Star, All Conference, Team Captain and MVP in football, and earned a full scholarship to Clemson where he was a part of two ACC Championships. 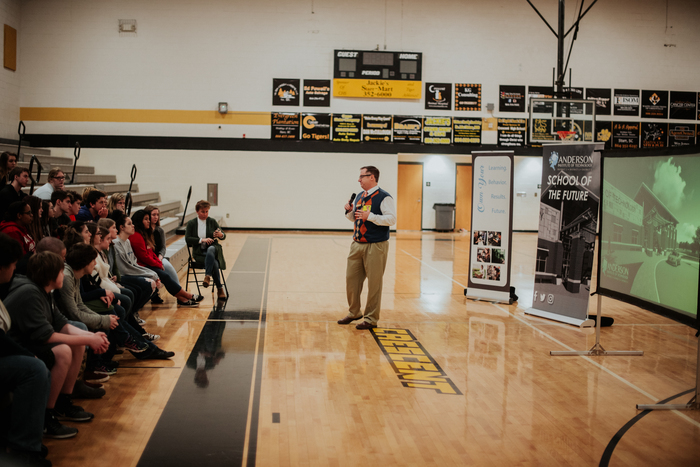 After serving in the United States Air Force, Jackson served as a teacher, coach, and administrator for 30 years in Anderson 3, coaching in basketball, football, and golf. He was also the Athletic Director at Crescent for five years. 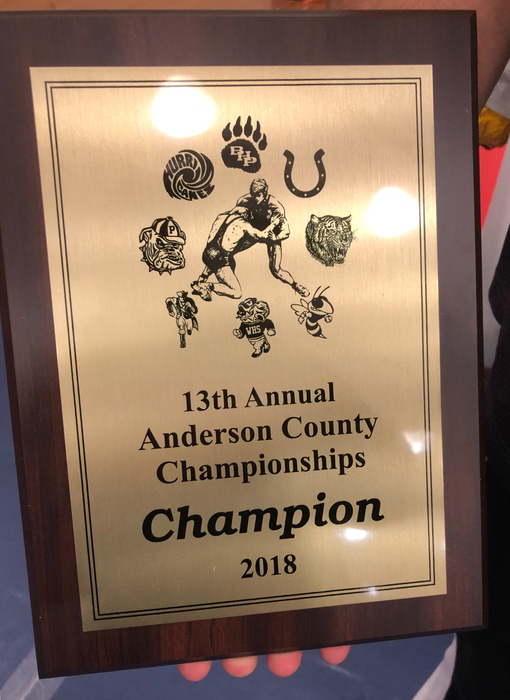 During that time, Crescent teams won the region title in football, three state championships in softball, and a state championship in wrestling. 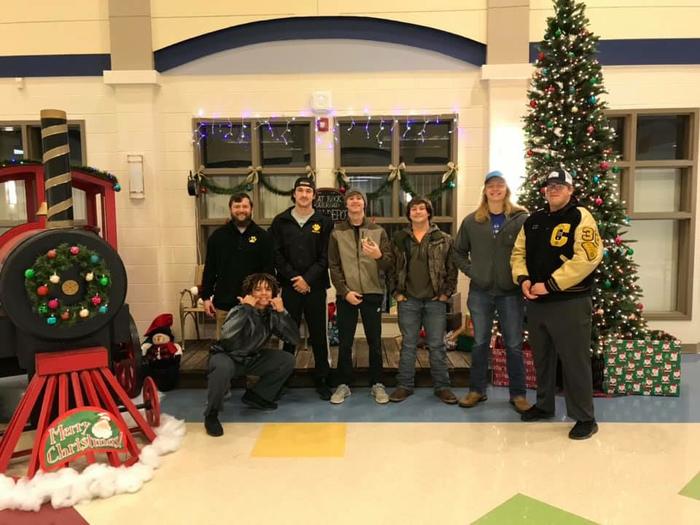 Without question, one of Jackson’s most significant accomplishments at CHS was that he initiated/co-sponsored the FCA Chapter at Crescent for 18 years. CONGRATS to Danny Jackson, Class of 1964! On behalf of the Crescent/New Deal Athletic Hall of Fame Committee, Congratulations to the 2018-19 class of inductees! Danny Jackson - Class of 1964 (Athlete, Coach, Athletic Director) George Gray - Class of 1965 (Athlete) Mitch Wilson - Class of 1980 (Athlete) John Franks - Coach The Hall of Fame Induction Banquet will be held on Thursday, October 25 at 6:30 pm in the Crescent High School Media Center. For info on tickets, contact Crescent High School at 874-352-6175. More information on the inductees will be following in the coming days! Tiger Football wins a THRILLER over Fox Creek tonight! Late drive and score for the 35-29 victory! GO TIGERS! 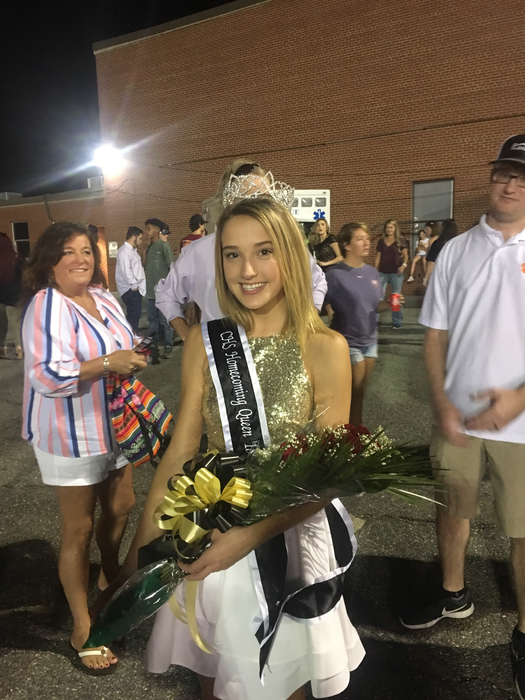 CONGRATS to the 2018 Crescent High School Homecoming Queen...Miss Jordan Milford! At the half, Crescent Tiger Football leads Fox Creek by a score of 16-8. It’s a Football HOMECOMING Gameday Morning!!!! 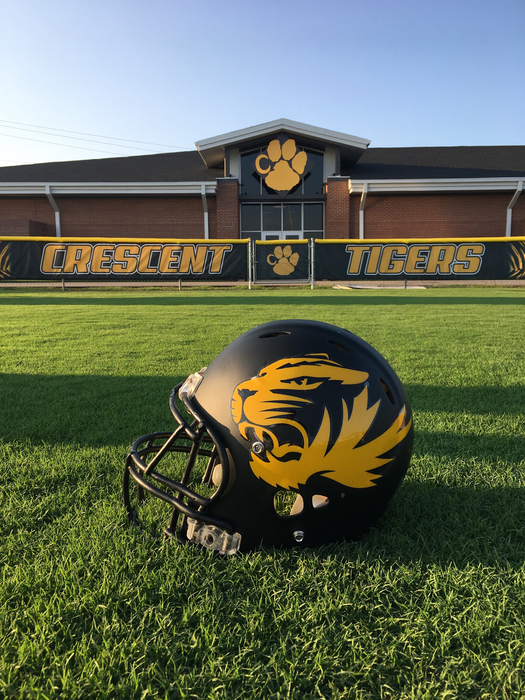 Crescent Tiger Football takes on Fox Creek at 7:30 tonight.... come out and support our Tigers and take in the Homecoming festivities! GOOD LUCK to the JV Football Tigers as they travel to Fox Creek today. Please note the early start time of 5:00 pm because Fox Creek does not have lights on their JV field. GO TIGERS! It’s been a great long weekend for the Crescent Show Team! 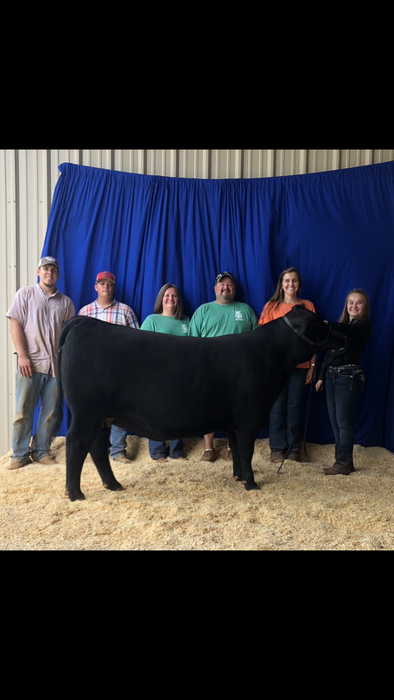 The team traveled to the York County Fall Livestock Show on Saturday where Nick Bowman, Brent Erwin, and Michaela Herring all took home first place in their respective breed classes of the Angus, Hereford, and Simmental Shows. 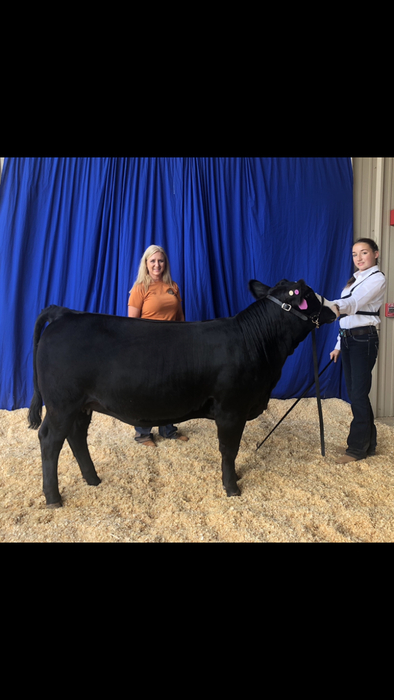 Hannah Wooten received second place in a tough Senior Showmanship drive, and she also won Reserve Grand Champion in the Crossbred Show. 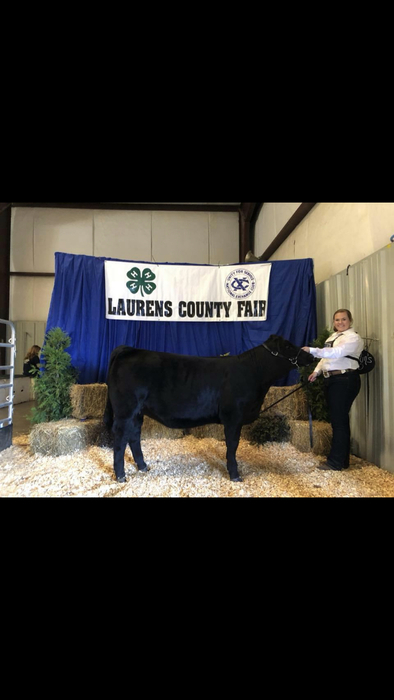 Today, the team traveled to the Greenwood County Livestock Show where Nick Bowman and Emily Wilson both took home first place in their respective breed classes of the Angus and Crossbred Shows. 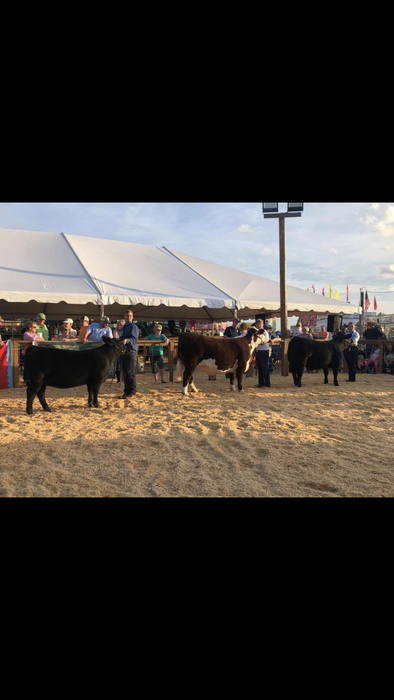 Brent Erwin won Reserve Grand Champion in the Hereford Show. 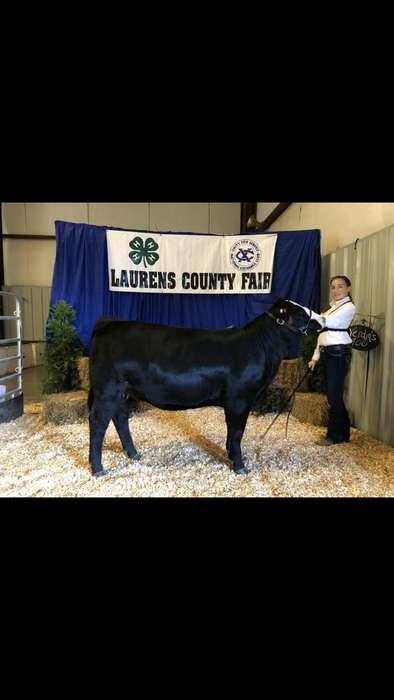 Hannah Wooten received second place in anther tough Senior Showmanship class, won Grand Champion Crossbred, and ended the day by winning Supreme Champion Overall Female! 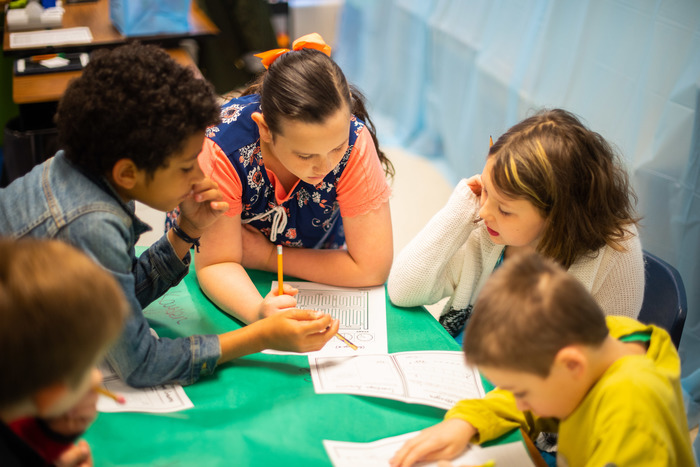 Super proud of how well these students work together as a team, but even more proud of how they win together! 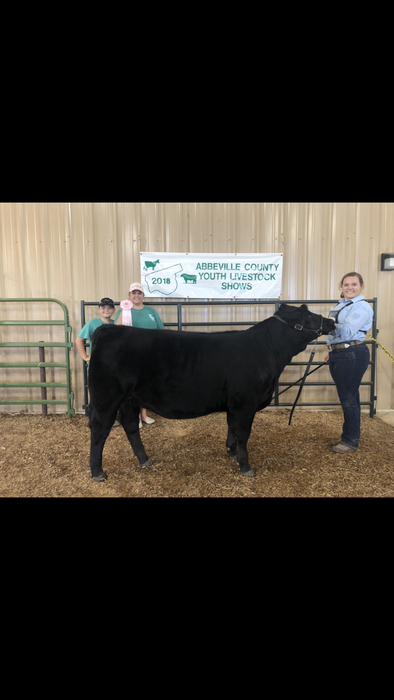 The Crescent FFA Show Team had another successful Saturday at the Abbeville County Livestock Show. Each team member placed in the top of their class in showmanship. Nick Bowman and Hannah Wooten won their breed classes. Brent Erwin won Reserve Grand Champion Hereford. 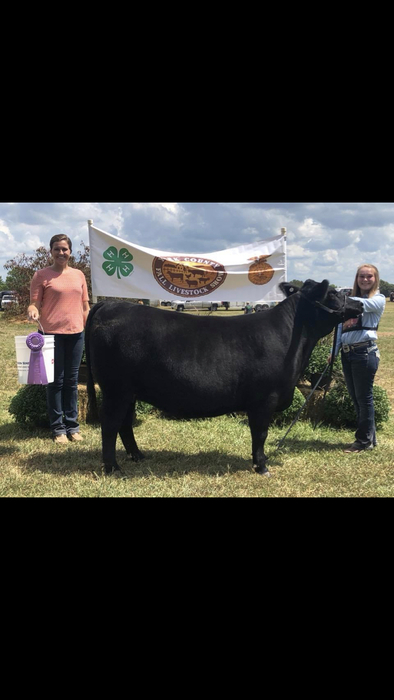 Emily Wilson won Reserve Grand Champion Simmental with Michaela Herring placing second behind her in class. Congratulations to such an awesome group of hardworking young adults! It is time to complete FBLA Membership Applications! Visit https://goo.gl/ZRtnjy to fill out your application. See Mrs. Dickerson in room 104 with any questions. You must be a CHS student to participate. 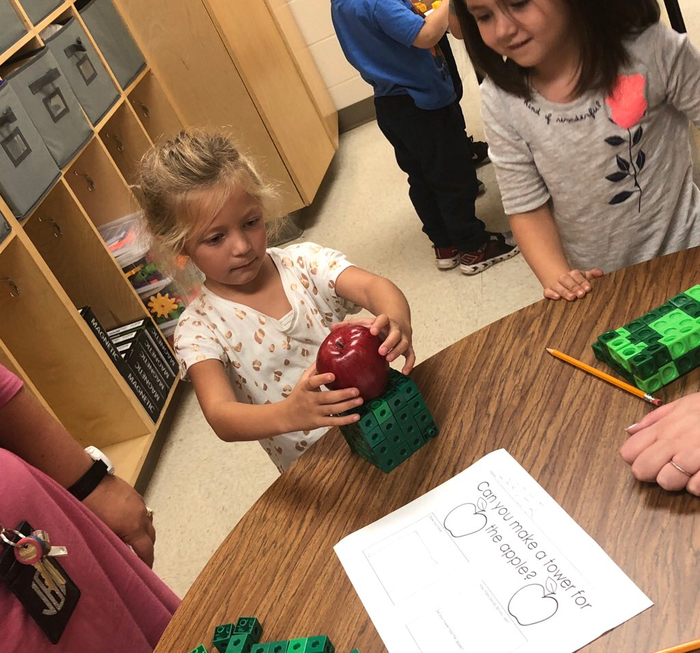 Mrs. Stone’s class is learning about and designing their own gardens. 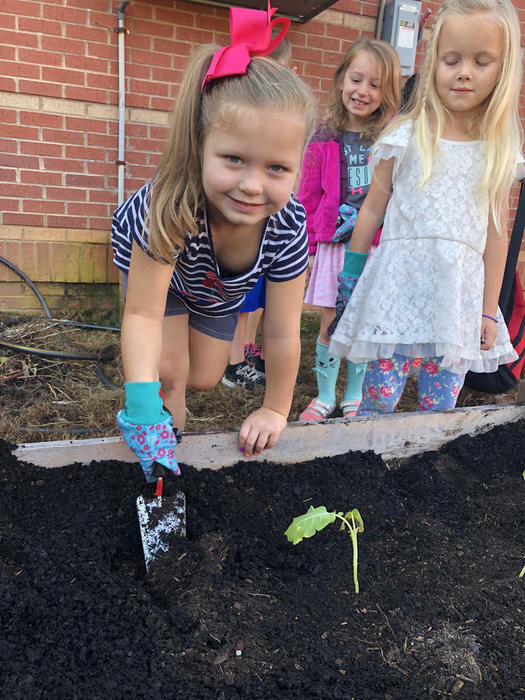 Kindergarten students from Mrs. O'Quinn's class at Iva Elementary have been busy planting a STEM garden! CONGRATS to Crescent Lady Tiger Volleyball....region victory on the road at Seneca tonight! Way to go, Lady Tigers! JV Lady Tiger Volleyball with the victory over Seneca today! Great job Lady Tigers! 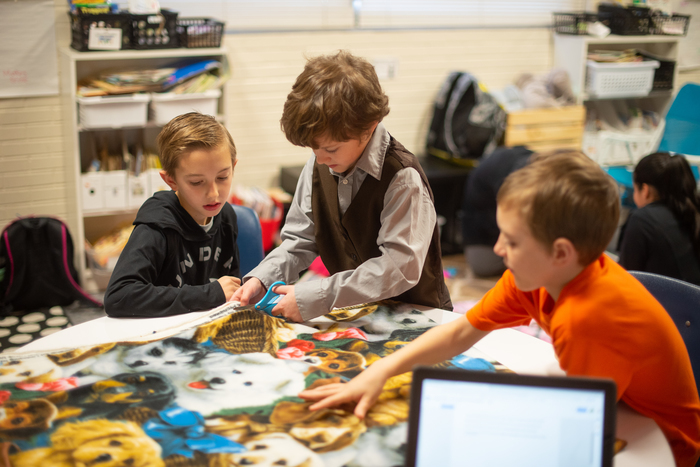 Mrs. Sutherland’s STEM classes are researching and creating prosthetics for animals. Crescent Lady Tiger Volleyball heads to Seneca for another region contest on Wednesday. JV at 5:30, Varsity to follow. GOOD LUCK, Lady Tigers!! 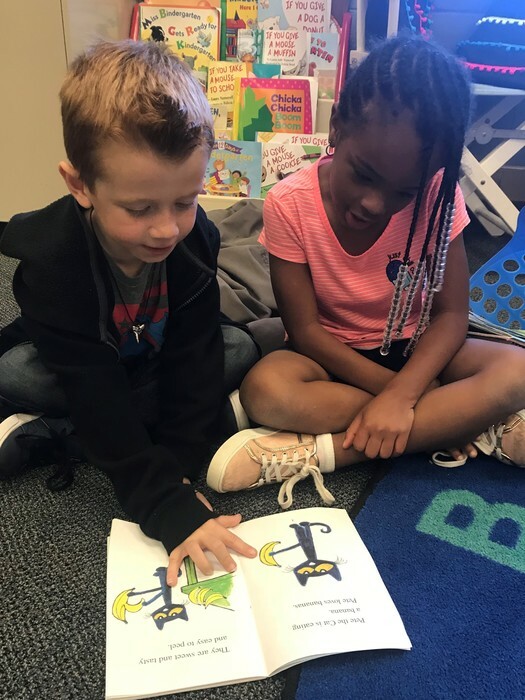 Mrs. Sudduth's K-5 students at Iva Elementary are buddy-reading today! 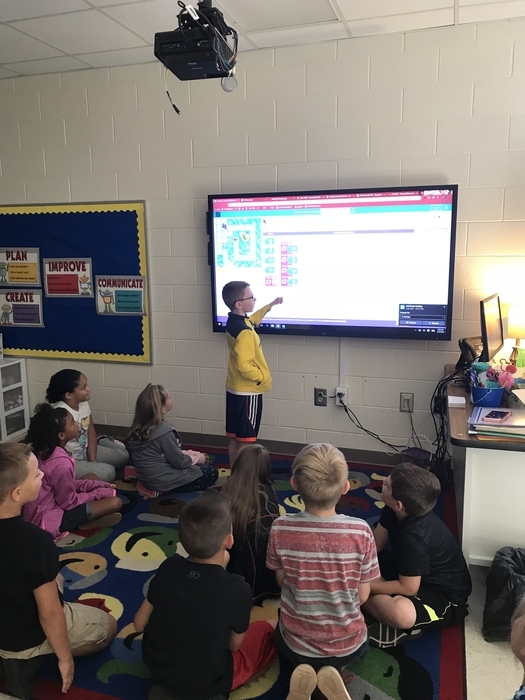 Mrs. Moore’s classes at Flat Rock are learning to code. CONGRATS to Crescent Lady Tiger Volleyball.....victorious over Pendleton tonight in region play! 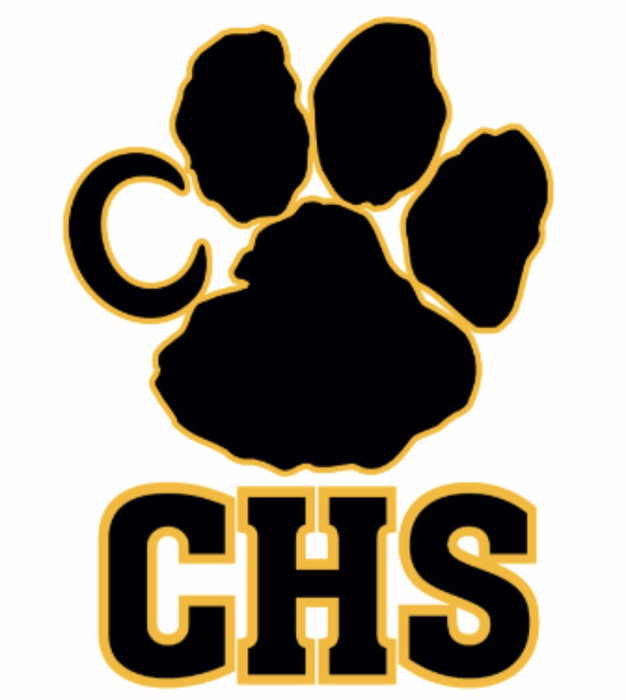 CHS Marching Band Competition Schedule: Sept. 22- Midland Valley(2:30pm performance time) Sept. 29- Byrnes (12:45pm performance time) Oct. 13- Chesnee (3:15pm performance time) Oct. 20- Upper State @ Boiling Springs(6:45pm performance time) We hope to see you this season! 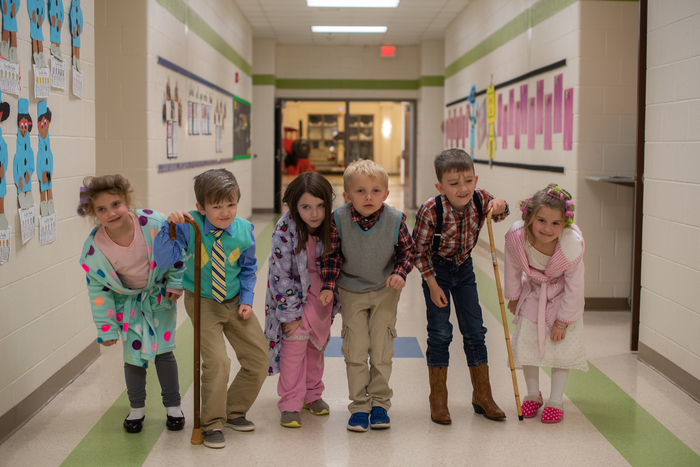 Mr. Watt’s 4K class is ready for Monday! Crescent Lady Tiger Volleyball hosts Pendleton in region play today. JV starts at 5:30, Varsity will follow. Come out and support Lady Tiger Volleyball TONIGHT! 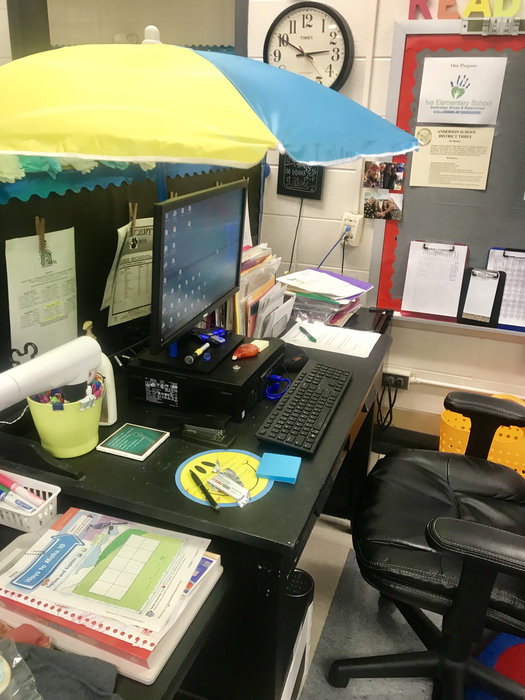 Mrs. Davis at Iva Elementary is ready for the storm. 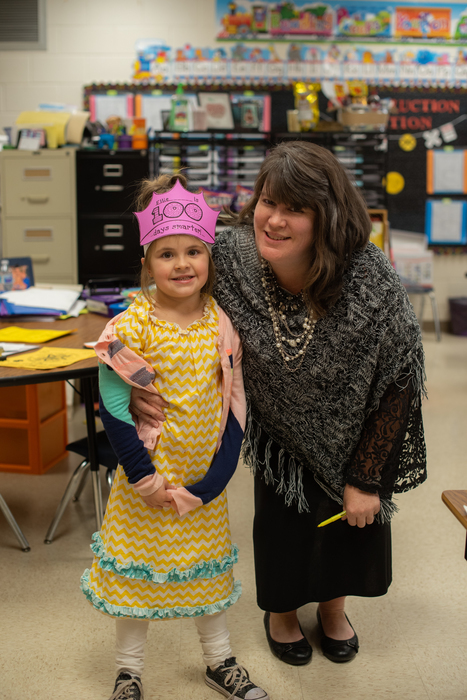 She gets the technology department’s Golden Apple of the week! We love Thursdays at the Rock! 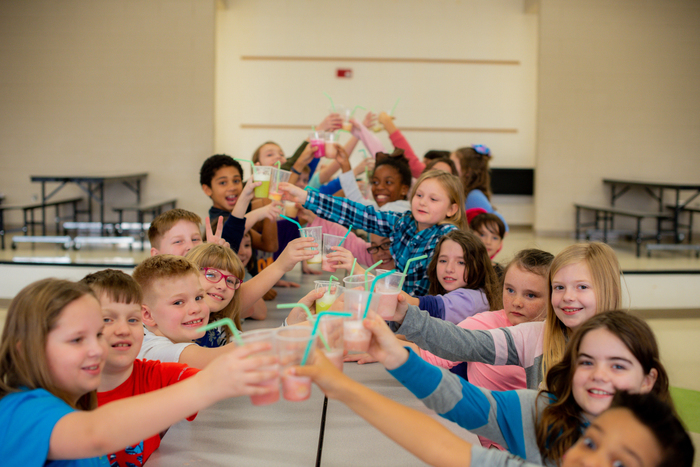 Mrs. Christenbury’s class treats us. 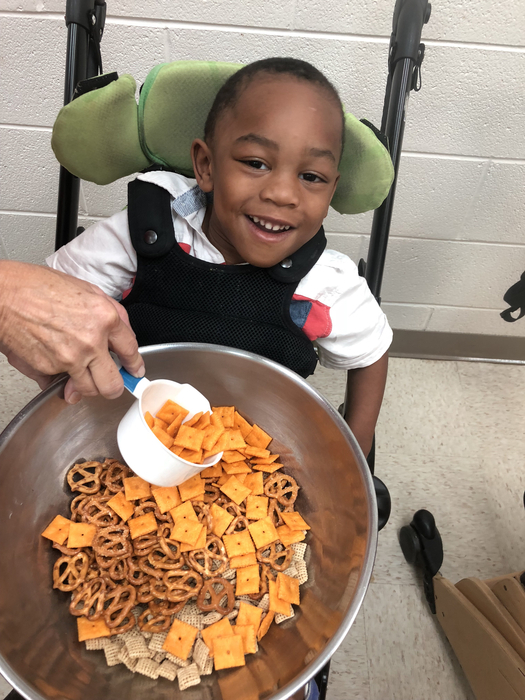 This week is was snack mix. 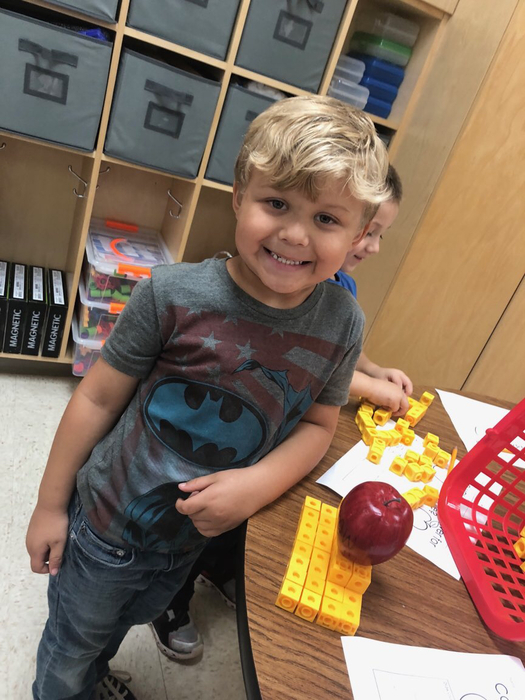 Mrs. Herron’s K5 class has been studying apples. 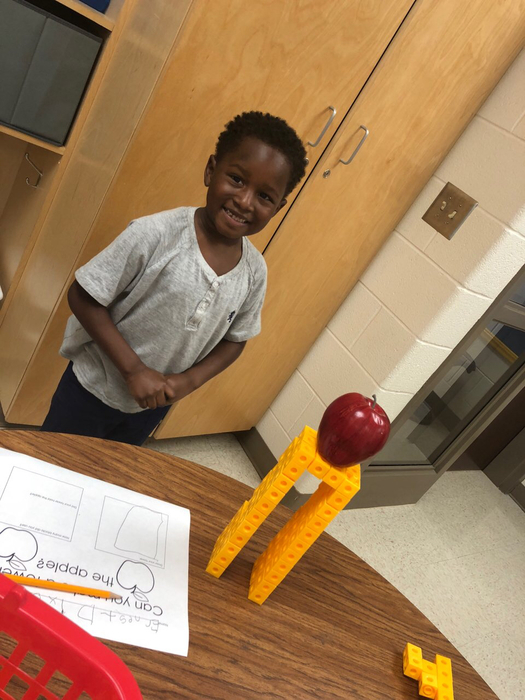 They’ve used their STEM skills to build towers to support their apples. Crescent Lady Tiger Volleyball gets the region victory over Liberty tonight! Way to go, Lady Tigers! Crescent Lady Tiger Volleyball travels to Liberty for region play on Thursday. JV at 5:30, Varsity to follow. Go get it done, Lady Tigers! Good Luck to Tiger Cross Country as they travel to Dixie to compete tomorrow! Attention Seniors! 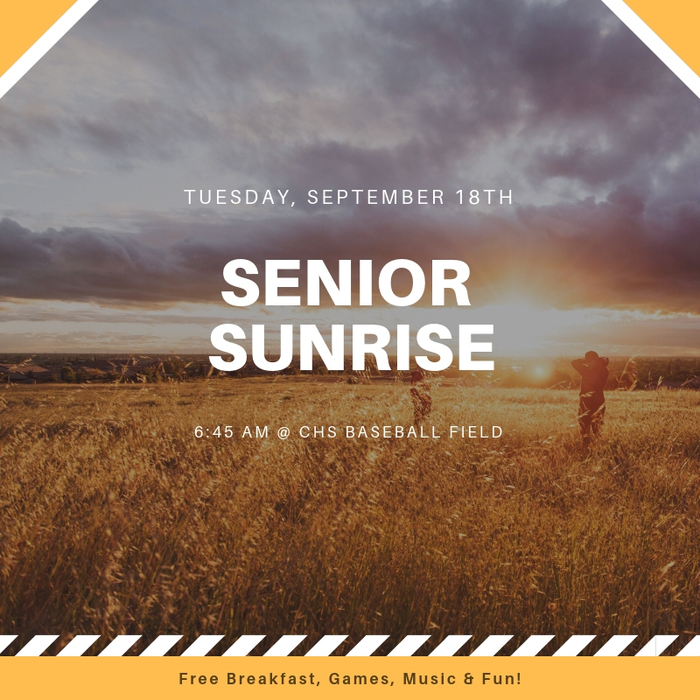 Join us for our annual tradition of Senior Sunrise. Safety is a priority in Anderson 3. 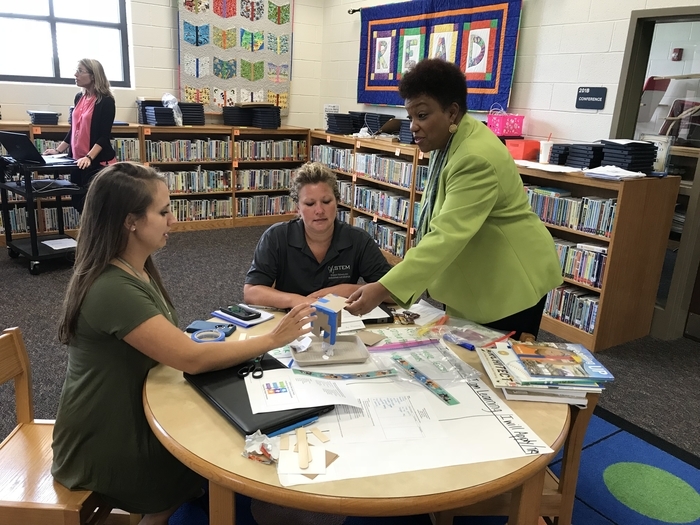 We are continuously monitoring the potential impact of hurricane Florence in conjunction with local and state officials. Any decision to alter the regular schedule will be made once a potential threat to our area is determined. Any changes to our schedule will be posted through our Anderson 3 App, website, and social media platforms. Crescent CTeam Volleyball Fans.....match on Wednesday vs Gray Court will be at Crescent in the old gym, not at Starr Iva. Start time is 6 pm. Go CTeam Lady Tigers! 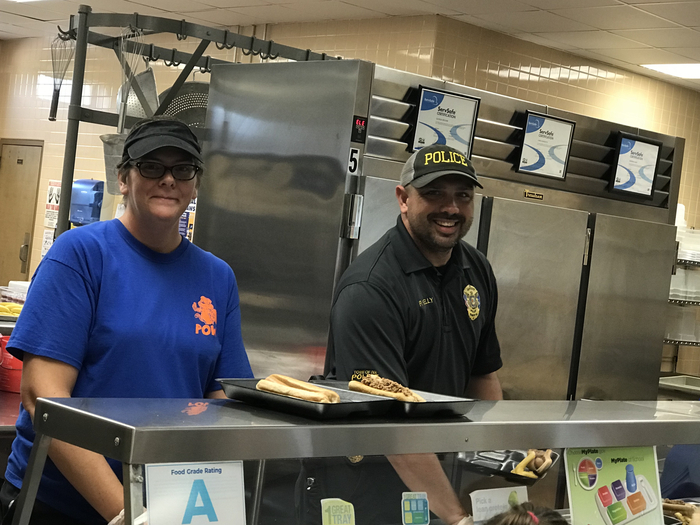 Lunch break for Officer Kelly! 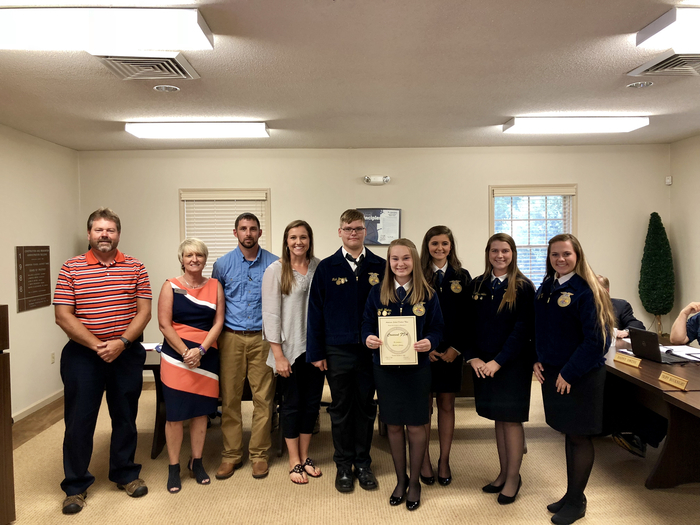 Congratulations Crescent FFA Chapter on receiving the Governor’s Citation and a 3-Star National Rating! CONGRATS to CTeam Volleyball..... victorious over BHP tonight!!! 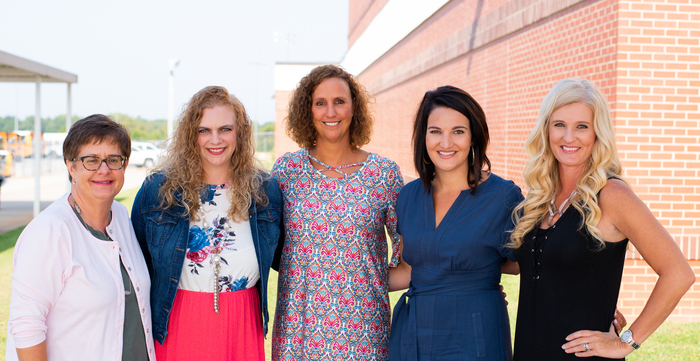 Check out our Teachers of the Year and Support Staff of the year on the billboards along 81 South. 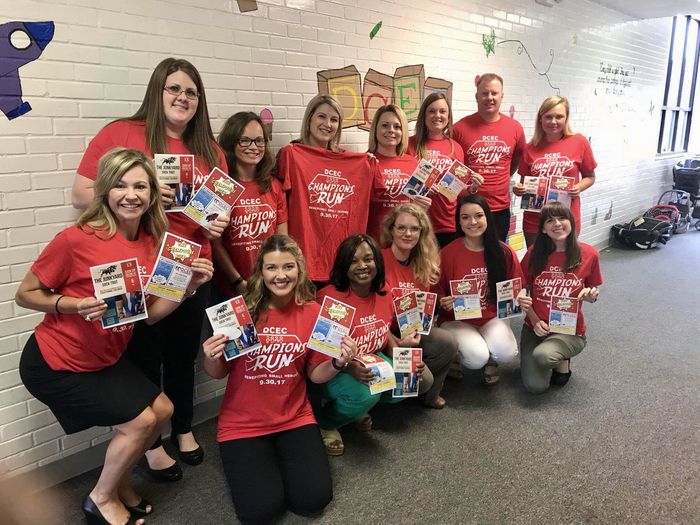 The Teachers of the Year are almost across from the Upstate Federal Credit Union and our Support Staff of the Year are located just before Redi-Mart. CHS students and parents: The phone lines are not working at Crescent High School. WC Tel is working to repair the problem now. We will let you know as soon as the phones are back up and working. Crescent Lady Tiger Volleyball opens region play with a match on the road at Powdersville on Monday! Let’s fill their gym with Tiger Fans! JV starts, at 5:30, Varsity at 7:00. GOOD LUCK to Lady Tiger Volleyball! 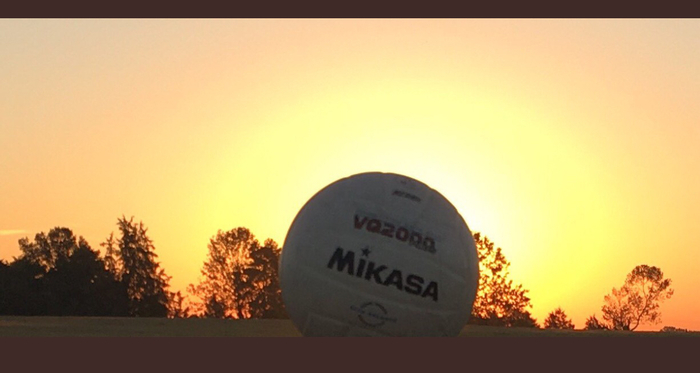 Crescent CTeam Volleyball fans.....the Home match tomorrow (Monday) will be played at Crescent instead of Starr Iva. Start time is the same - 5:30. Good Luck Tomorrow! 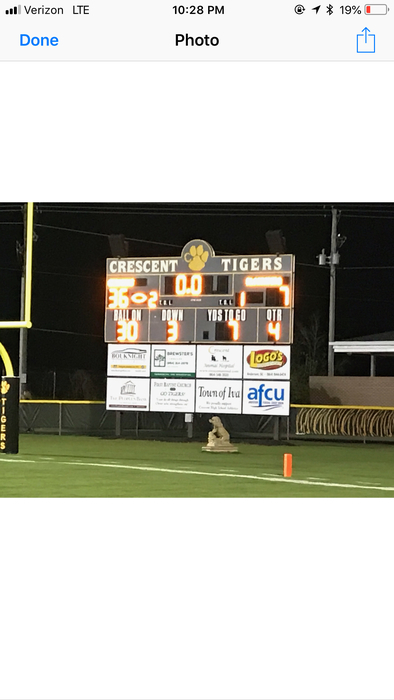 Crescent Tiger Football lost to Palmetto at home on Friday night. The season is young! Tigers will get an off week this Friday and then host Fox Creek for Homecoming on September 21. Make plans now to be there, Tiger Nation! GO TIGERS!! 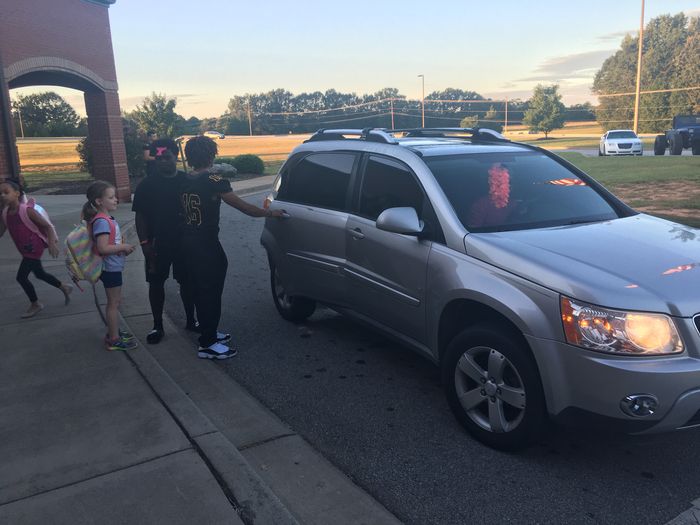 We enjoyed having our CHS football players greet our students again this Friday! Go Tigers! It’s a FOOTBALL FRIDAY! Crescent Tiger Football hosts Palmetto at 7:30 tonight. Let’s pack the stadium with Tiger Fans! See you there! 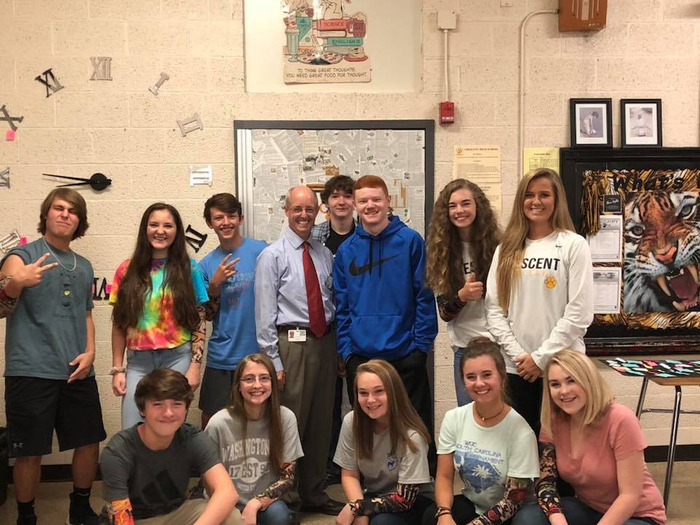 Our very own Mr. Maxey, South Carolina Teacher of the Year, visited the Crescent High School Teacher Cadet class today. Crescent Lady Tiger Volleyball gets the win over Walhalla ln the road tonight! CONGRATS Lady Tigers! Way to go, Starr Iva Cubs Football.....victorious over Gray Court tonight! CONGRATS! 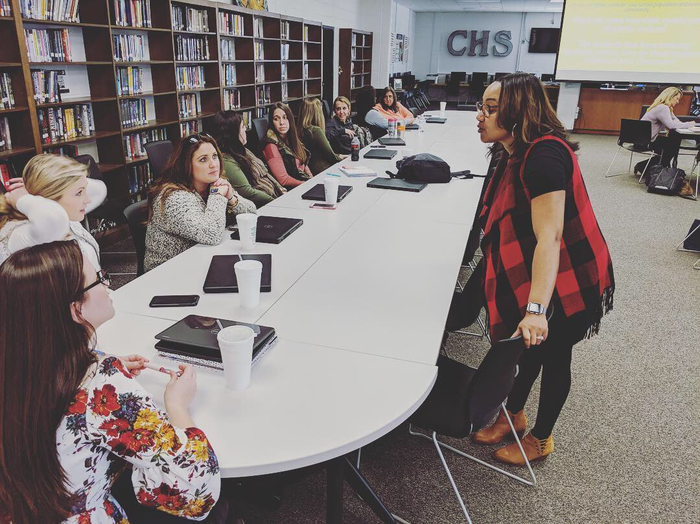 The chrome book deployment at Crescent High School was a huge success. Thank you to everyone that made this possible. Especially thank you to the technology department for a seamless deployment. 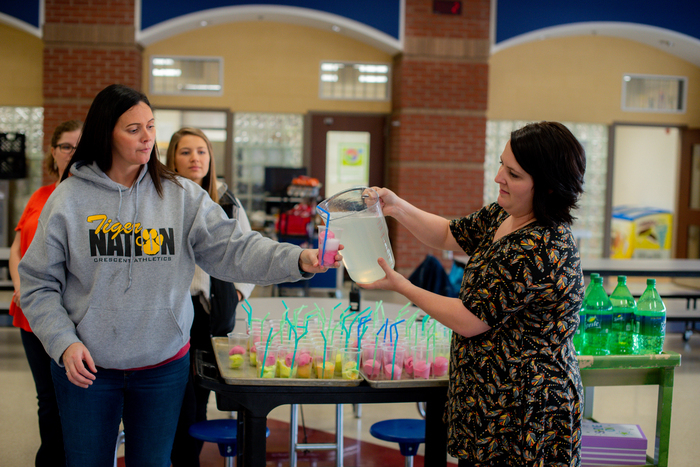 Starr-Iva Middle School would like to thank Bonding Old New Deal Students for their generous donation to our school! 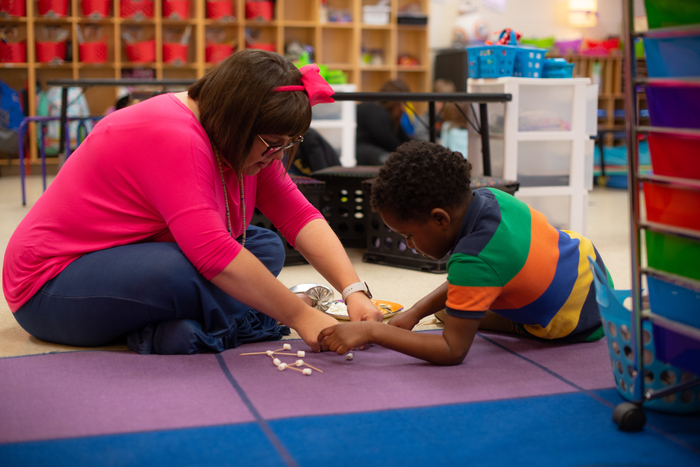 Knowing we have community members who love and support our school is such an encouragement as we work to help our students become lifelong learners. Crescent Lady Tiger Volleyball travels to Walhalla tomorrow night! JV starts at 5:30, Varsity to follow. GO LADY TIGERS! Crescent JV Football travels to Palmetto tomorrow night! Kickoff at 7 pm. Let’s get it done, JV Tigers! Starr-Iva Middle School Football opens the season AT HOME tomorrow vs. Gray Court. Kickoff is at 7 pm at CHS. Come cheer on our Cubs! CONGRATS to Crescent CTeam Volleyball, victorious over Robert Anderson tonight! 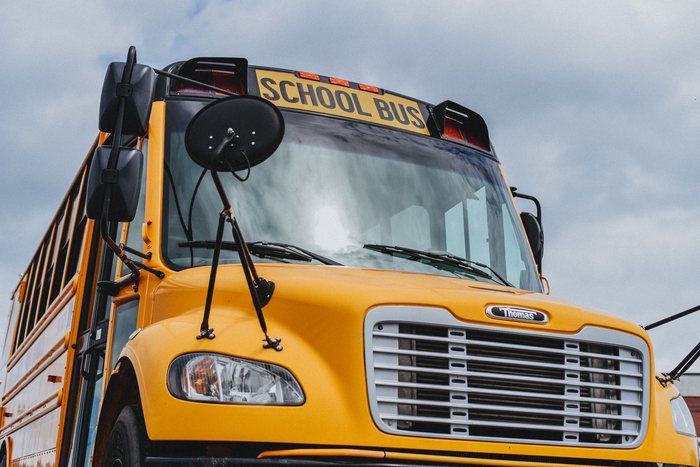 The Anderson 3 Transportation Department is looking for Substitute Drivers and Aides. Please contact the Bus Office at 352-3200! Crescent Lady Tiger Volleyball gets an exciting win over BHP tonight. CONGRATS Lady Tigers! Will travel to Walhalla on Thursday. GO TIGERS!! CHS Parents: Senior make up pictures will be made on September 10th. Sign up in main office for appointment. Sitting fee is $20. Seniors must have pictures made in order to be pictured on the screen at graduation. Check out our new district office sign! 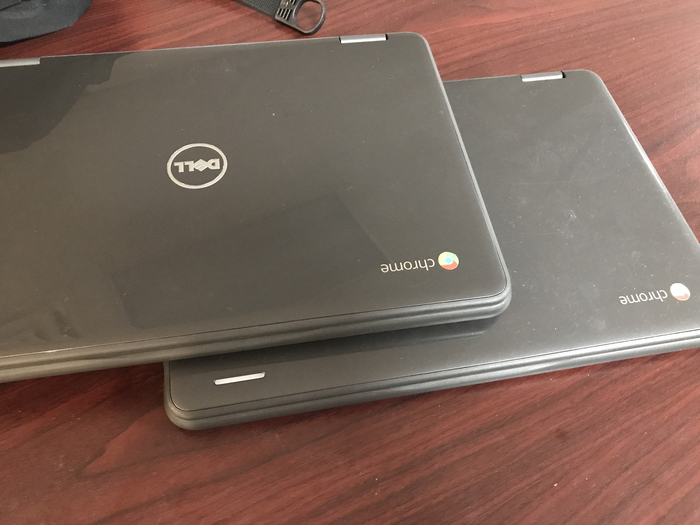 Attention all CHS Parents: There will be an important 1:1 chromebook meeting on September 4th at 5pm in the Commons area at CHS. 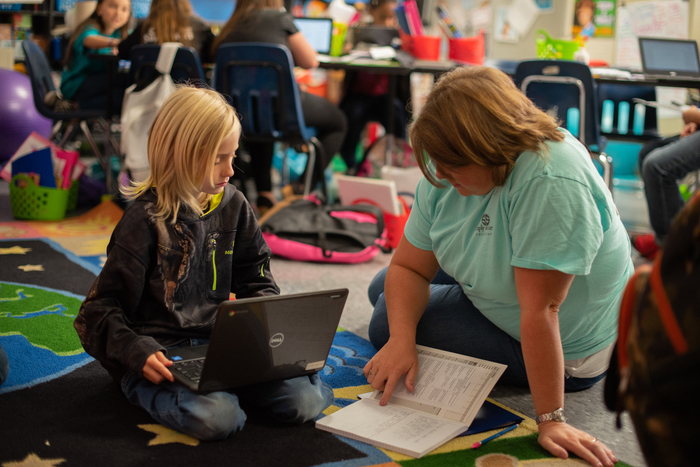 Parents will receive important information regarding the Chromebook rollout. We are excited to share some important information with you. 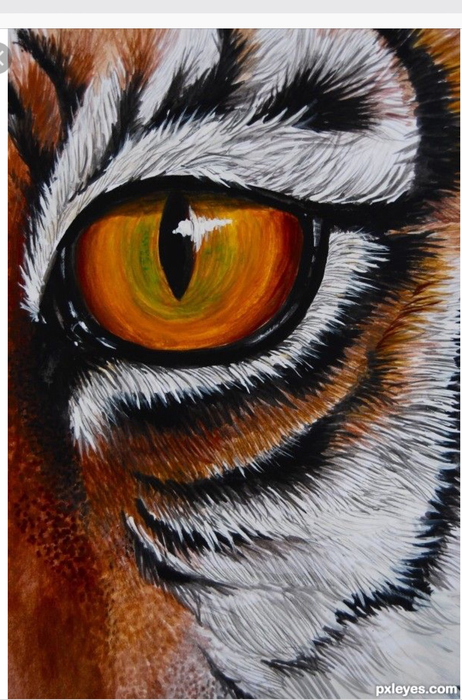 Tiger Nation....Crescent Tiger Football is AT HOME again this Friday night vs. Palmetto! Kickoff at 7:30, SEE YOU THERE! 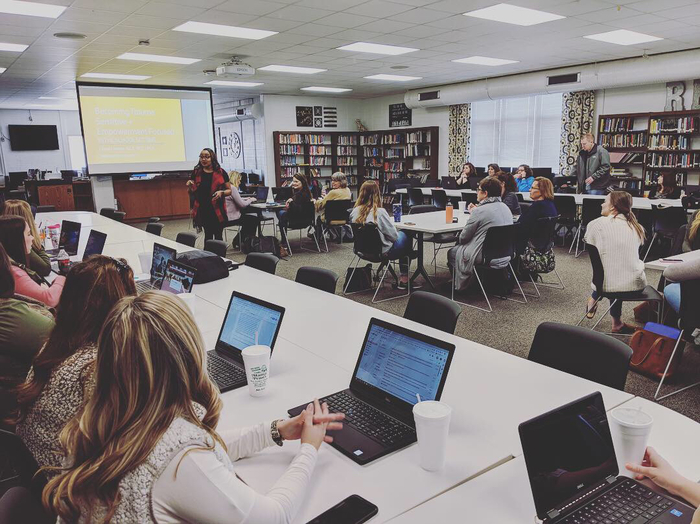 Crescent High School Class of 2019 - This is a reminder of the senior parent meeting tonight at 6:00 in the Media Center. We look forward to seeing you there! Crescent Girls and Boys Cross Country will run at Abbeville tomorrow afternoon. GOOD LUCK to our Cross Country teams! GOOD LUCK to Crescent Lady Tiger Volleyball as they play BHP AT HOME on Tuesday! JV starts at 5:30, Varsity to follow at 7. Come out and cheer on our Lady Tigers! CHS Parents: There will be a 12th grade parent meeting on Tuesday, September 4th at 6pm. The meeting will be held in the media center at Crescent High School. 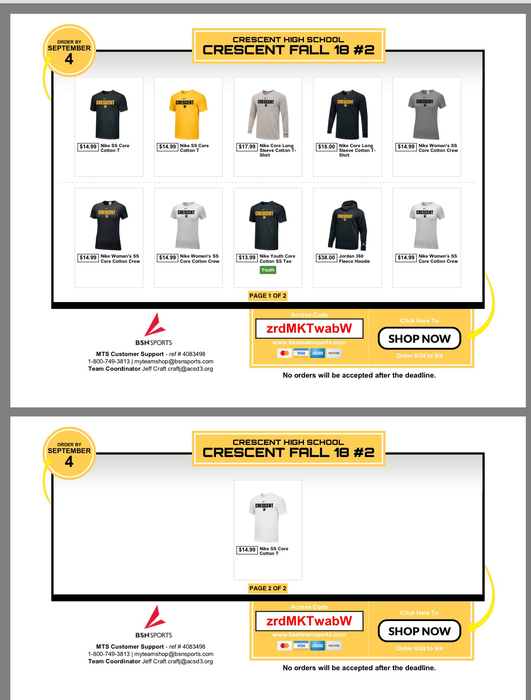 TIGER NATION....you still have time to order your Crescent sports apparel by Nike! Go to www.bsnteamsports.com and enter our store code: zrdMKTwabW Or....click on the link here! https://www.bsnteamsports.com/v3/shop/team_shop/zrdMKTwabW#/ The shop closes on September 4, so order you Tiger gear today! 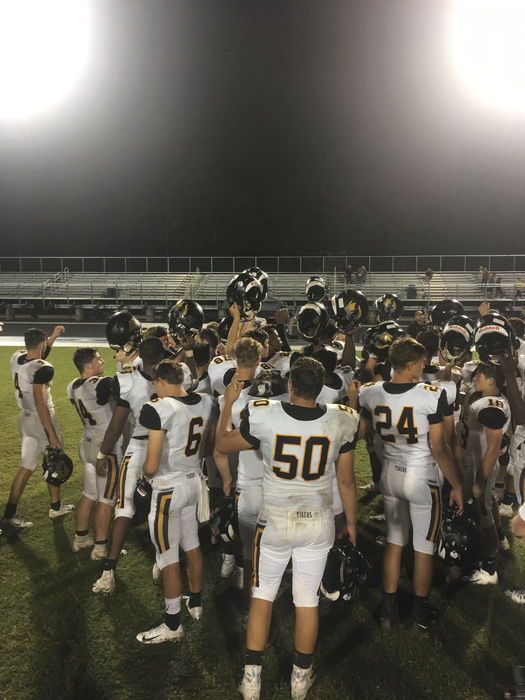 Crescent Tiger Football battled back diligently from an early deficit but fell to a strong Ninety Six team last evening. Loved how Tiger Nation showed up in large numbers and loud voices to make for a GREAT atmosphere for a Football Friday Night! Thank You! Our Tigers will be AT HOME once again this Friday versus Palmetto, kickoff at 7:30. BE THERE! PROUD to be a Tiger! 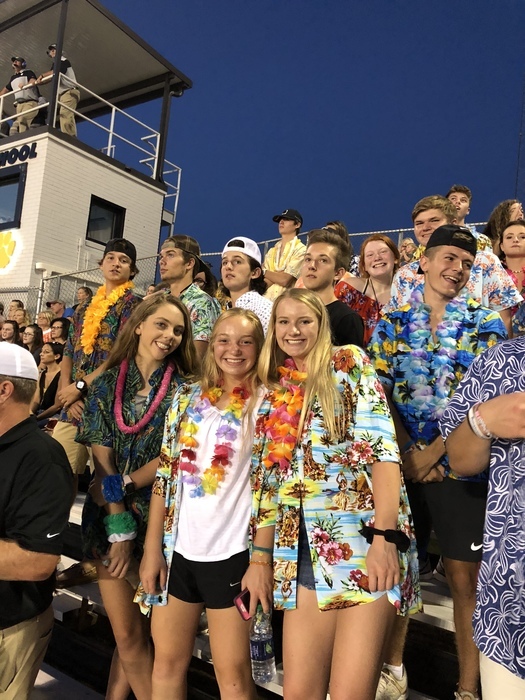 The student section is ready to say Aloha to another great game! 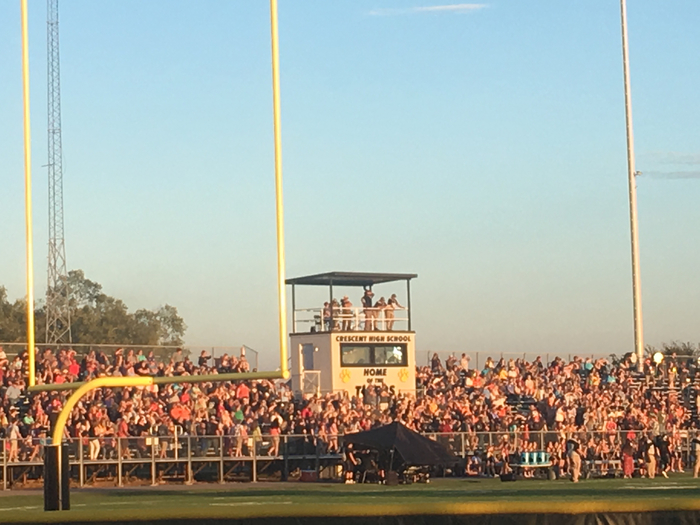 Big crowd tonight, if you aren’t here you are missing a beautiful night for football! Our student section is ready, and the home stands are full of Tigers! 2:32 left in the first quarter, Crescent and Ninety Six are tied at 13. GO TIGERS! 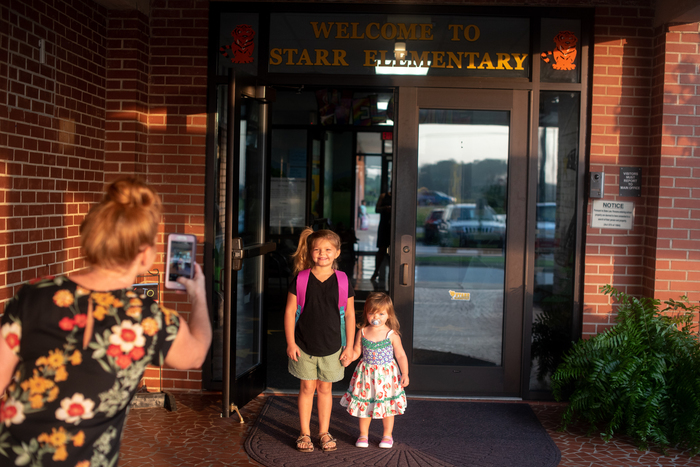 Power has been restored at Starr Elementary. Starr Elementary School has a power outage due to a wreck . Duke Energy expects to have power restored to the school within 20 minutes. 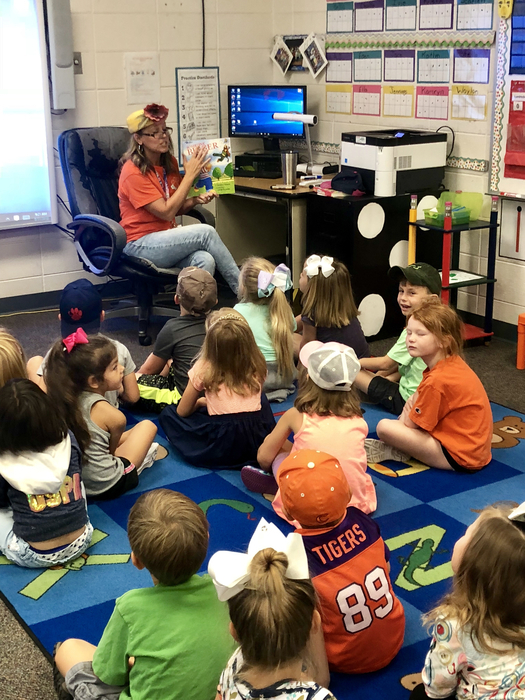 Mrs. Taylor turns into “Chantelle” to read to her Kindergarten students. 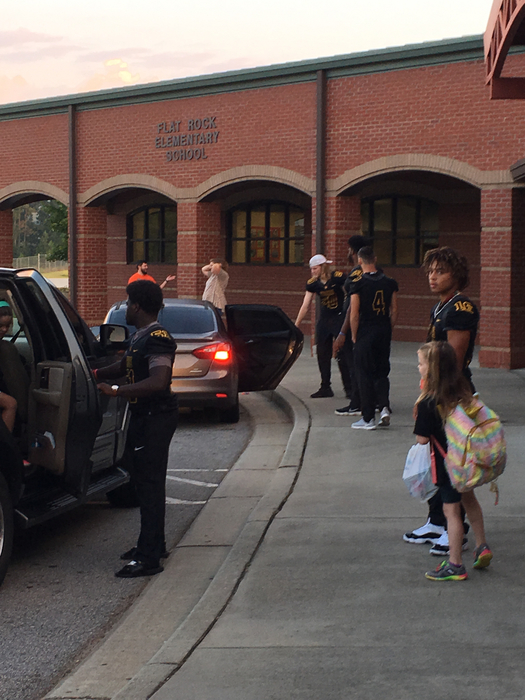 CHS football players and Coach Chambers greeted our students before school this morning, and we loved it! Go Tigers! 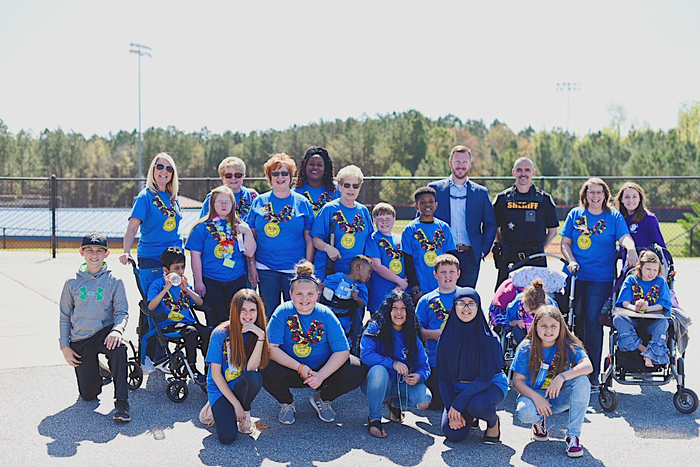 Carolina Morning will be moving over to the CW Channel in the 7:00 am hour for those watching our kids at Crescent this am. Still a couple of more opportunities to see our Tigers between 7 and 8 on the CW! Just went LIVE with some of the greatest kids ever and News Channel 7 this am! It’s GAMEDAY at Crescent High School! GO TIGERS! Crescent Lady Tiger Volleyball overcomes an early deficit to defeat Palmetto at home tonight by a score of 3-1. CONGRATS to our Lady Tigers! Crescent JV Football goes on the road and gets a big win over Ninety Six tonight! GREAT JOB, JV Tigers! 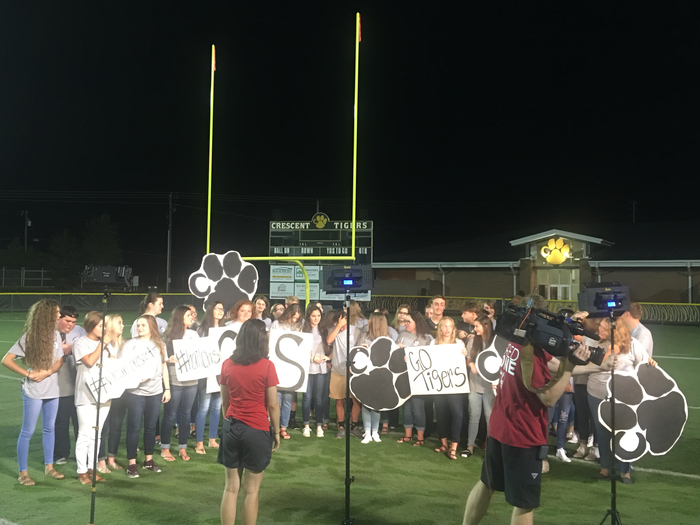 Tiger Nation....WSPA TV (Channel 7) will be doing their game day live segments from Crescent on Friday morning..... Tune in starting at 5 am!!! Congrats to Crescent JV Volleyball, 2-0 victory over Palmetto tonight! On a hot and humid day on Tuesday, our Cross Country teams competed in the Pre-Region Meet at Liberty High. Top finisher for the Girls was Morgan Dutton, with Jesse Sauve leading the way for our Boys Team. Both teams will compete again on Saturday AM in Spartanburg. 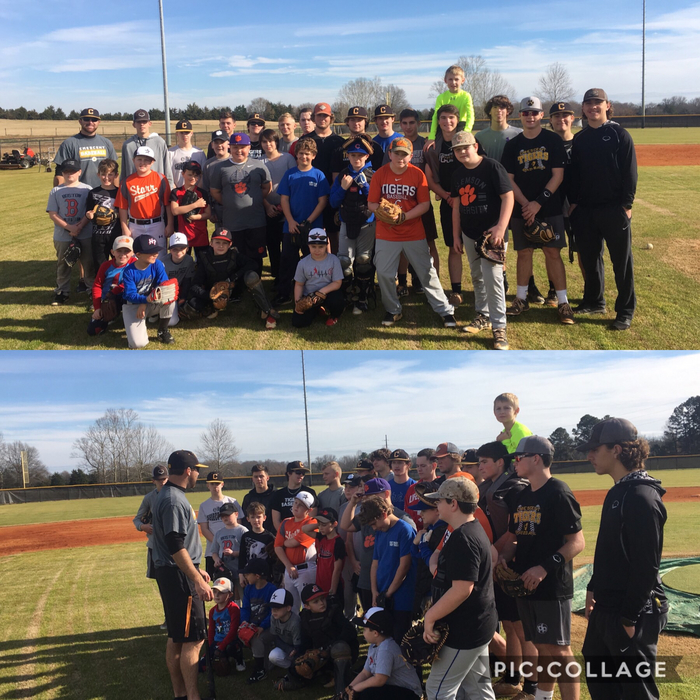 Keep working hard and getting better! 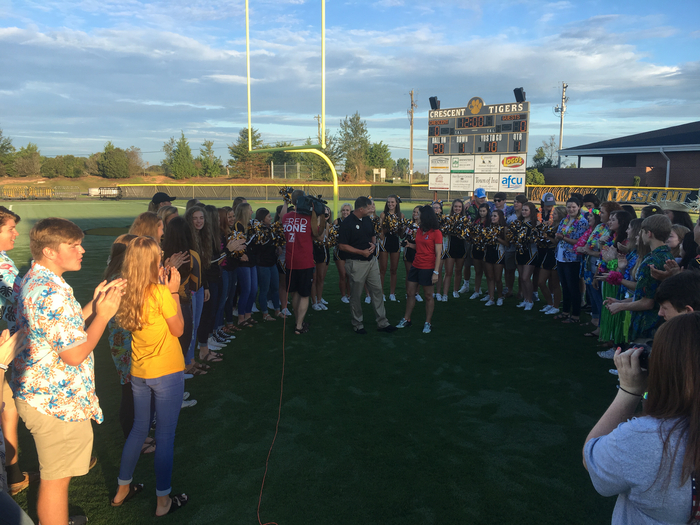 Watch News Channel 7 in the morning as they feature CHS starting around 5 am and end around 8am. 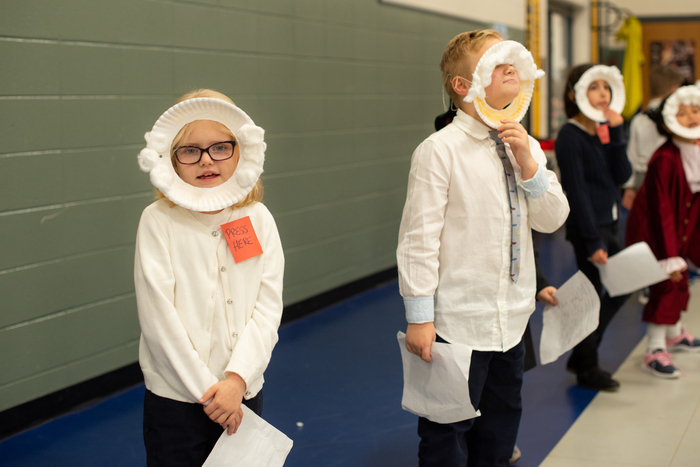 We are very excited to showcase all the great things happening at our school and Anderson 3! 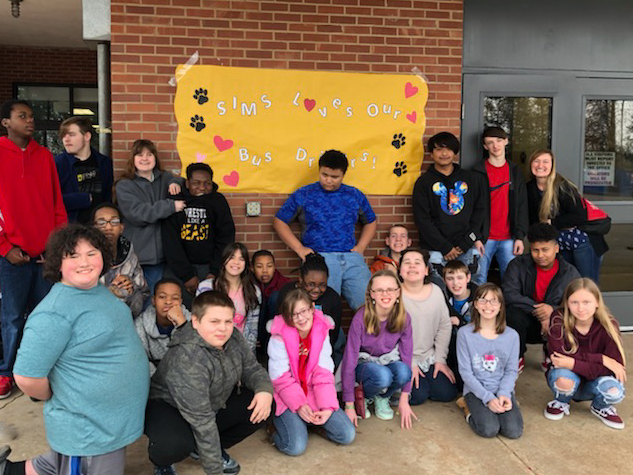 Attention SIMS family: Please share your photos of school, community activities, and events our SIMS students are involved in. Use the HJeSHARE app or visit www.hjeshare.com to submit photos that could be used in the yearbook. Our school code is: cubsyearbook. Good Luck to Crescent Lady Tiger Volleyball as they take on Palmetto AT HOME on Thursday! JV will start at 5:30, Varsity to follow. Come out and support Lady Tiger Volleyball! 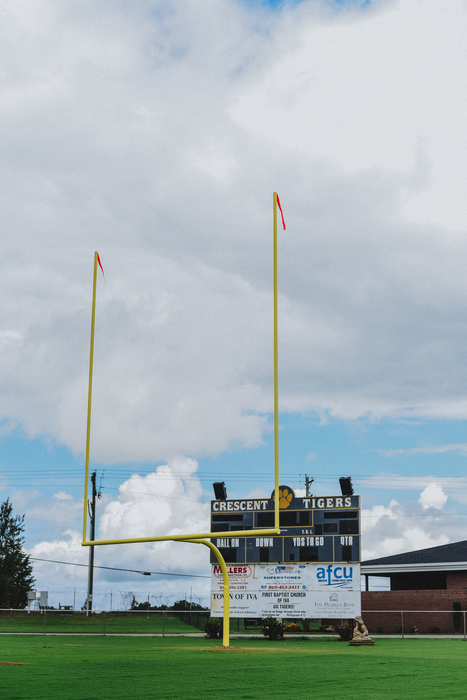 Crescent JV Football travels to Ninety Six tomorrow for a 7:00 pm kickoff....GET IT DONE, JV TIGERS! 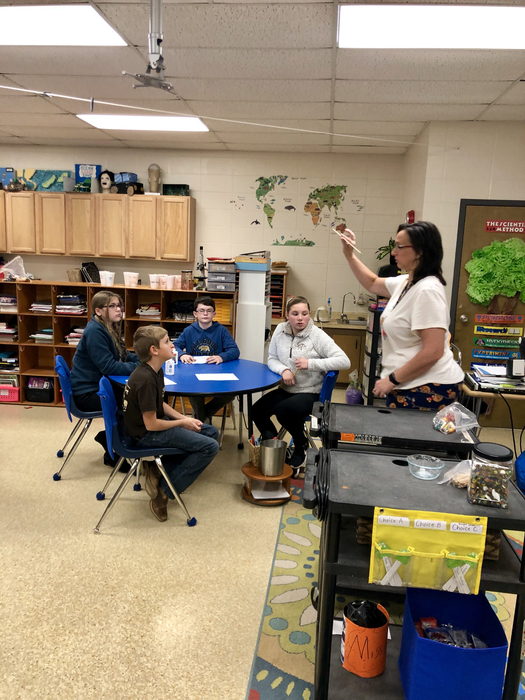 Mrs. Christenbury's class is using their STEAM skills to make sweet treats for the faculty and staff at Flat Rock Elementary. 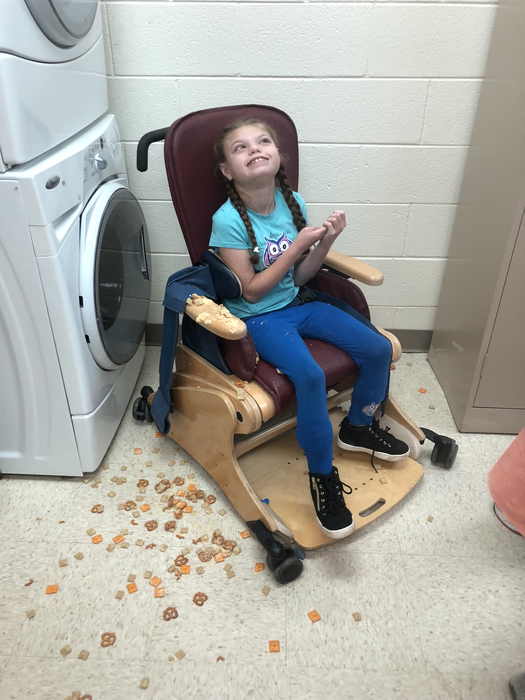 They plan to use their adaptive equipment to make many different things this school year. 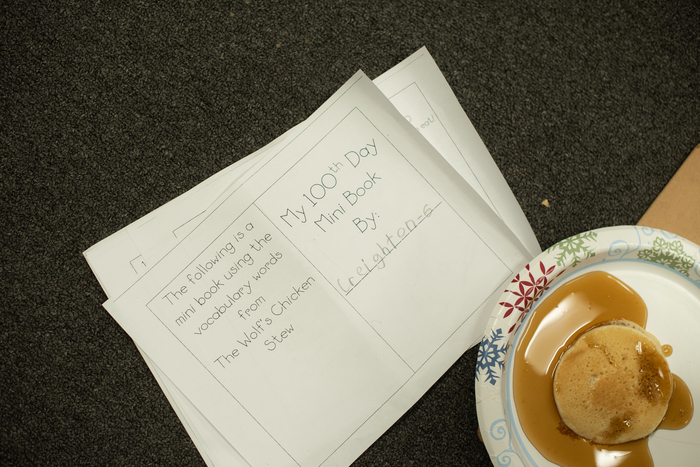 Thanks to Mrs. Lollis and Michelin for their donations that enable our class to practice these life skills. Great night for Crescent Lady Tiger Volleyball...Varsity and JV teams get victories over both Abbeville and Dixie! Next match will be Thursday AT HOME vs Palmetto. JV starts at 5:30, Varsity to follow. Come support our Lady Tigers! 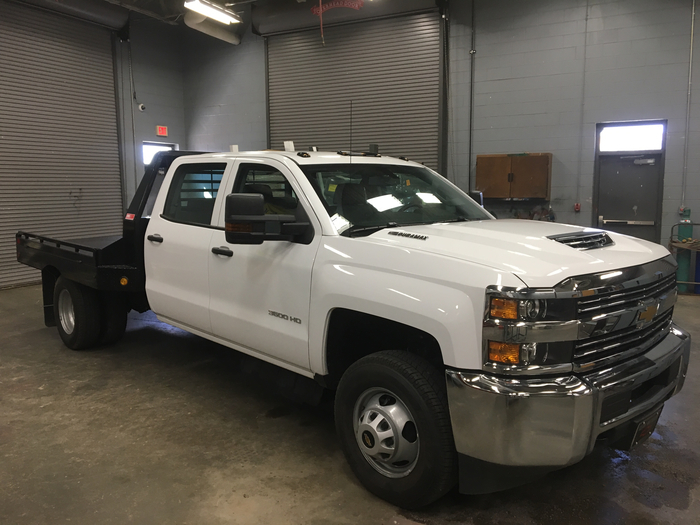 Check out the new ride for Crescent’s FFA. Thanks to the Anderson 3 Board for continuing to put our students first. 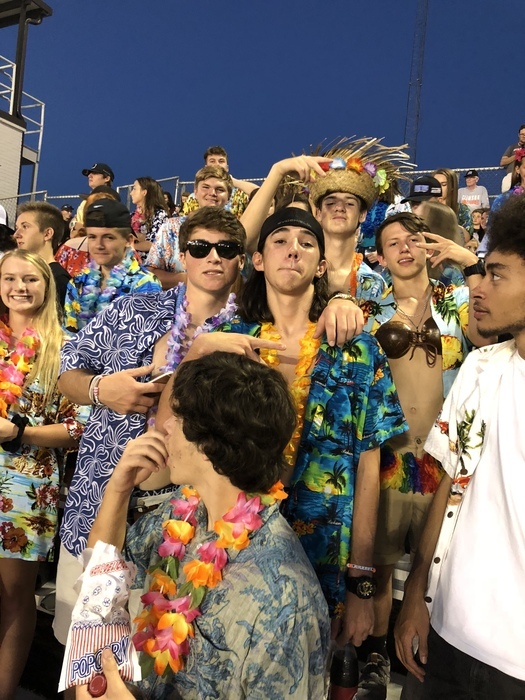 For those going to cheer on our JV Football Tigers at Ninety Six on Thursday, we have been informed that the start time for that game will be 7:00. Please share! GO TIGERS! Crescent/New Deal Athletic Hall of Fame.....nominations for the 2018-19 class are due THIS FRIDAY, August 31. 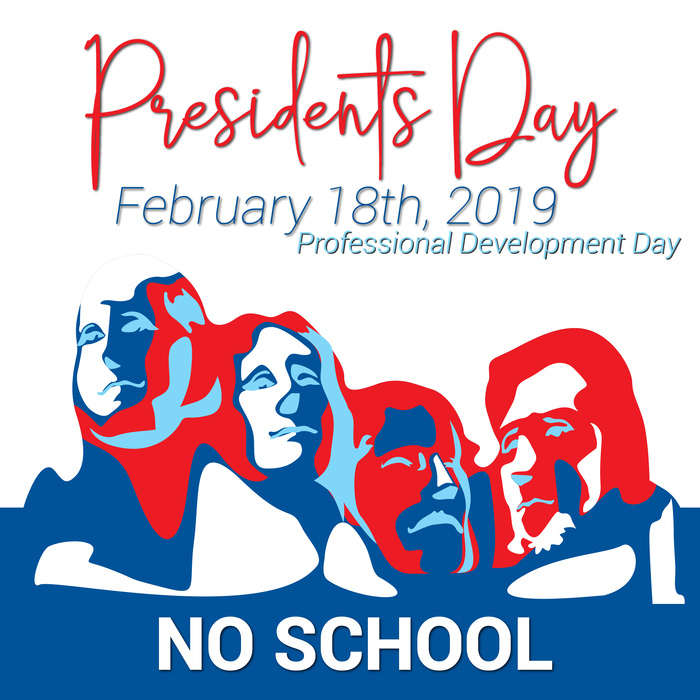 Nominate a former Crescent/New Deal great today! Nomination forms can be found under Athletics on the Crescent website at http://www.acsd3.org/o/crescent-high-school. 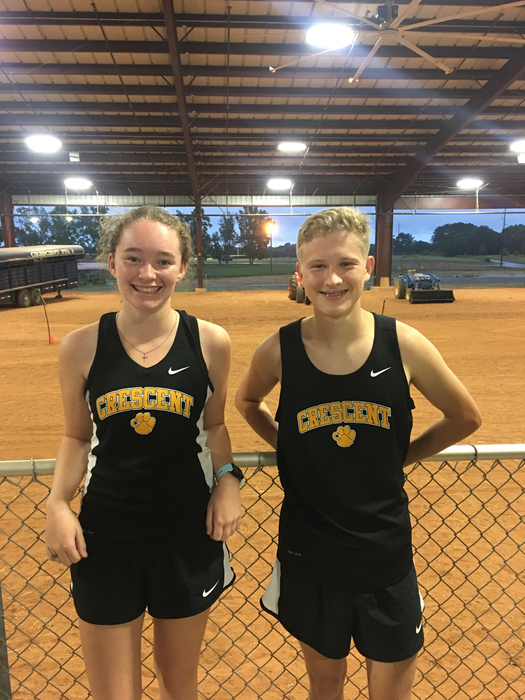 GOOD LUCK to Crescent Tiger Cross Country as they compete in the Pre-Region meet at Liberty on Tuesday. This group has worked extremely hard preparing for the season.....run GREAT tomorrow Girls and Boys teams! Crescent Lady Tiger Volleyball plays AT HOME tomorrow! Both JV and Varsity teams will be in action against Abbeville and Dixie. JV will play in the commons/old gym, Varsity in the new gym. Action for both teams starts at 5:00. Come out and support Lady Tiger Volleyball! Yesterday was another great day for the Crescent Show Team! 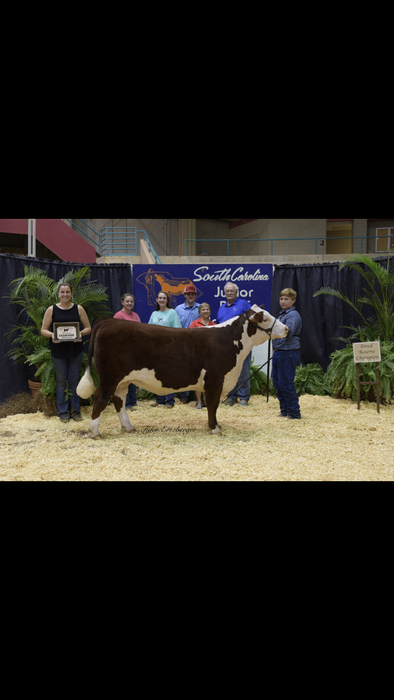 Michaela Herring won Champion Senior Showman and Reserve Grand Champion in the Calf Division of the Continental Show. 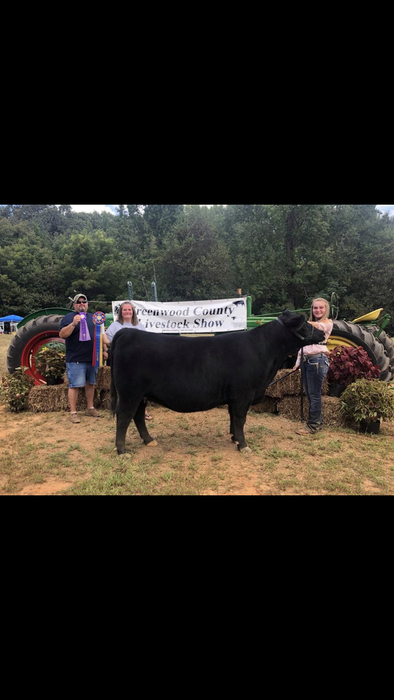 Emily Wilson won Reserve Grand Champion in the Continental Show, Nick Bowman won Reserve Grand Champion in the Calf Division of the British Show, and Hannah Wooten won Grand Champion in the Crossbred Show. Everyone’s hard work is paying off, and we are looking forward to our next show at York! Crescent Tiger Football! In front of a great crowd of Tiger fans, Crescent overcomes an early deficit for a big win tonight vs. Blacksburg. Home again next week vs. Ninety Six! Great job Tiger Nation! See you next week! 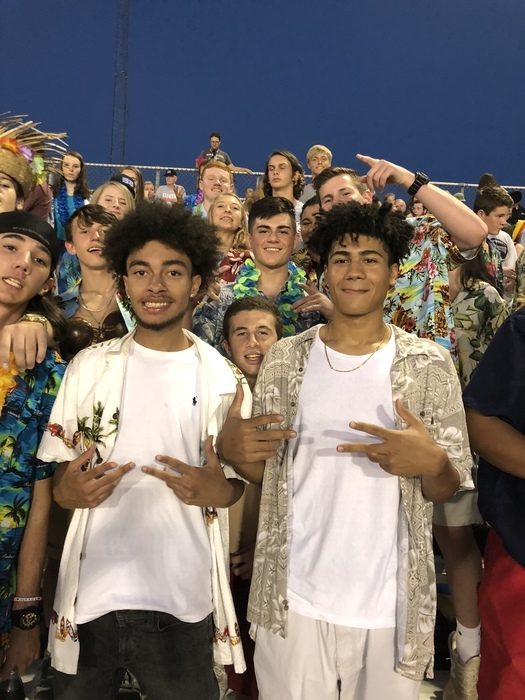 CHS student section showed up at the first home game of the season! Those interested in being a part of/learning more about the Crescent Elite Shooters team are invited to attend an informational session at the Crescent FFA Ag Arena on Sunday, August 26 at 2:00 pm. 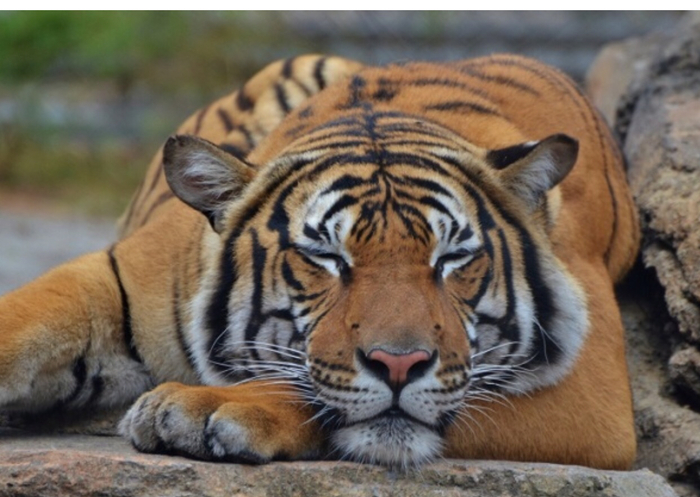 Have a great weekend, Tiger Nation! 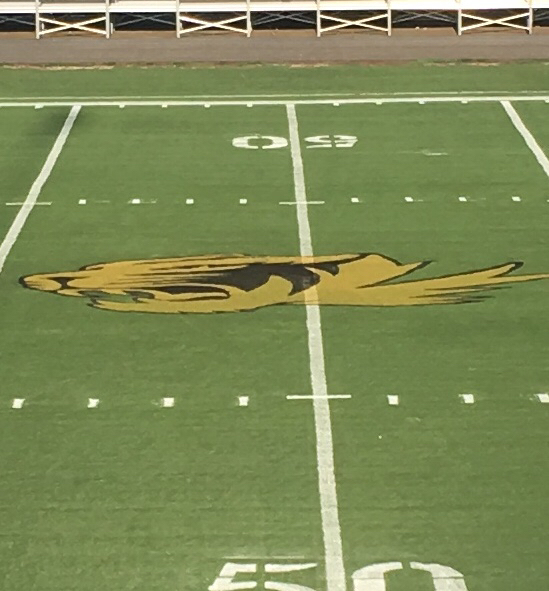 The TIGER at midfield looks ready for tonight....ARE YOU?!?! Be there tonight to cheer on Crescent Tiger Football! Kickoff is at 7:30 vs. Blacksburg. GO TIGERS! Attention CHS juniors. The PSAT will be administered on October 24th. The cost of taking the PSAT is $16.00. Juniors interested in taking the PSAT should see Mrs. Broadwell by September 10th. Rise and shine Tiger Nation...... it’s HOME FOOTBALL GAMEDAY! Tigers take on Blacksburg tonight at 7:30 in the first home game of the season. SEE YOU THERE! Crescent JV Football goes on the road and gets the win tonight at Blacksburg by a score of 42-36! CONGRATS JV Tigers! CONGRATS to Crescent Lady Tiger Volleyball! Opens the season with wins on the road vs. Westside and Wren. Proud of our Lady Tigers! This Friday is a BLACKOUT! Wear all black to show your school spirit for the pep rally and game! Tiger Fans.....ready to WEAR your Tiger Pride? 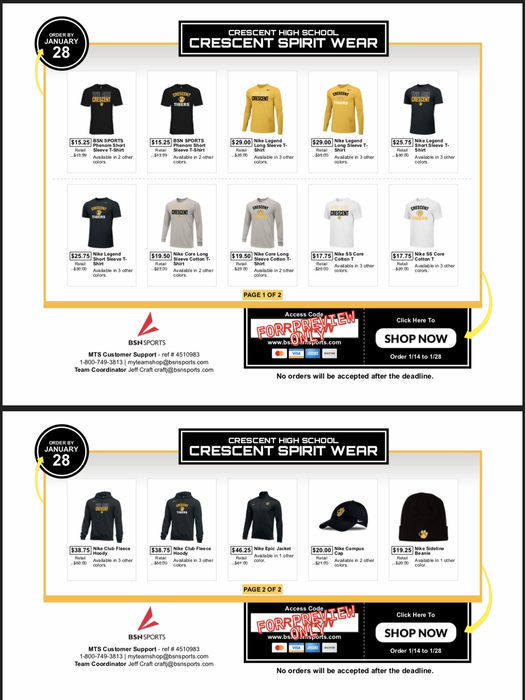 Now is your chance to go online and order your Tiger apparel for the upcoming school sports year! 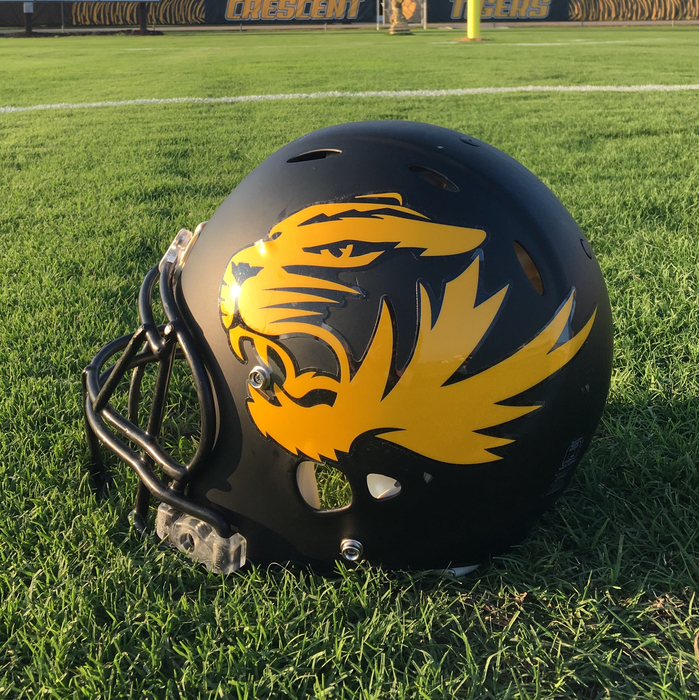 Go to the following link and check out some awesome Crescent Tiger Gear by Nike! 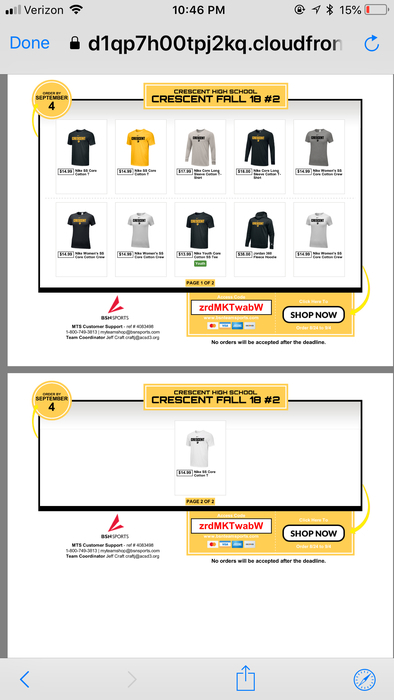 http://www.bsnteamsports.com/login/CRESF18 This team shop will open and available until September 4, so place your orders today. Youth sizes are available in some items as well. Even better, a portion of sales on this page will benefit the Crescent Athletic Program. Order today! Crescent Tiger JV Football heads on the road to Blacksburg for their first game of the season on Thursday! Kickoff is at 7:00 pm. 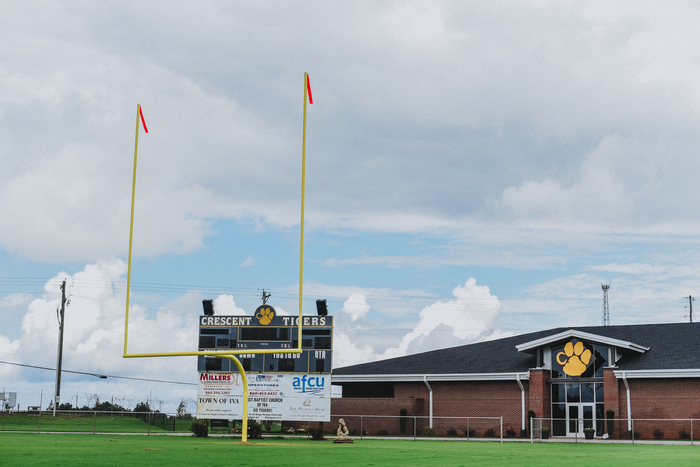 Tiger Fans....take note: the game will be played at Gaffney Middle School, 805 Fredrick Street, Gaffney, SC. 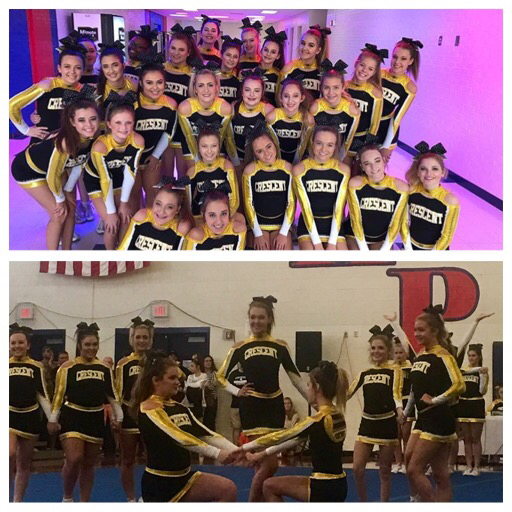 Good Luck to our JV Tigers and JV Cheer Team! 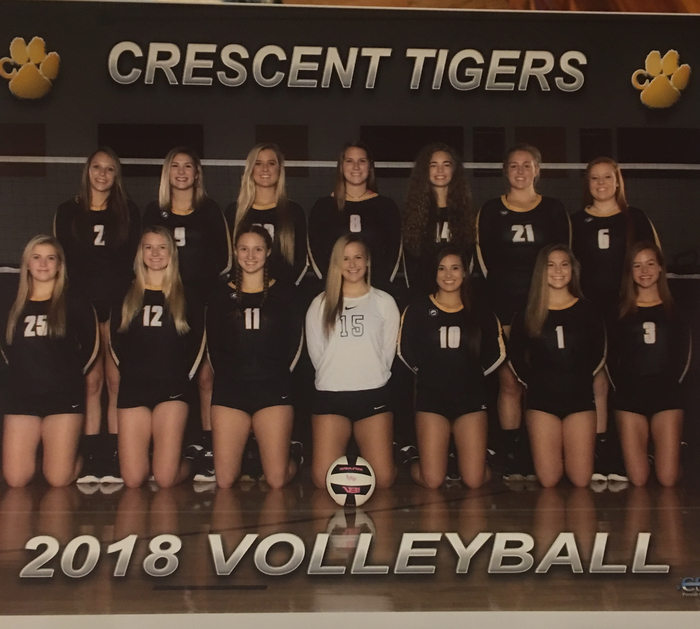 Good Luck to Crescent Lady Tiger Volleyball as they officially open the 2018 regular season on the road tomorrow at Westside High School! Lady Tigers will take on both Westside and Wren....action starts at 5:30. COME OUT AND SUPPORT OUR LADY TIGERS! Attention Tiger Fans: This Friday the Tigers will play at home at 7:30 pm. The student section will have a blackout. 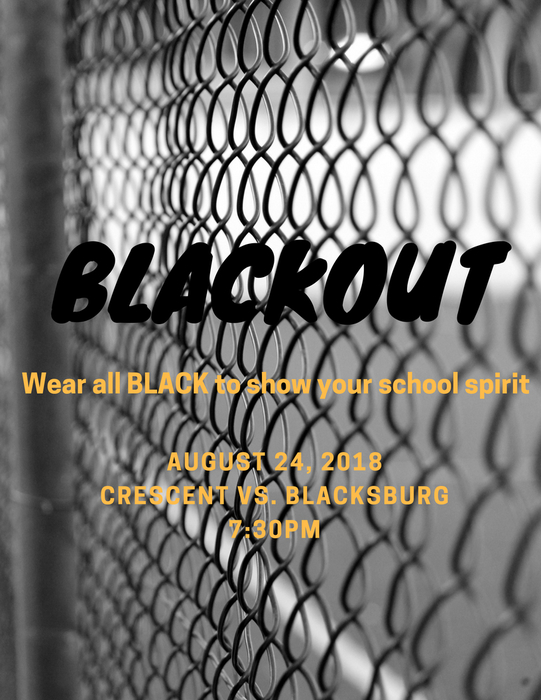 So make sure to show your school spirit by wearing all black to school and the game. 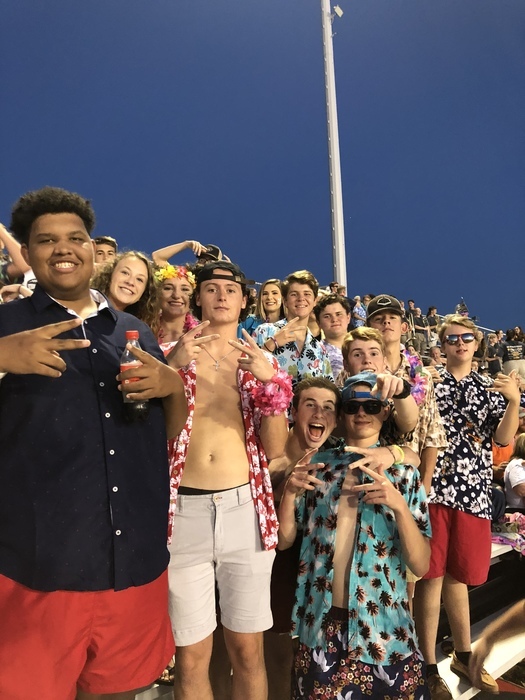 For those Tiger fans going to the JV Football game at Blacksburg on Thursday, kickoff will be at 7:00 pm at Gaffney Middle School. Address is 805 Fredrick Street, Gaffney, SC. Please share with others who may be going. GO TIGERS! 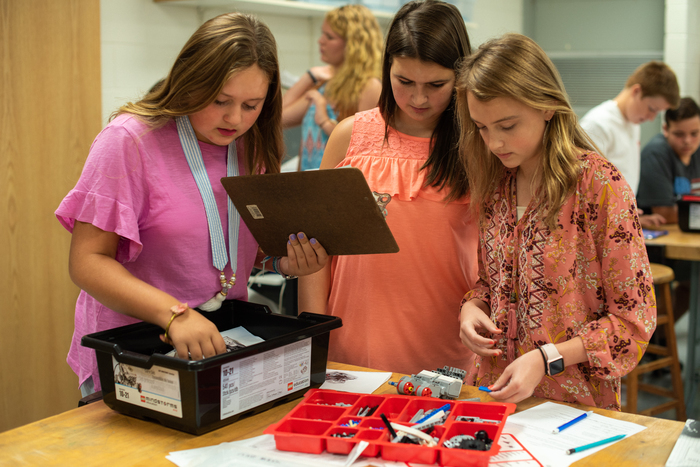 Starr-Iva Robotics students brainstorm ideas for designing and building robots on the first day of school! 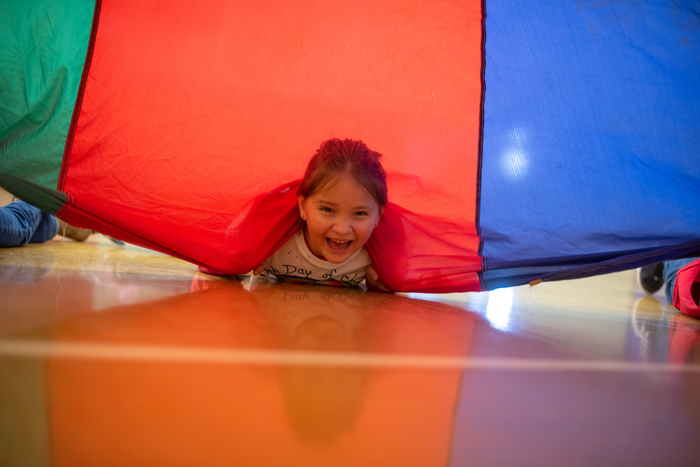 The games have begun at Starr Elementary! 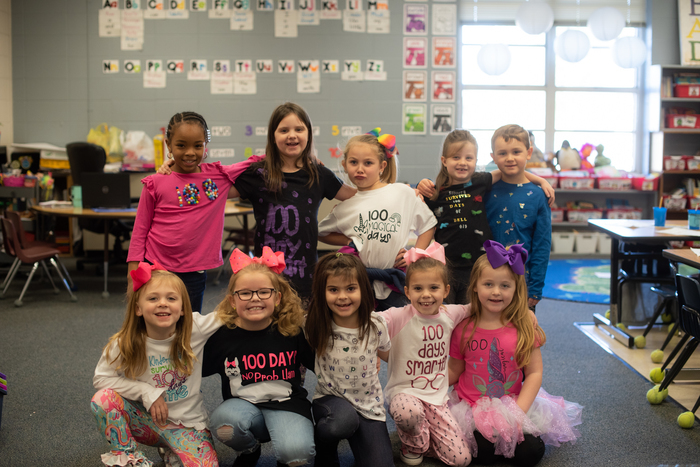 Day 1 out of 180 was amazing at Iva Elementary! All Aboard! 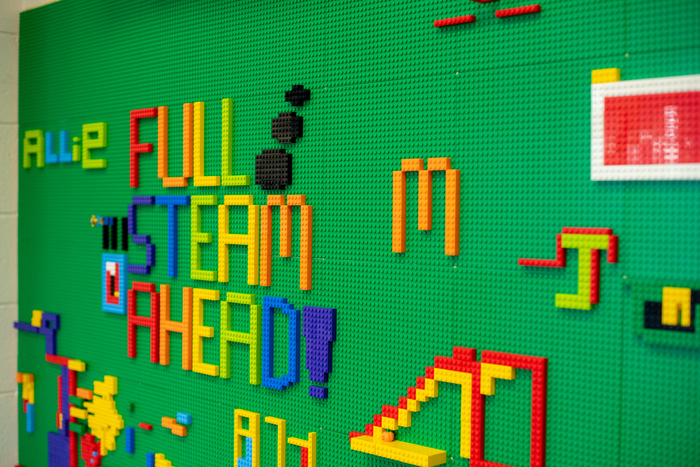 Flat Rock is Full Steam Ahead! 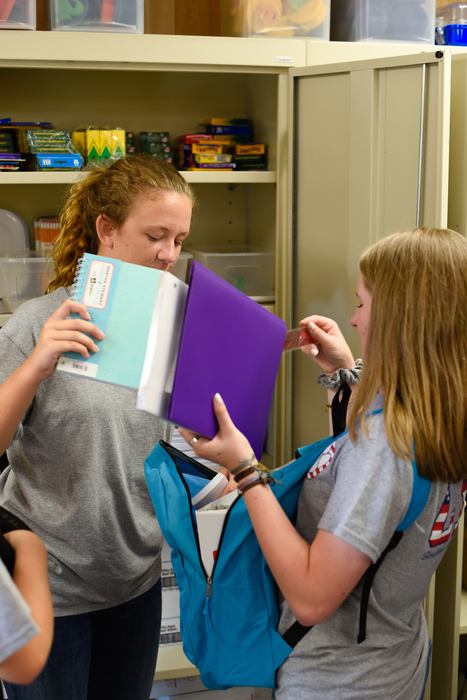 CHS Student Government students continue the annual tradition of welcoming students into the building on the first day of school. 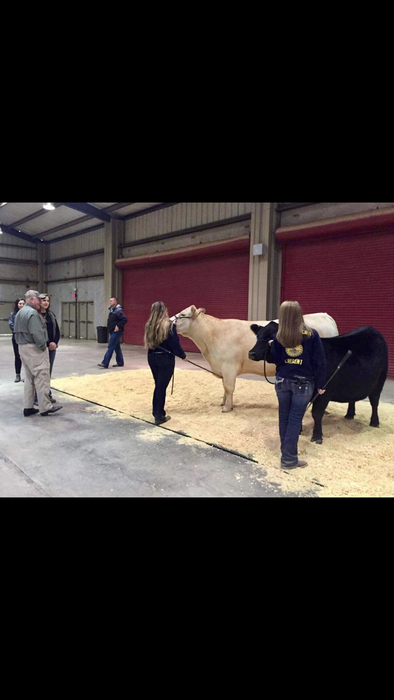 The Crescent Show Team had a great day at the Crescent FFA Livestock Show! 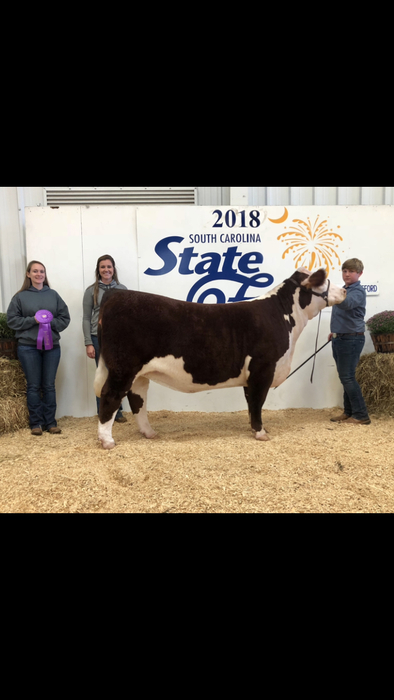 Emily Wilson was Champion 12-15 year old showman, Michaela Herring won Reserve Champion Simmental, Brent Erwin won Grand Champion Hereford, Nick Bowman won Reserve Champion Angus and Fifth Overall Female, and Hannah Wooten won Grand Champion Crossbred and Reserve Supreme Champion Overall Female! 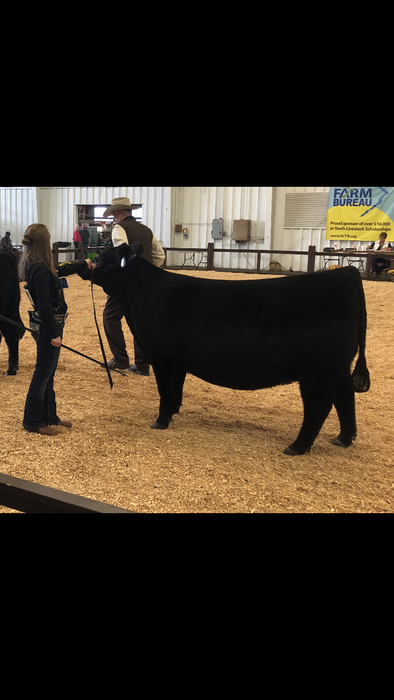 Super proud of all the hard work that these showmen put in with their calves. Their success is very deserving! 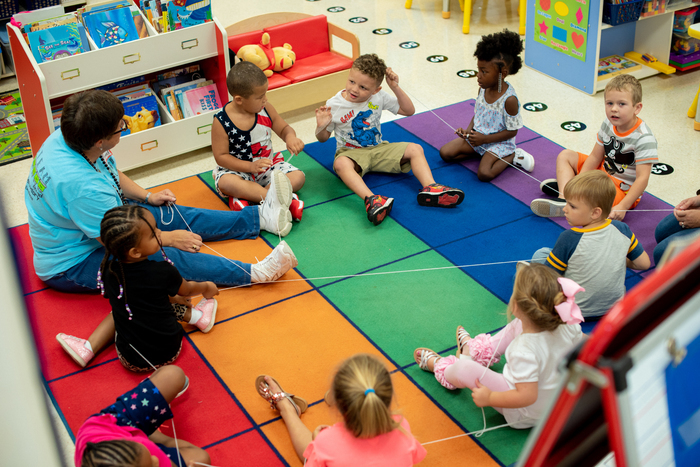 Tomorrow is the big day, our first day of school! Make sure you are at your bus stop on time. 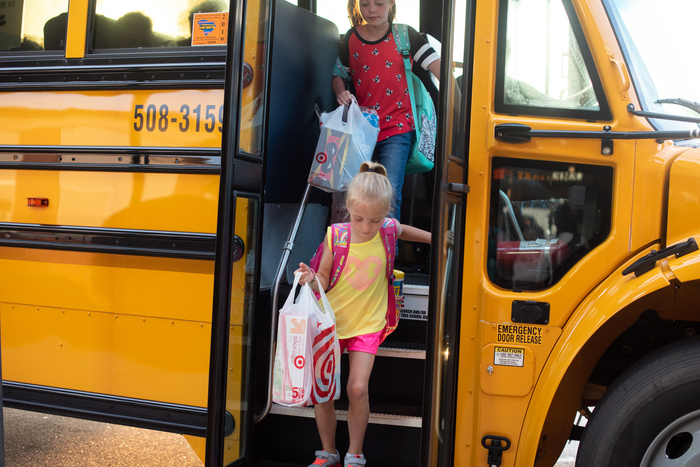 Sometimes buses run a few minutes behind on the first day of school as well. 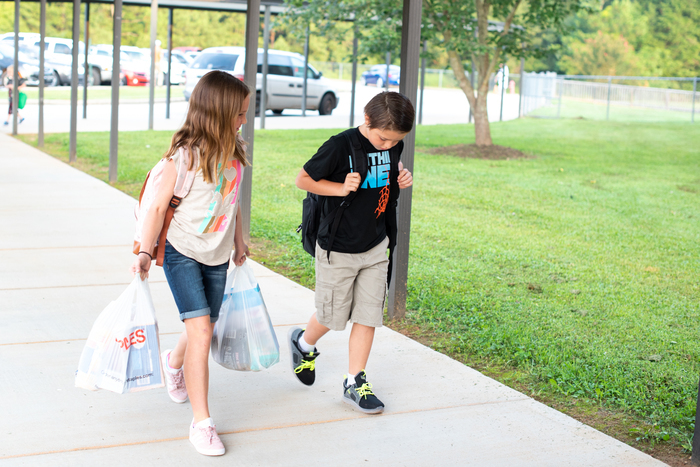 If you are dropping your child off, please arrive to your school on time. 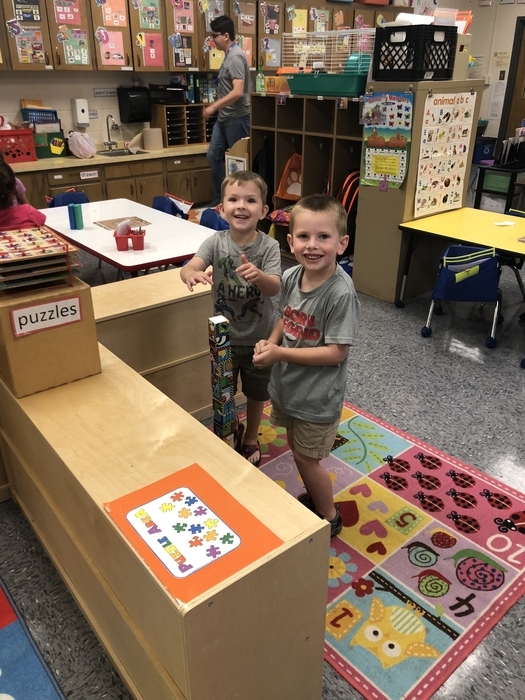 We will see you all in the morning! 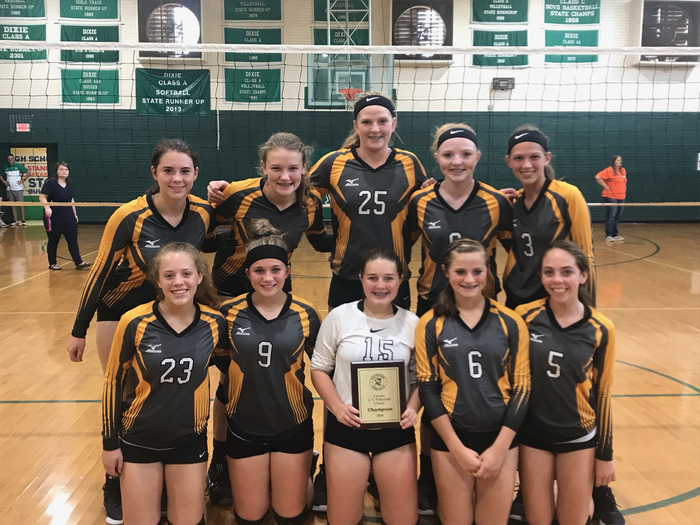 Congrats to Crescent Lady Tiger Volleyball.....2018 Upstate Invitational Gold Bracket Champs! Great sportsmanship and effort all day by each team, coaches, and fans! CONGRATS Lady Tigers! Crescent Lady Tiger Volleyball defeats Emerald in the first round of bracket play at the Upstate Volleyball Invitational at Crescent! Will play in the championship at 5:00 pm.....still time to get here! Crescent Lady Tiger Volleyball wins their first two matches over Palmetto and Pendleton this am @ Crescent in the Upstate Volleyball Classic. Will play Walhalla at 1, and pool play will start after that. Still plenty of time to get out and cheer on our Lady Tigers today! 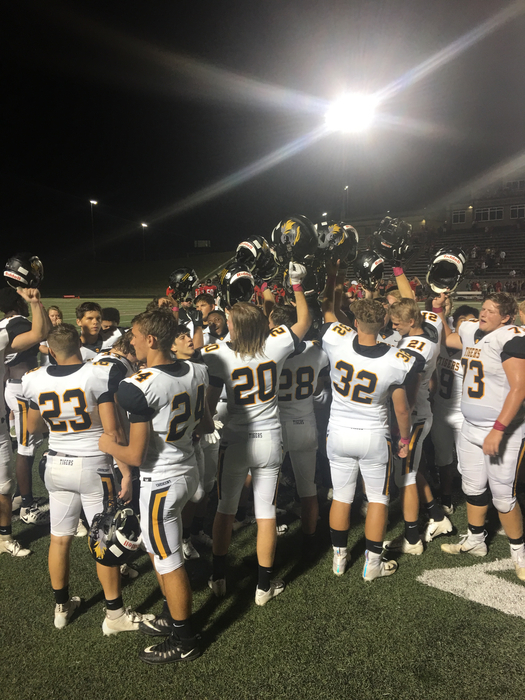 Crescent Tiger Football gets the season-opening 44-0 win over McCormick tonight! That’s also career win #1 for Tiger Head Coach Sheldon Evans. Congrats! GREAT job tonight to Tiger Football, Cheer, Band, each Coach, and the many Tiger Fans who made the trip!!! At the end of the first half, Crescent Tiger Football leads McCormick by a score of 20-0! 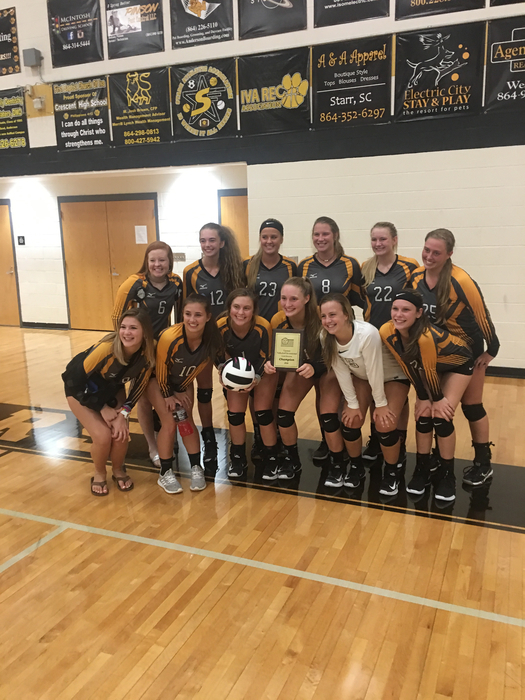 Crescent Lady Tiger Volleyball hosts the Upstate Volleyball Classic on Saturday. Action starts at 9:00 am! Come out and support our Lady Tiger Volleyball team all day on Saturday! Crescent Football opens the season TONIGHT on the road at McCormick! Kickoff is at 7:30. 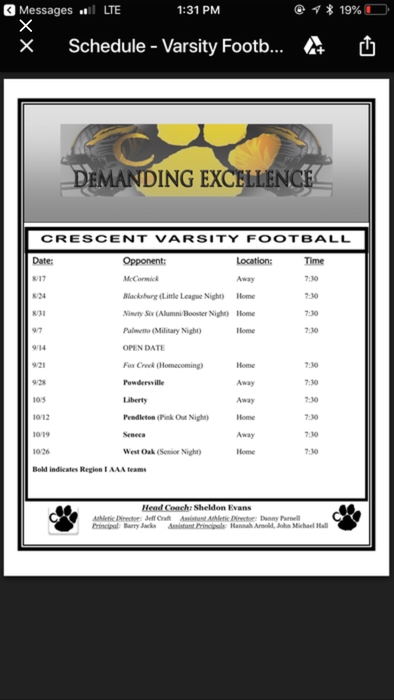 Come out and support the 2018 version of Crescent Tiger Football.....See you there, Tiger Nation! 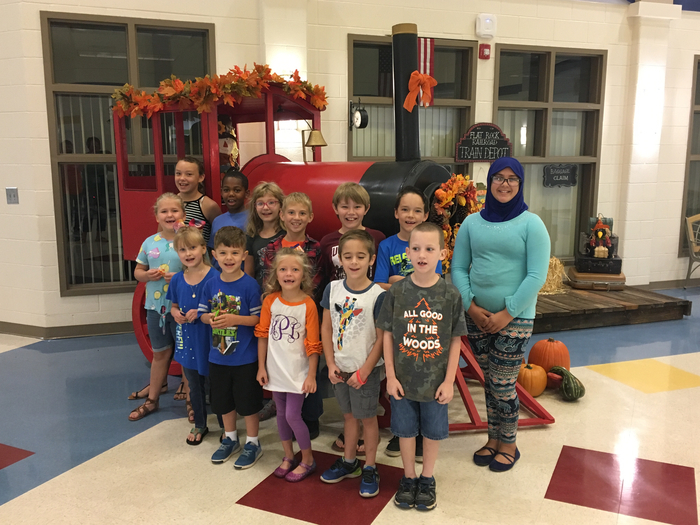 Celebration time for Cross Country team members who ran 100 miles this summer and qualified for an overnight trip to Connie Maxwell’s OASIS farm! 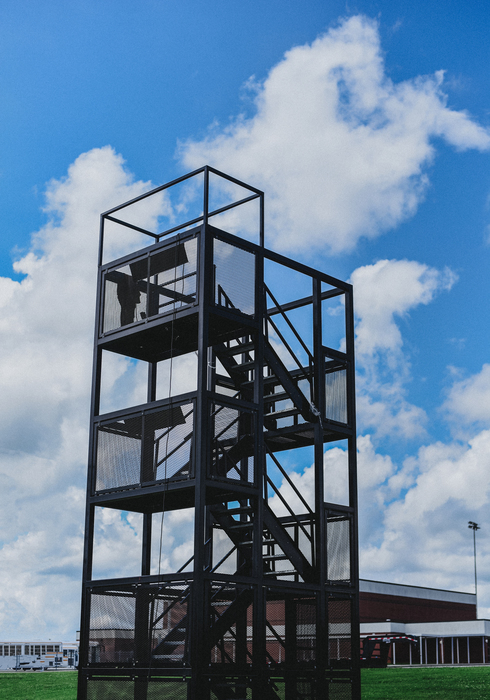 During the trip they did a ropes course, engaged in team building, and had an opportunity to “preview run” the course they will be competing on September 22. CONGRATS! 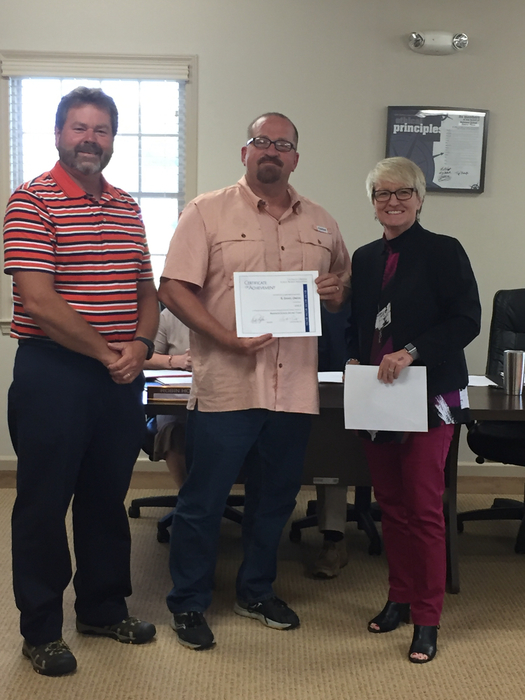 At the August meeting of the A3 Board of Trustees, Danny Owens was recognized for his Level 2 achievement in the boardmanship institute. 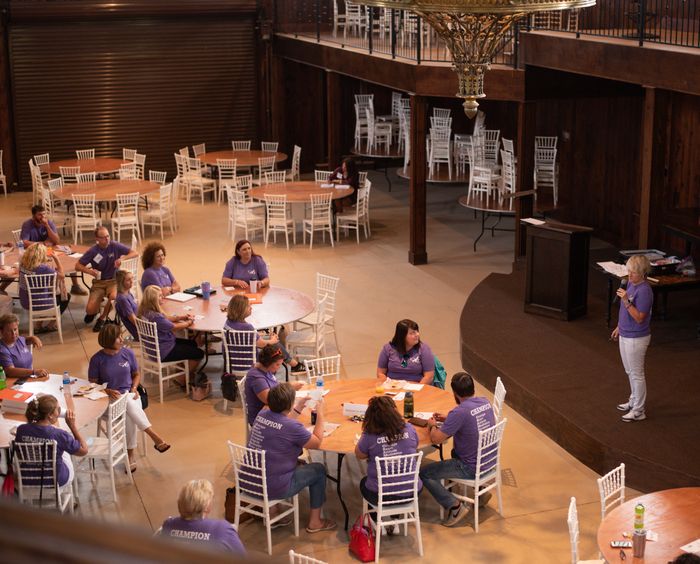 The institute is sponsored by the S.C. School Boards Association and offers a year-round training curriculum focused on leadership skills for board members on state and national educational issues. Board members are recognized for reaching each of the six levels. Congratulations, Danny! 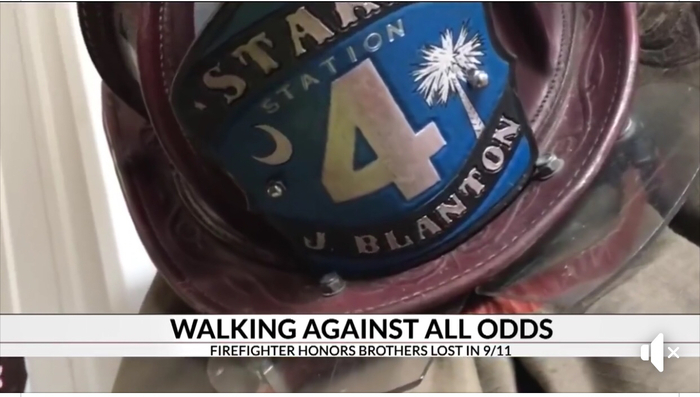 Thank you for your service to Anderson 3. 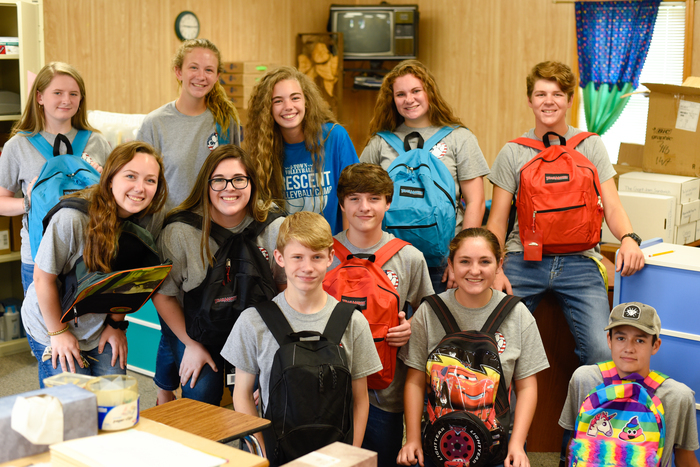 Yesterday, SGA members from Crescent High School assisted in packing backpacks with school supplies for needy children in our district. 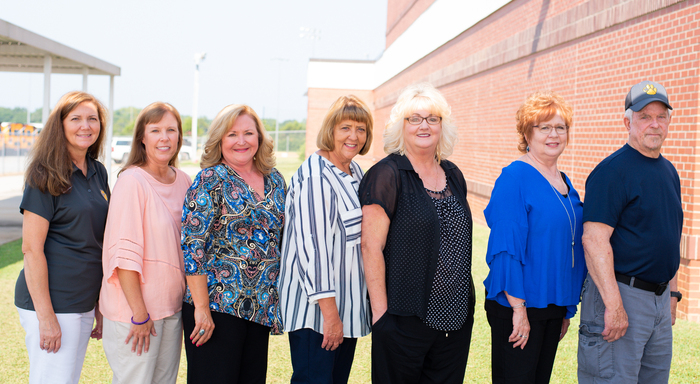 Our faculty and staff returned today for the 2018-2019 school year. 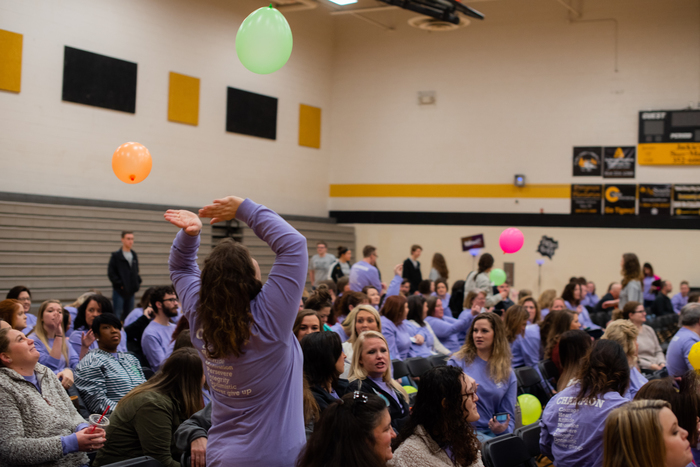 We could not be more excited about the upcoming year! Crescent Lady Tiger Volleyball will be in preseason/scrimmage action on the road at BHP on Monday. JV starts at 5:30, Varsity to follow. Good luck to Tiger Volleyball as they continue to prepare for the 2018 season! 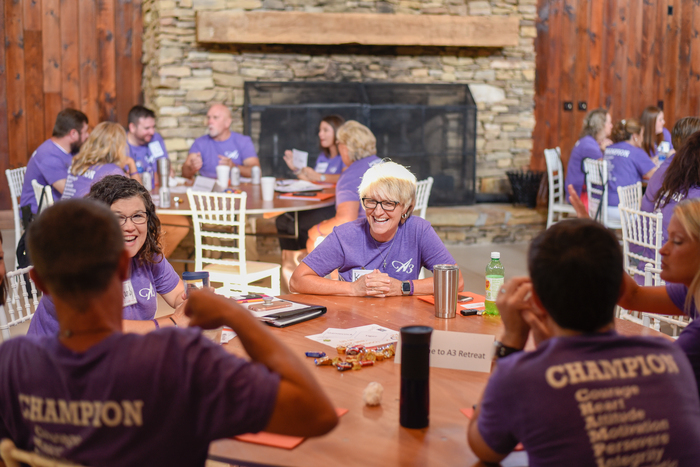 We are excited to welcome Anderson 3 teachers back tomorrow! 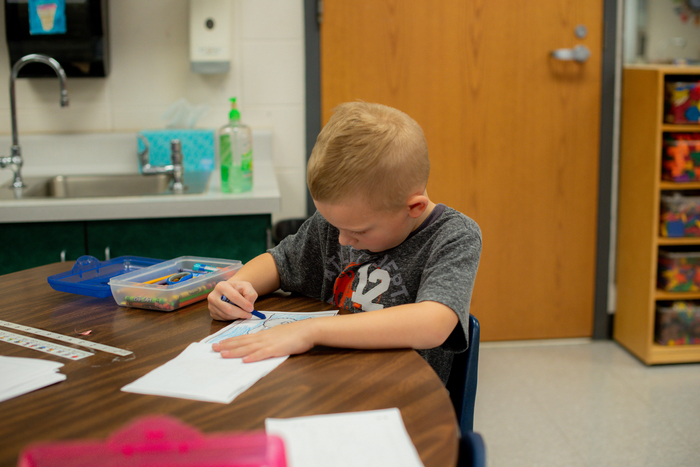 Can't wait to get started preparing for the students returning on August 20th. 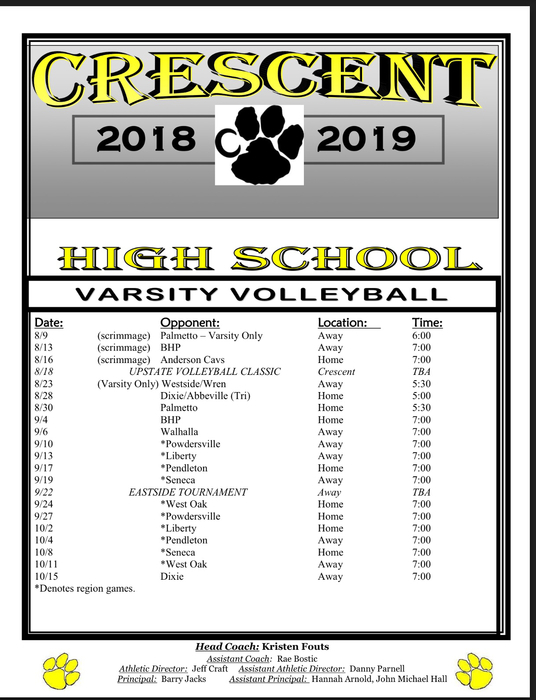 Crescent Lady Tiger Volleyball hosts the Upstate Volleyball Classic at Crescent High ONE WEEK from today. Come spend the day cheering on our Tigers! 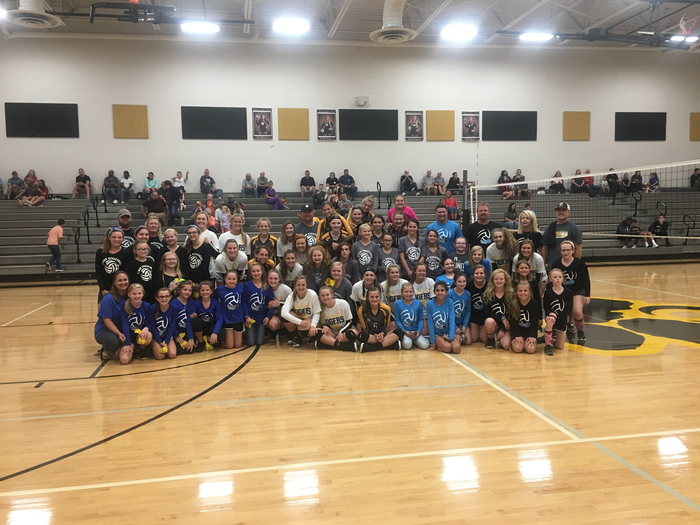 Two gyms = LOTS OF VOLLEYBALL! See you there, Tiger Nation! 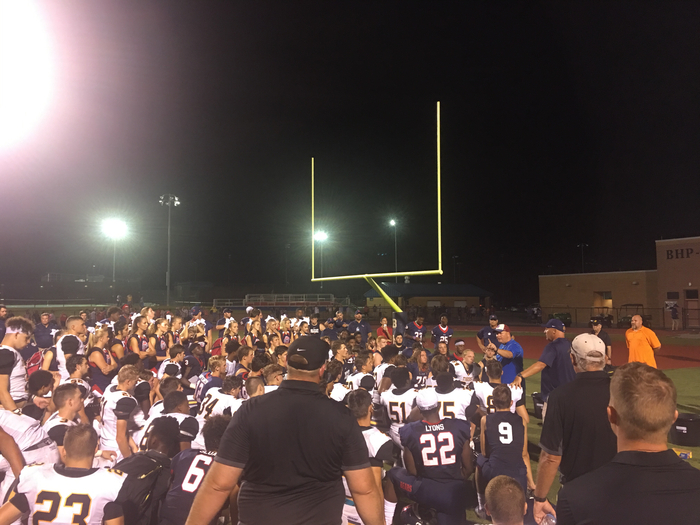 Wrapping things up the right way at the end of the 2018 FCA Anderson County Jamboree as Tigers and Bears gather together.... THANKS to FCA and BHP for hosting tonight! EXACTLY one week from right now Crescent Tiger Football opens the regular season on the road at McCormick. Kickoff on August 17 at 7:30. BE THERE, Tiger Nation! From the CHS Anglers..... The first CHS Angler meeting will be on Saturday, August 18 at 1:00pm at the Iva Fire Department. This will be an informational meeting and anyone interested in signing up can do so at this meeting. 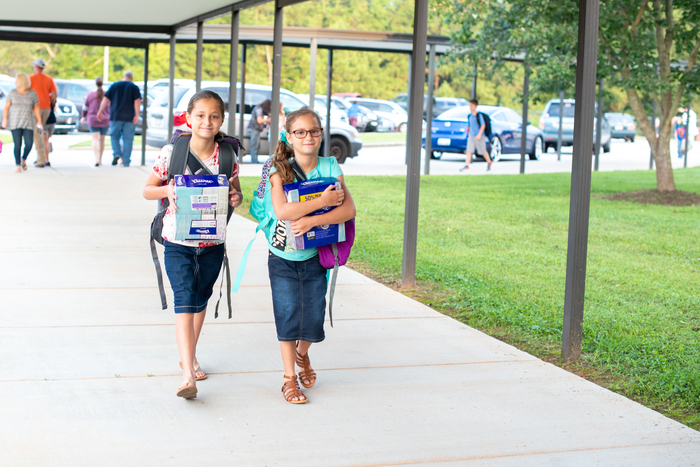 Middle School students can sign up Tuesday, August 14 during school registration. 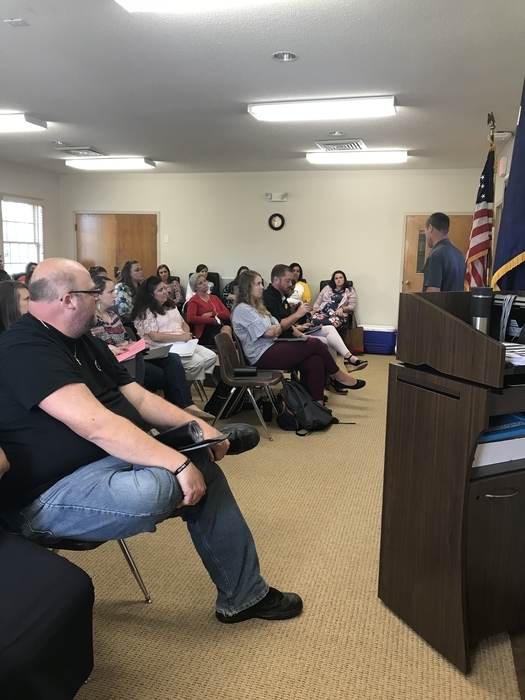 We are excited to welcome our new employees to Anderson District 3. During our orientation today, Dr. Nixon conducted ALICE training. 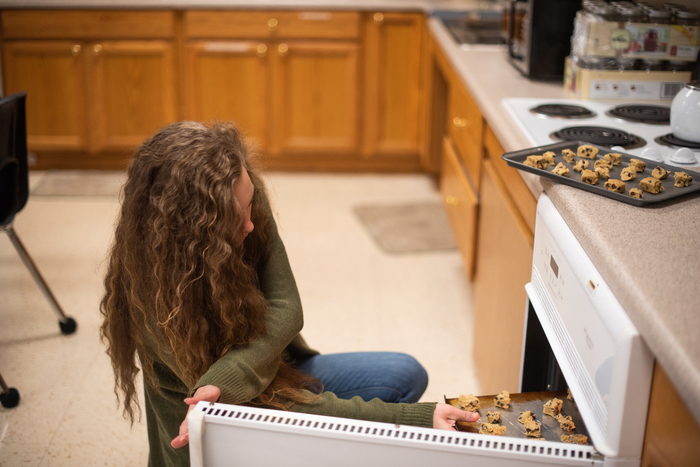 Safety and security of students is top priority in Anderson 3. 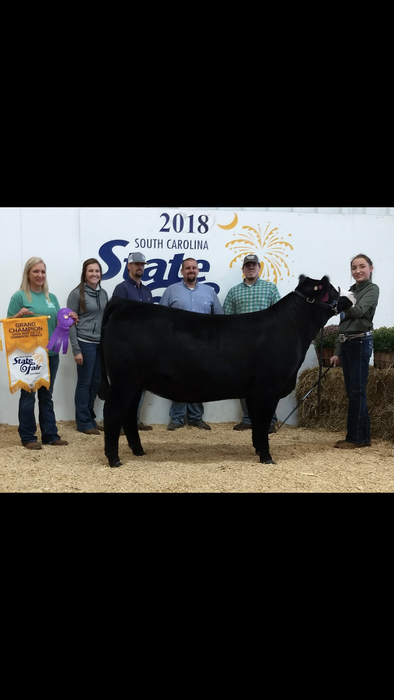 To say that the 2018 Crescent FFA Cattle Show Team had a great weekend at the SC Junior Beef Round-Up would be an understatement! 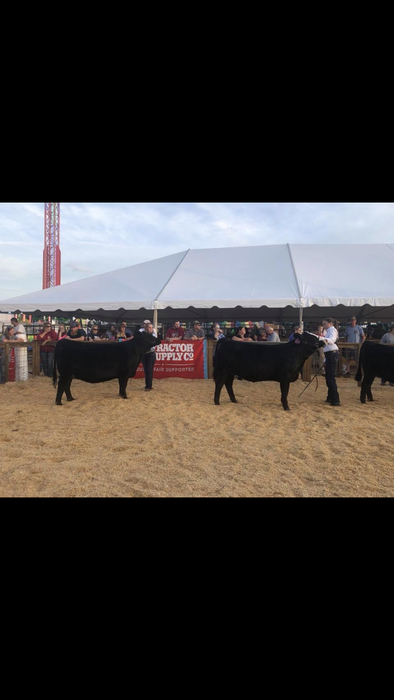 Several students placed in the top of their showmanship classes, making it to the final drive. 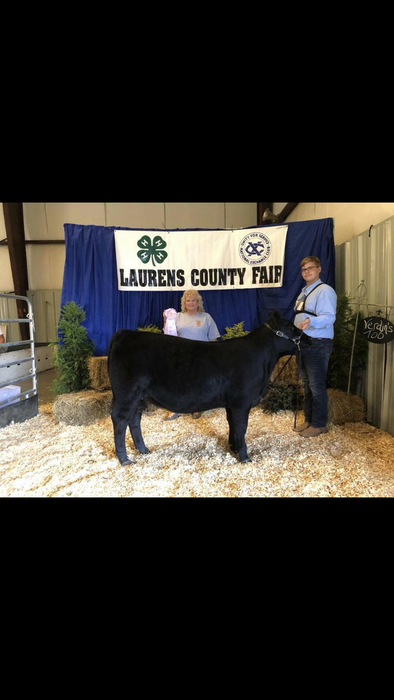 Nick Bowman won Reserve Champion in the Calf Division of the Angus show, Emily Wilson won her class in the Simmental show where Michaela Herring placed second behind her, Brent Erwin won Reserve Champion Hereford, and Hannah Wooten won Grand Champion Crossbred where she then went on to win Reserve Overall Supreme Champion Heifer out of over 200 head. Brent Erwin also won Reserve Champion Junior Sales Talk and was the 4th highest scoring junior on the herdsman’s quiz. Crescent Lady Tiger Volleyball heads to Palmetto for the first scrimmage of the new season tomorrow @ 6. GOOD LUCK to our Lady Tigers as they prepare for another successful season! The future is here. 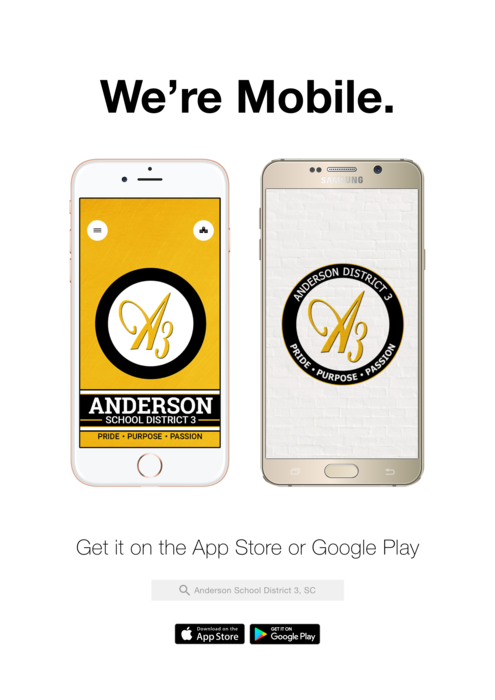 Download our new A3 App to unlock all of the district's content. 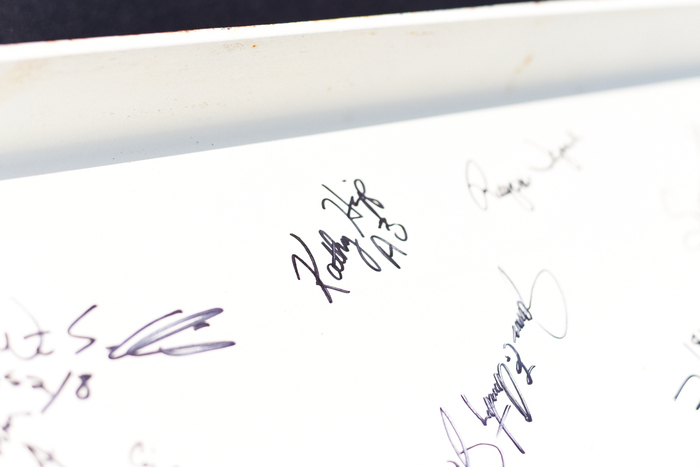 Complete with live information, important documents and much more! 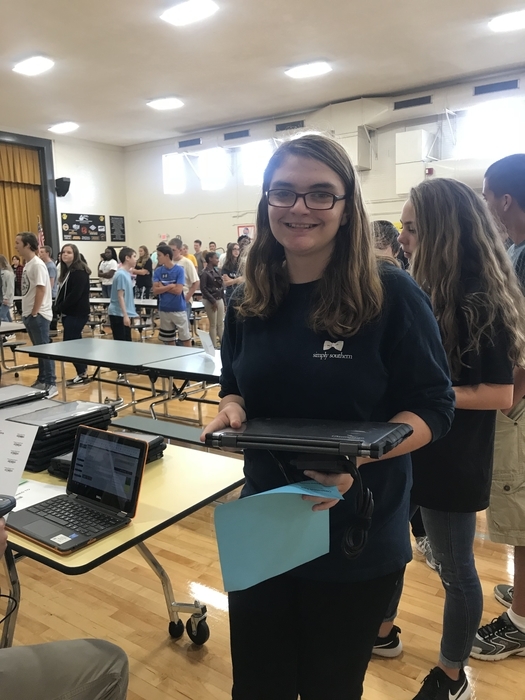 CHS is excited to roll out Chromebooks with the opening of the school year. 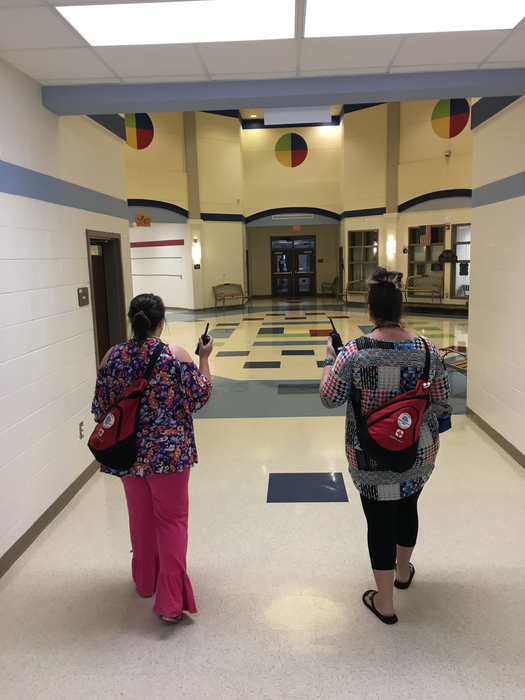 Each student will have a device to use in class as well as take home. There will be a $30 technology fee required as part of the registration fees. This fee will be collected during registration. The 2018-19 Tigers/Cubs Sports season is just around the corner...get your all-sports pass today.... CRESCENT/SIMS SPORTS FANS!! 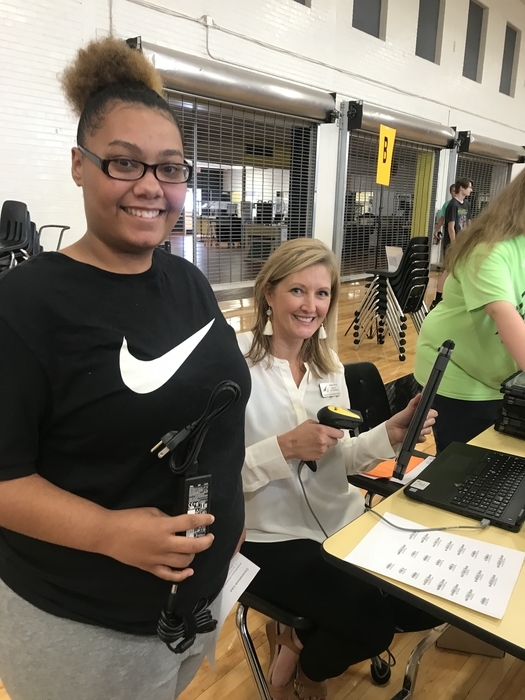 2018-19 All Sports Passes Available! This year fans can purchase an all-sports pass to watch our Tigers & Cubs play all year! 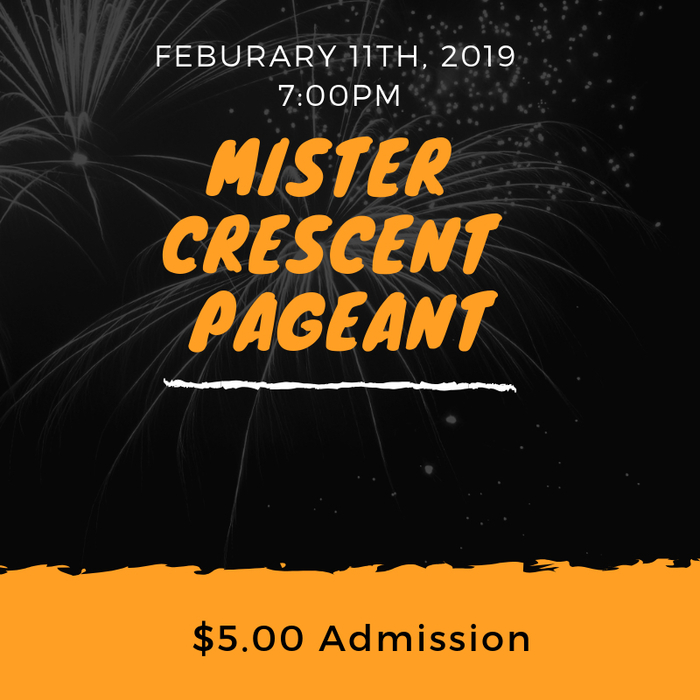 Forms/more info available at the link below or in the Main Office at Crescent High. https://drive.google.com/open?id=1HeY7poyjR2PAY8f4bcph-5AtEge0KPj9 Get your all-sports pass today! 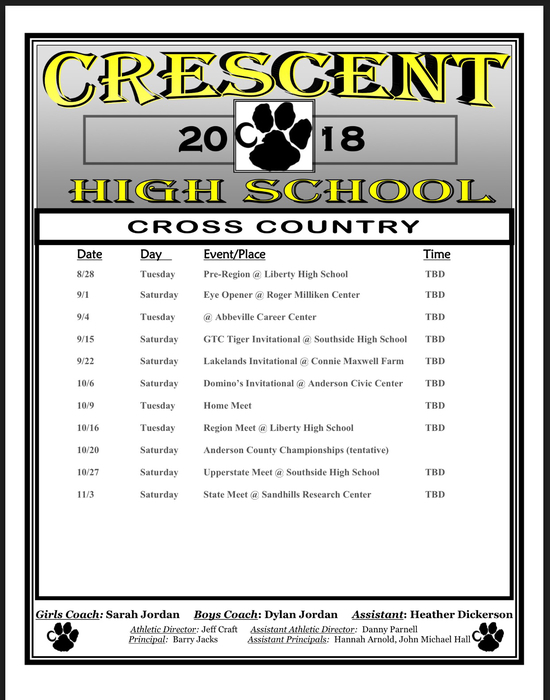 Crescent Cross Country, 2018 Schedule...GO TIGERS! Crescent High School Registration Fees are as follows: 25-Registration, 5-Science/PE/Art, 10 per semester-Parking, 8-Locker, 3-Foreign Language, 30-Chromebook. See calendar for registration dates. Summer Cross Country practices are from 7:45-9 am Monday-Thursday until Aug. 10th. After Aug. 13th, practices are at CHS from 4 until 5:30. Middle schoolers will ride the transport bus to CHS. Students must be 7th grade and up and have all paperwork in order to practice. Crescent Lady Tiger Volleyball is ONE MONTH AWAY! Tigers will begin the season at home as they host the Upstate Volleyball Classic on August 18. Come spend that day cheering on our Lady Tigers! Regular season begins August 23 at Westside. It’s almost time! GO TIGERS! 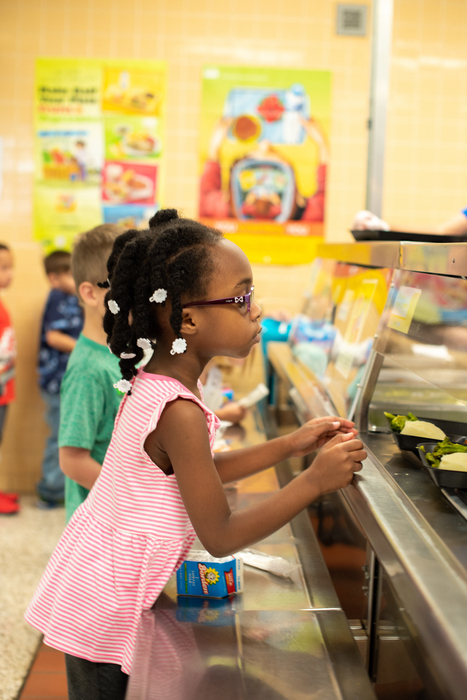 You can now apply online for Free/Reduced meals at www.myschoolapps.com. 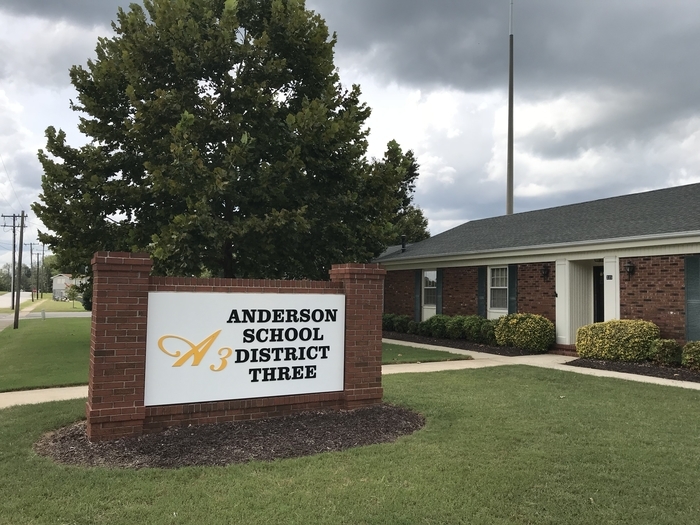 Anderson Three did not mail applications. If you need a paper copy, contact Robin Horne at 348-6196. 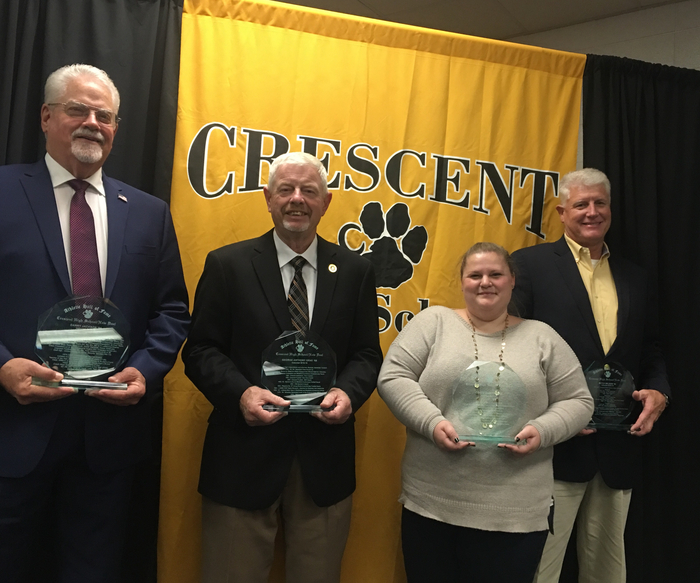 It’s time to nominate a former Crescent or New Deal Sports great for this year’s 2018-19 Crescent/New Deal Athletic Hall of Fame Class! Nomination forms are due August 31 and can be found on the Crescent website under ATHLETICS:. Nominate someone today! CRESCENT/SIMS SPORTS FANS!! 2018-19 All Sports Passes Available! This year fans can purchase an all-sports pass to watch our Tigers & Cubs play all year! Forms available here or in the Main Office at Crescent High. 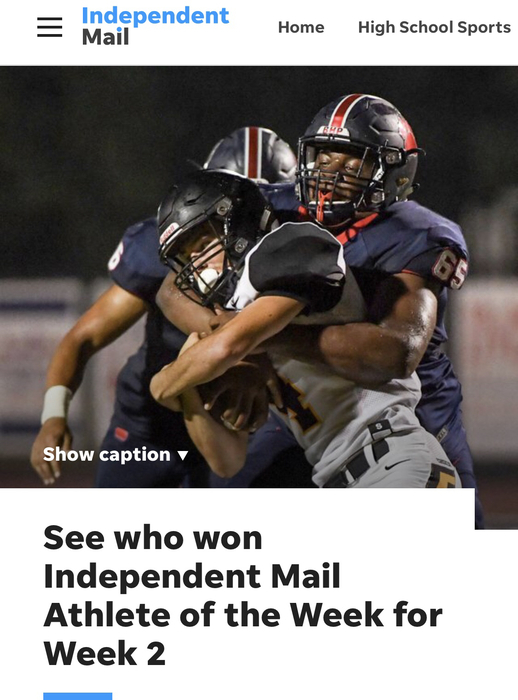 https://drive.google.com/open?id=1HeY7poyjR2PAY8f4bcph-5AtEge0KPj9 Get your all-sports pass today! Crescent Tiger Football!!! Six regular season home games this year, make plans now to attend them all! Varsity schedule is here. 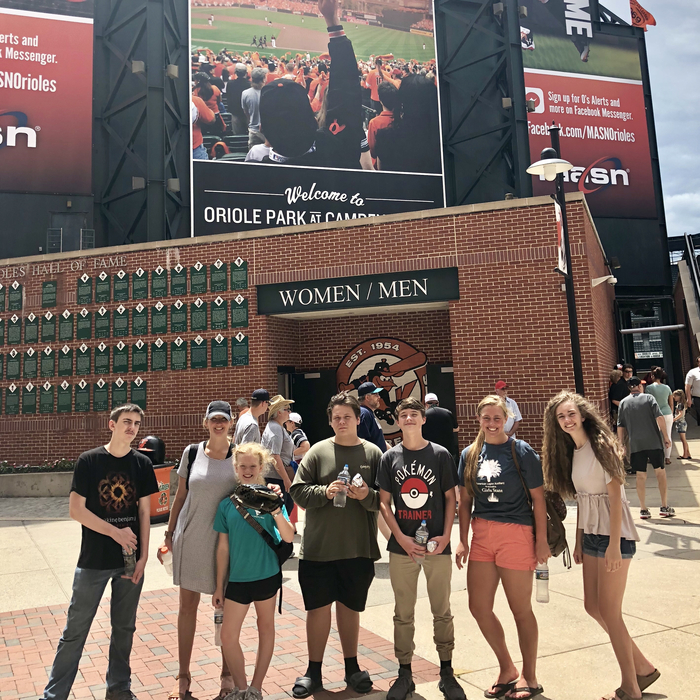 Crescent’s FBLA enjoys an Orioles game at the National Competition in Baltimore. 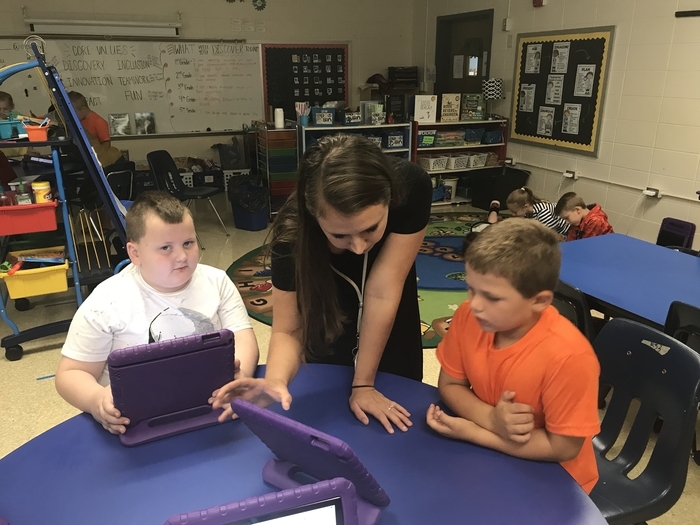 Busy times in Anderson Three this summer getting prepared for the 1:1 chromebook roll out at CHS! Its going to be awesome next school year. 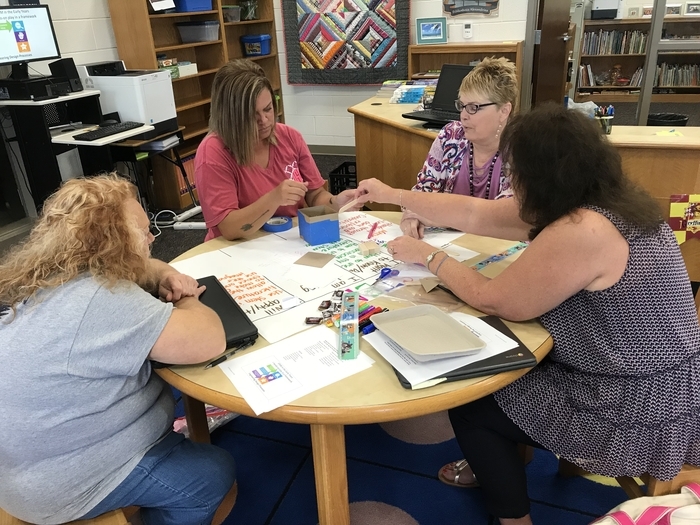 Great things are happening in A3!